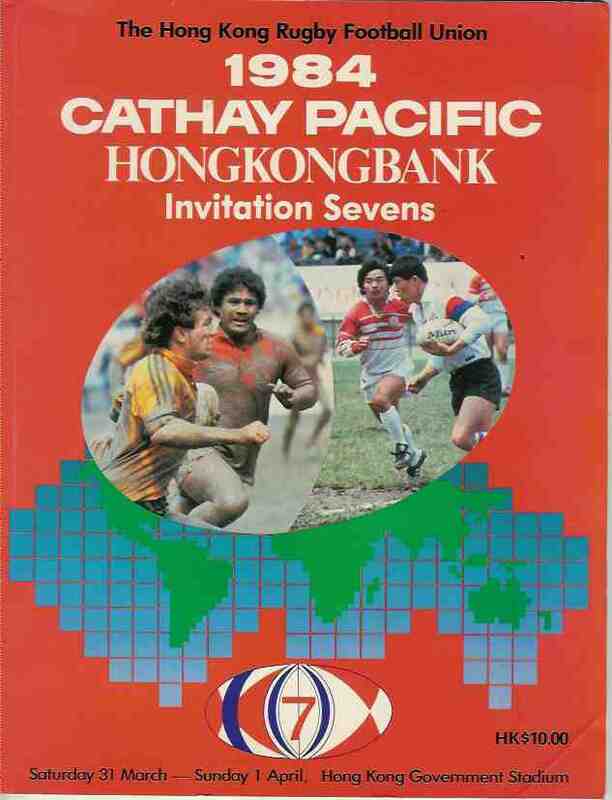 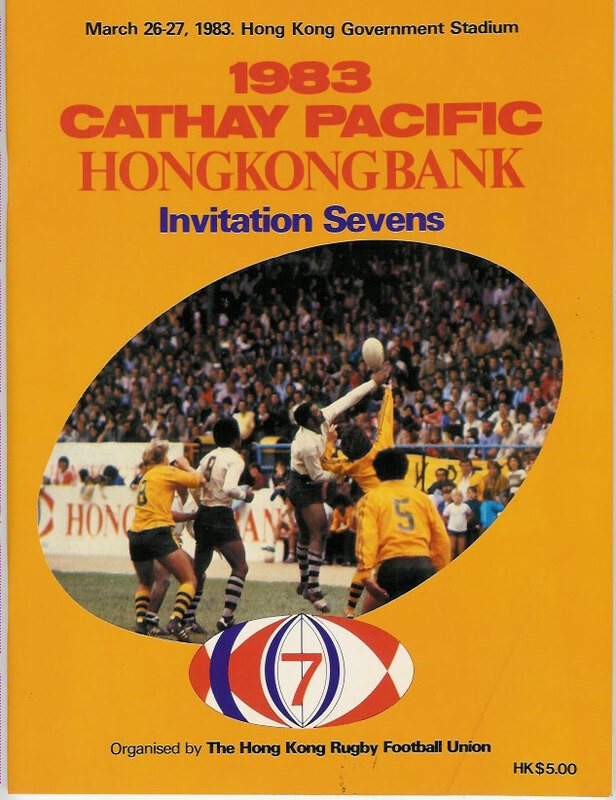 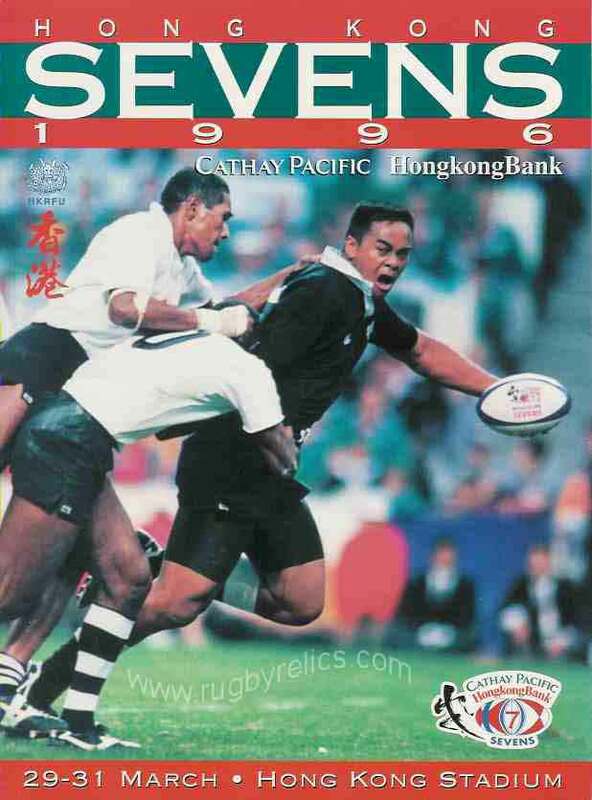 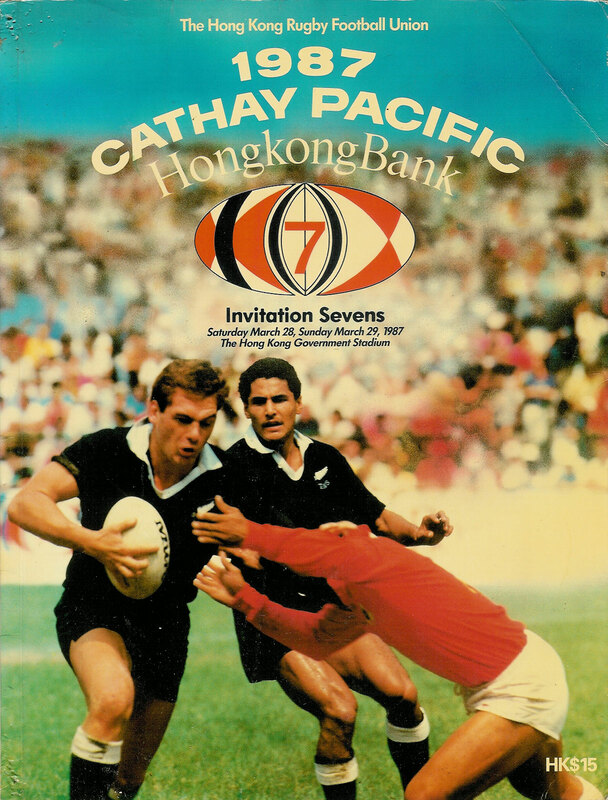 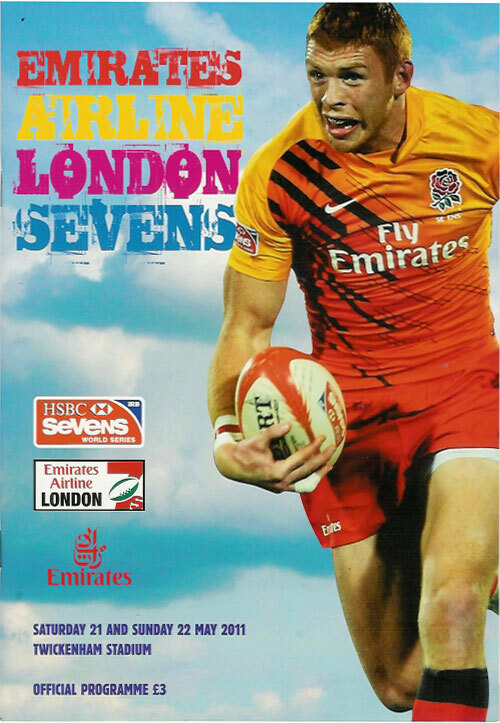 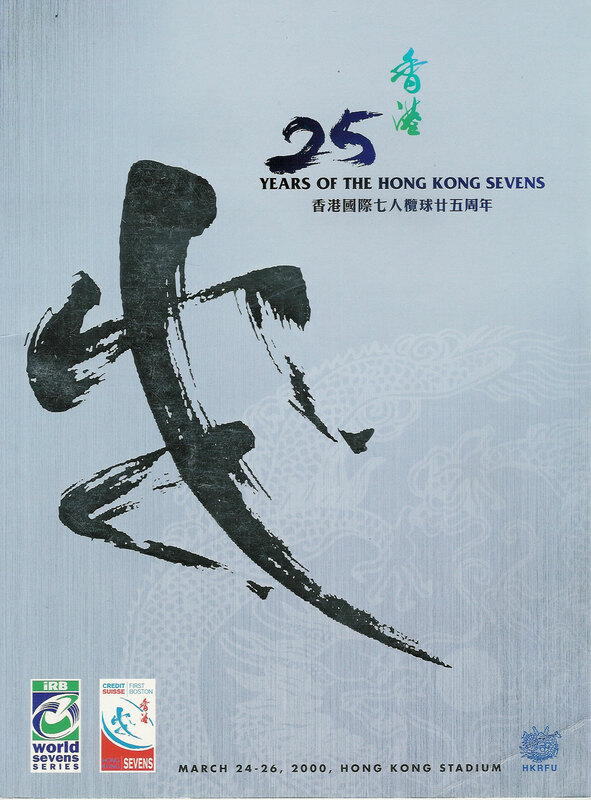 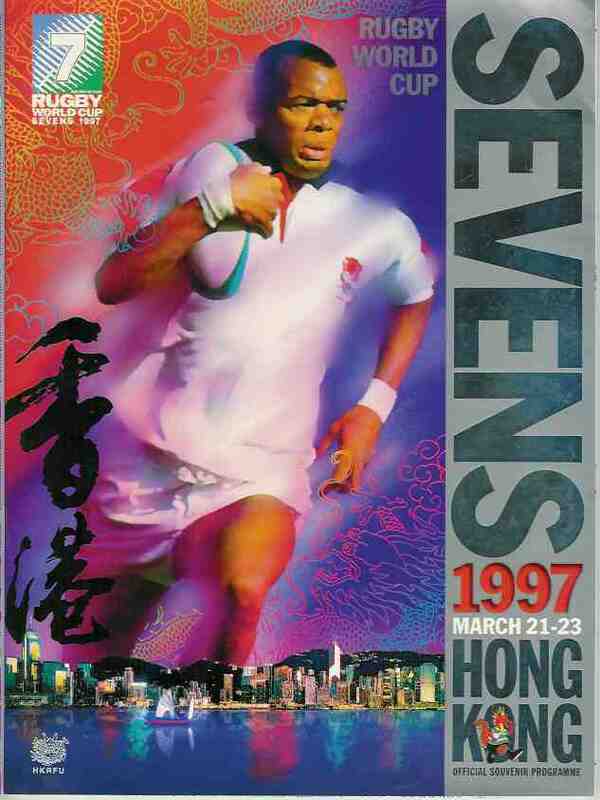 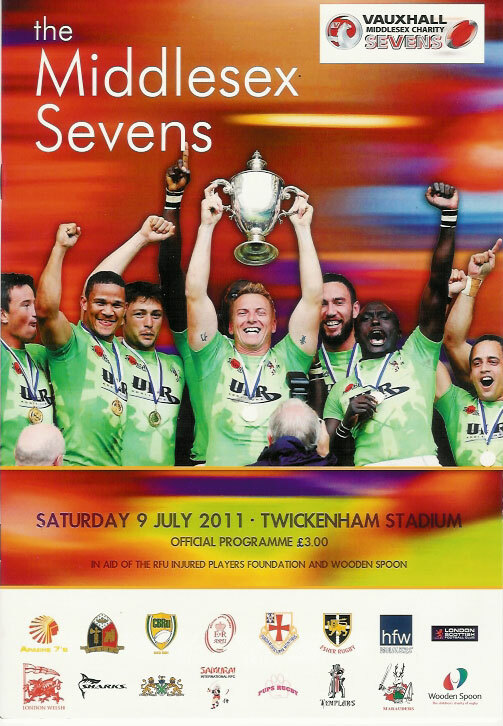 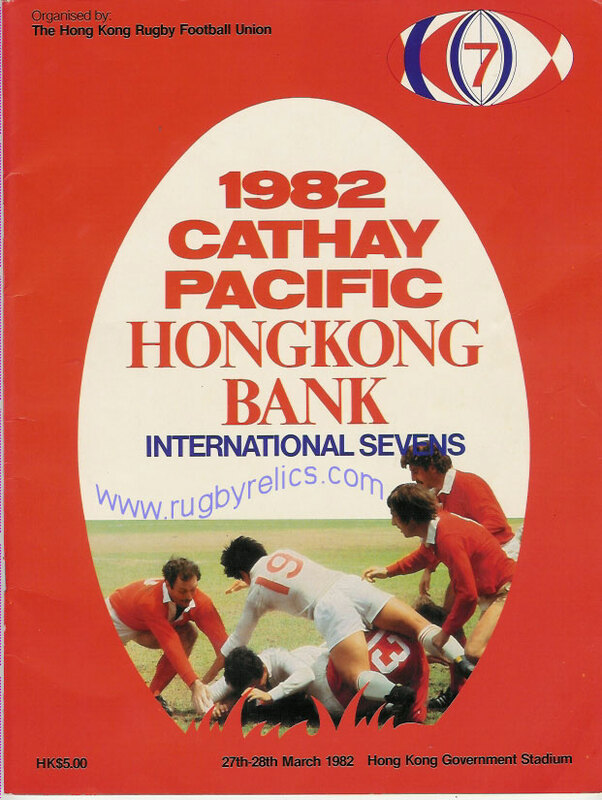 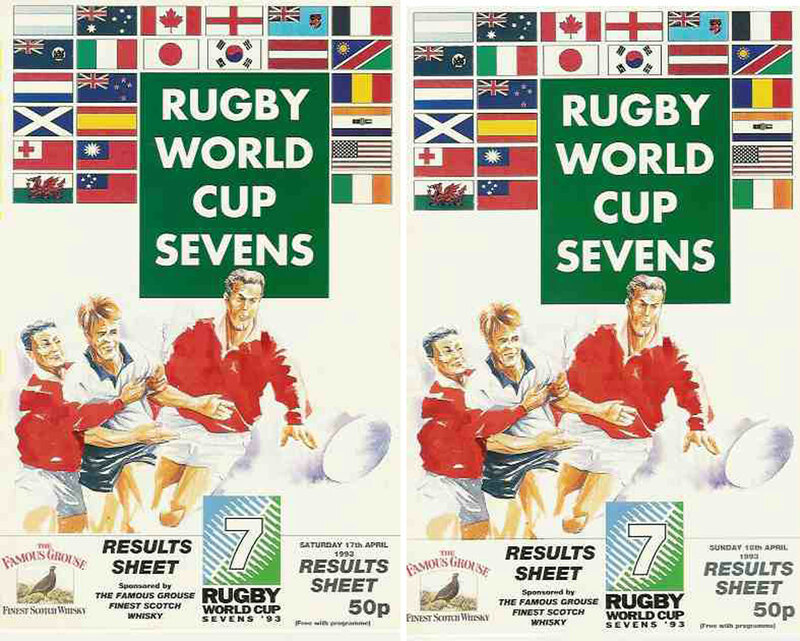 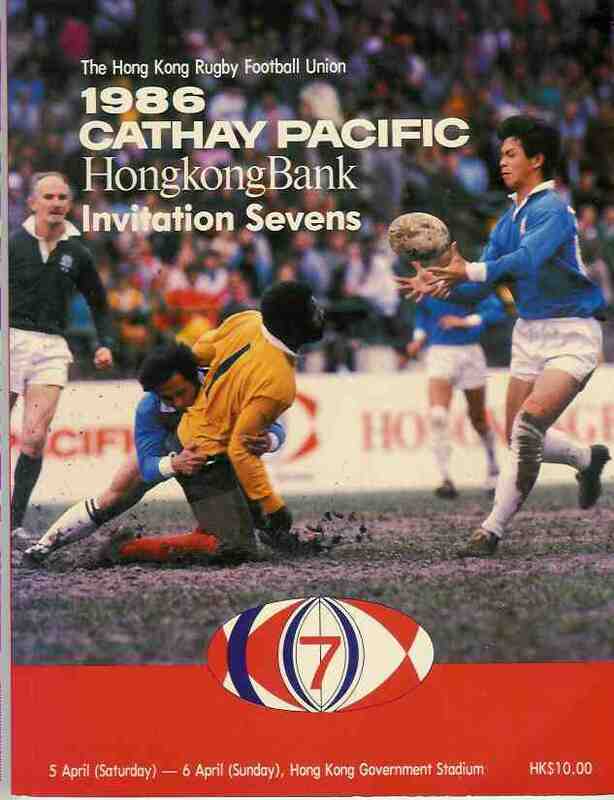 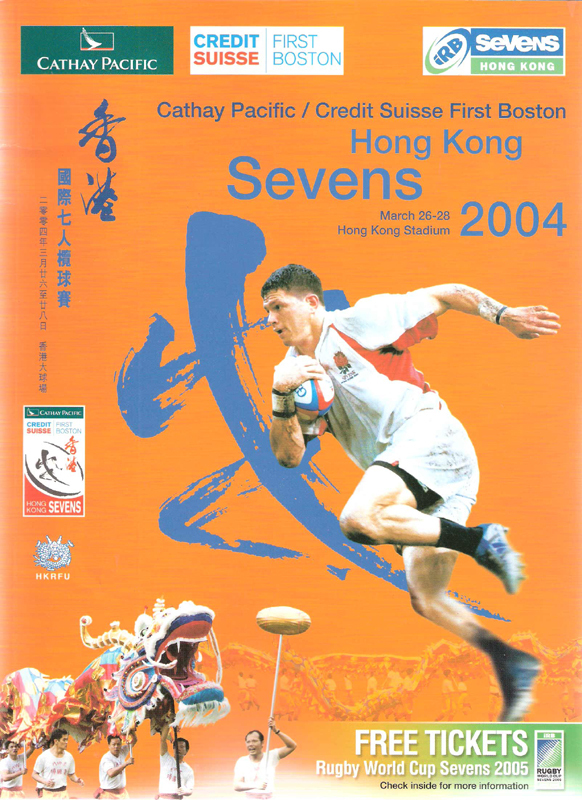 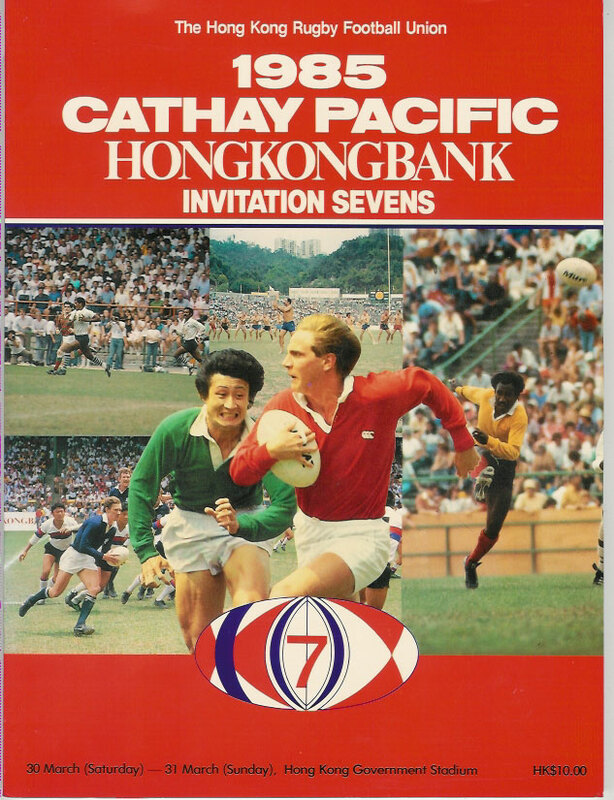 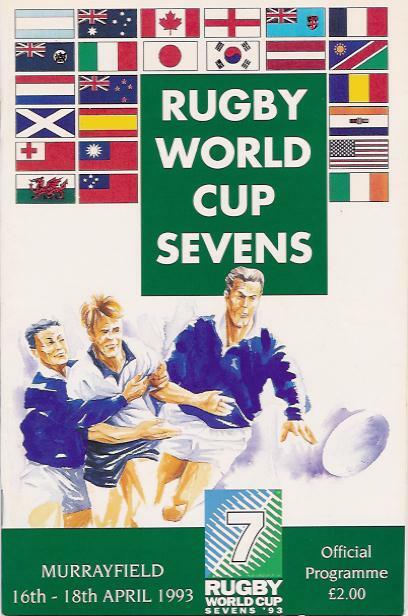 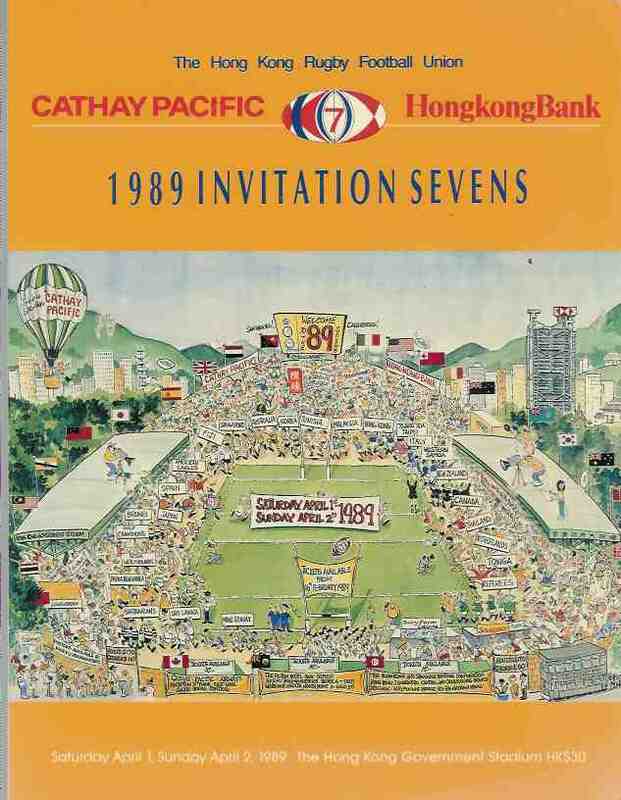 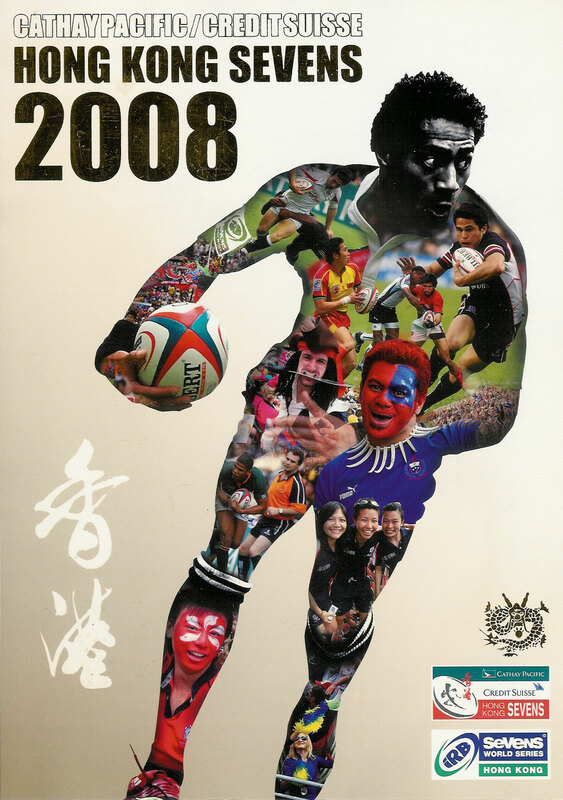 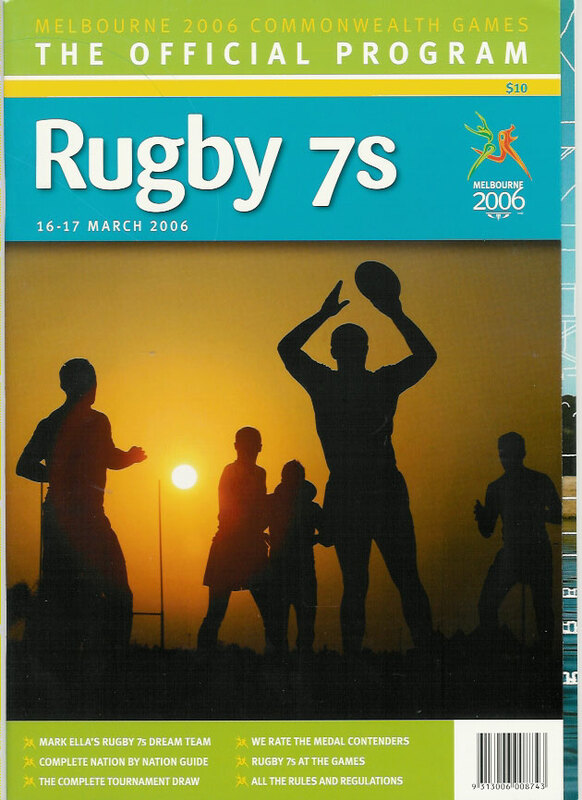 Sevens programmes from around the world including the Rugby World Cup & Hong Kong Sevens. 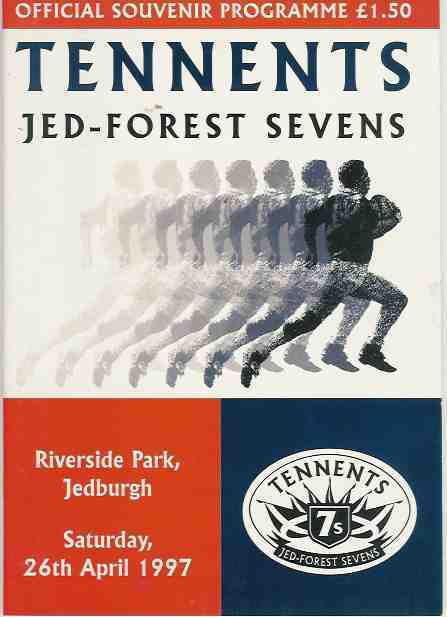 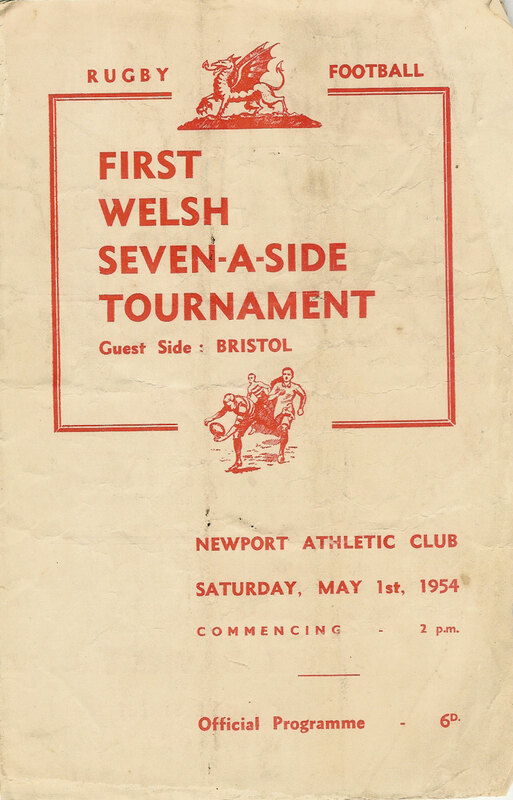 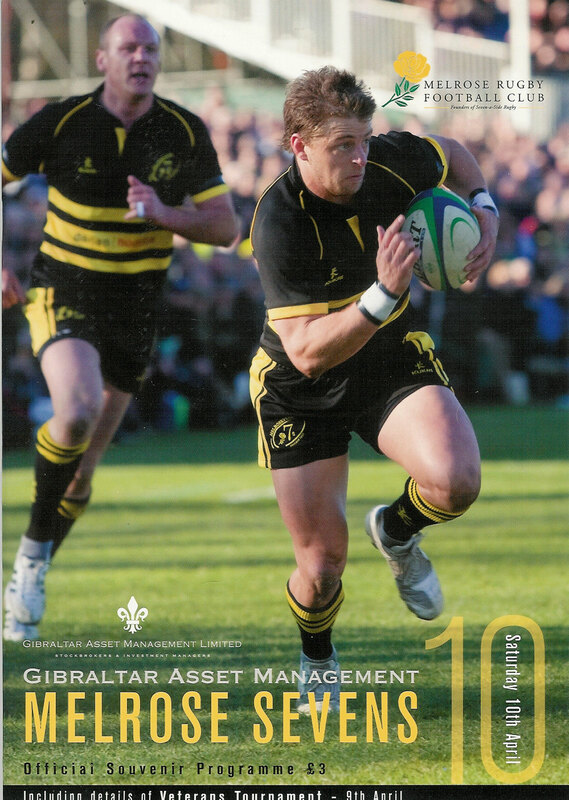 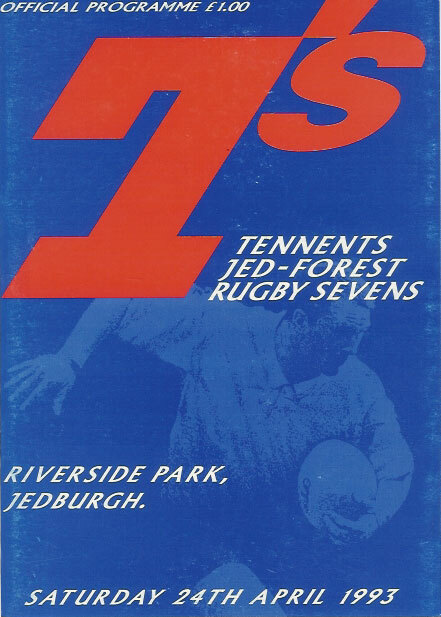 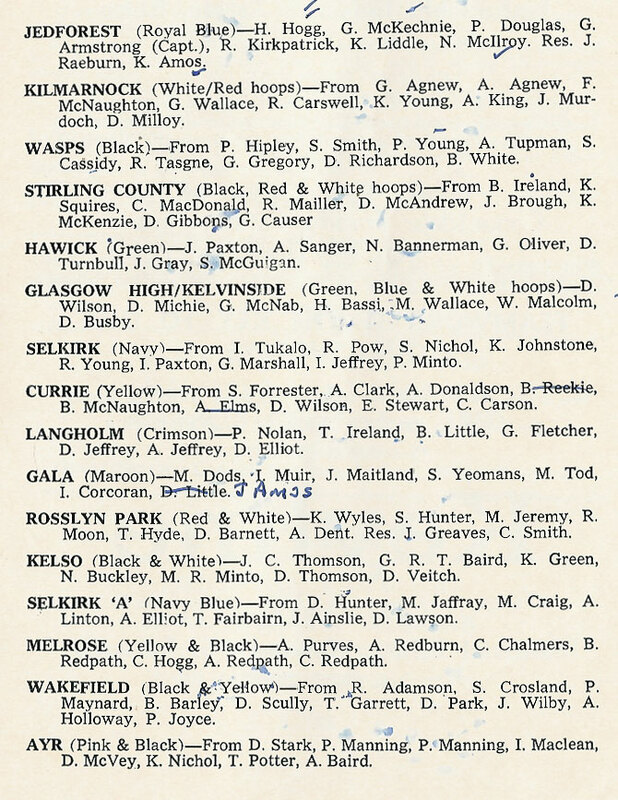 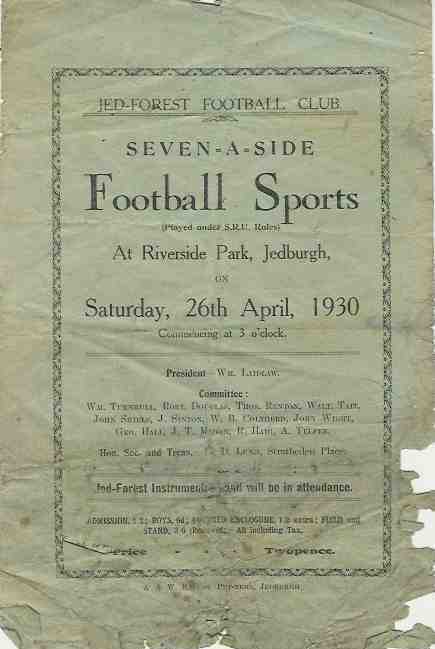 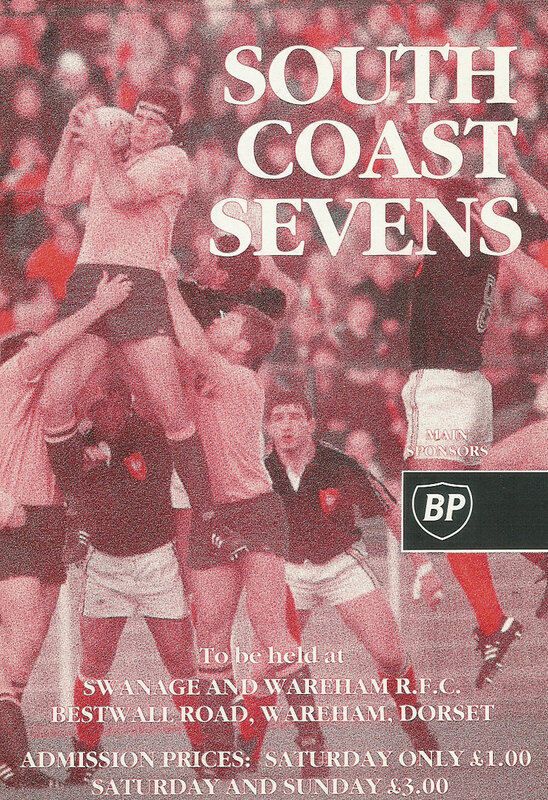 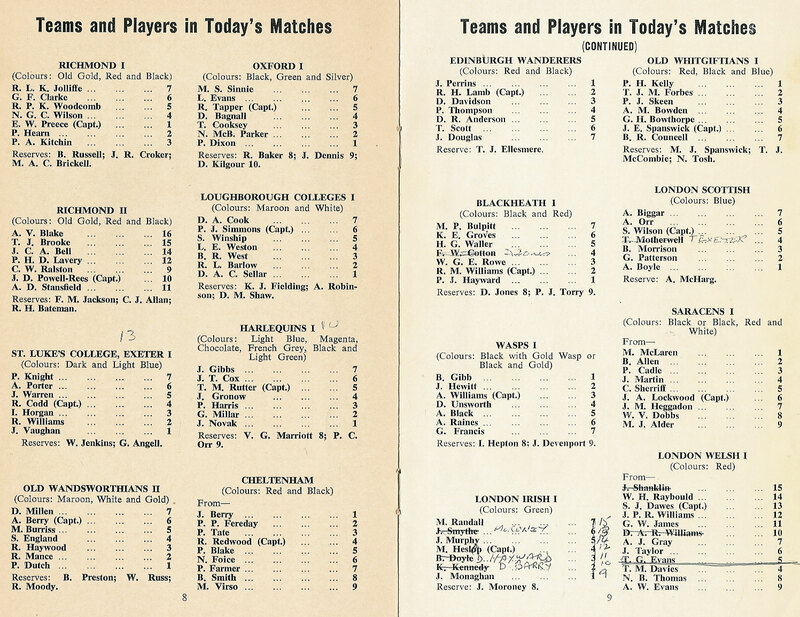 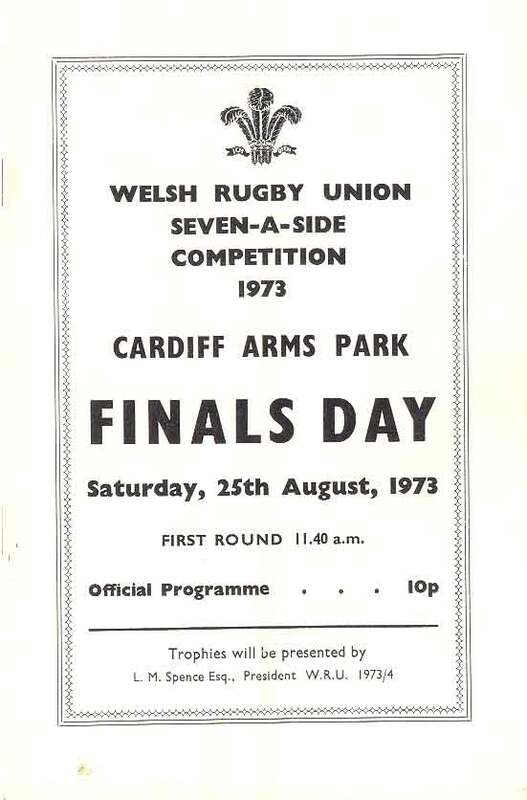 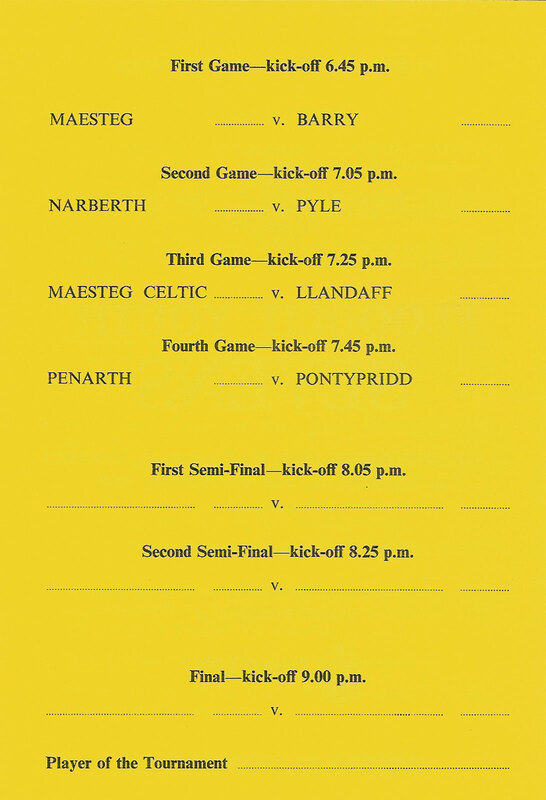 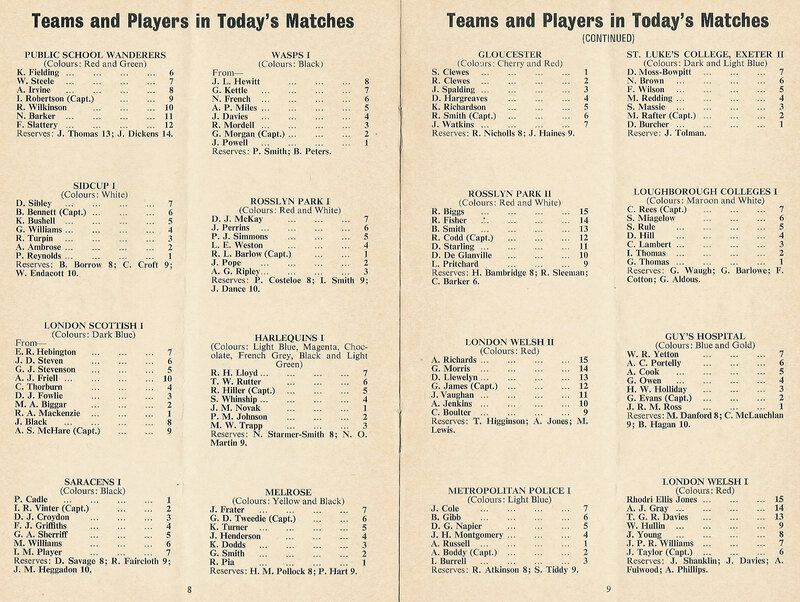 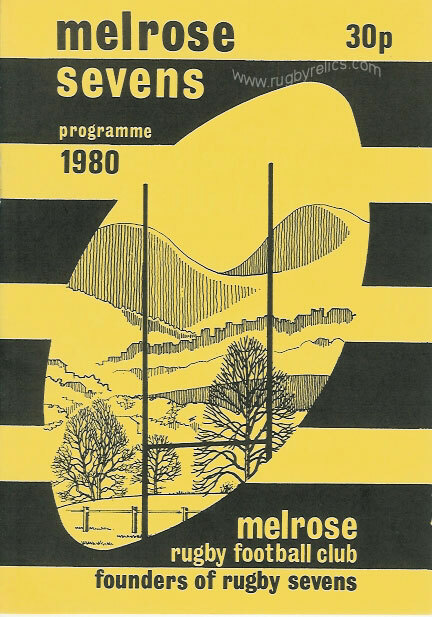 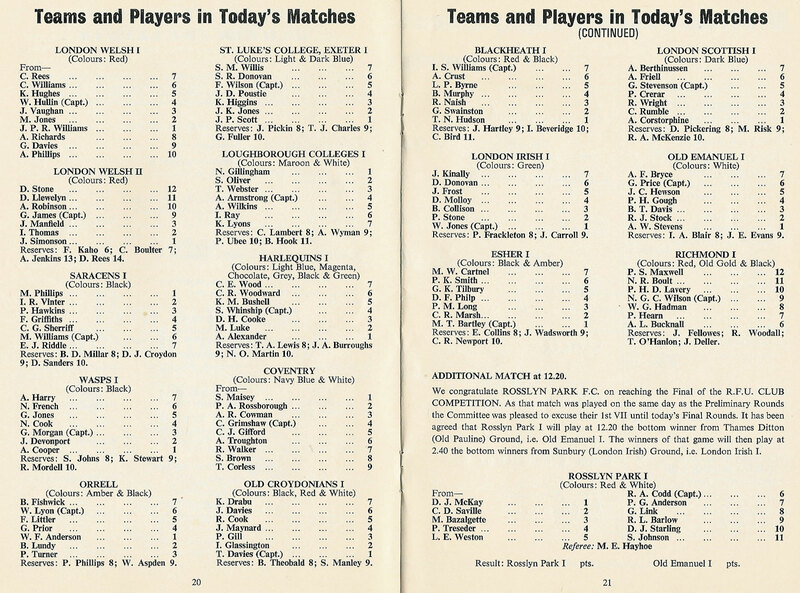 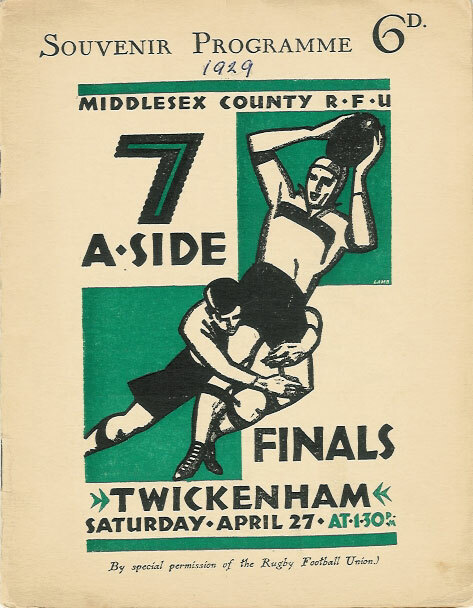 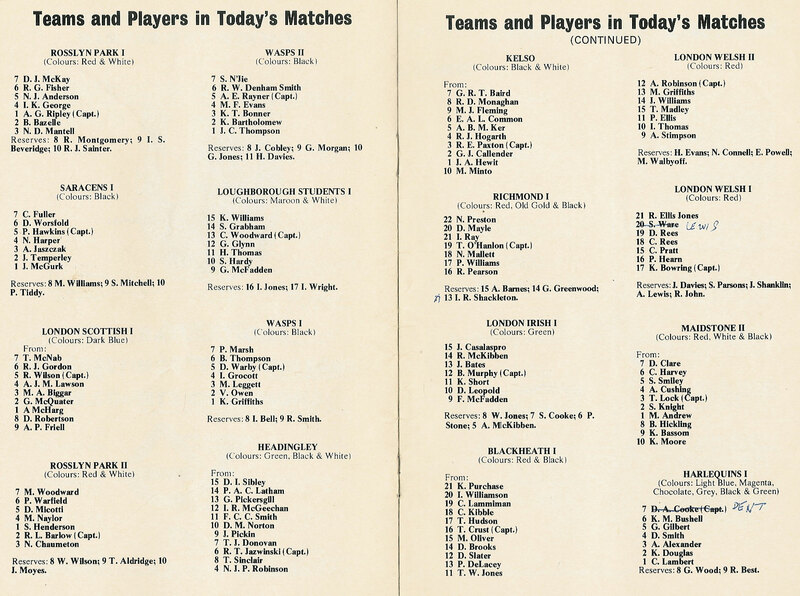 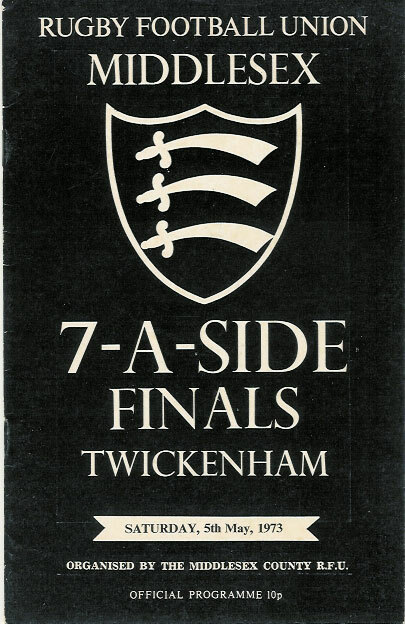 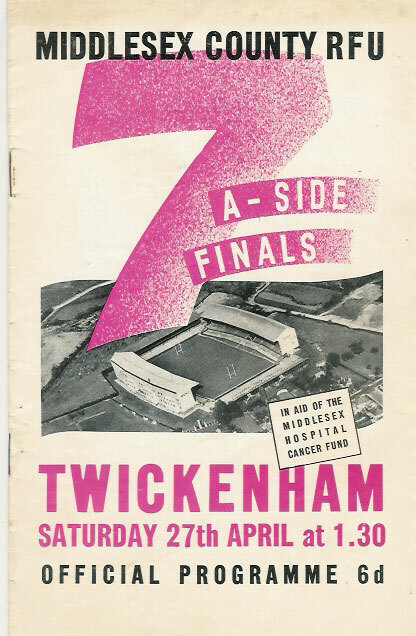 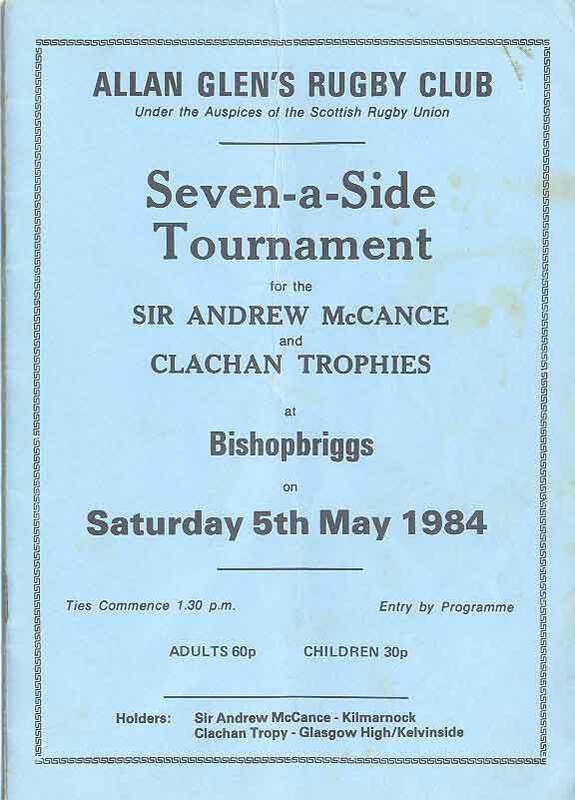 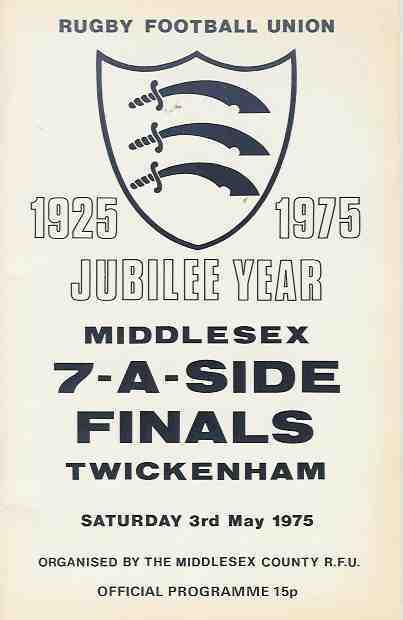 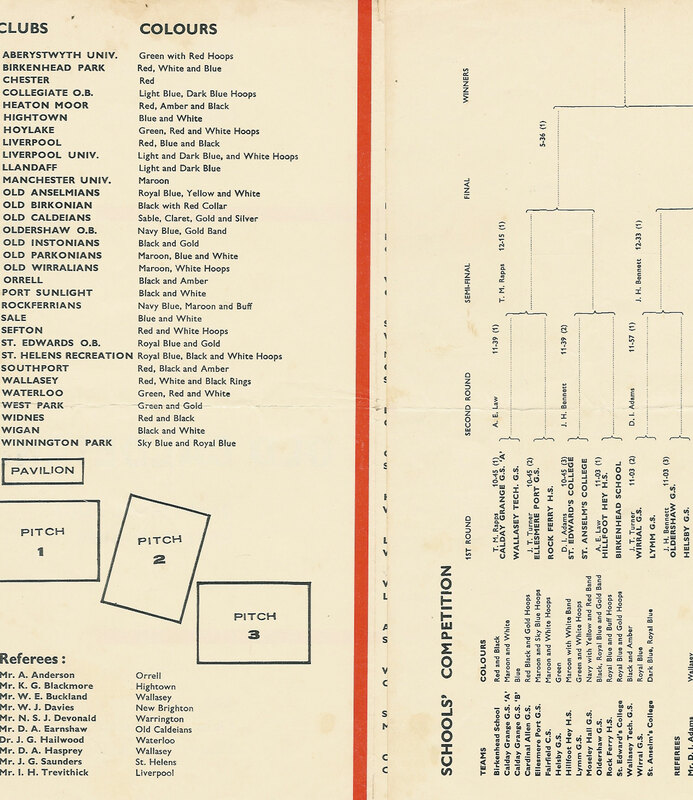 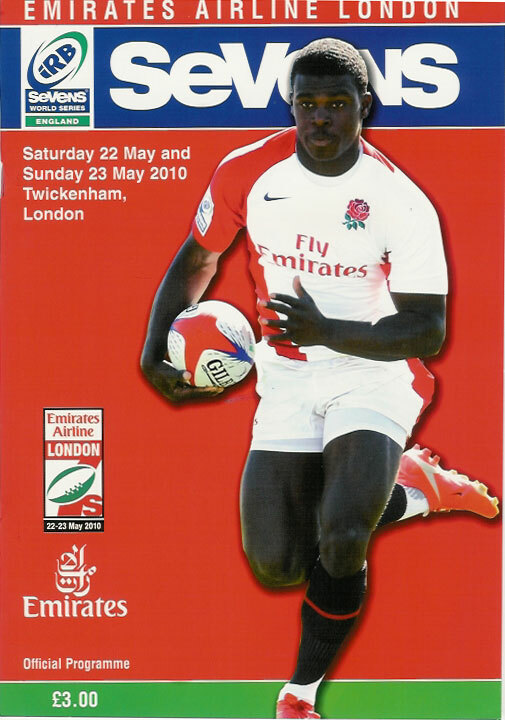 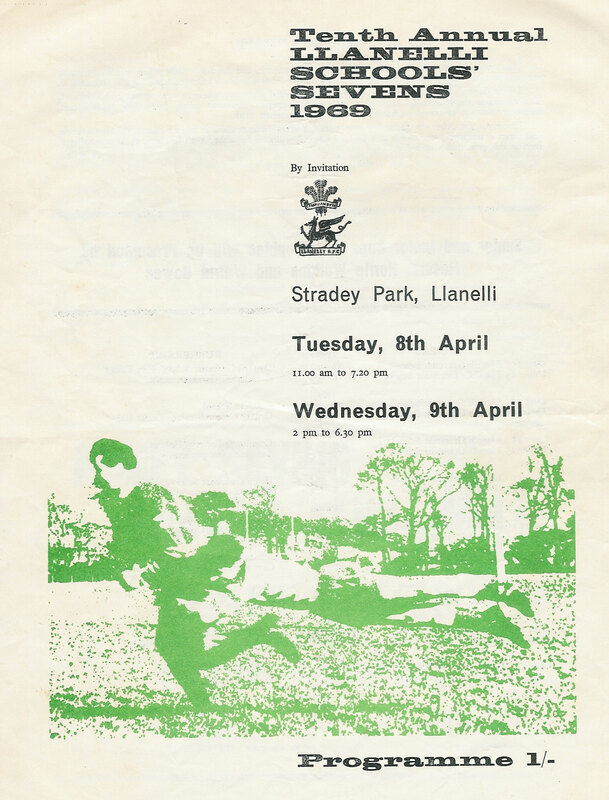 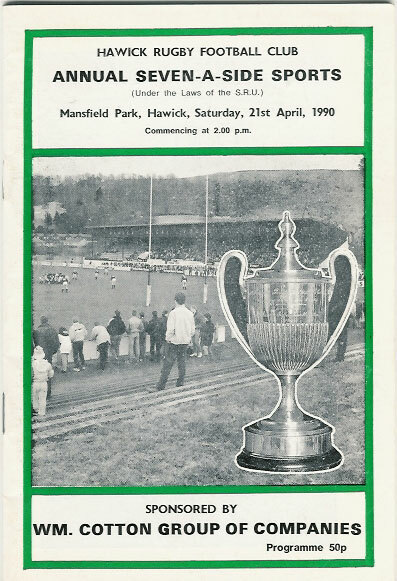 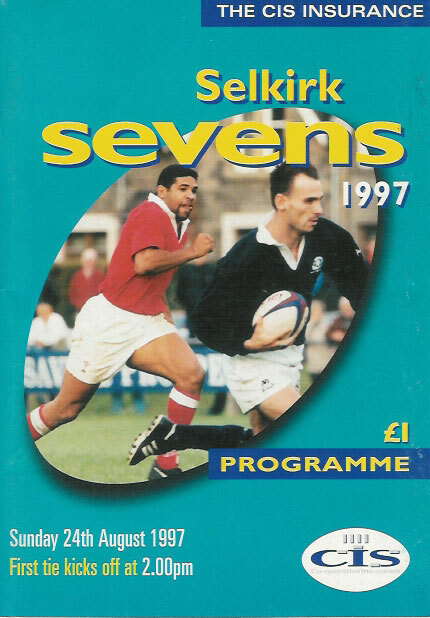 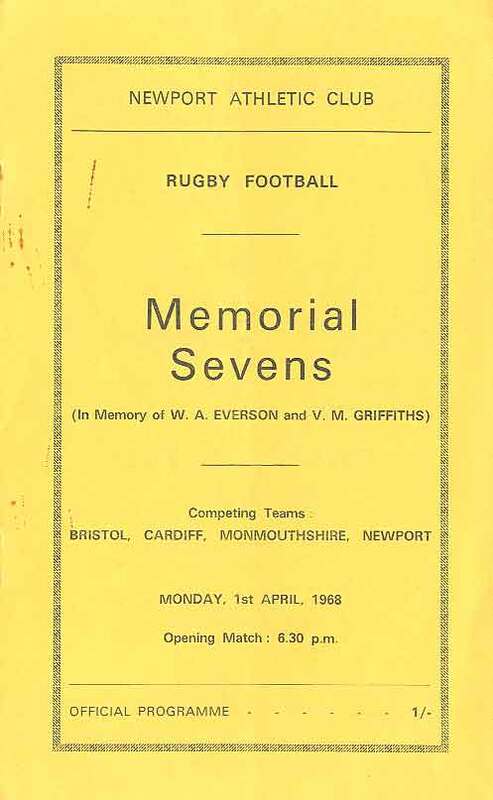 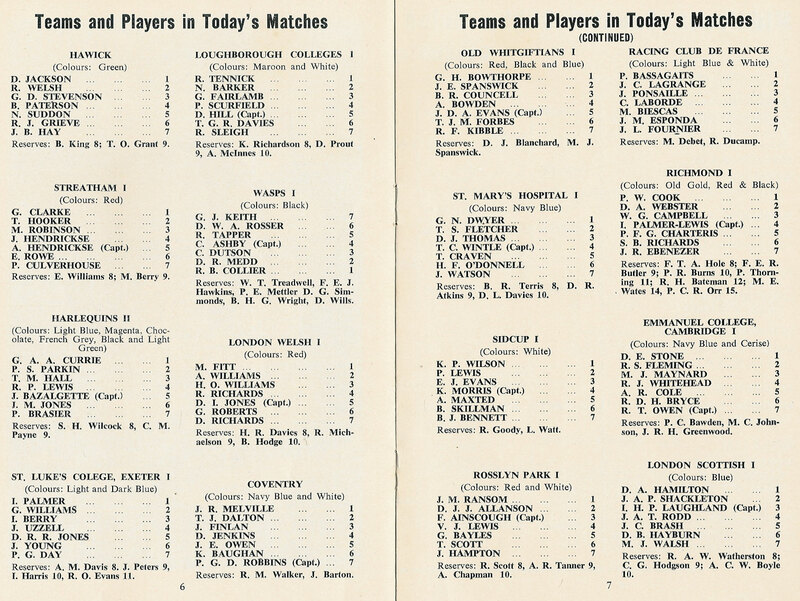 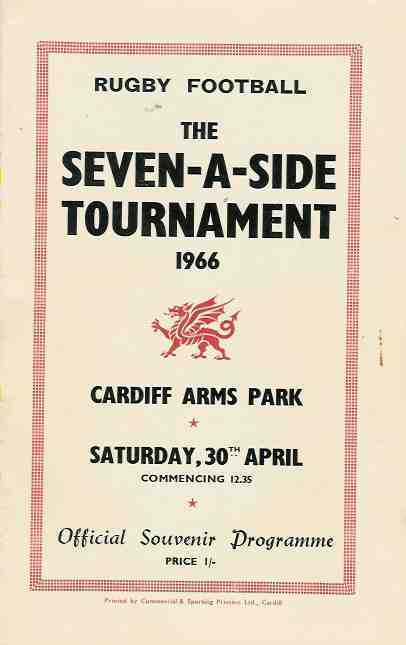 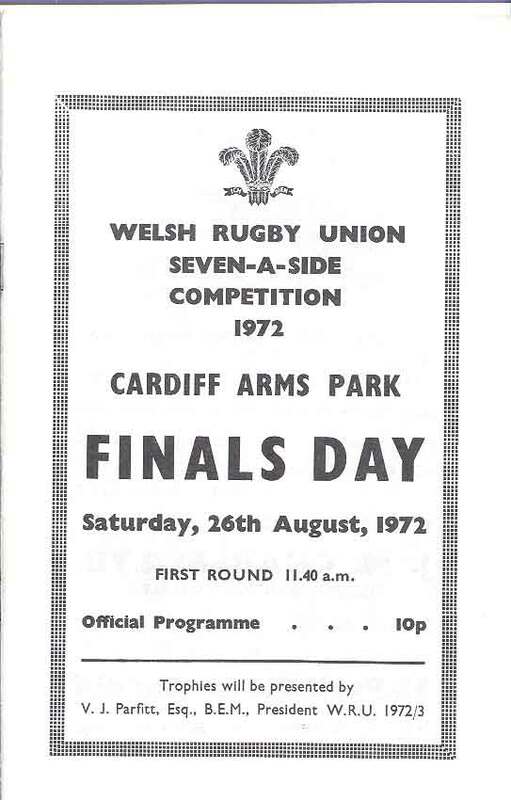 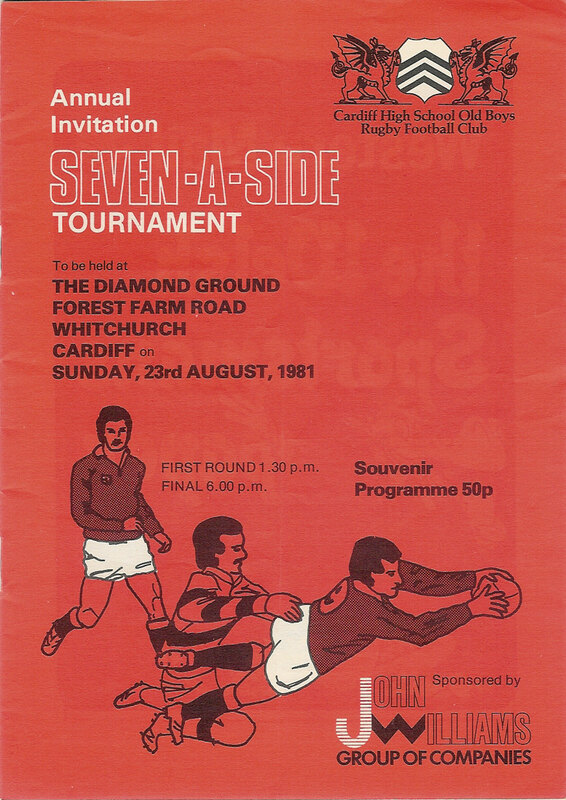 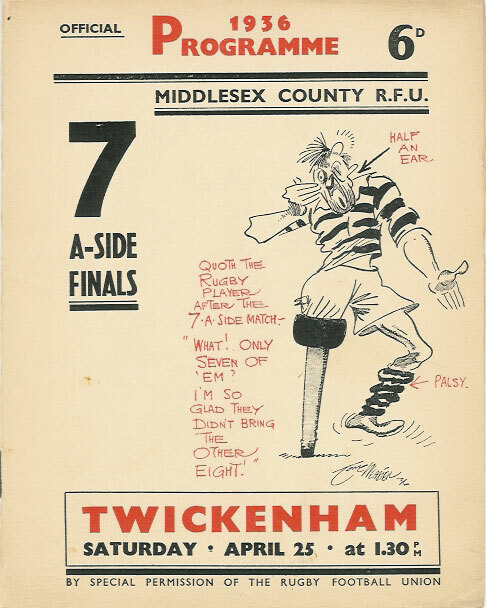 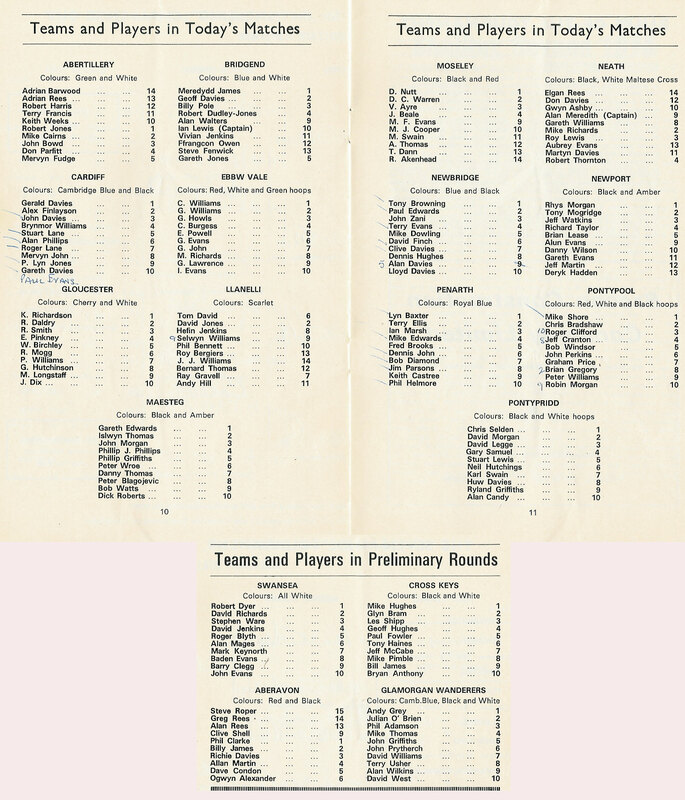 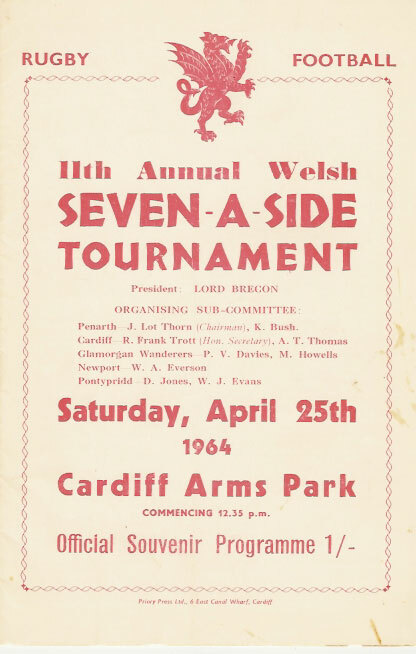 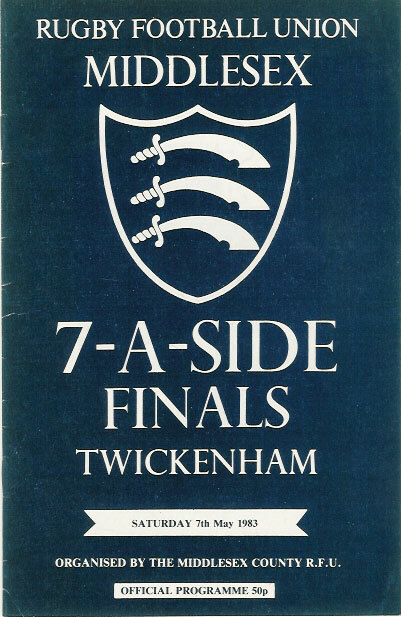 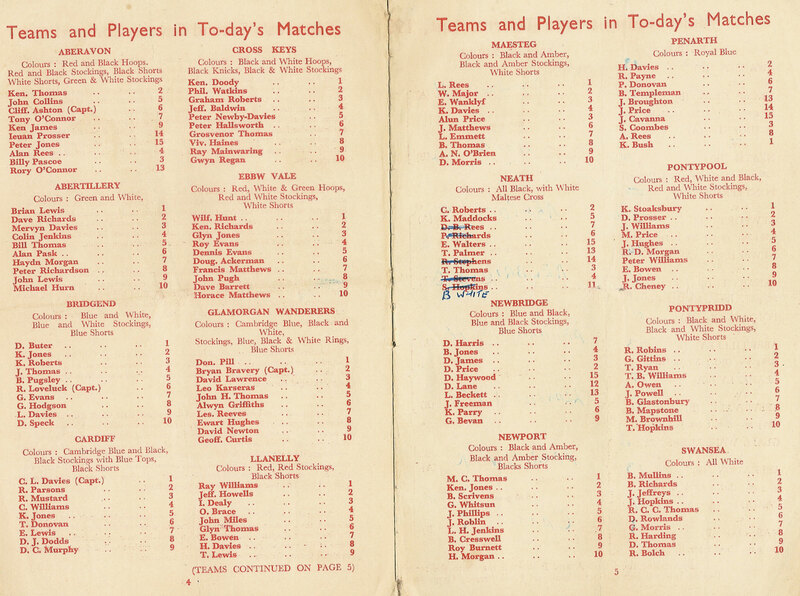 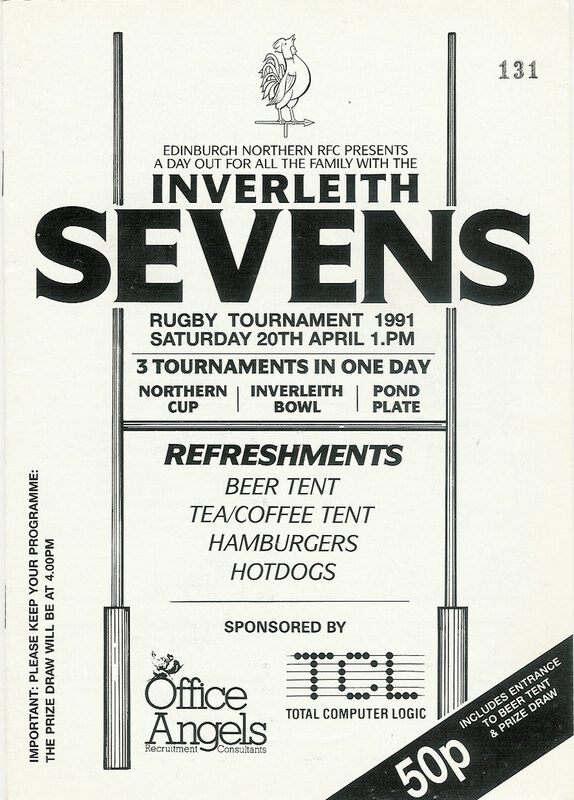 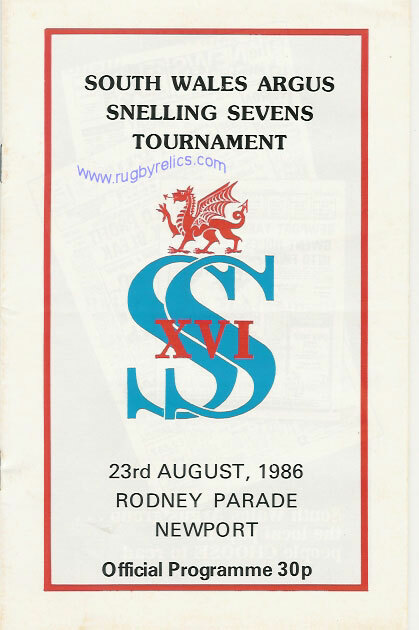 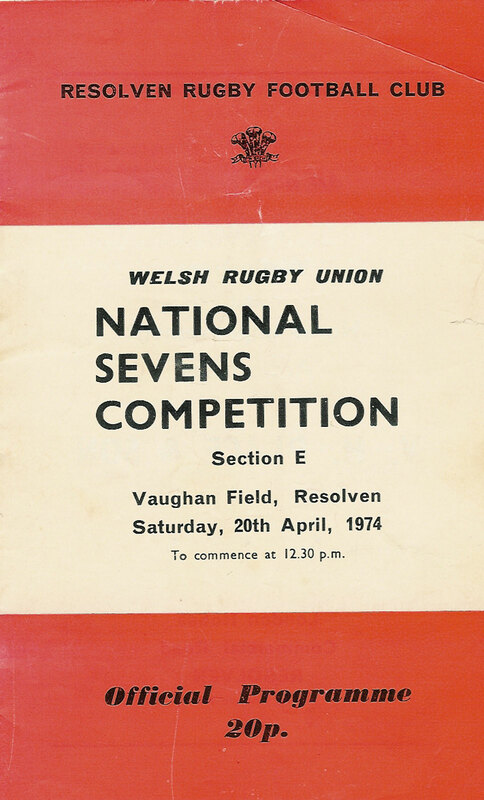 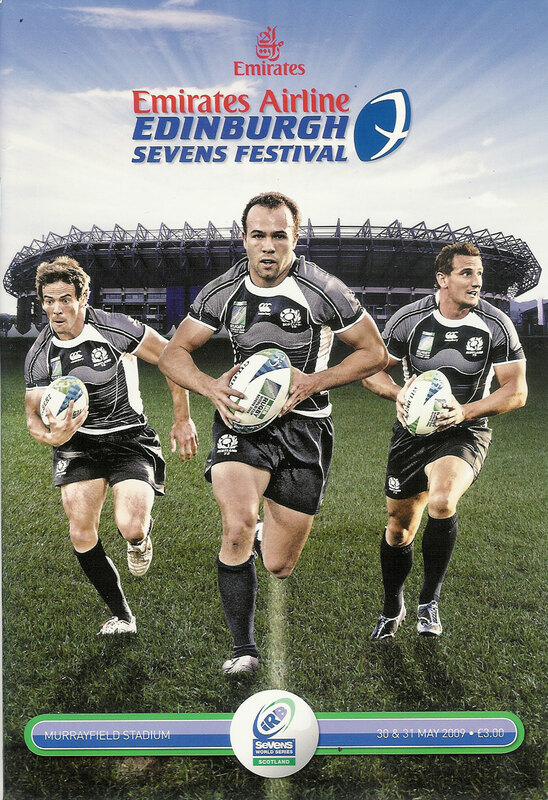 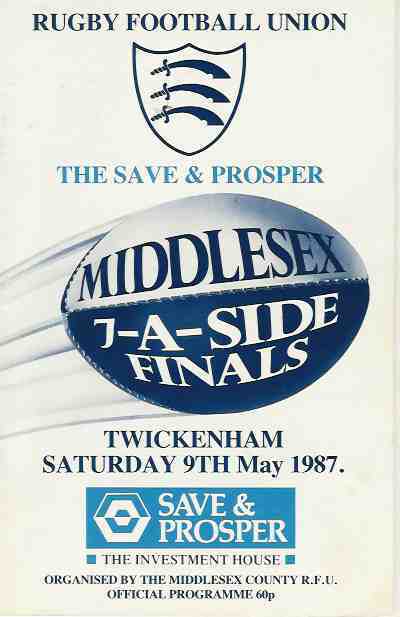 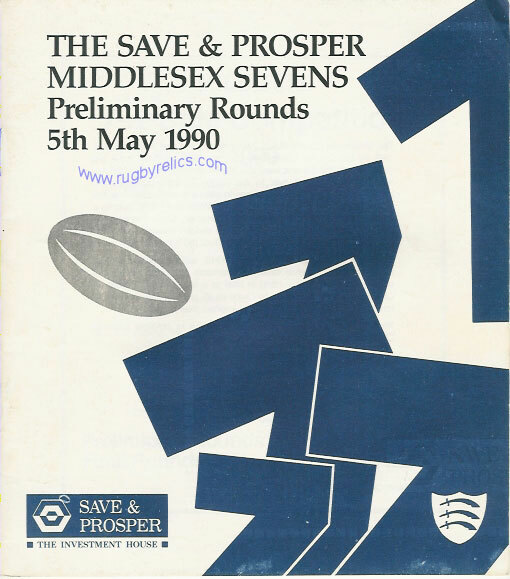 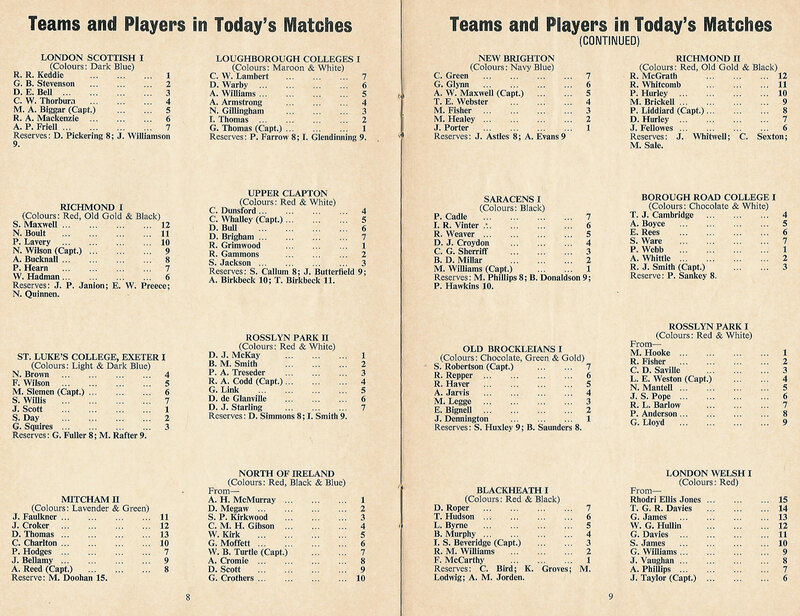 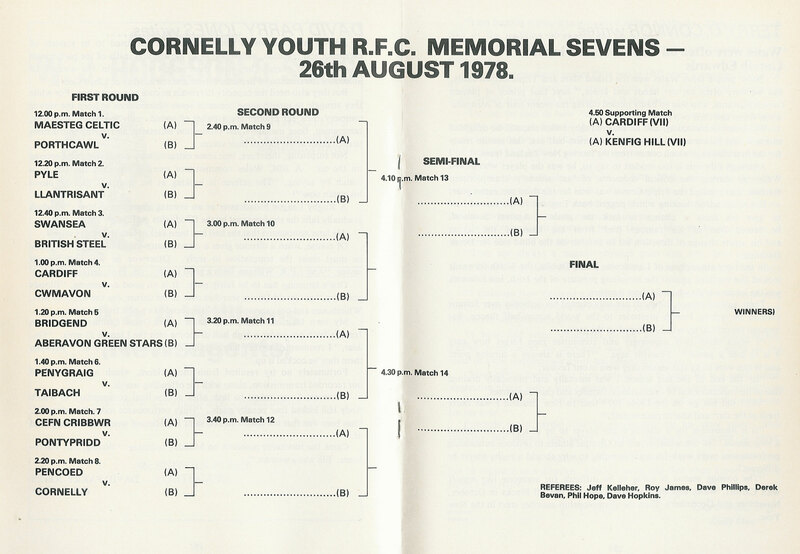 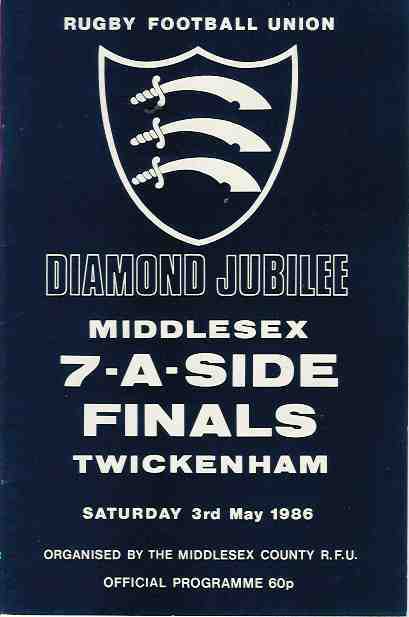 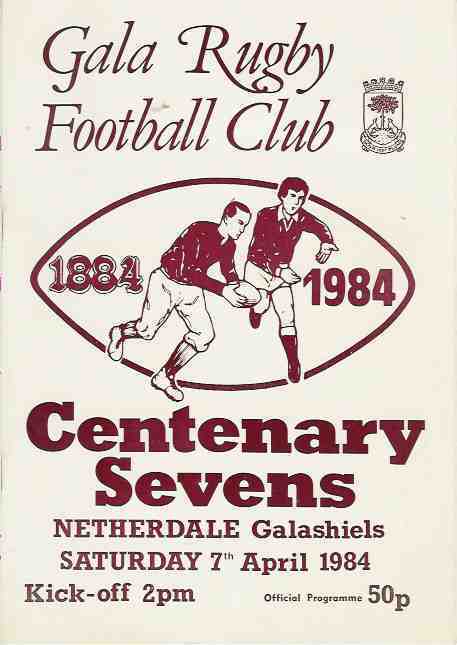 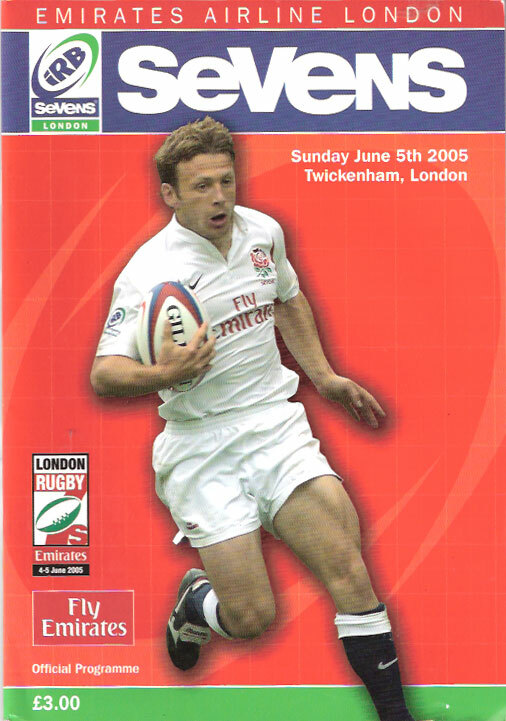 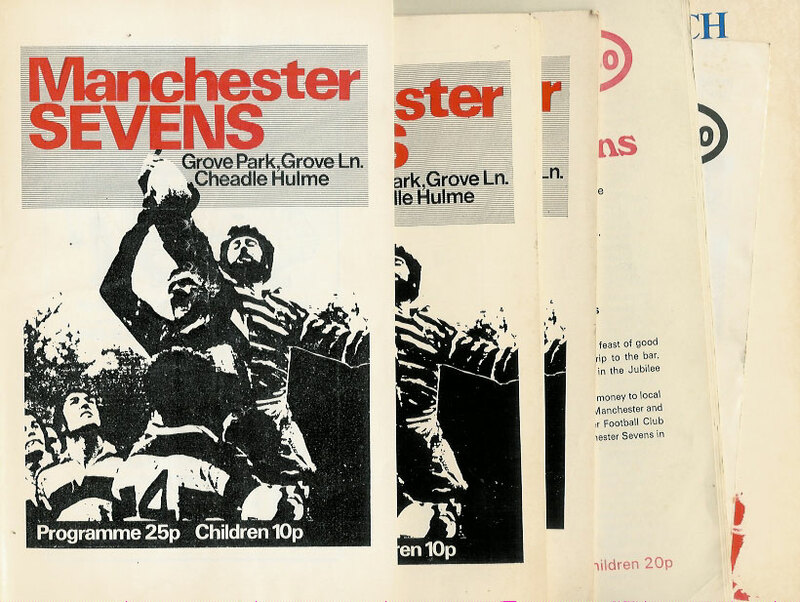 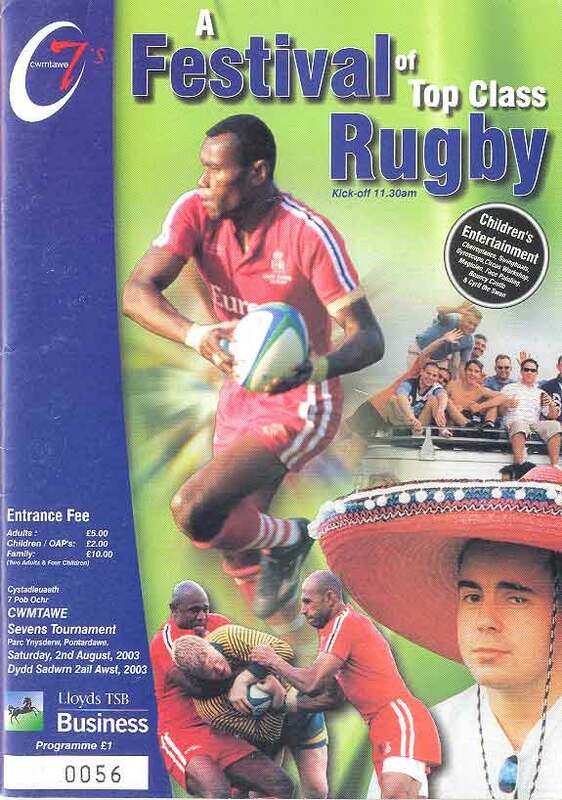 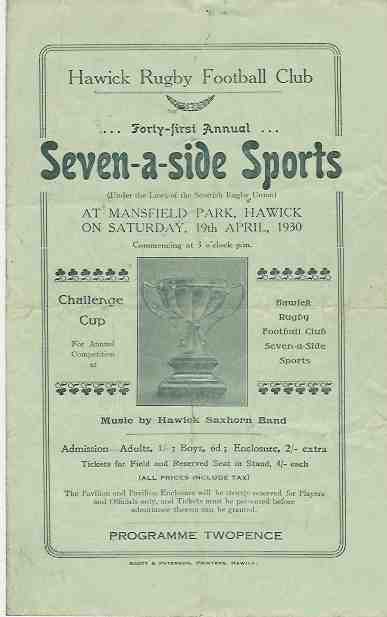 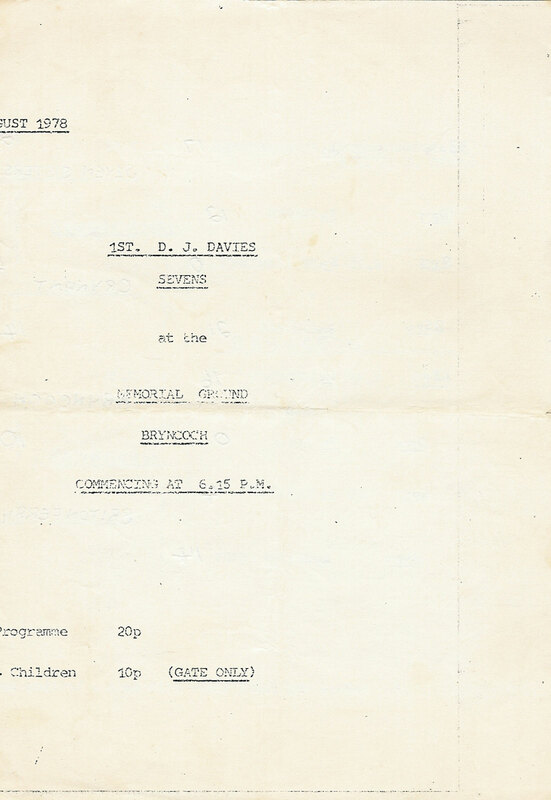 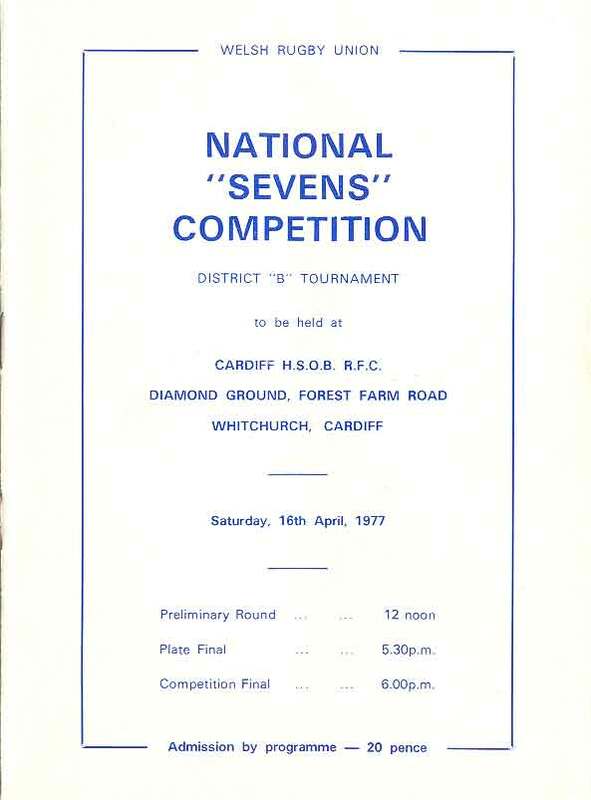 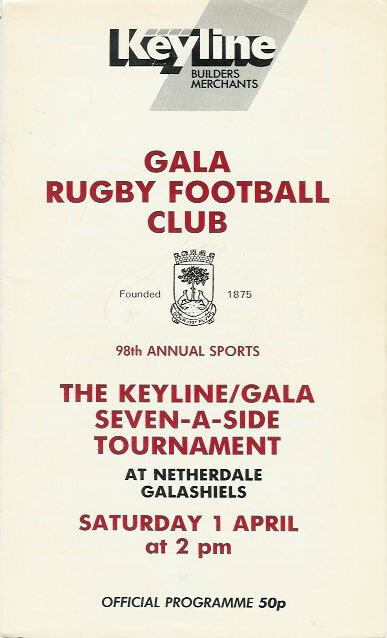 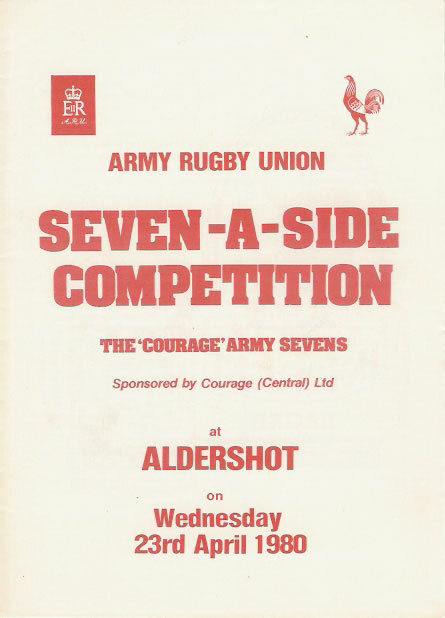 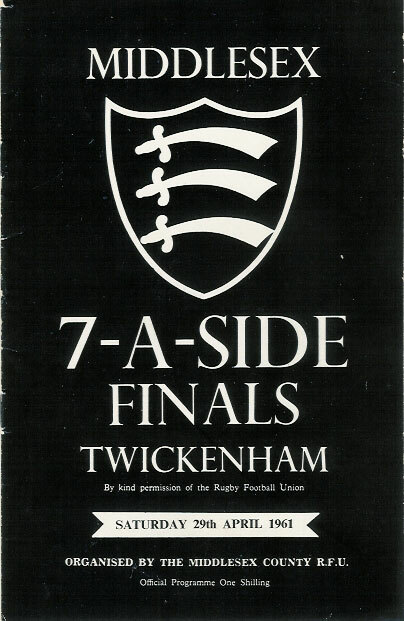 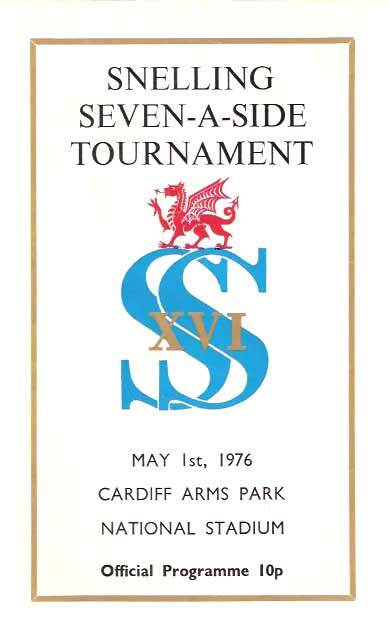 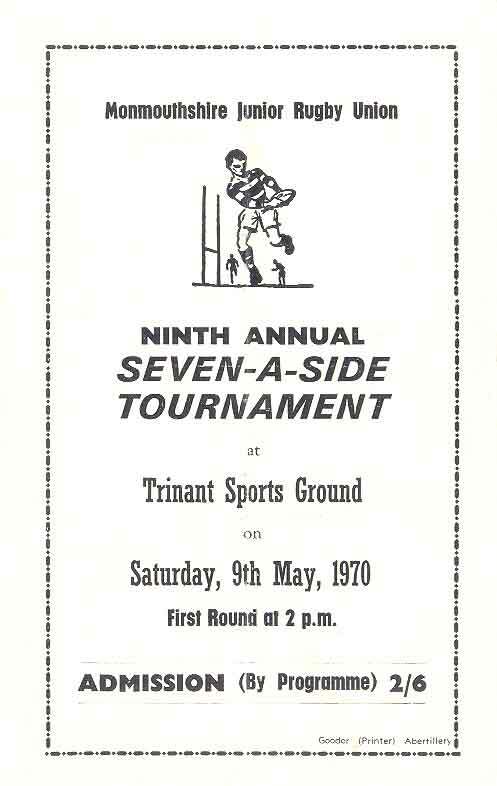 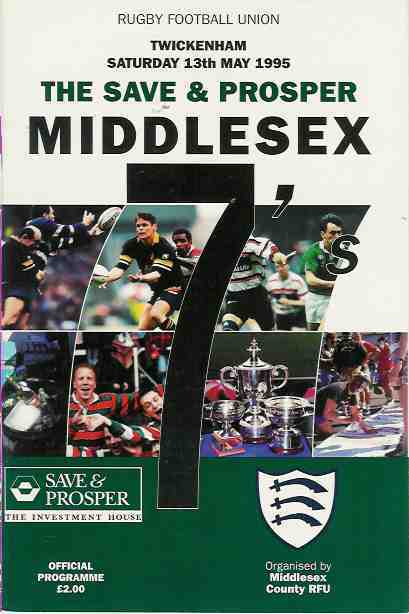 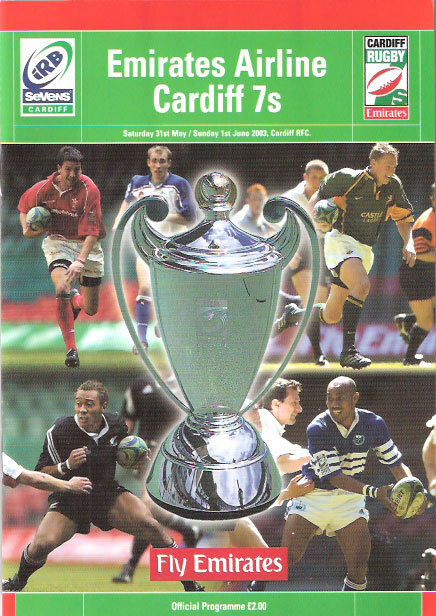 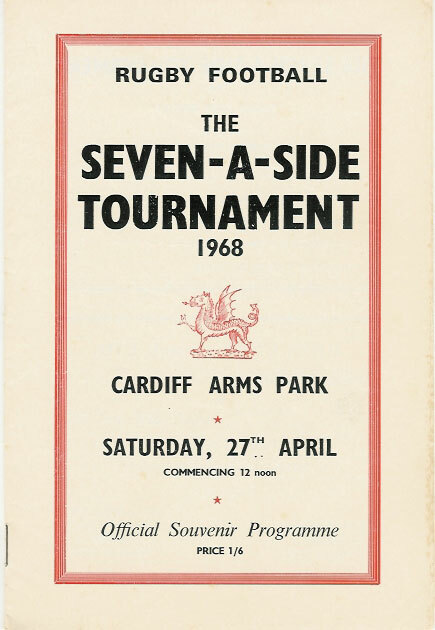 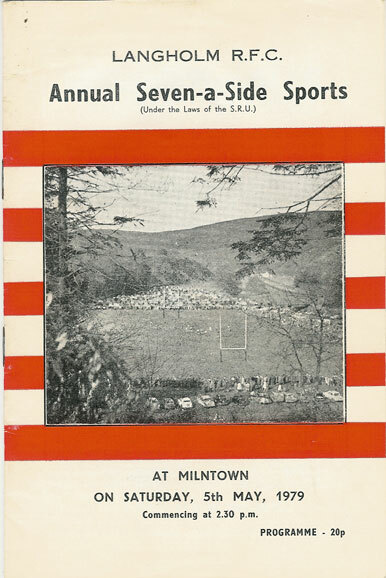 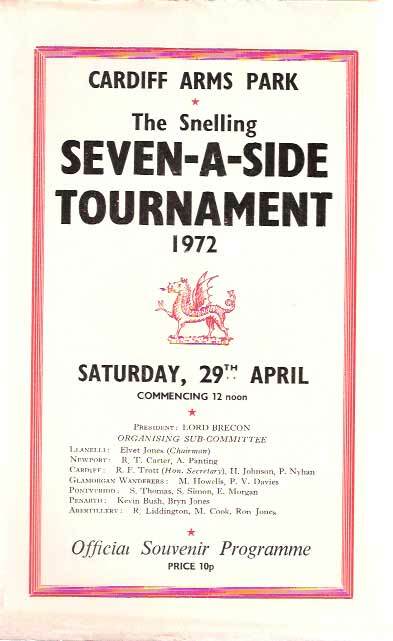 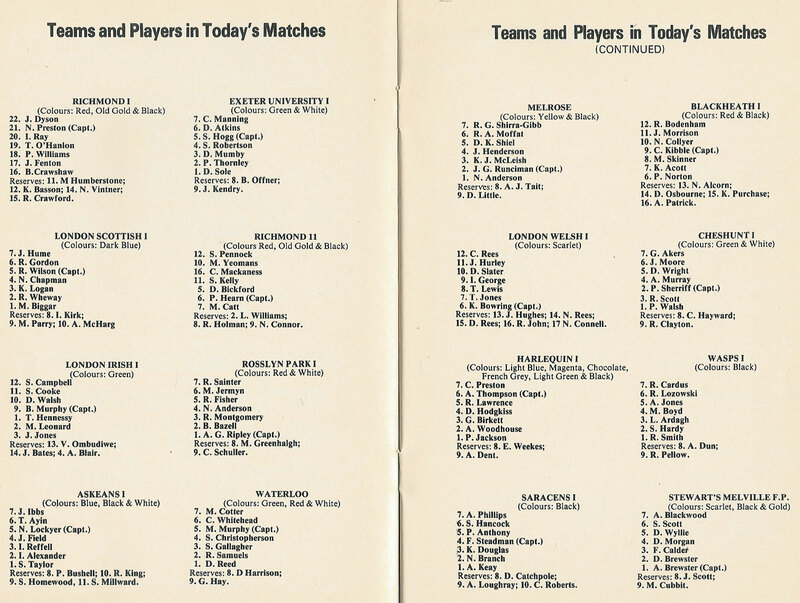 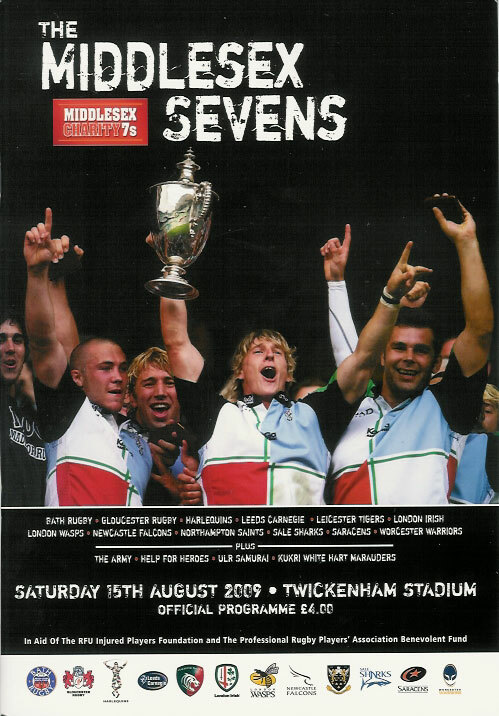 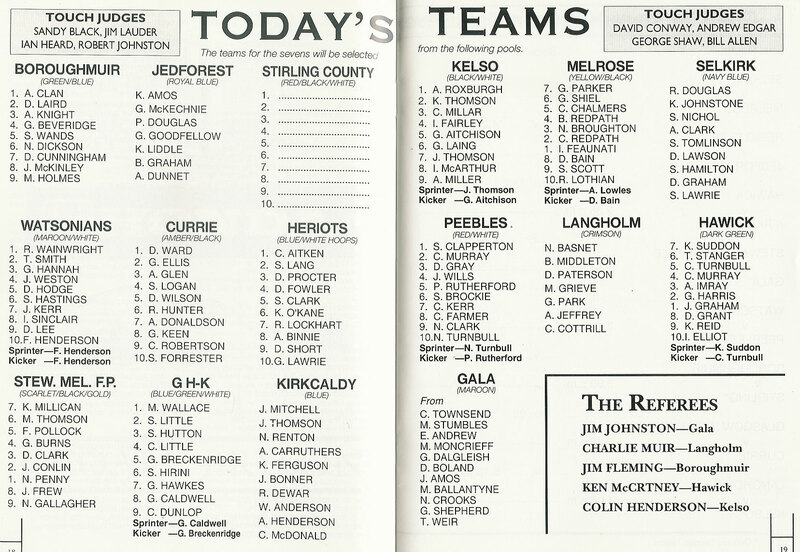 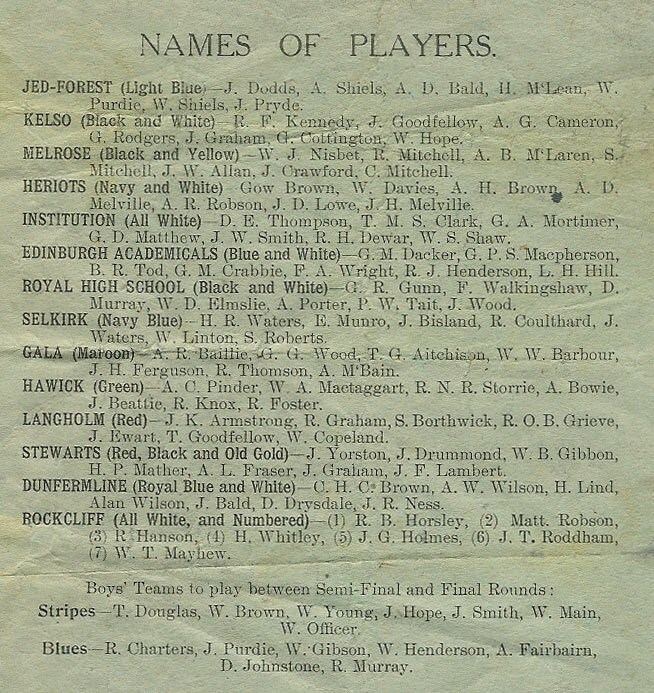 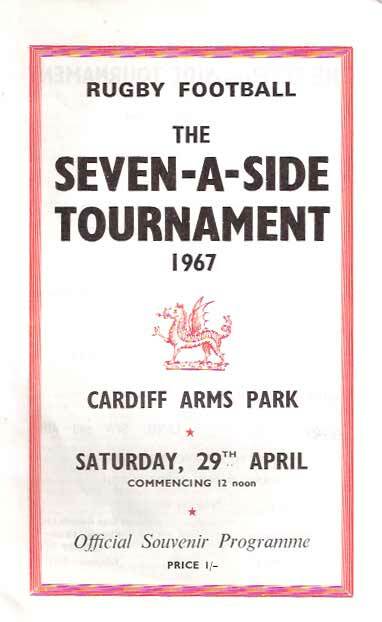 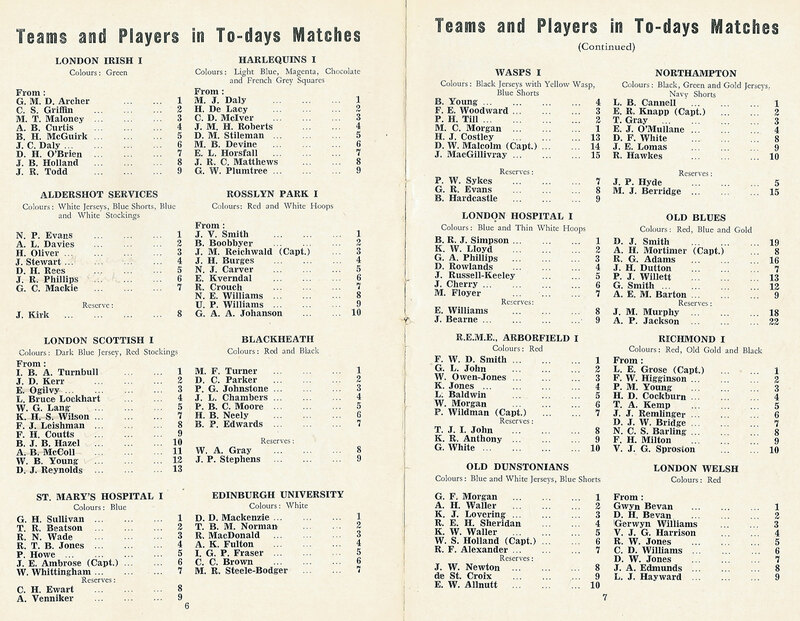 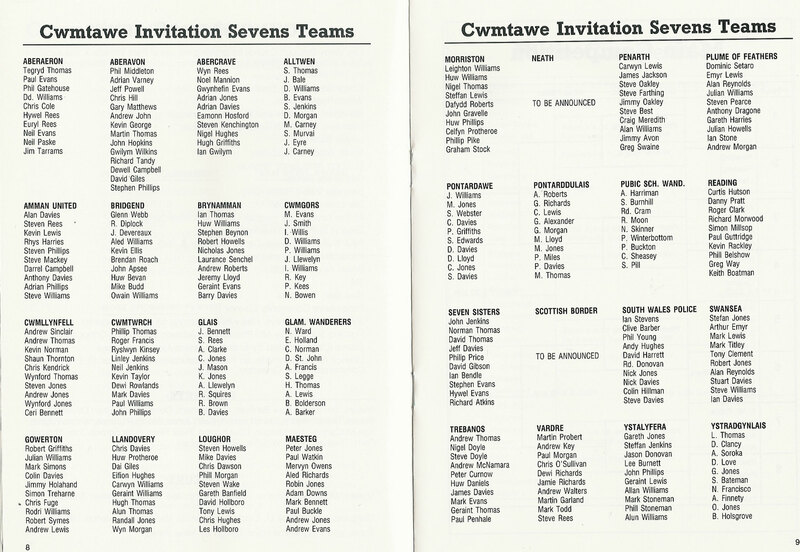 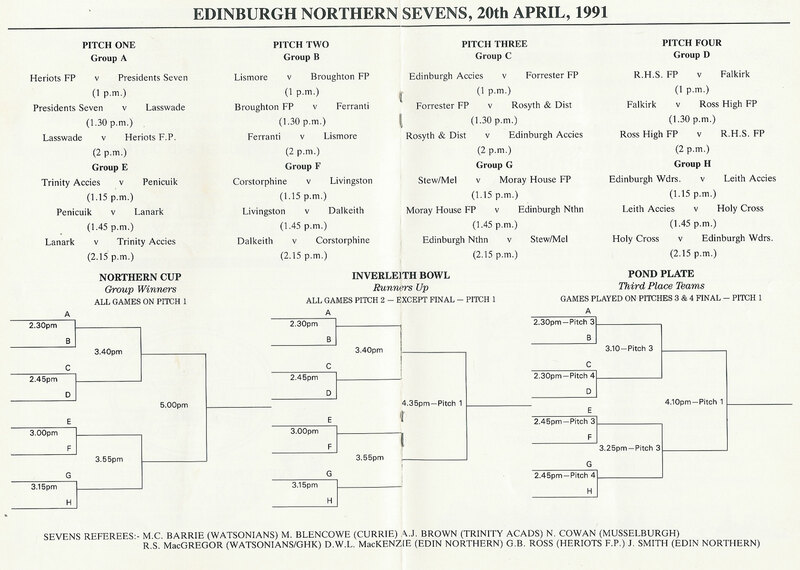 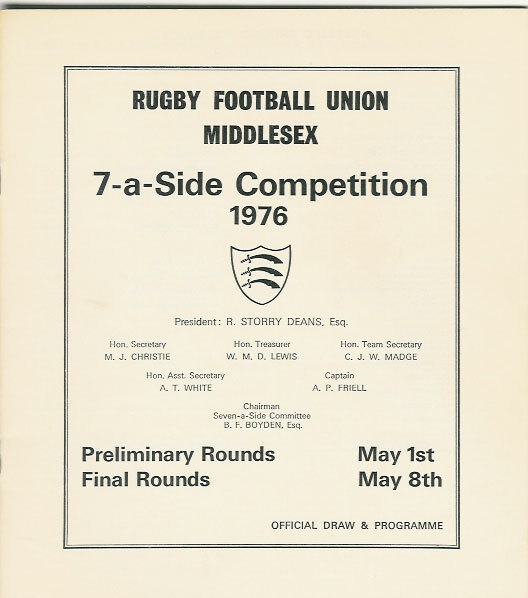 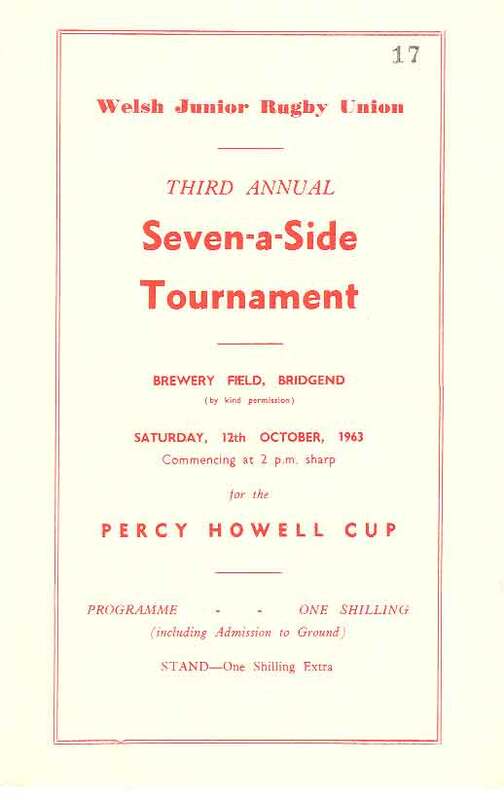 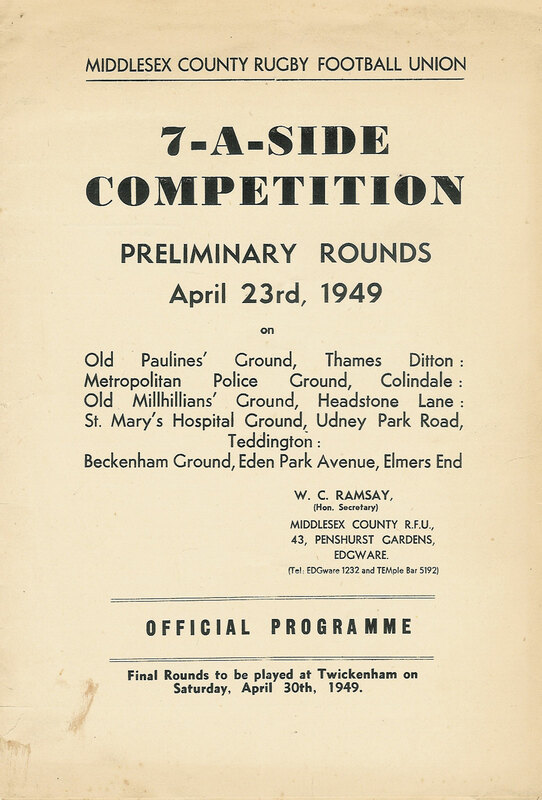 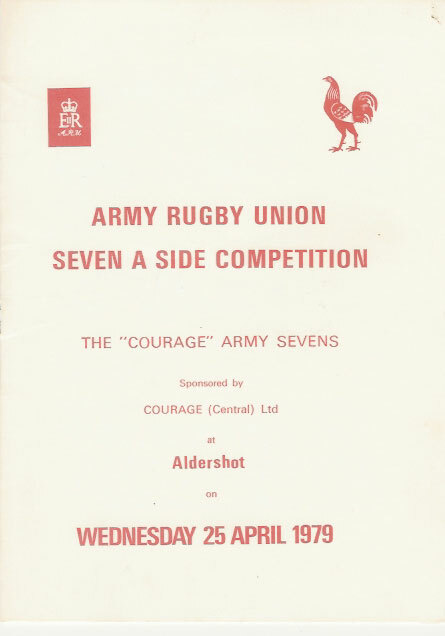 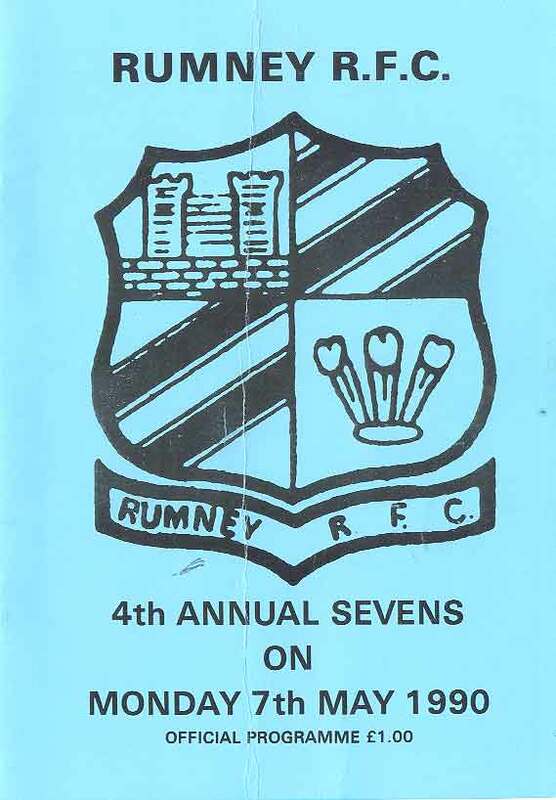 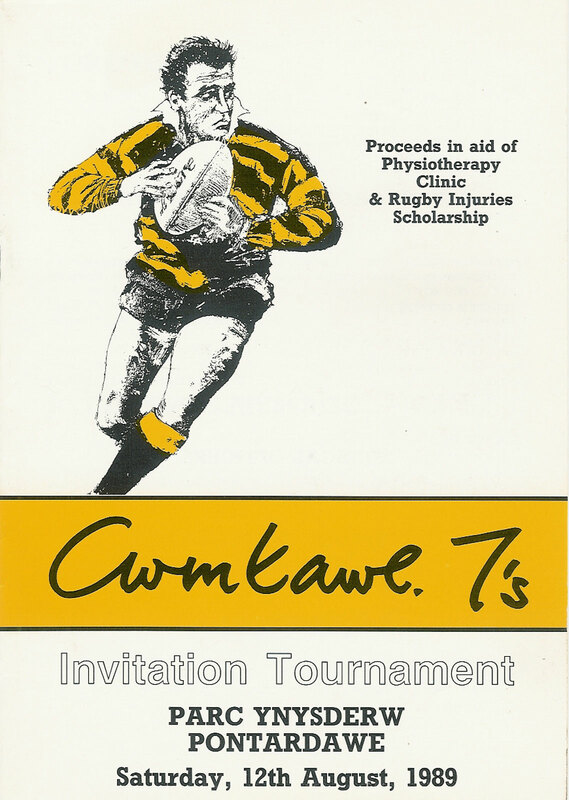 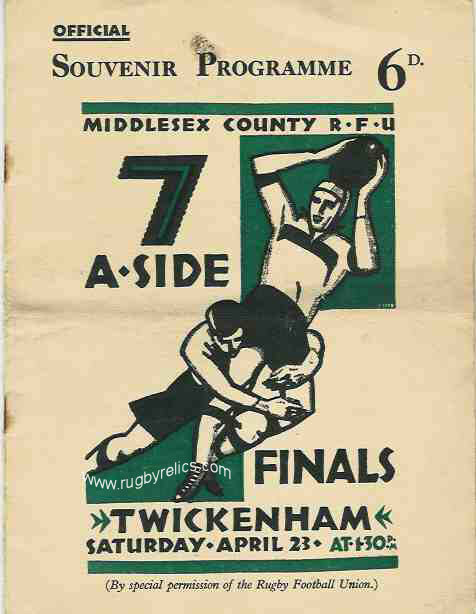 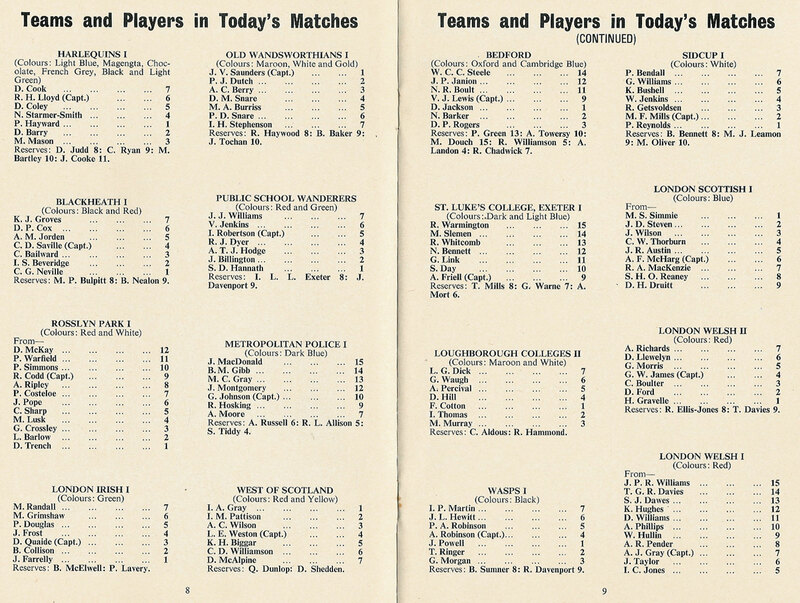 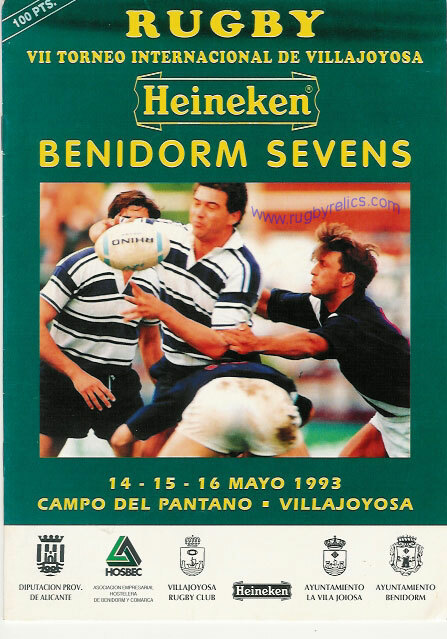 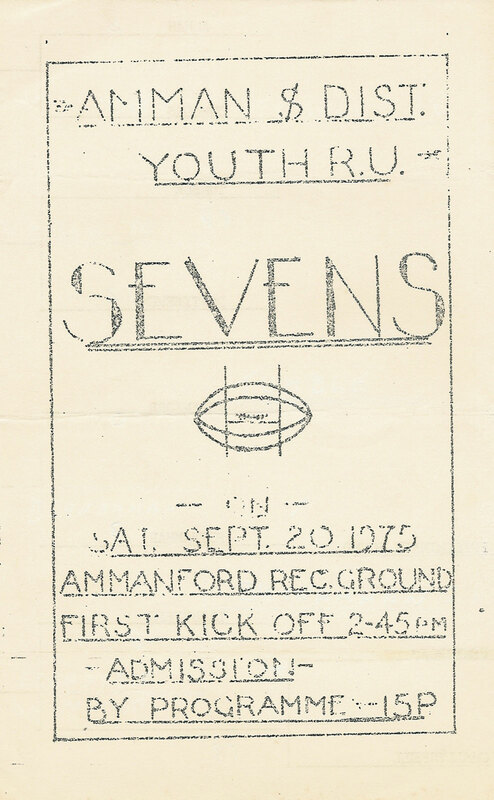 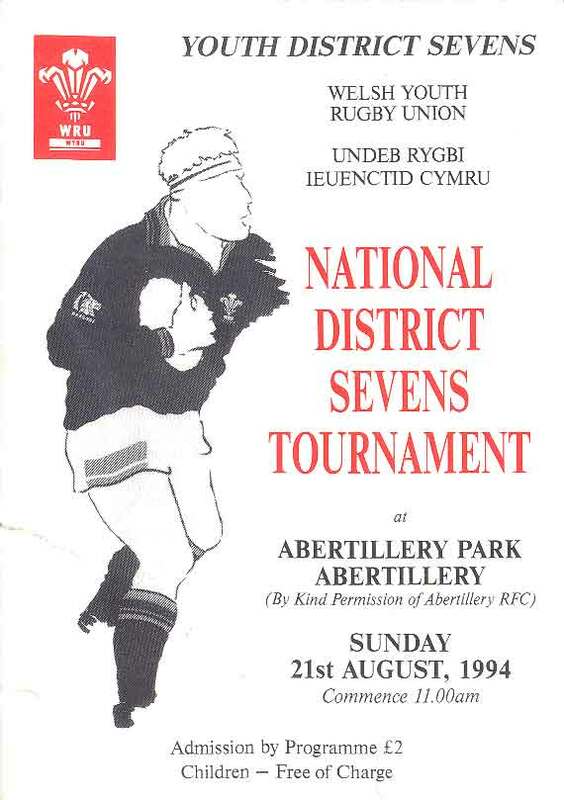 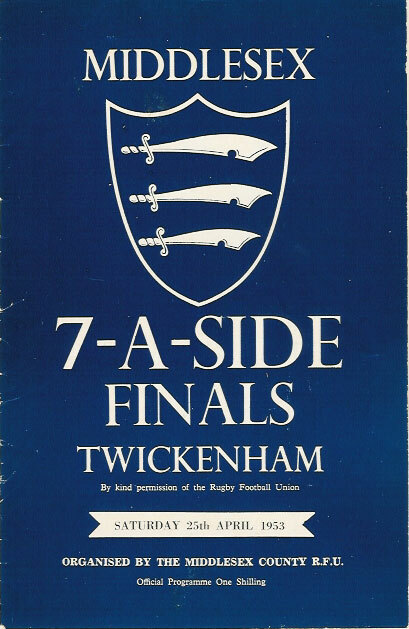 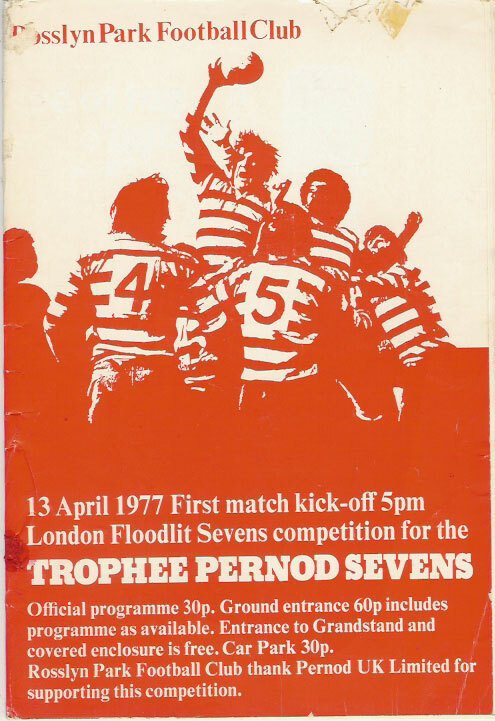 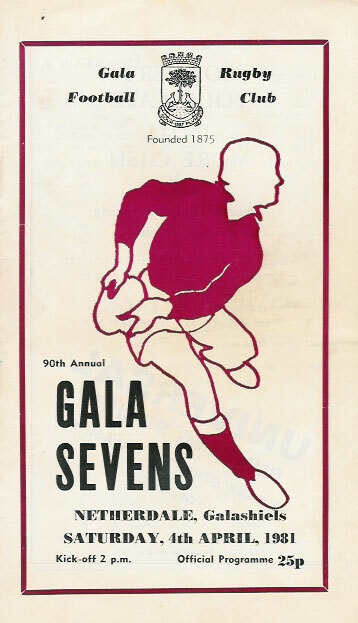 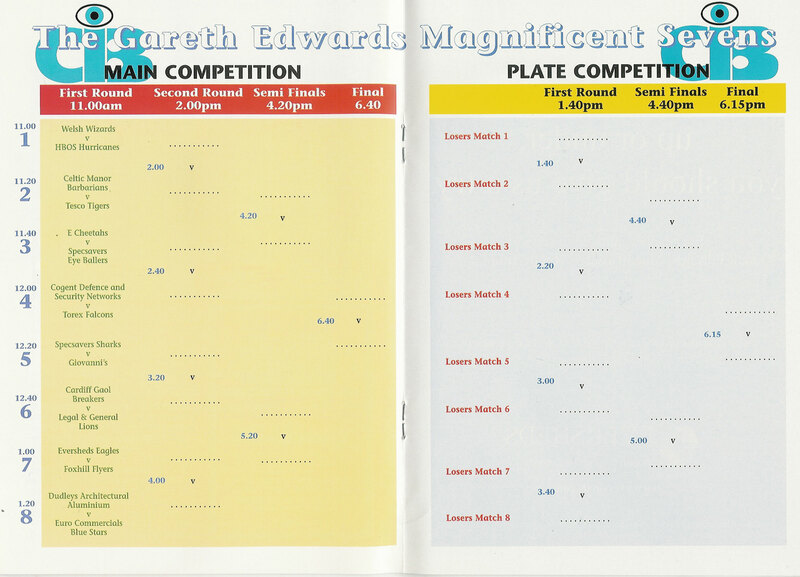 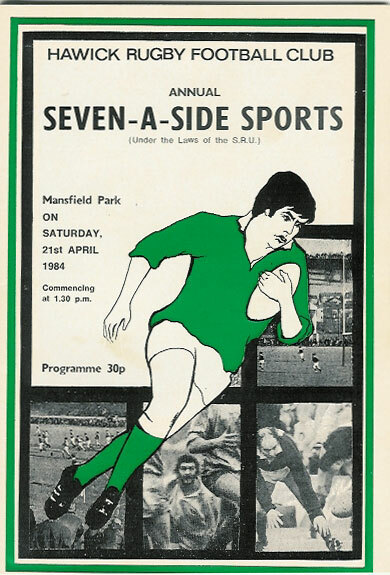 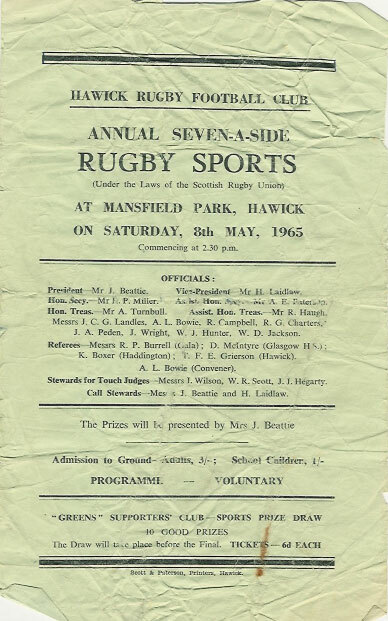 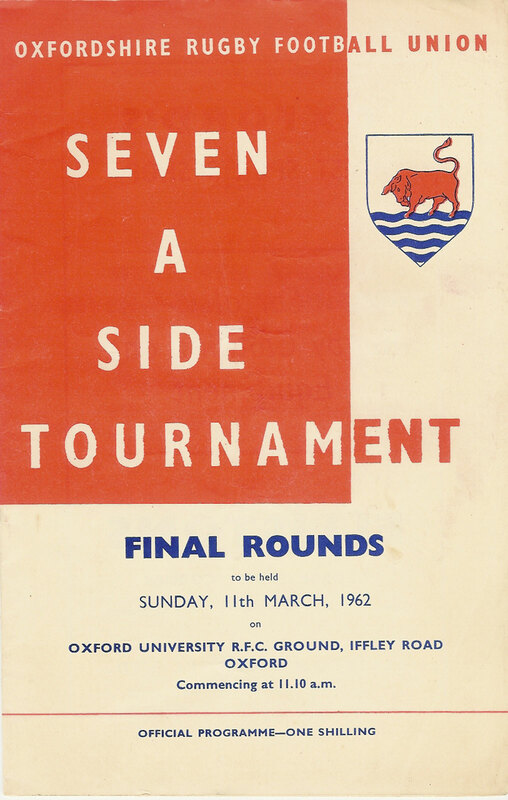 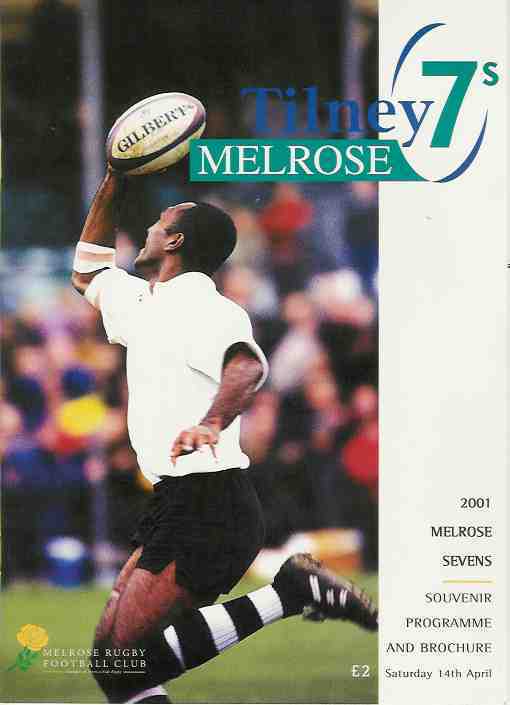 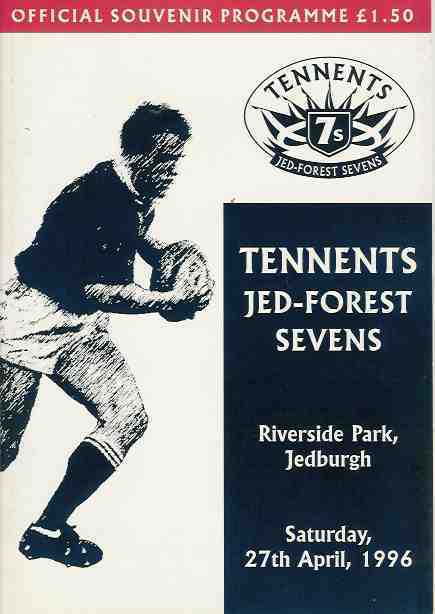 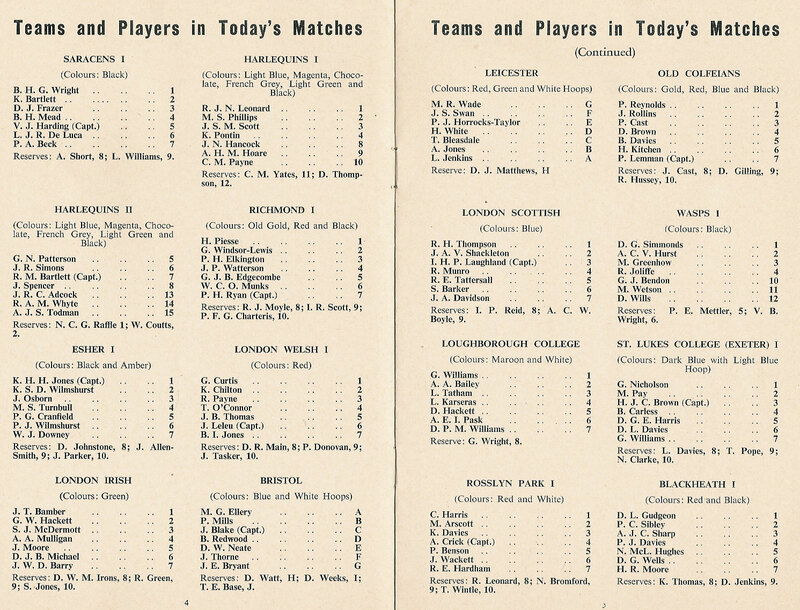 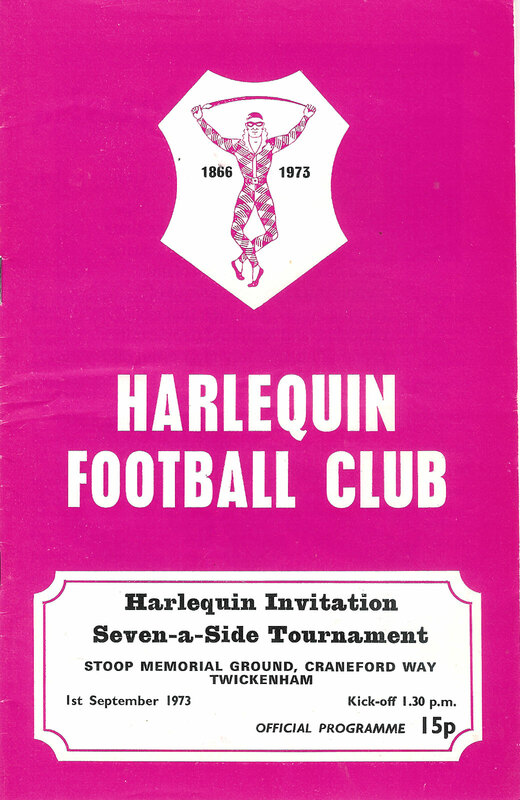 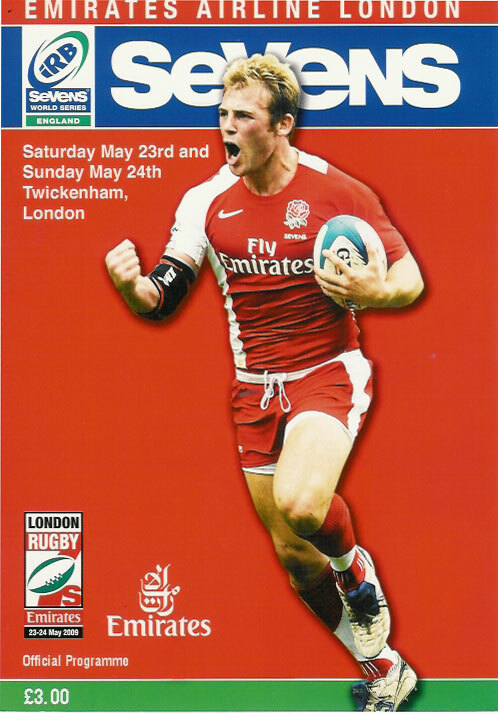 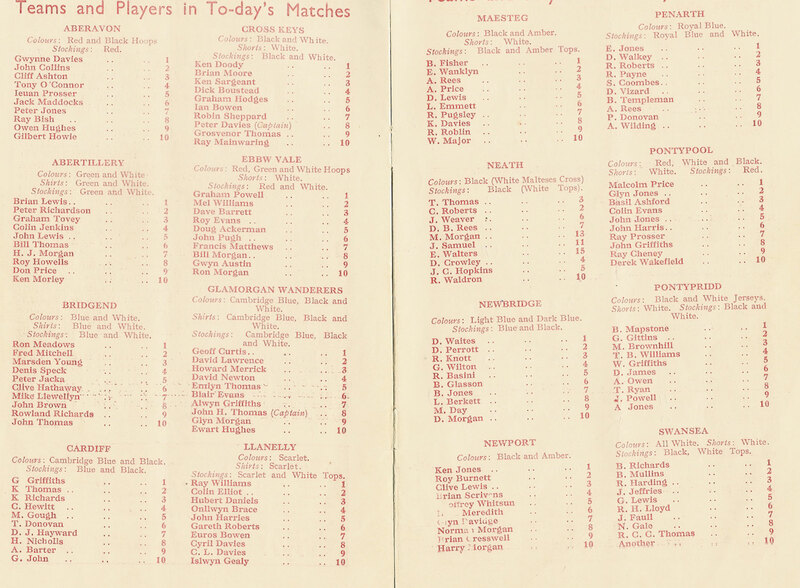 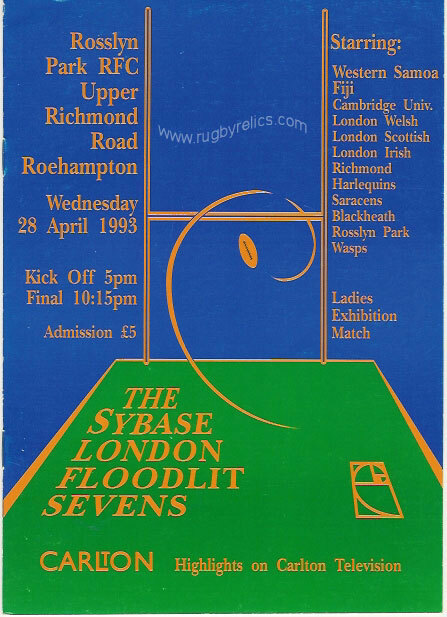 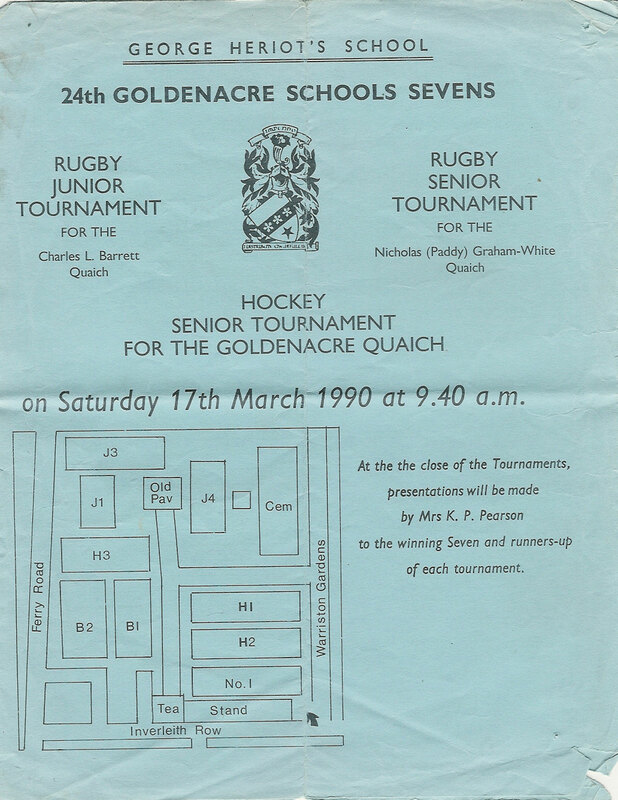 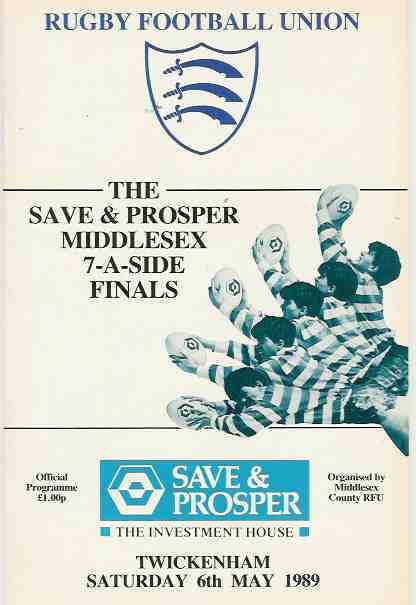 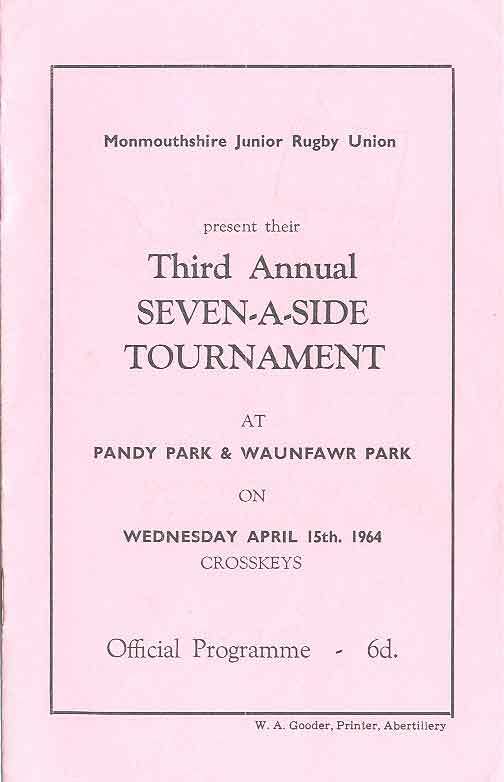 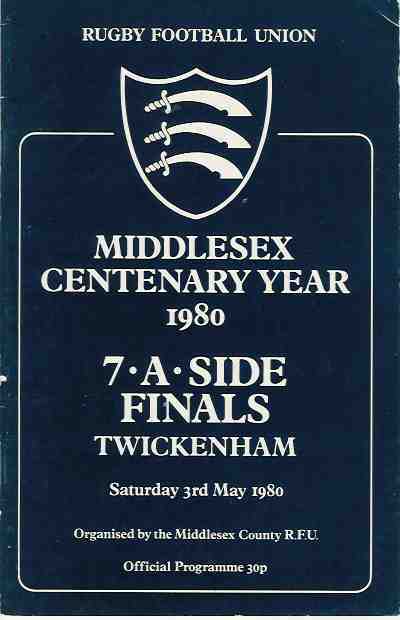 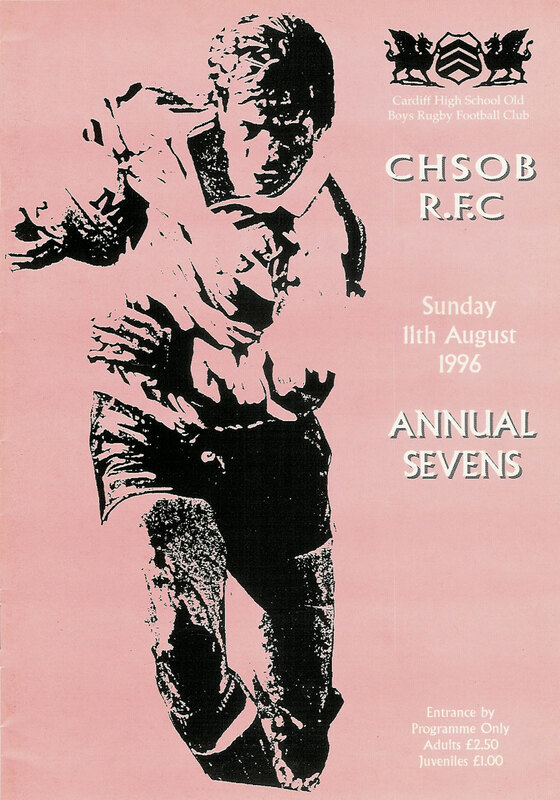 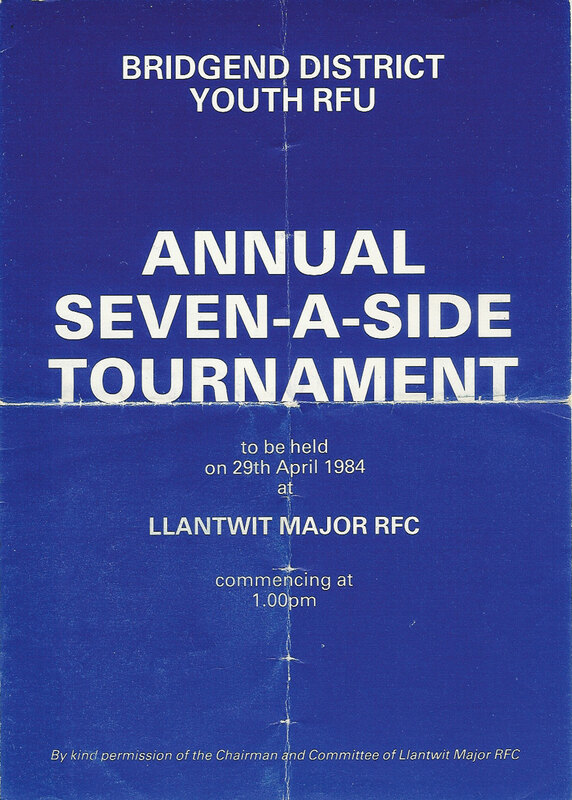 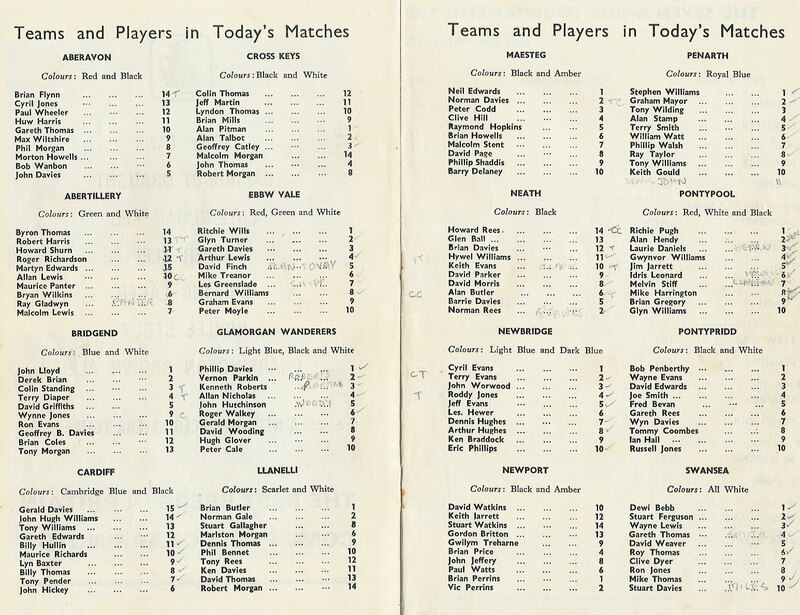 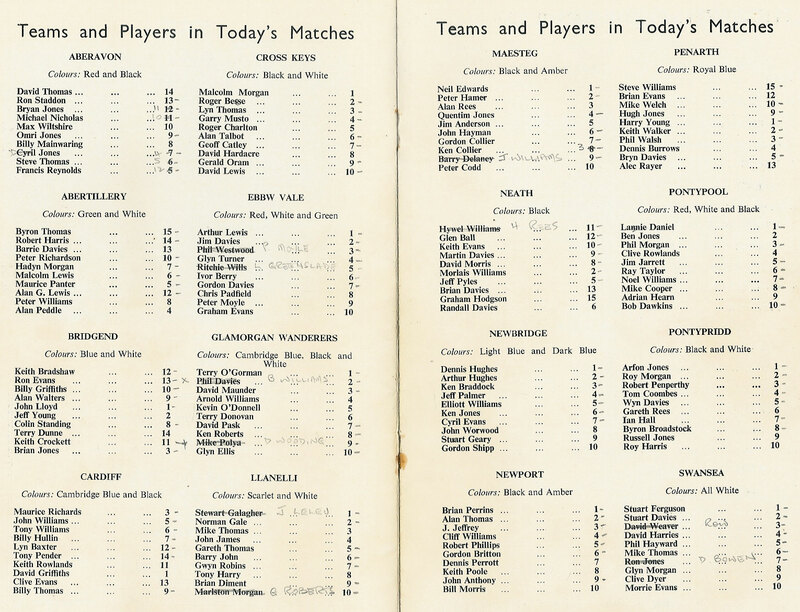 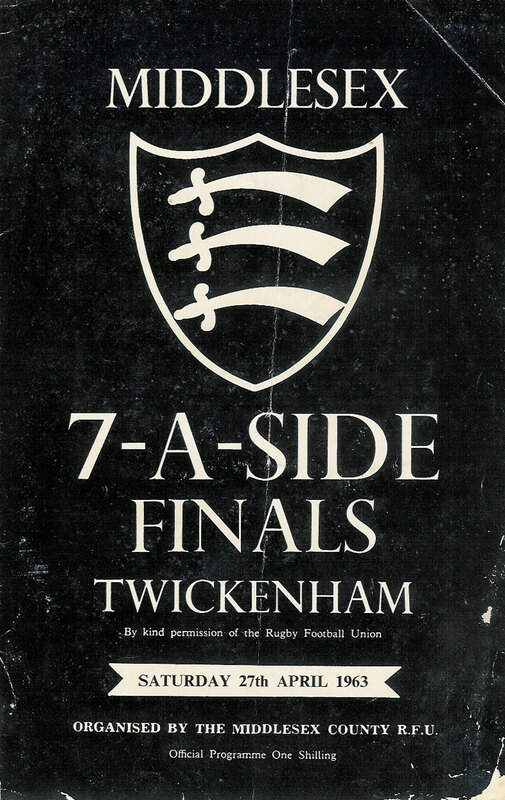 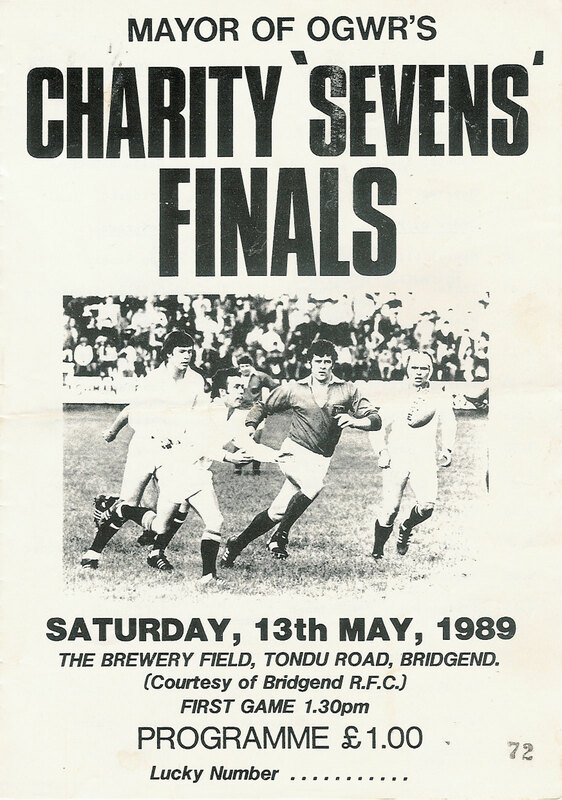 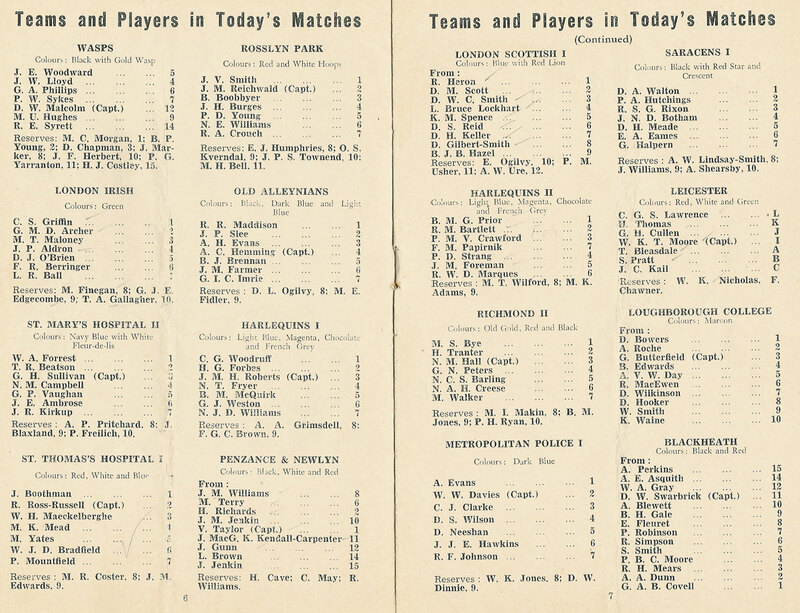 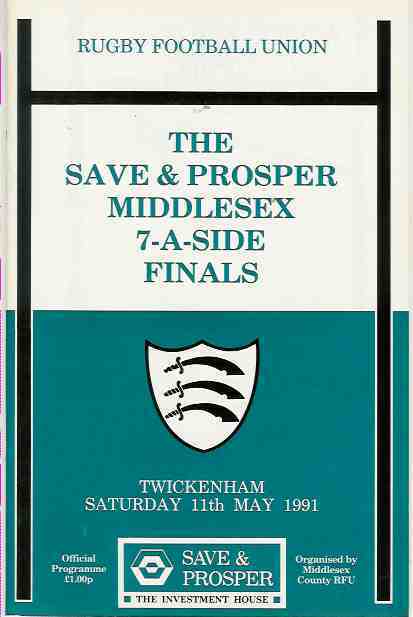 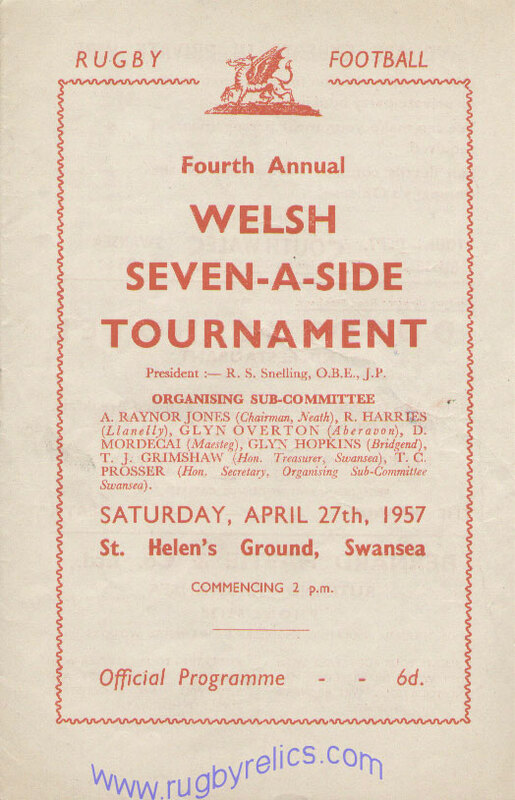 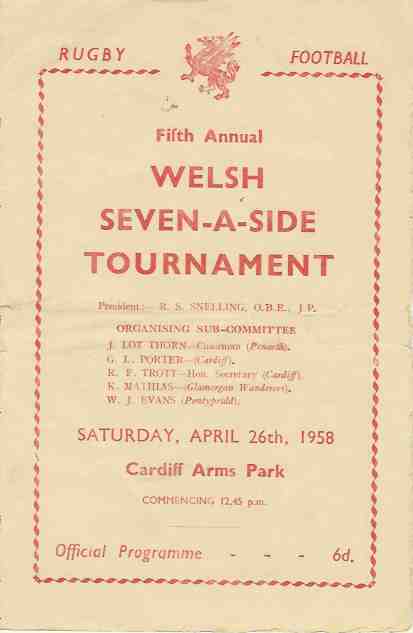 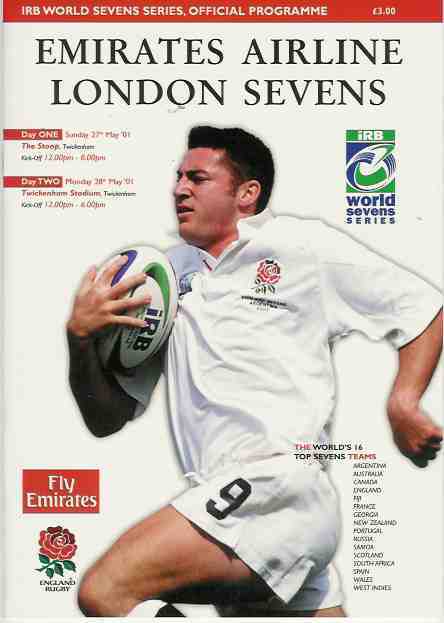 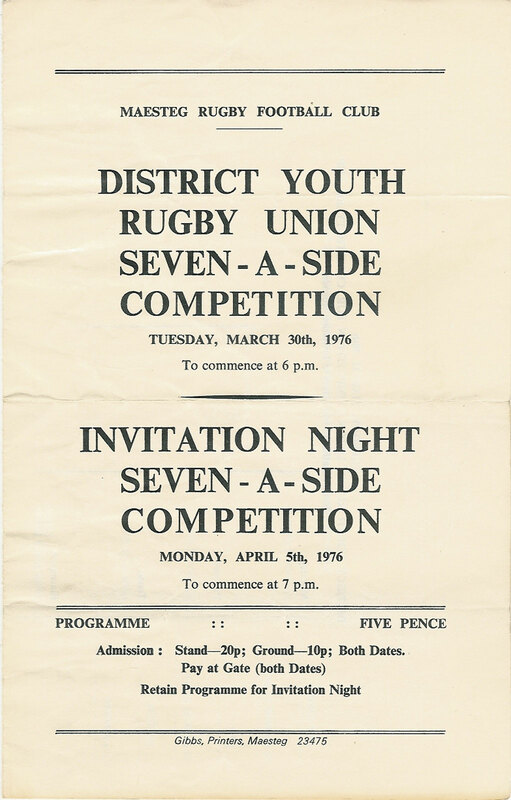 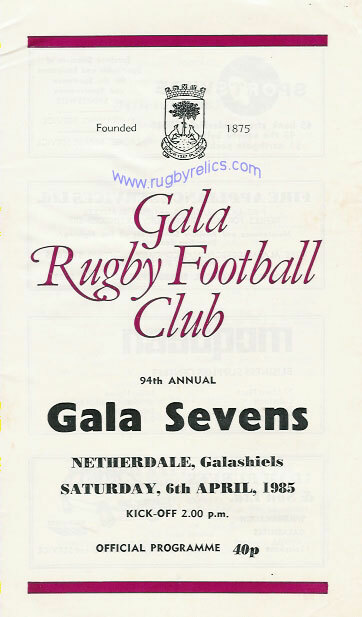 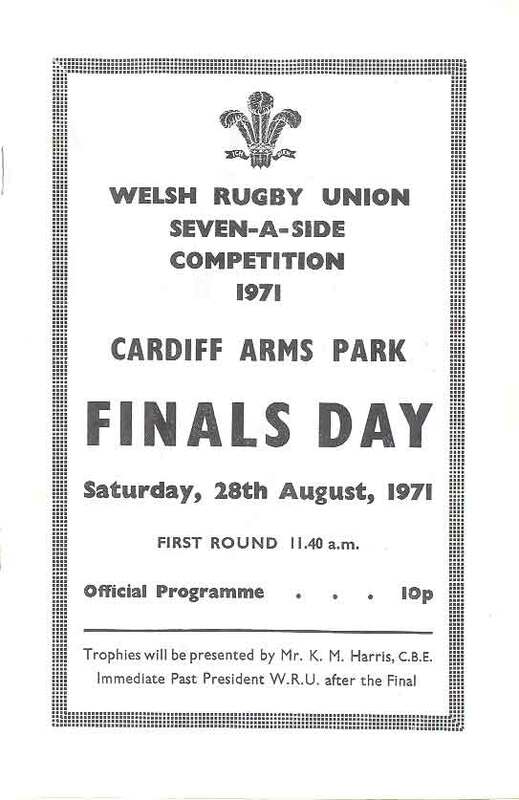 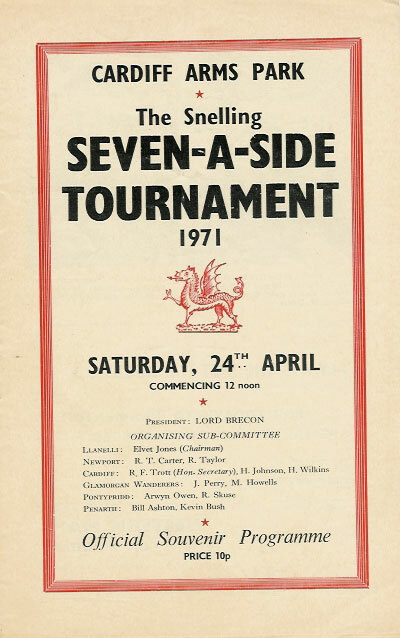 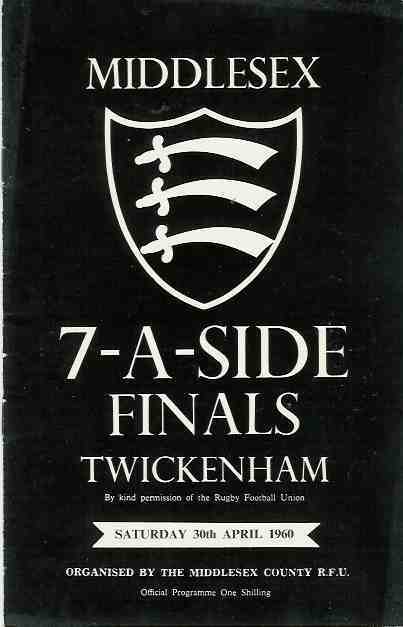 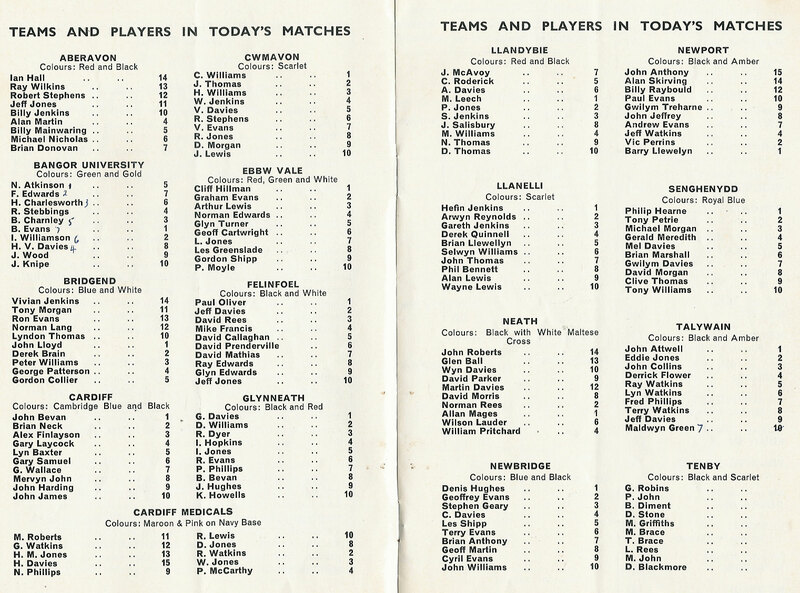 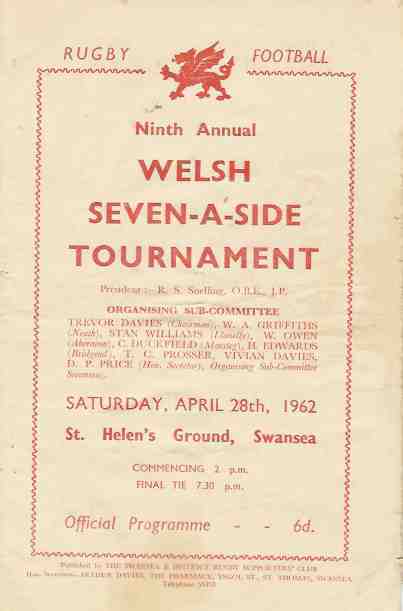 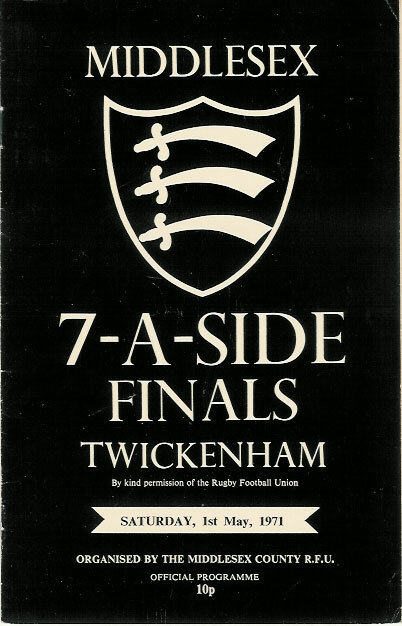 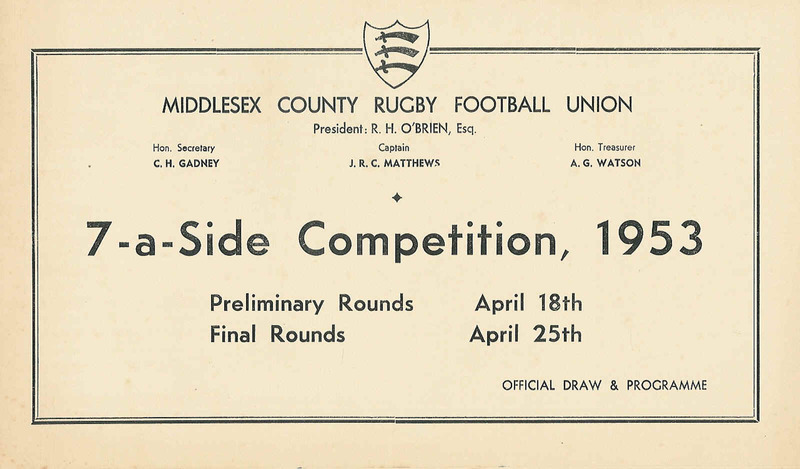 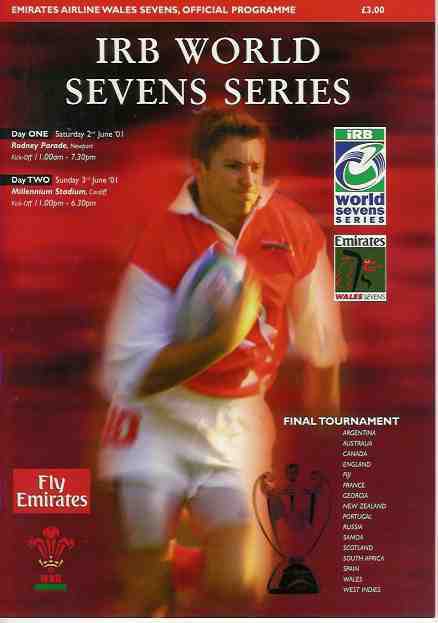 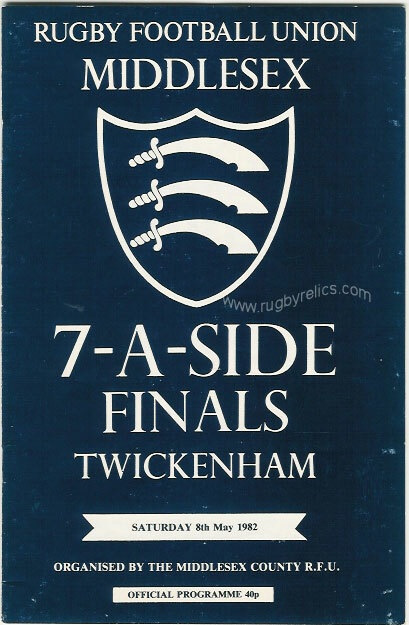 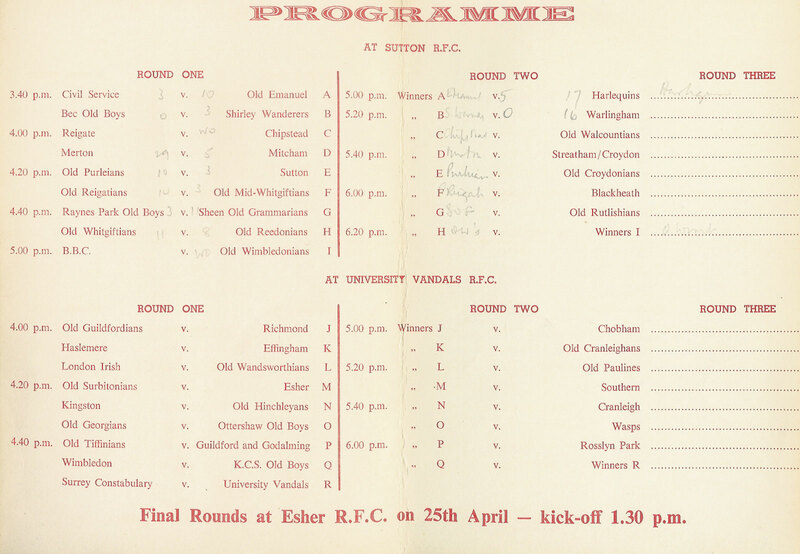 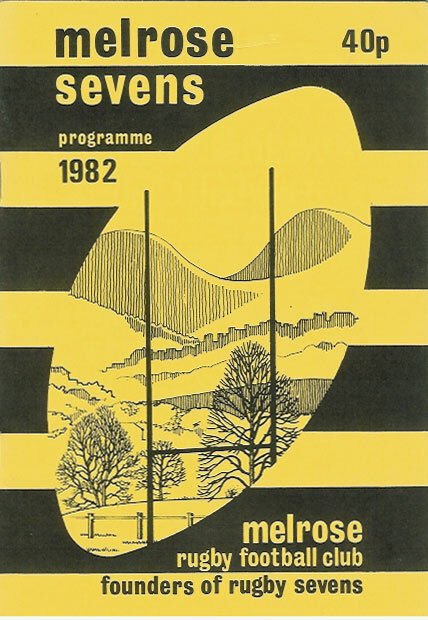 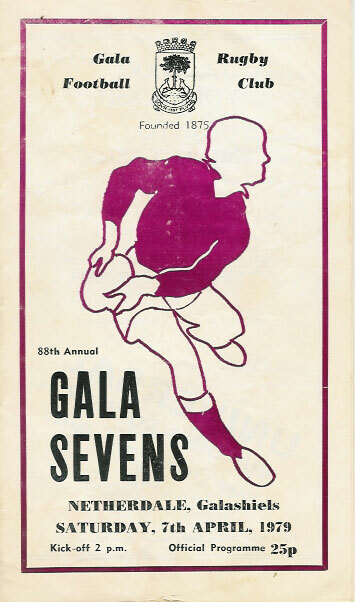 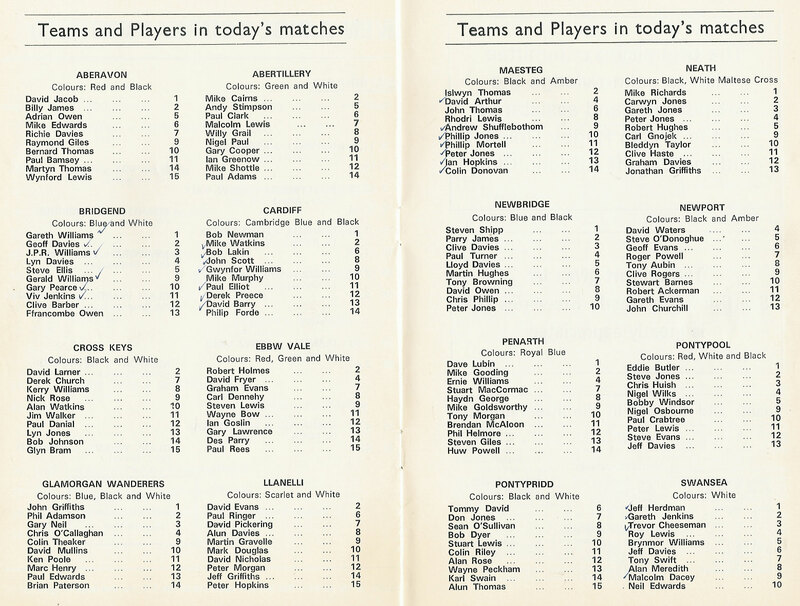 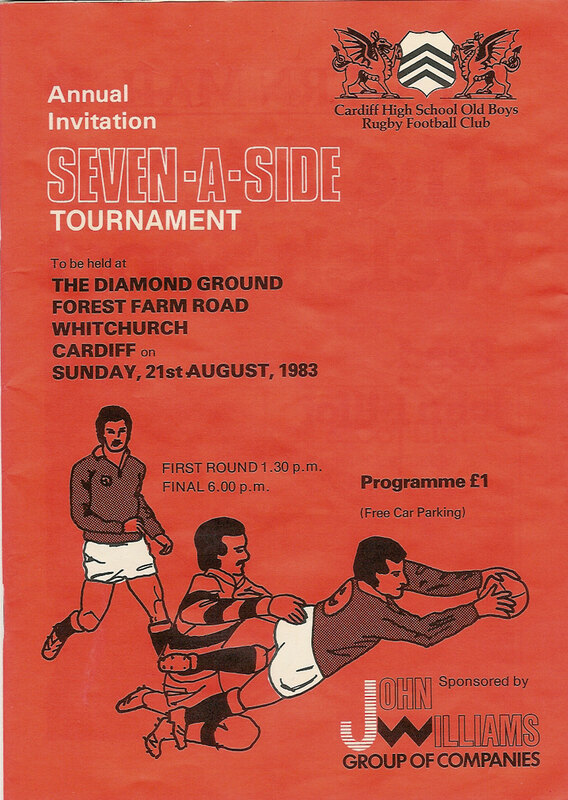 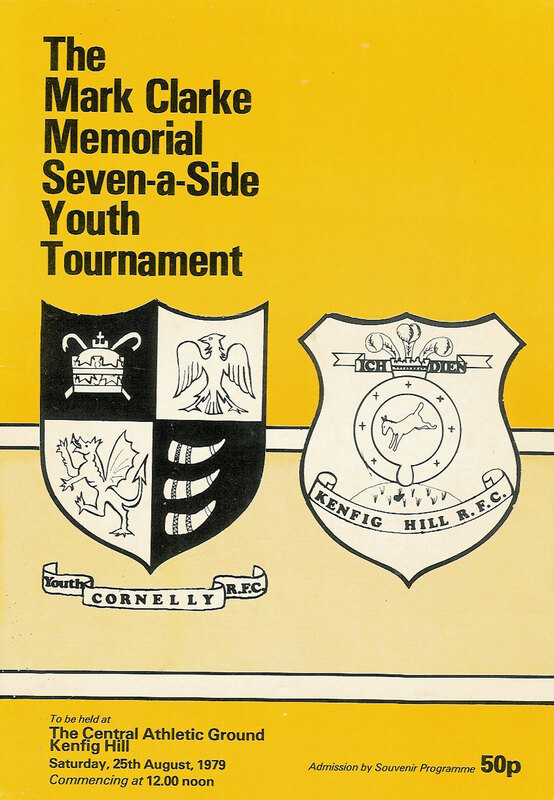 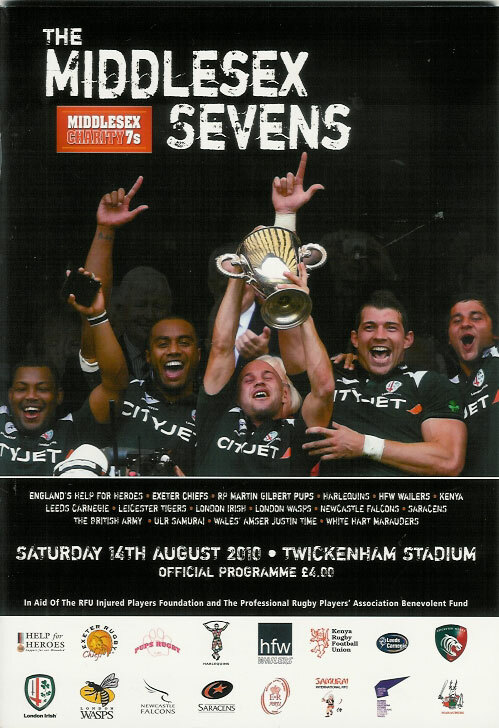 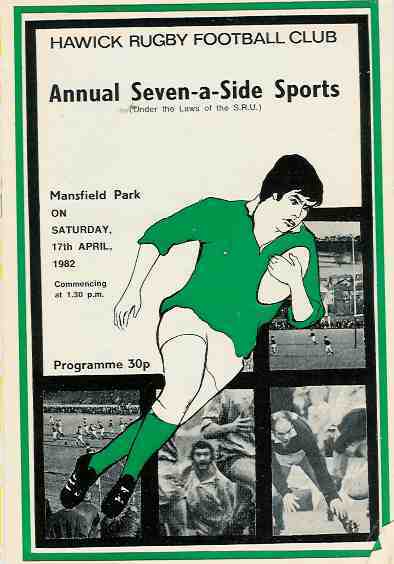 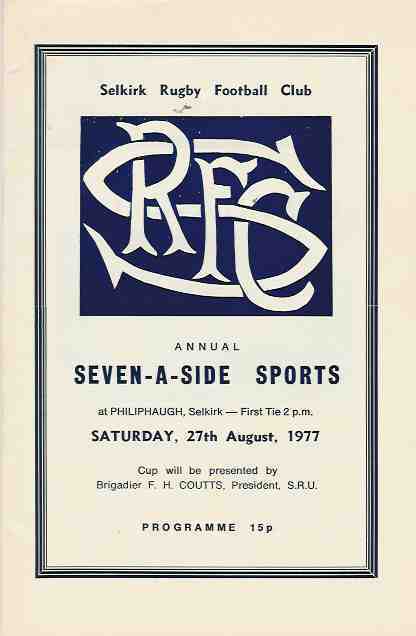 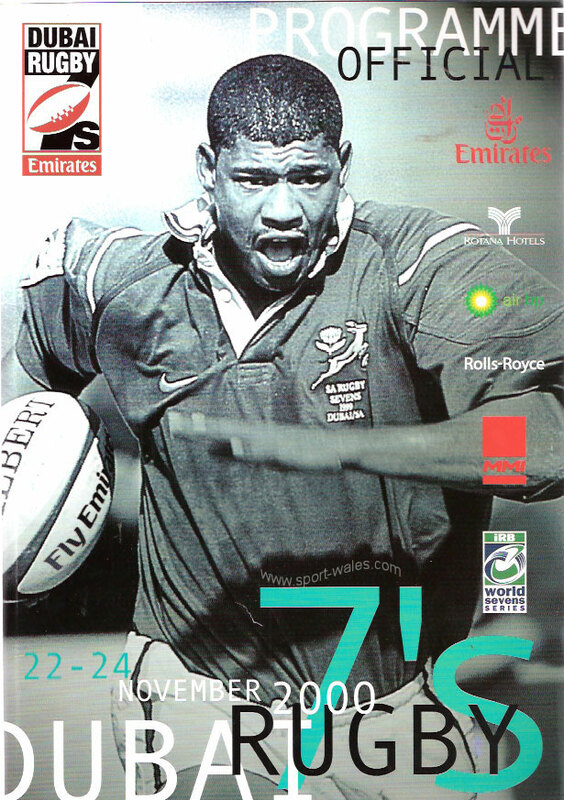 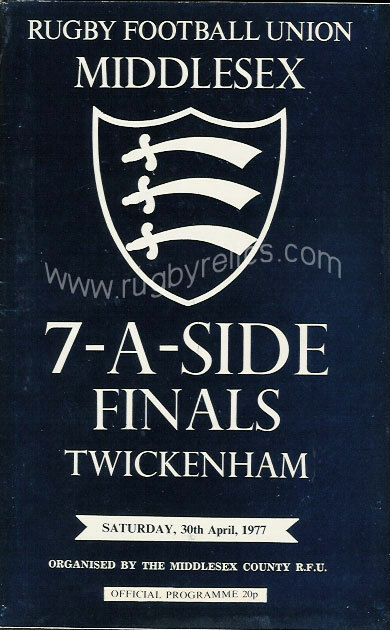 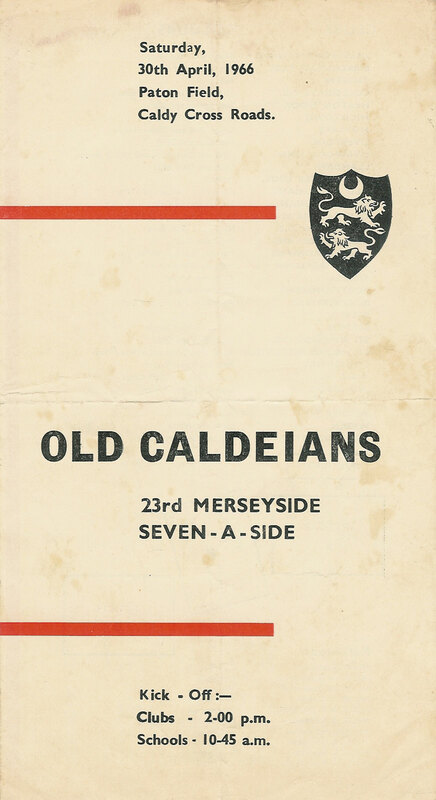 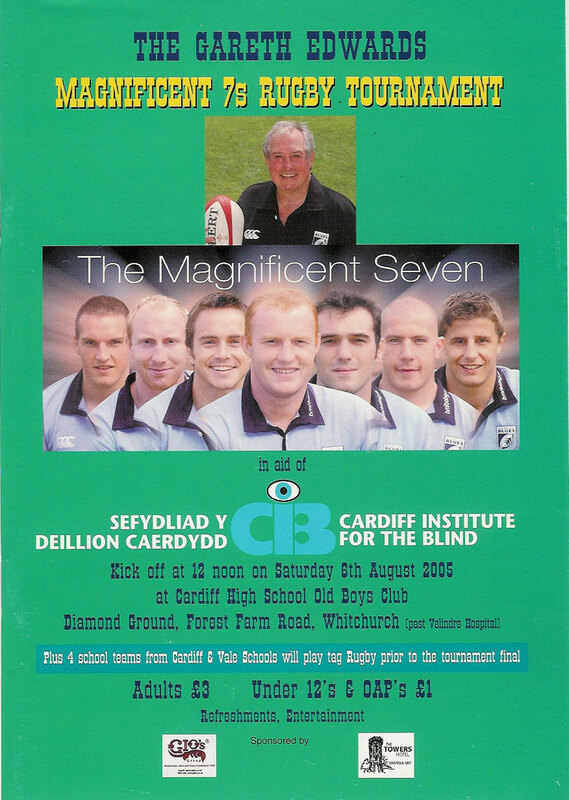 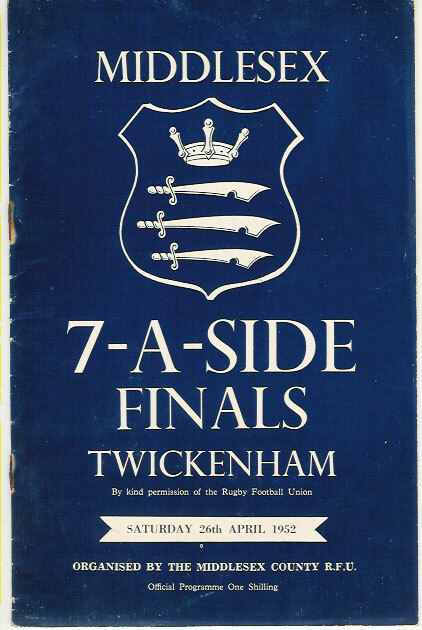 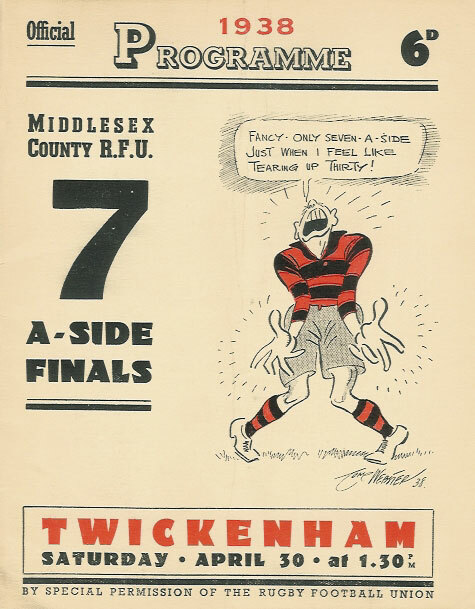 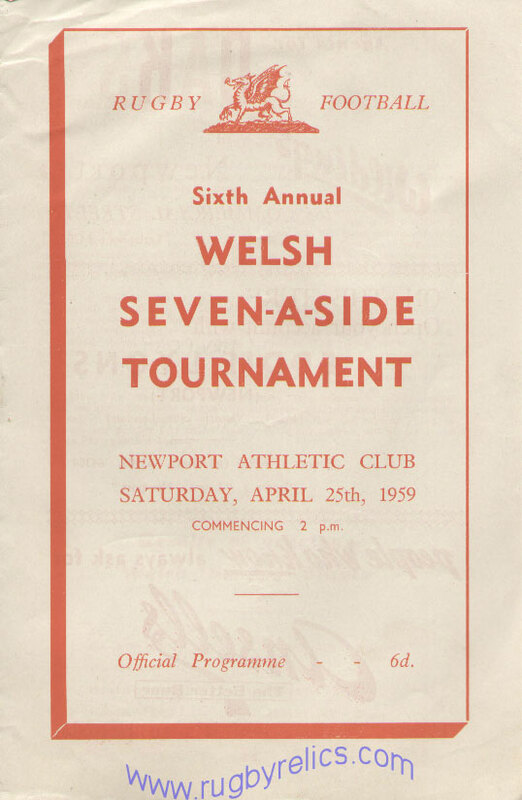 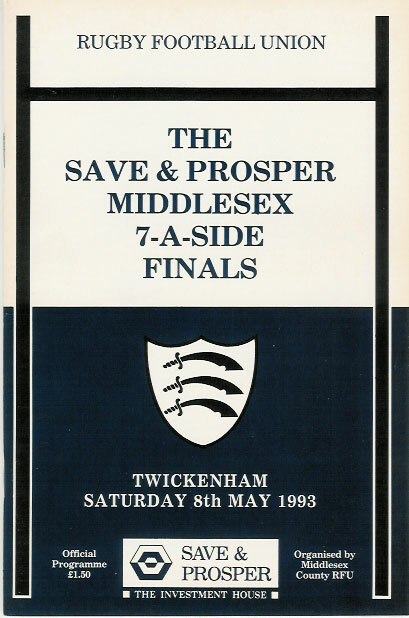 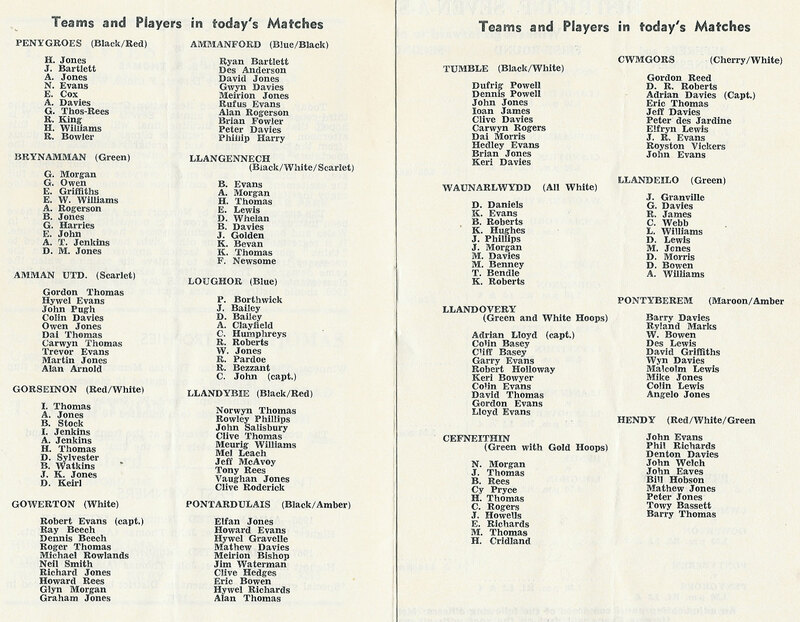 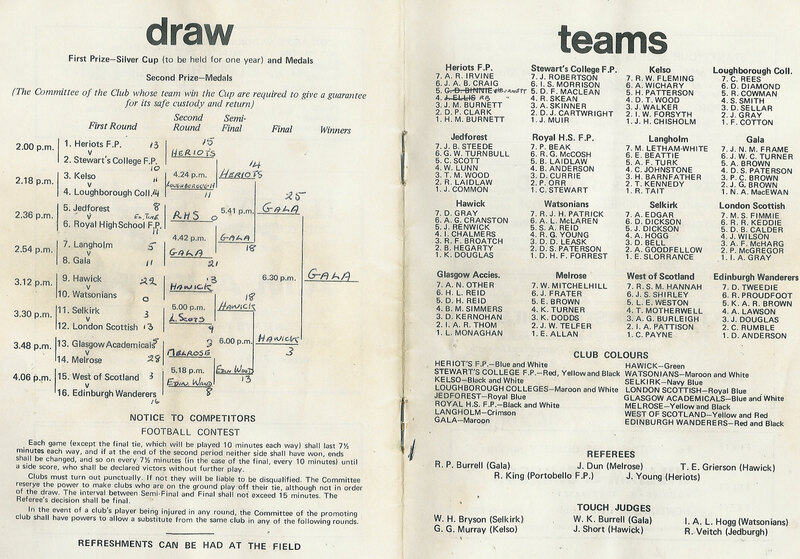 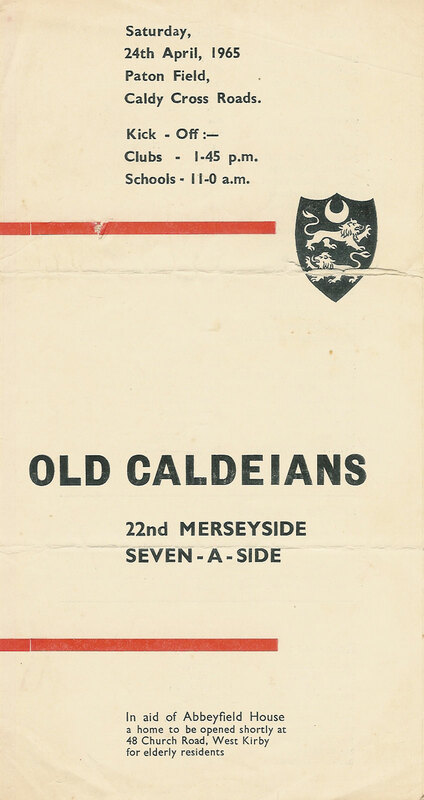 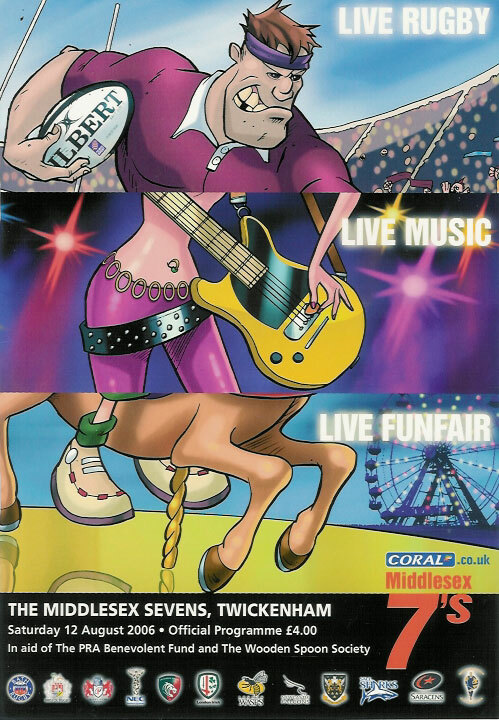 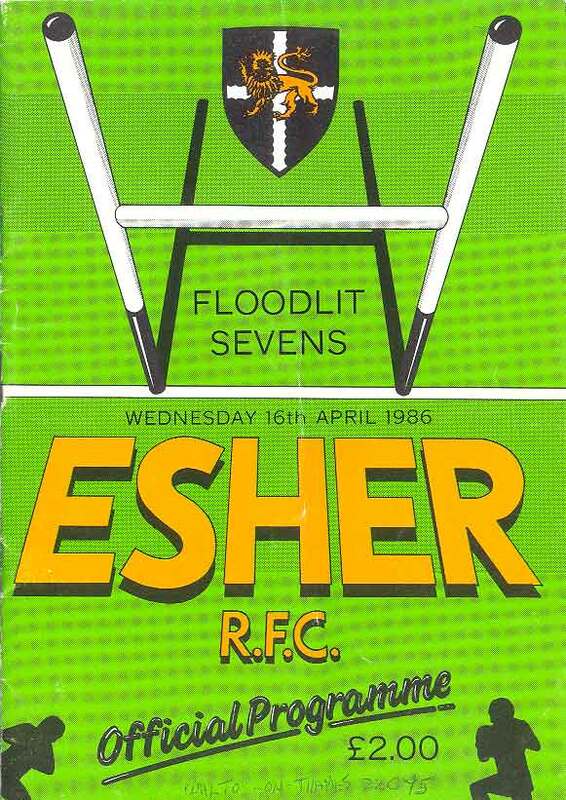 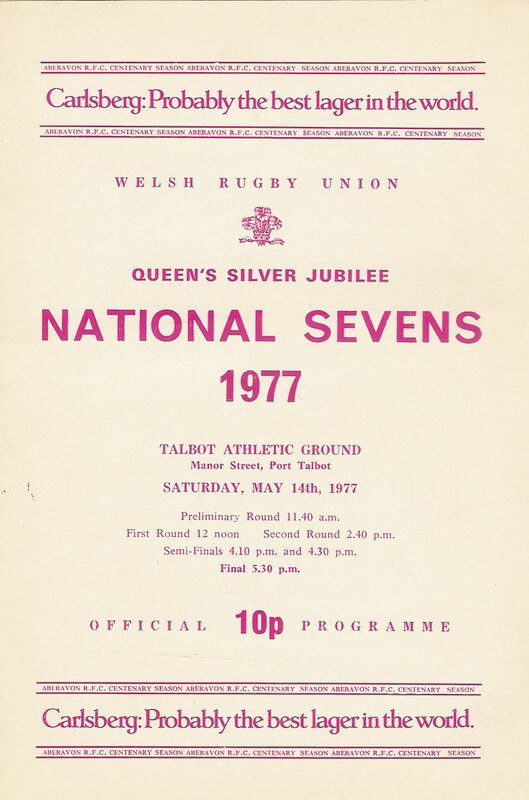 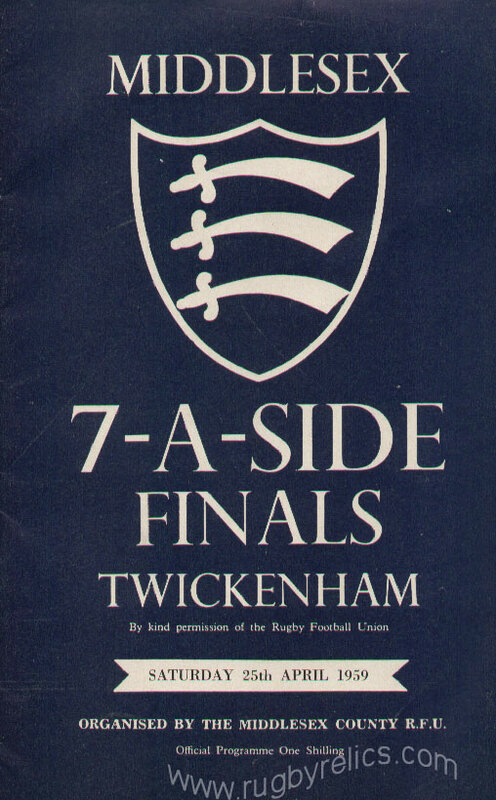 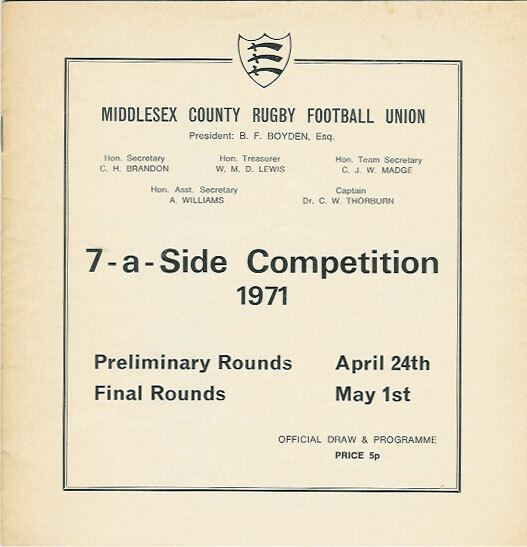 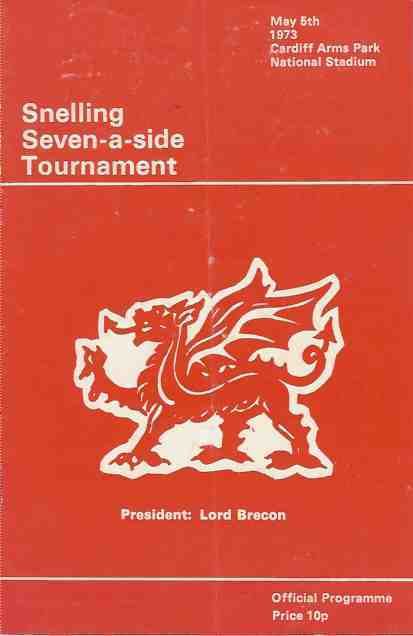 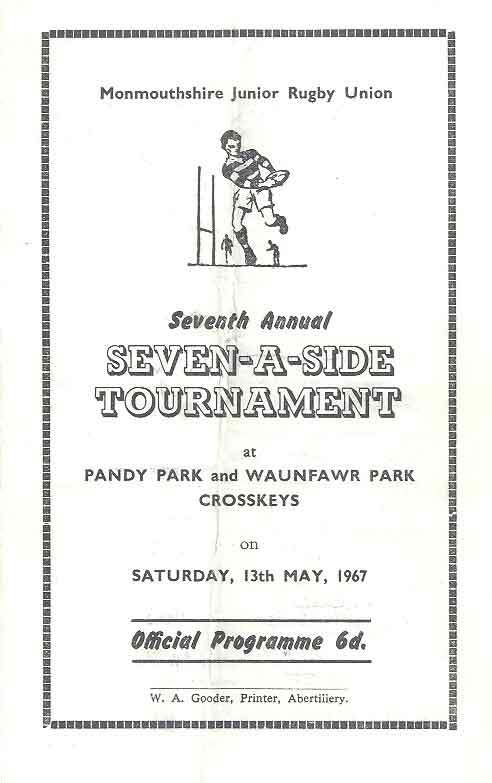 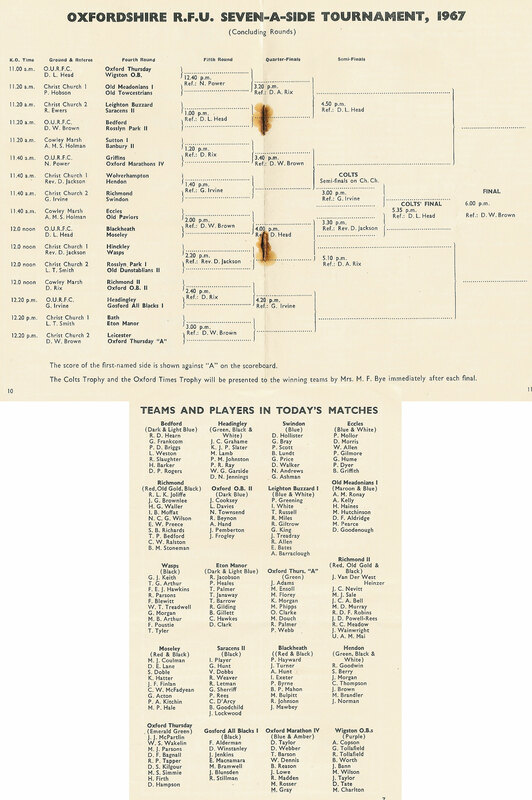 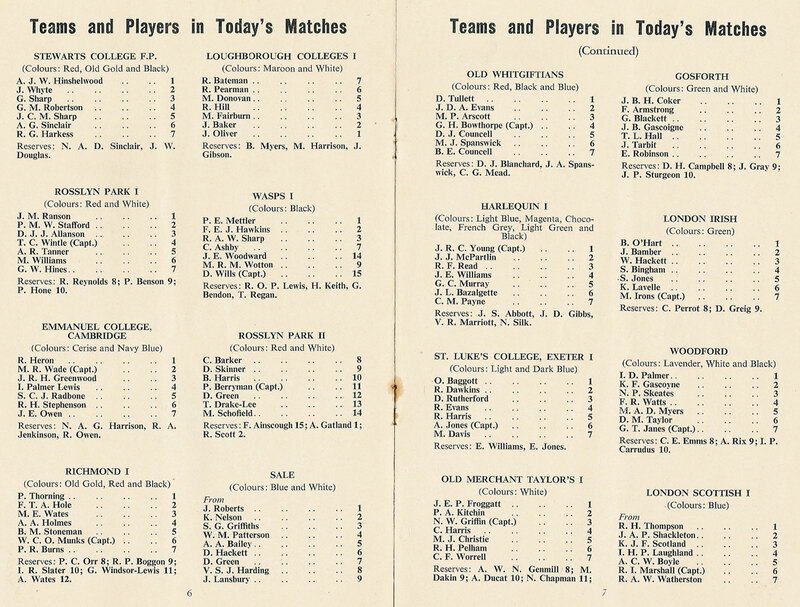 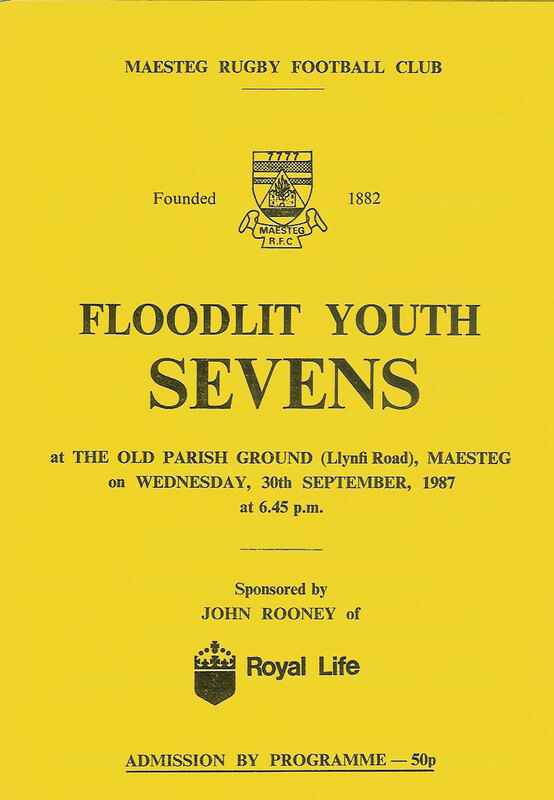 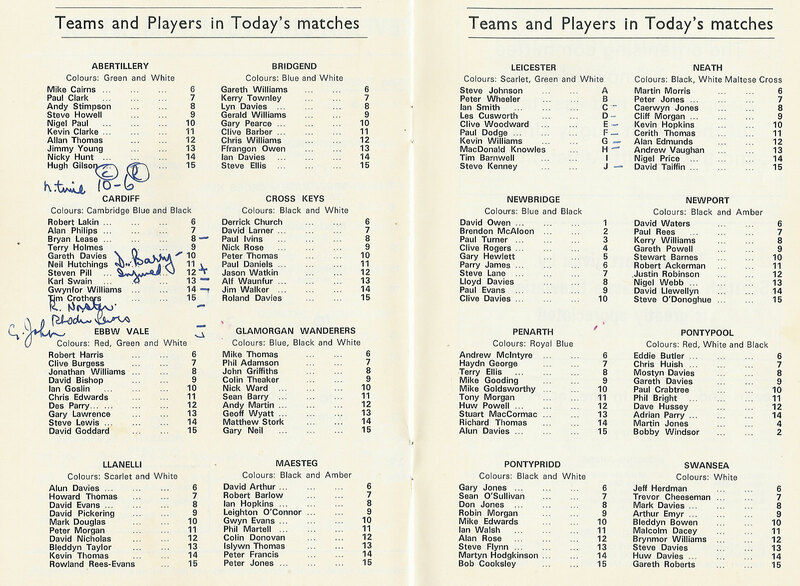 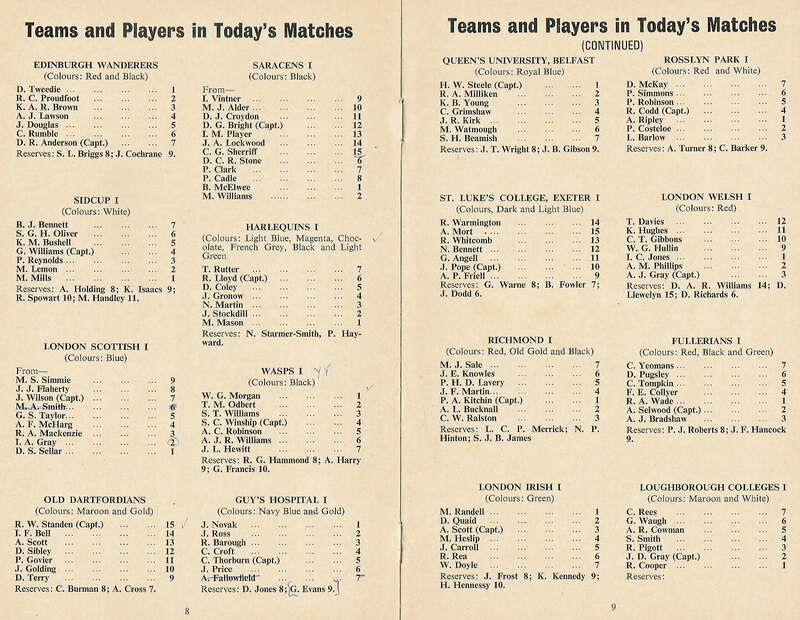 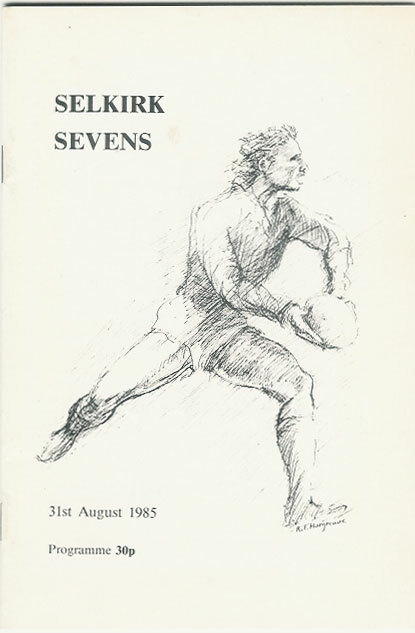 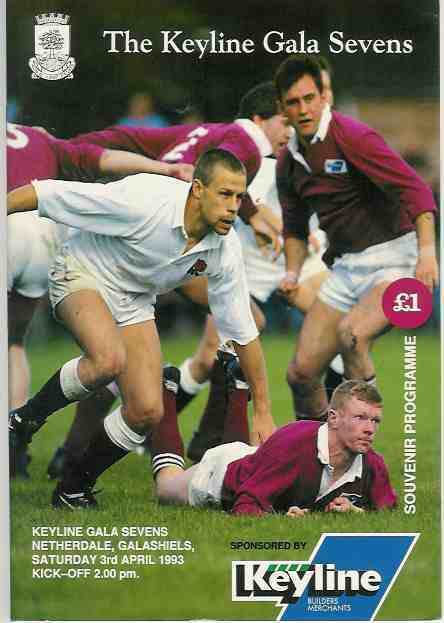 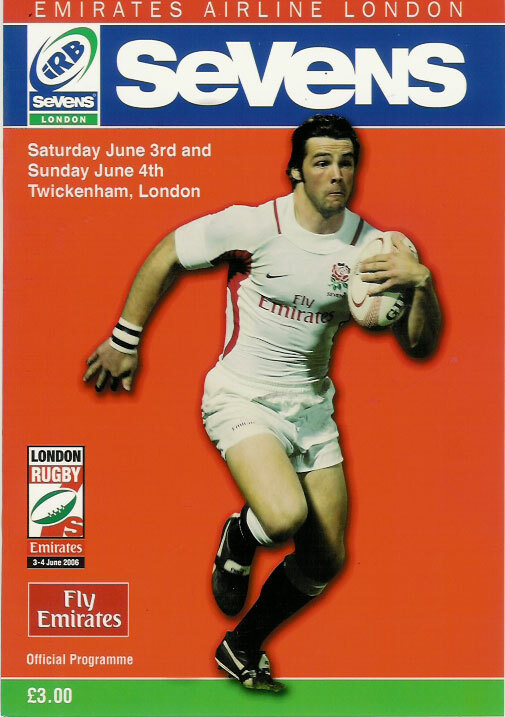 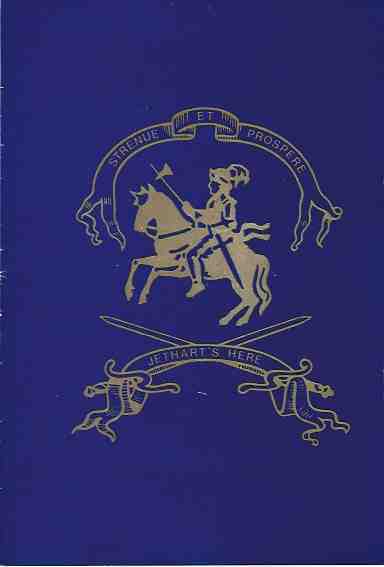 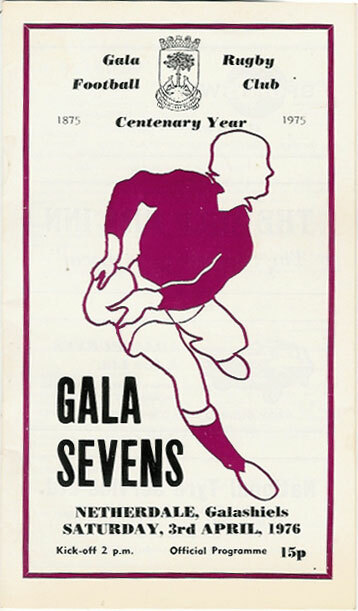 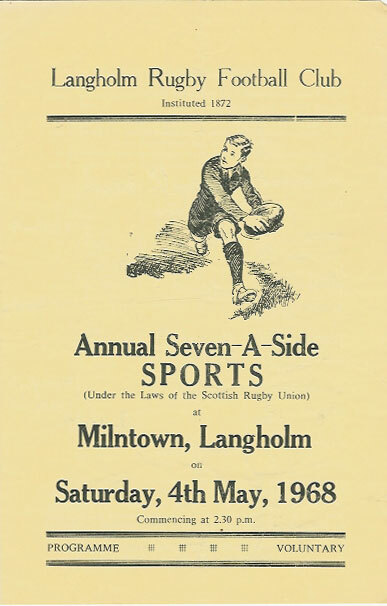 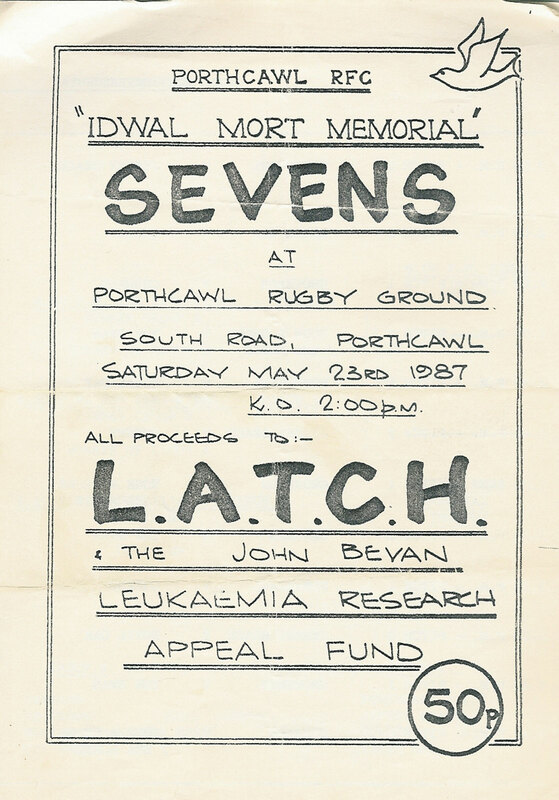 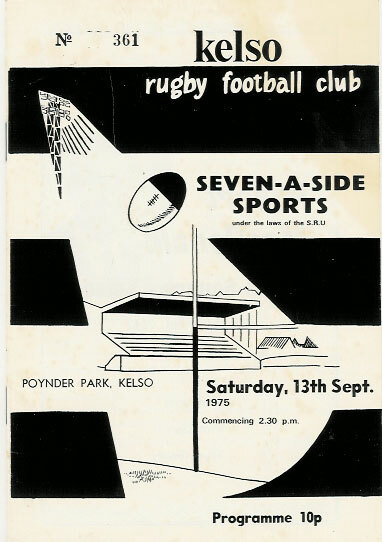 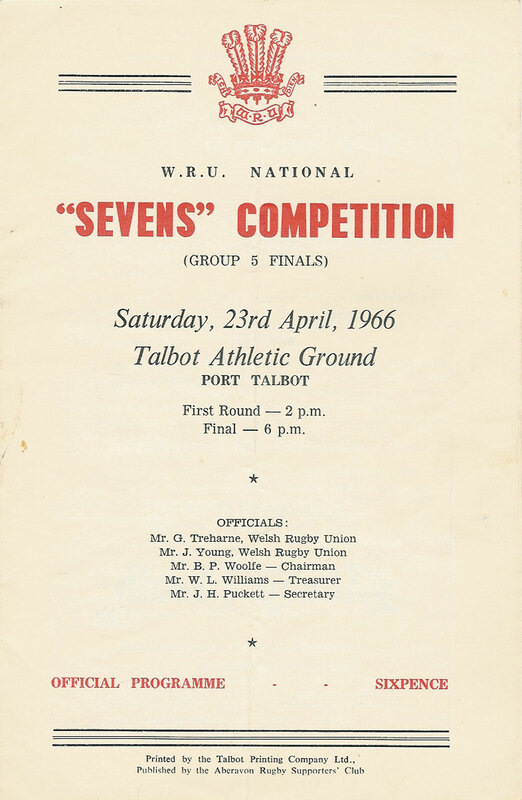 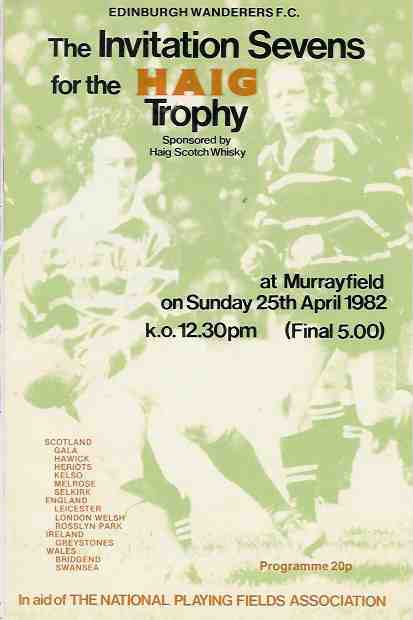 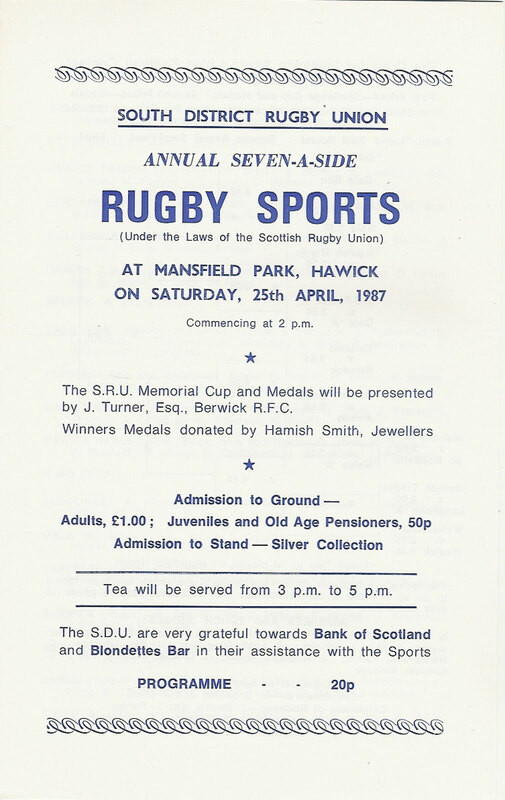 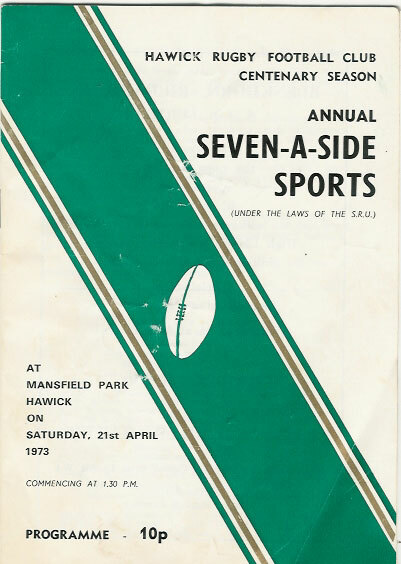 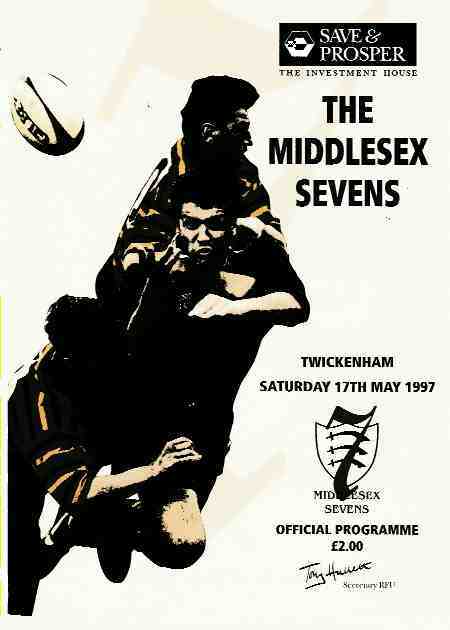 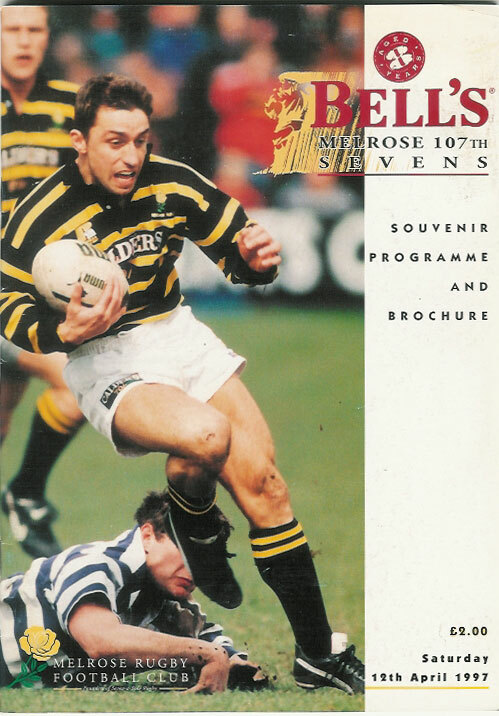 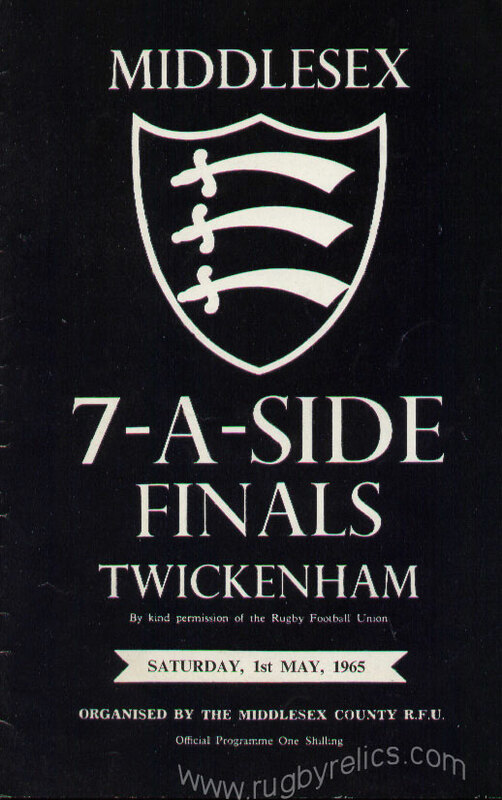 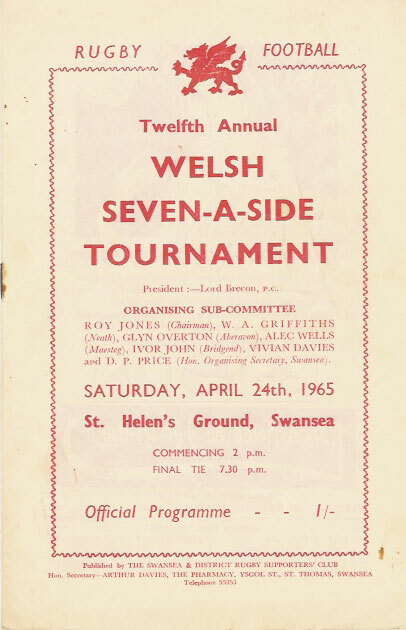 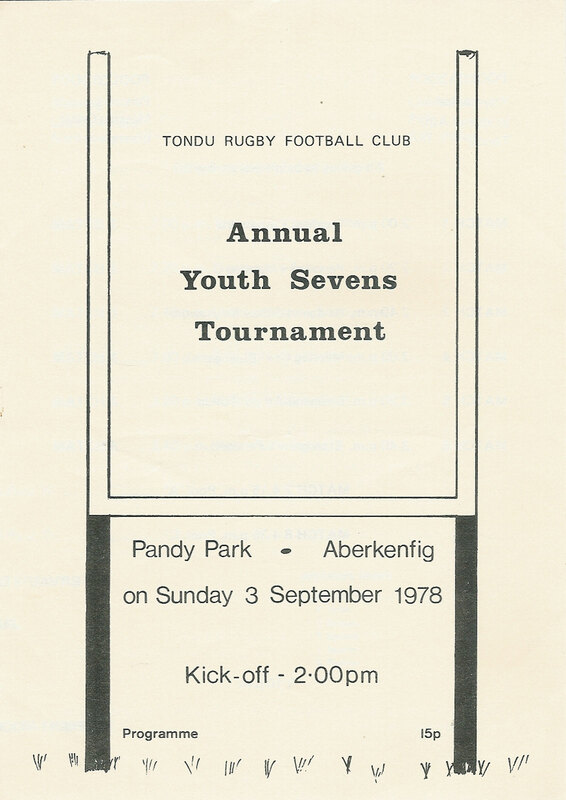 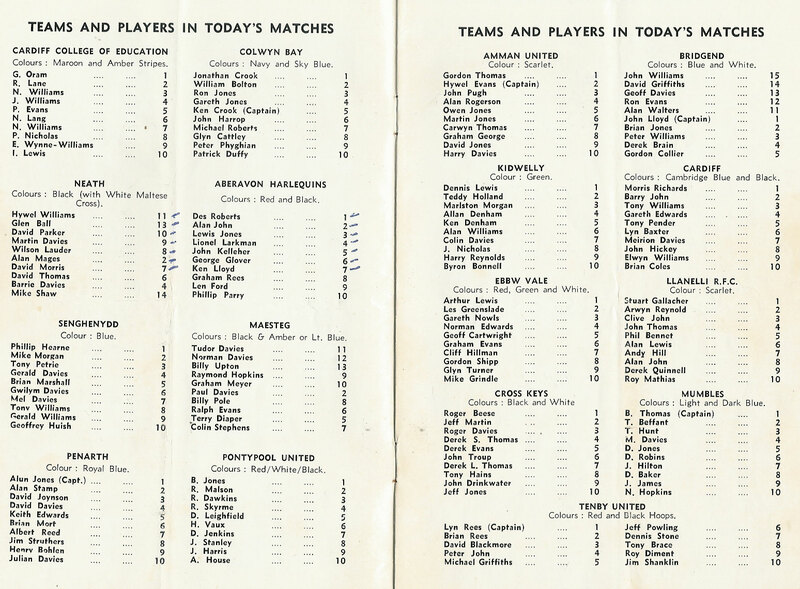 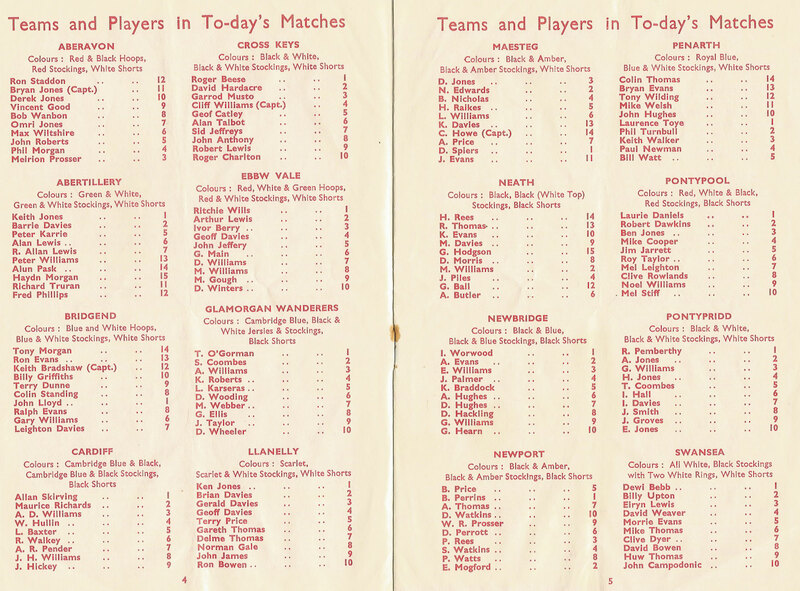 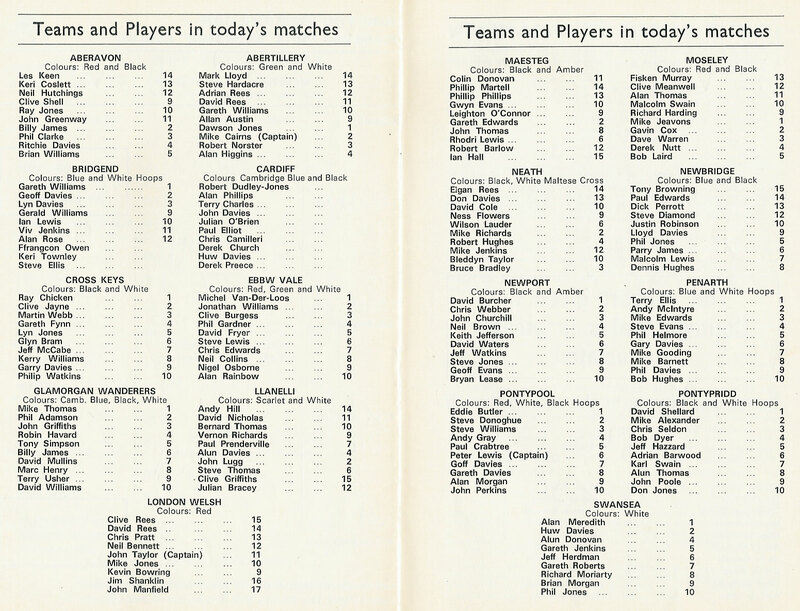 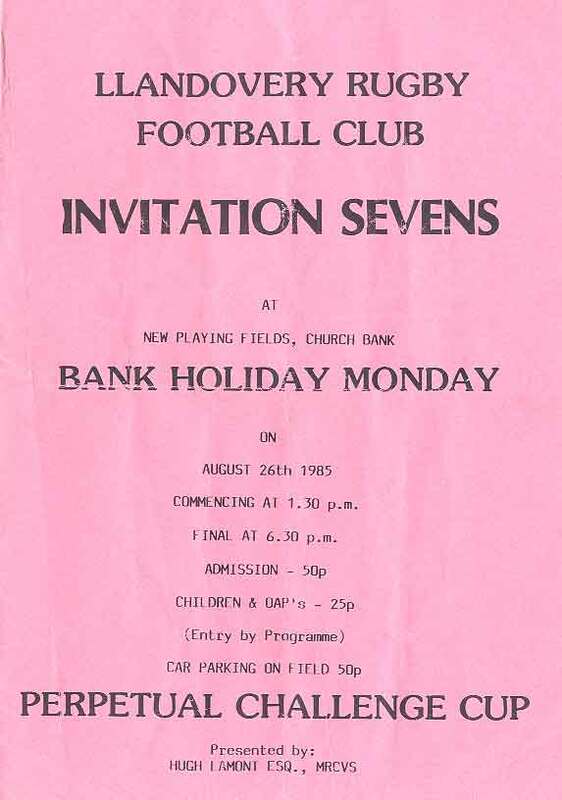 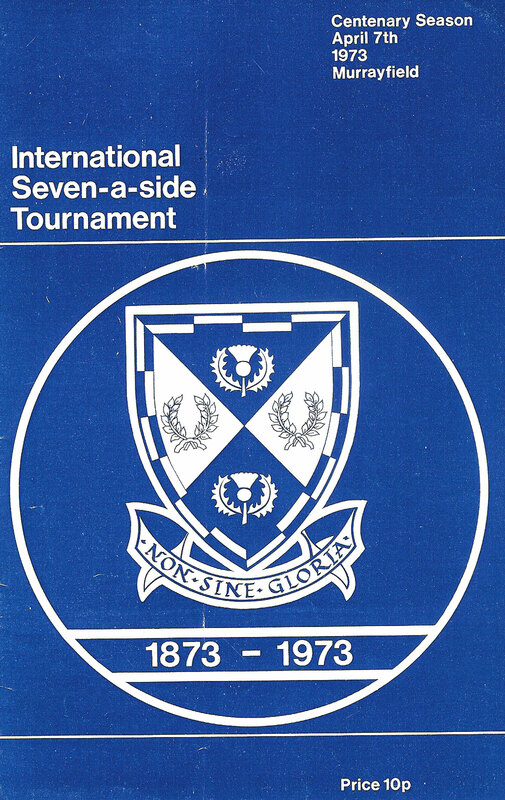 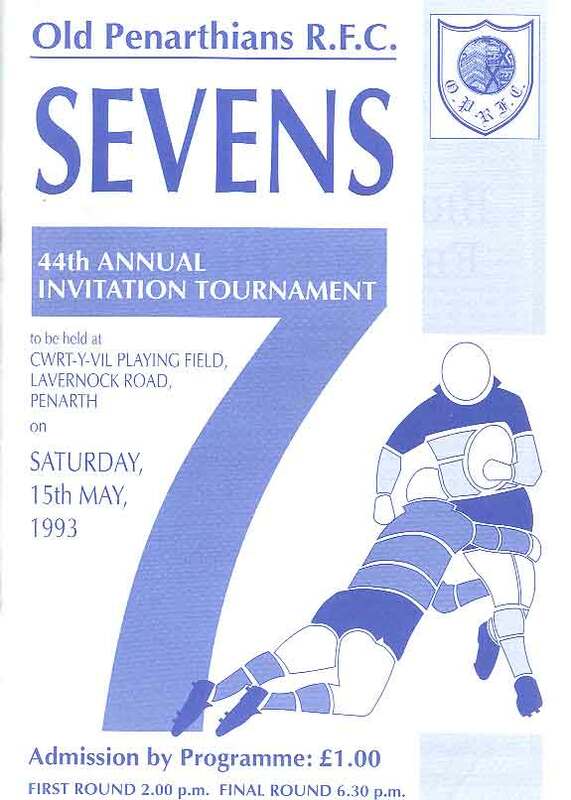 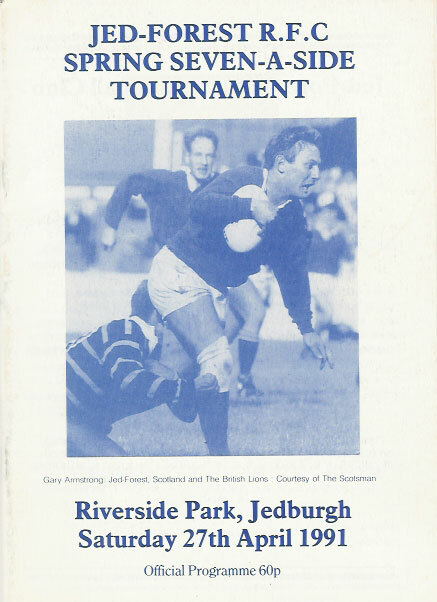 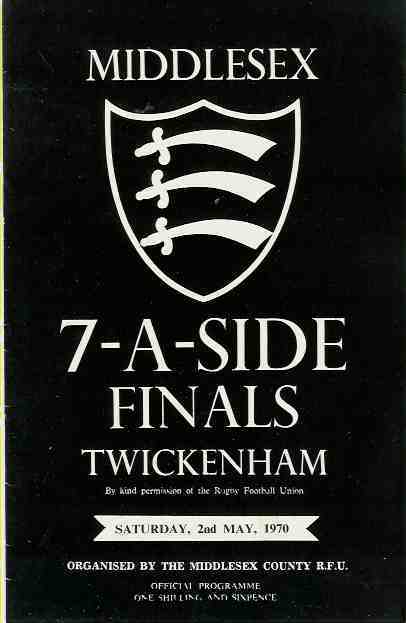 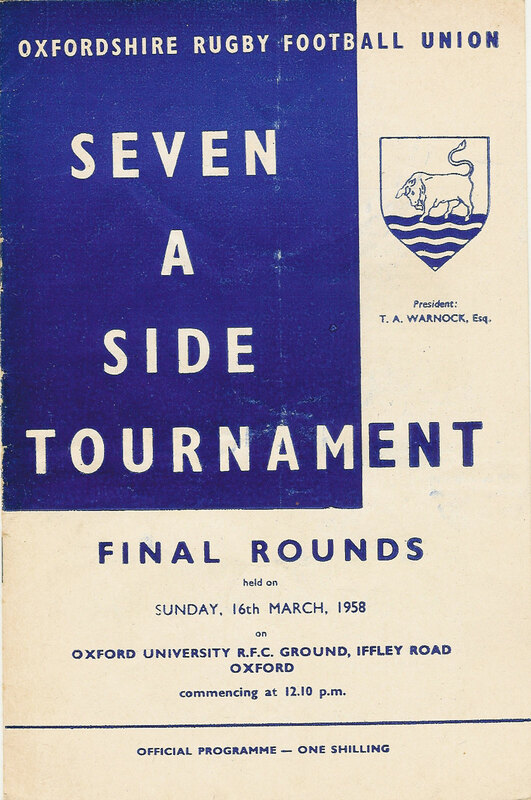 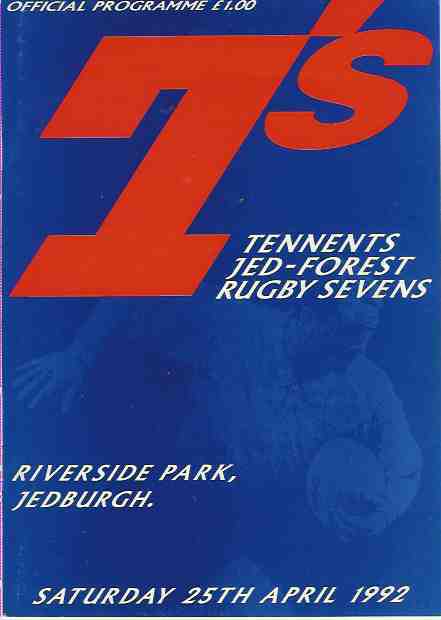 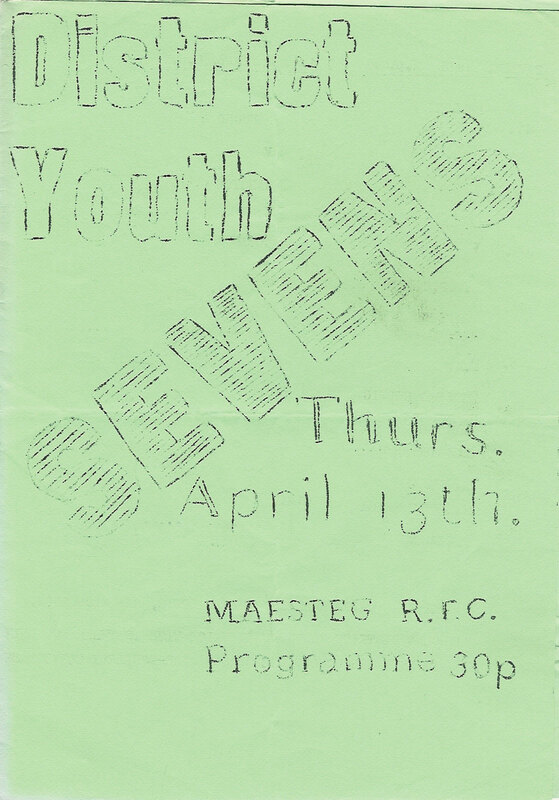 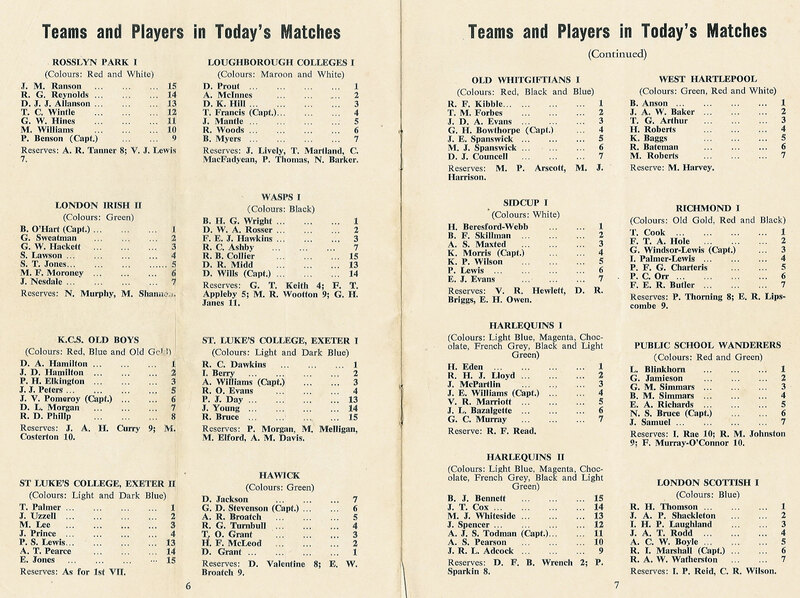 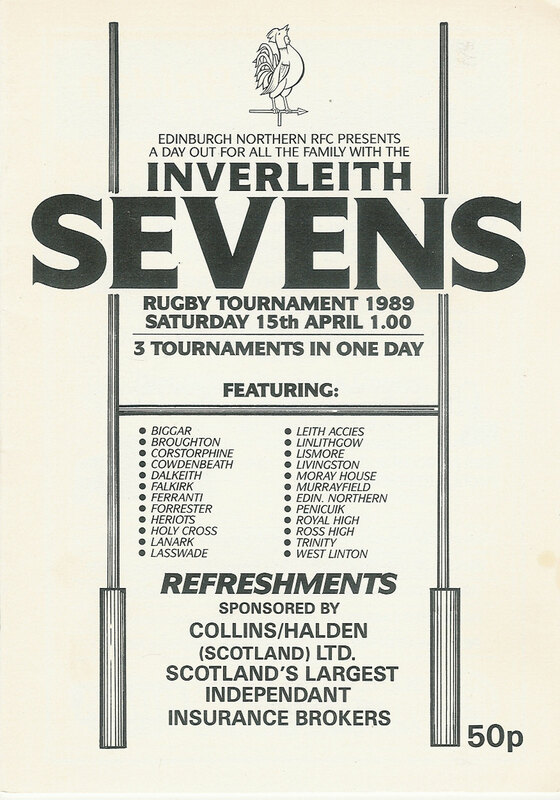 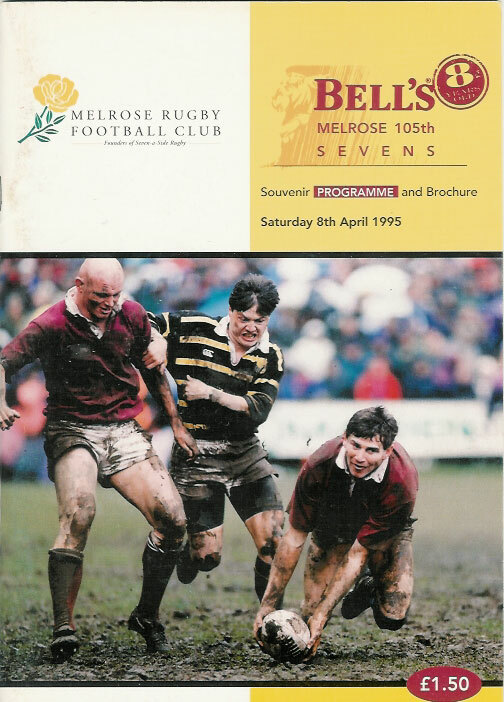 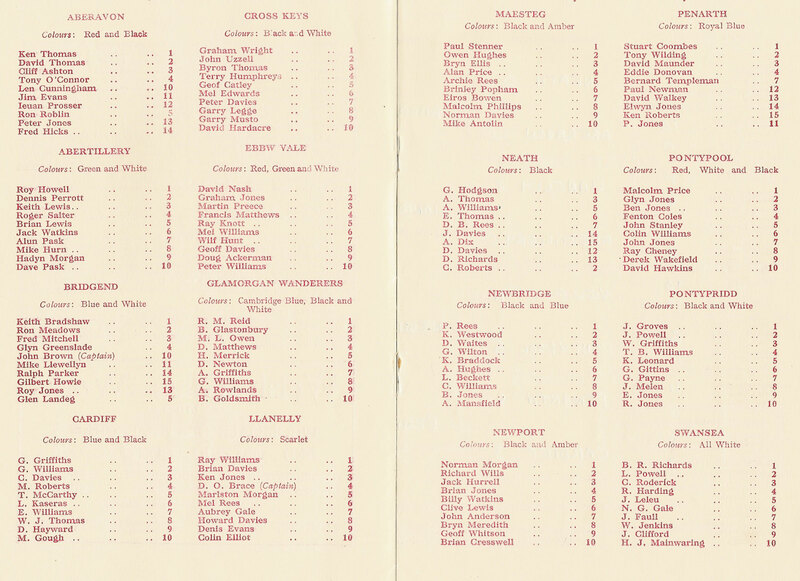 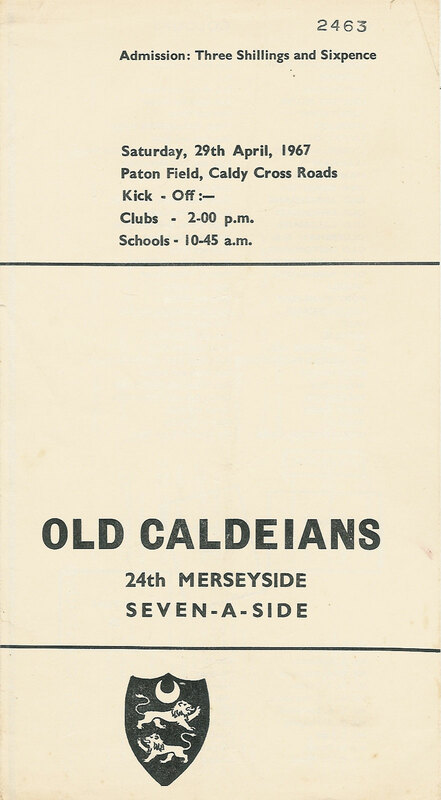 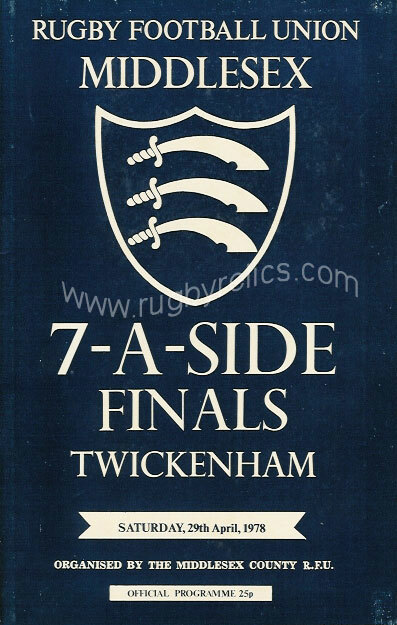 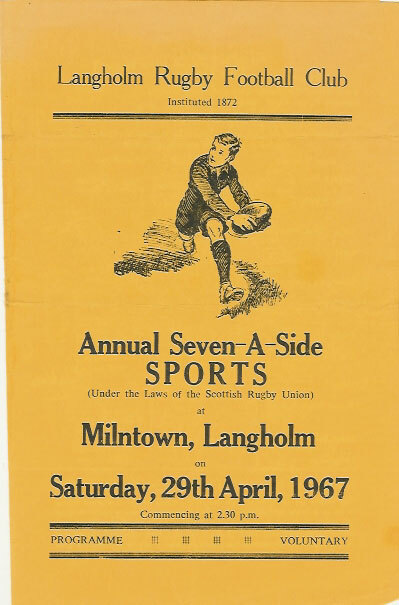 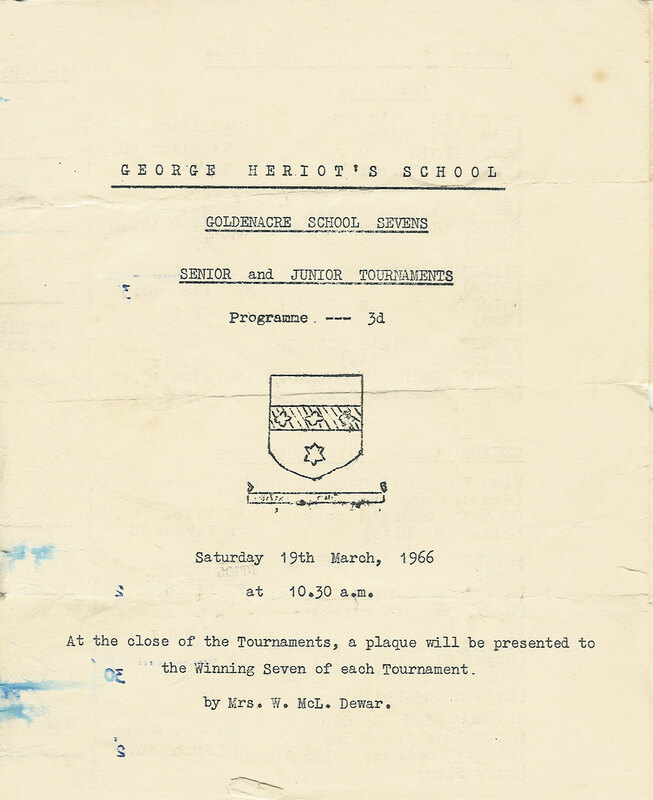 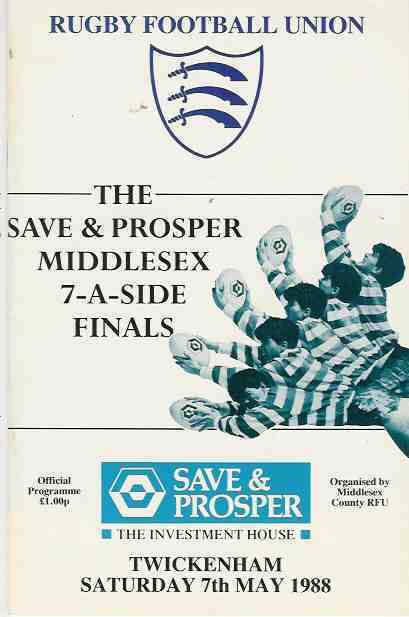 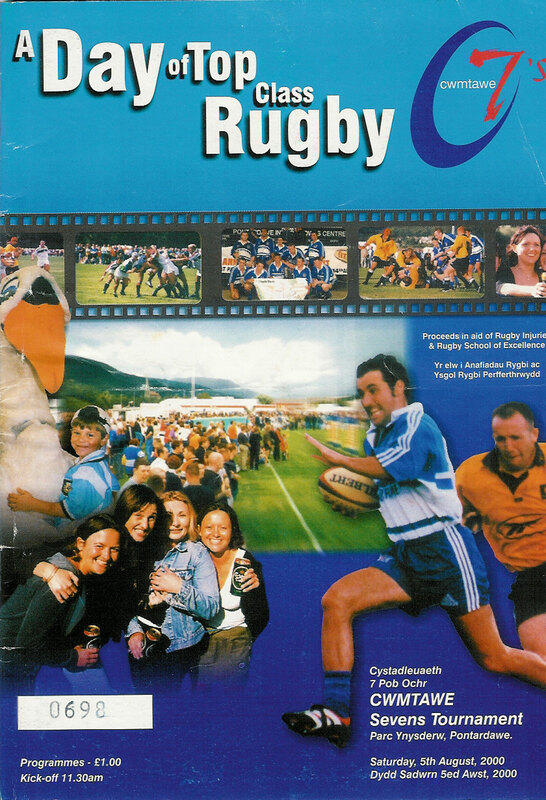 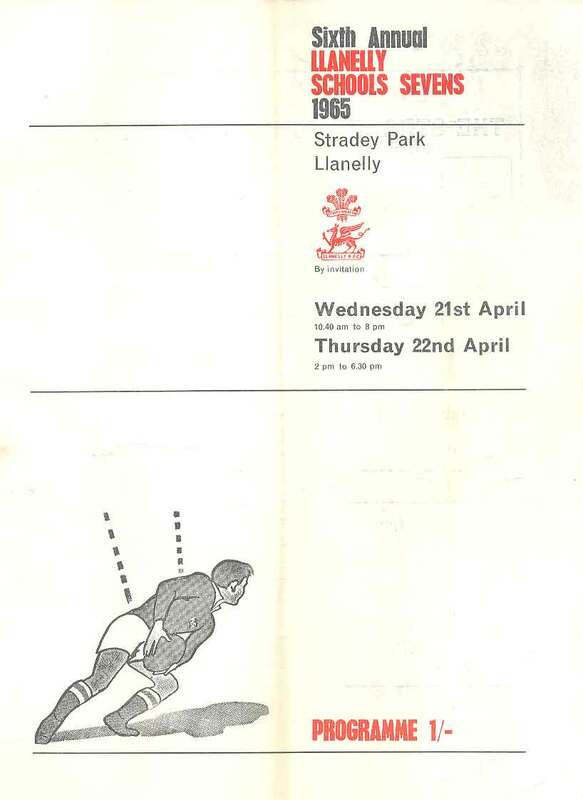 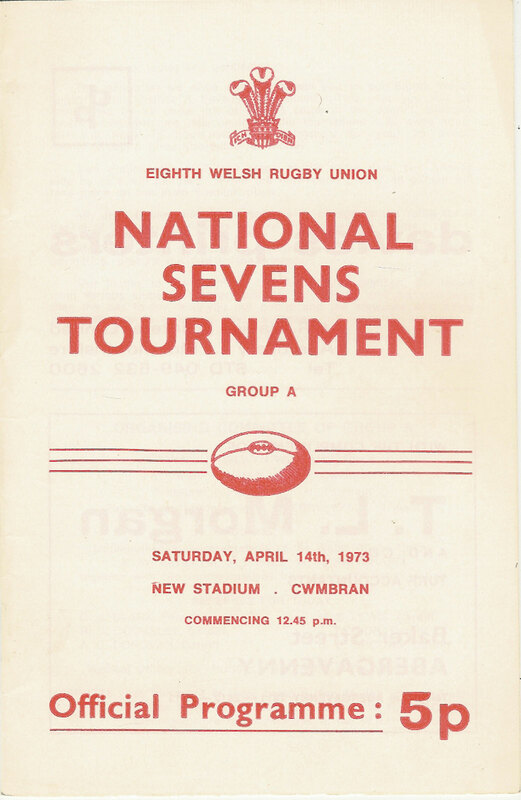 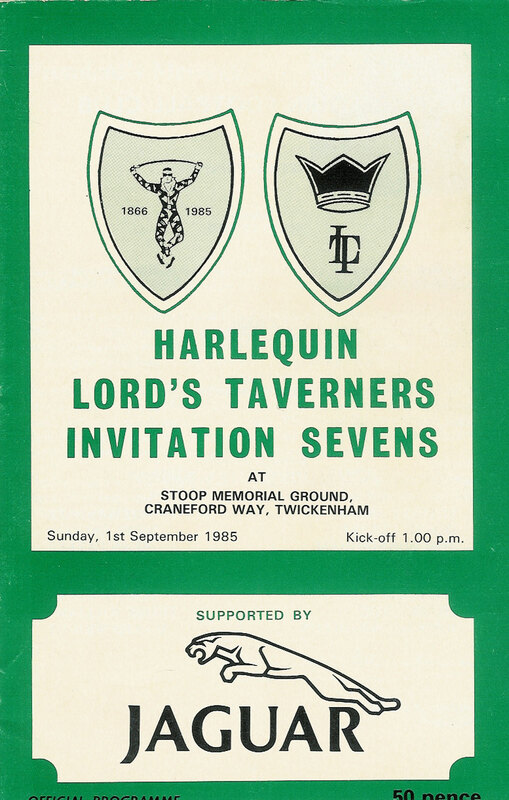 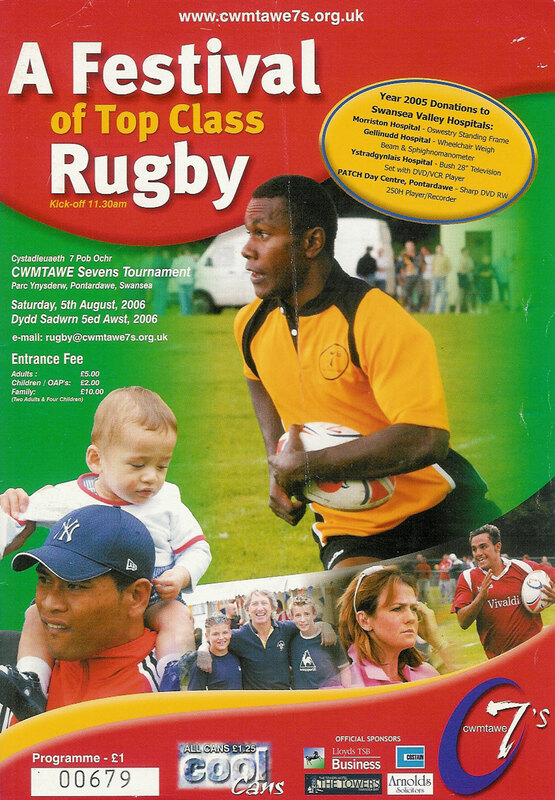 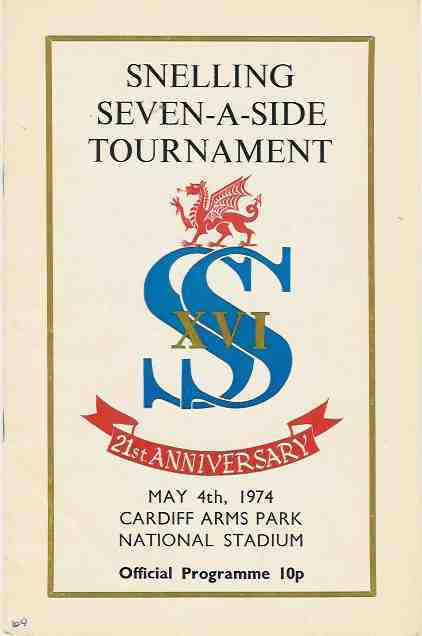 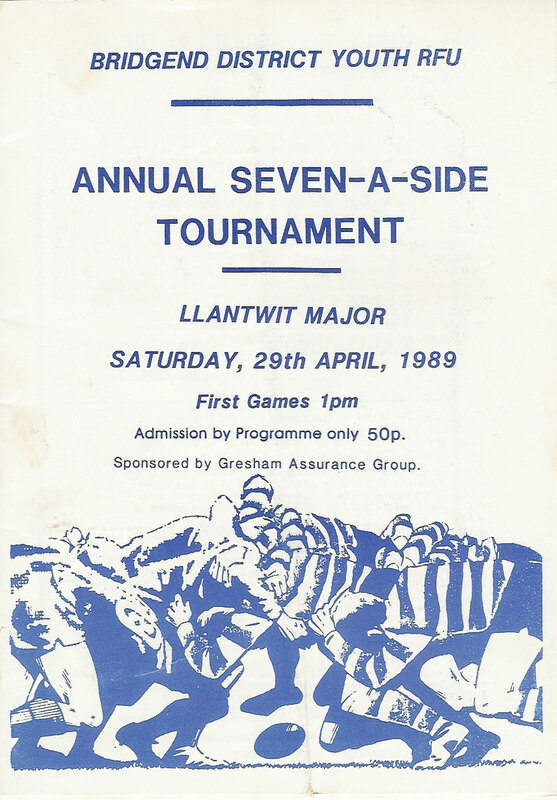 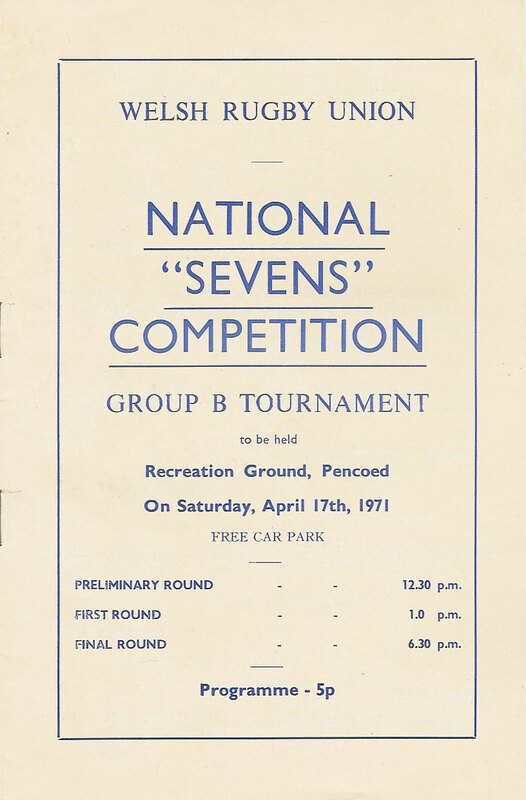 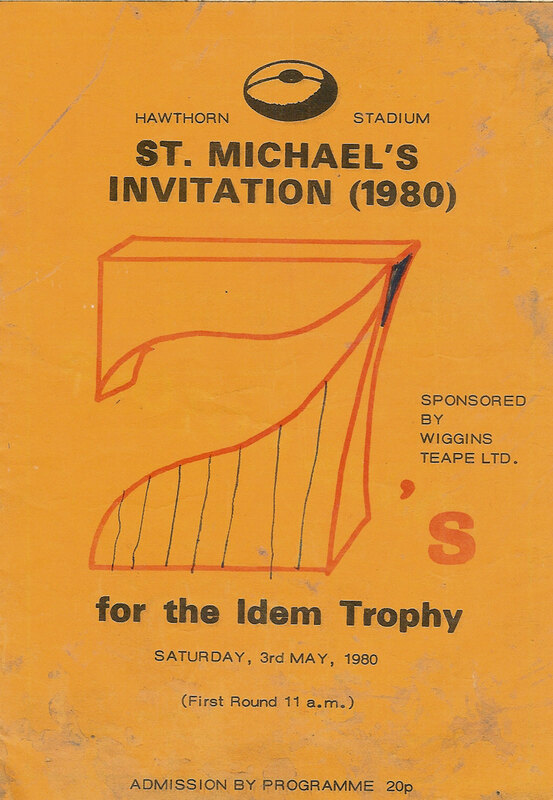 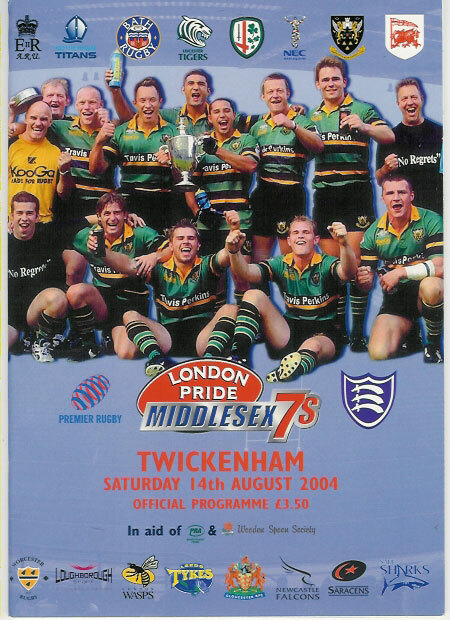 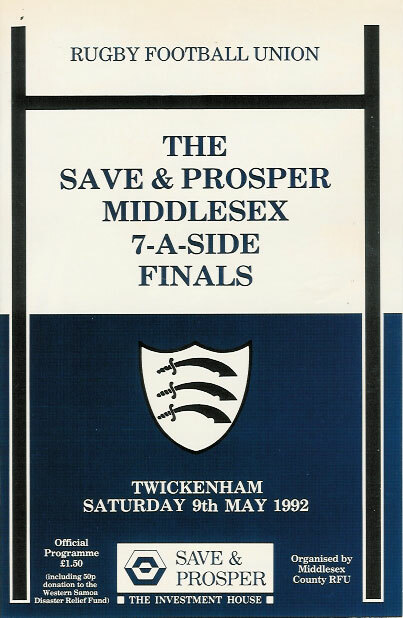 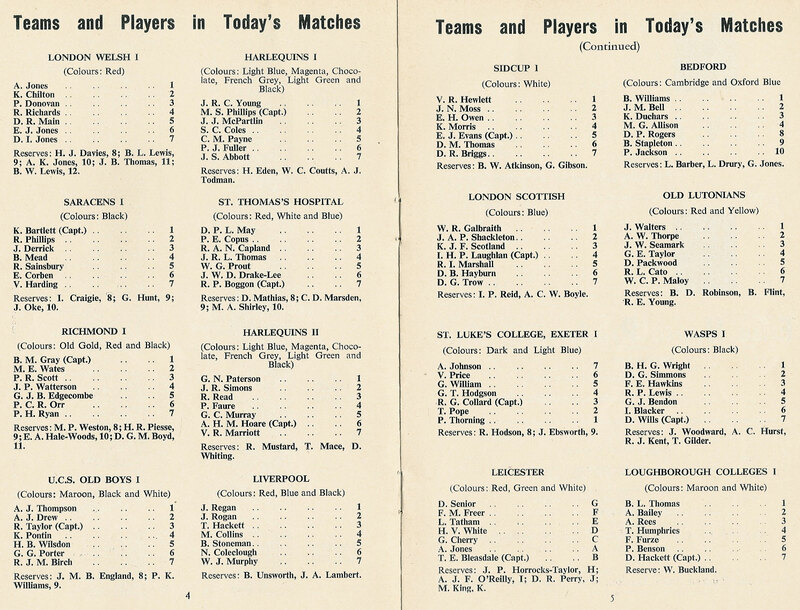 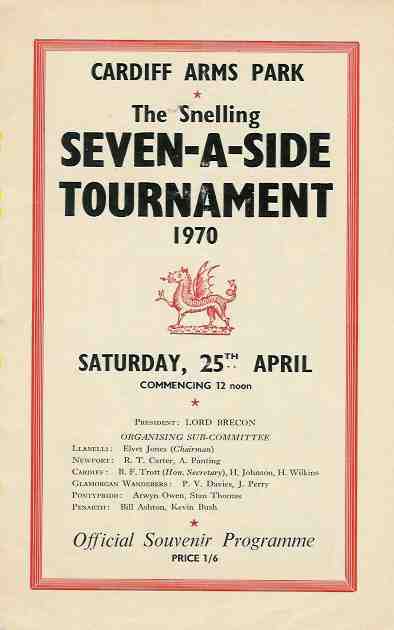 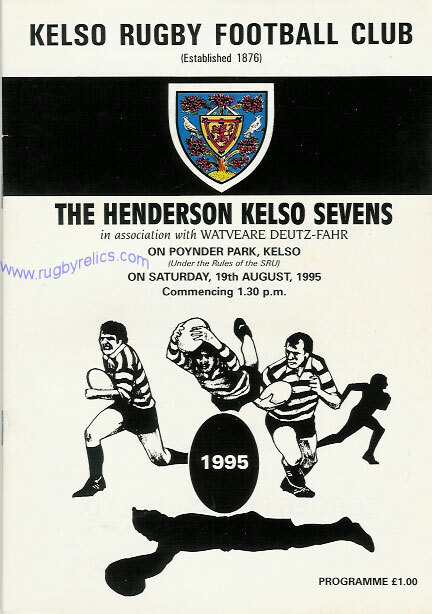 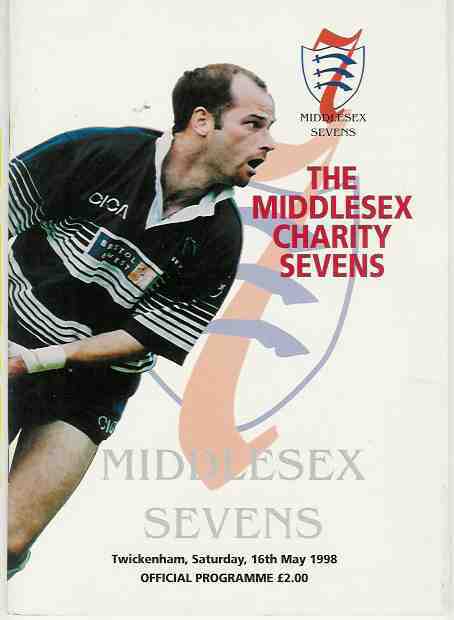 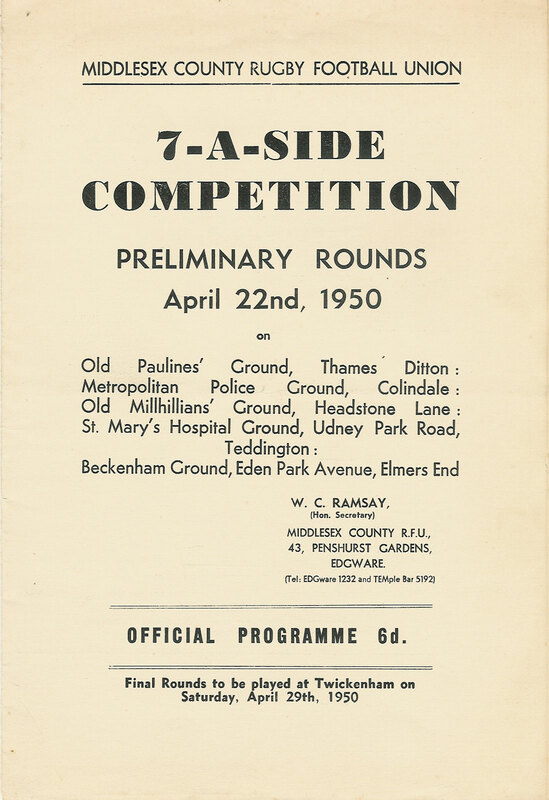 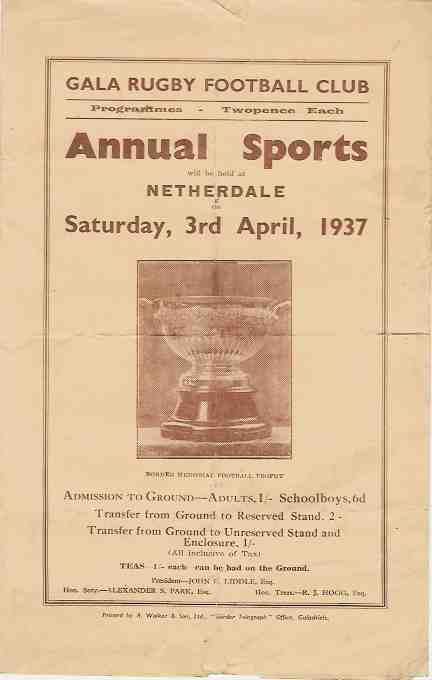 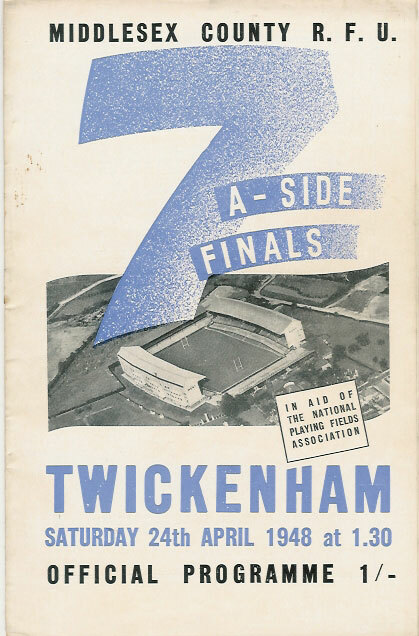 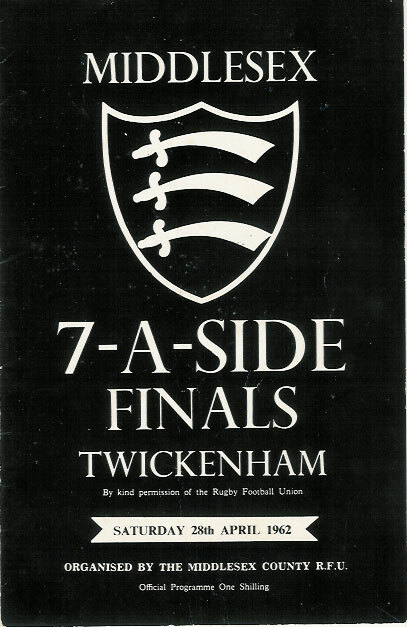 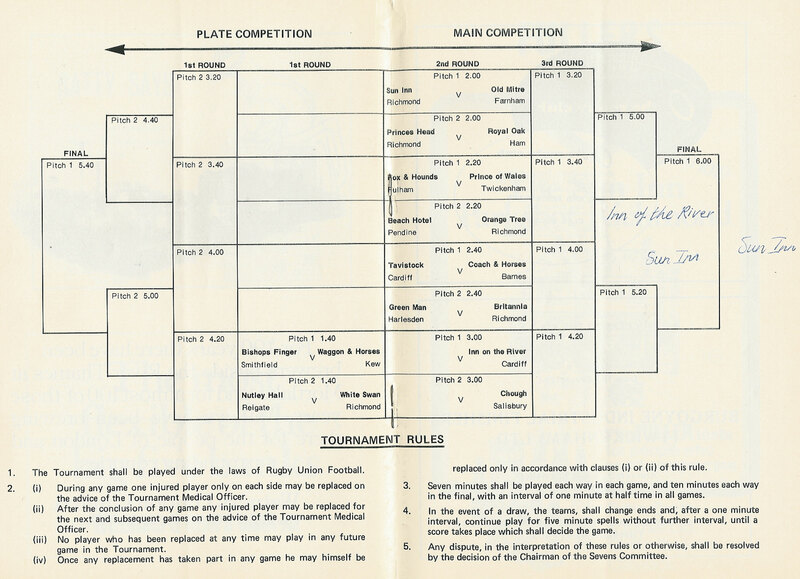 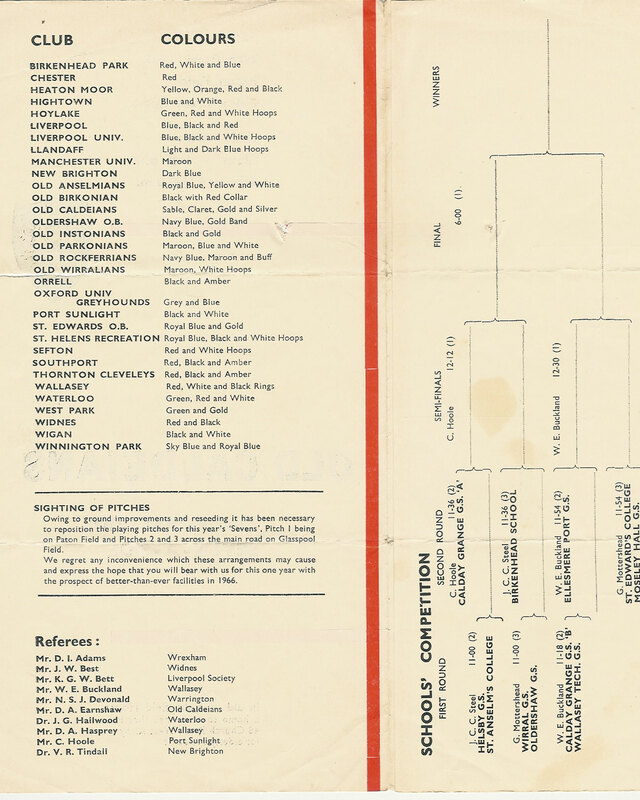 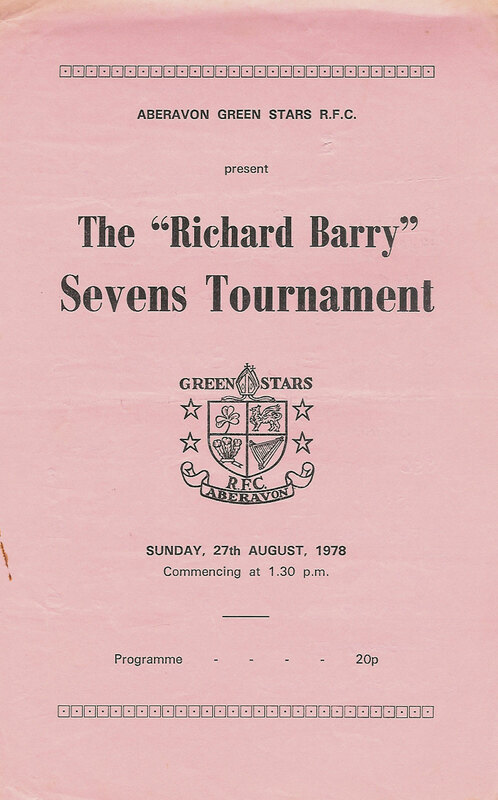 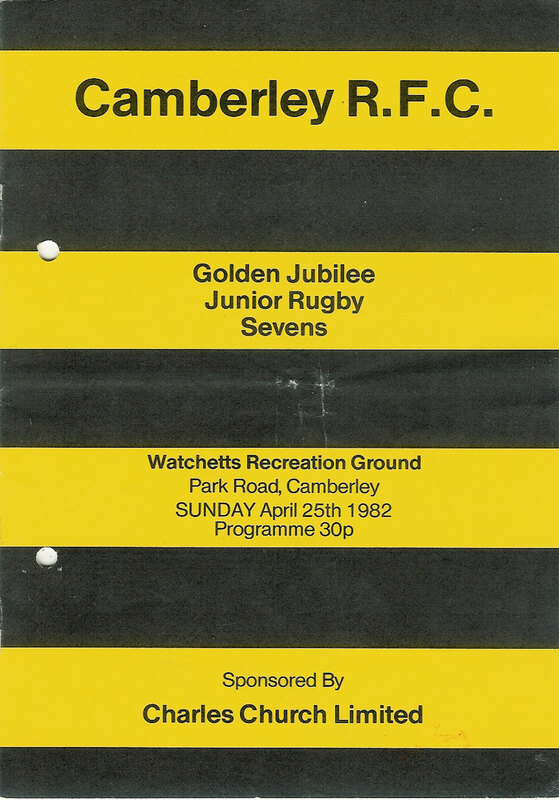 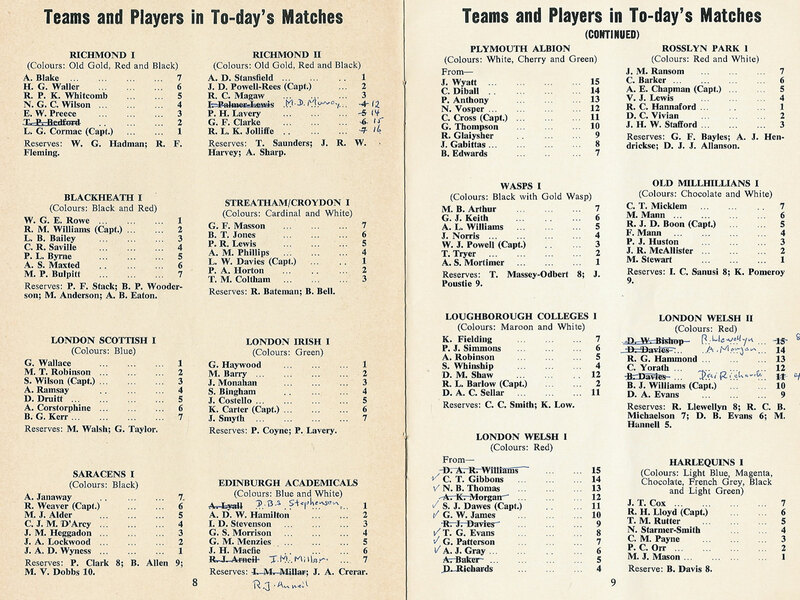 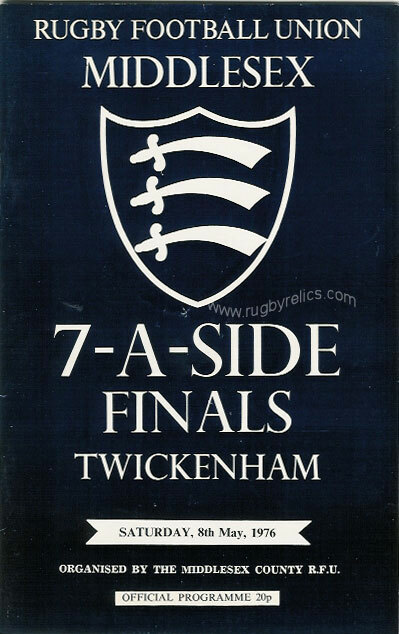 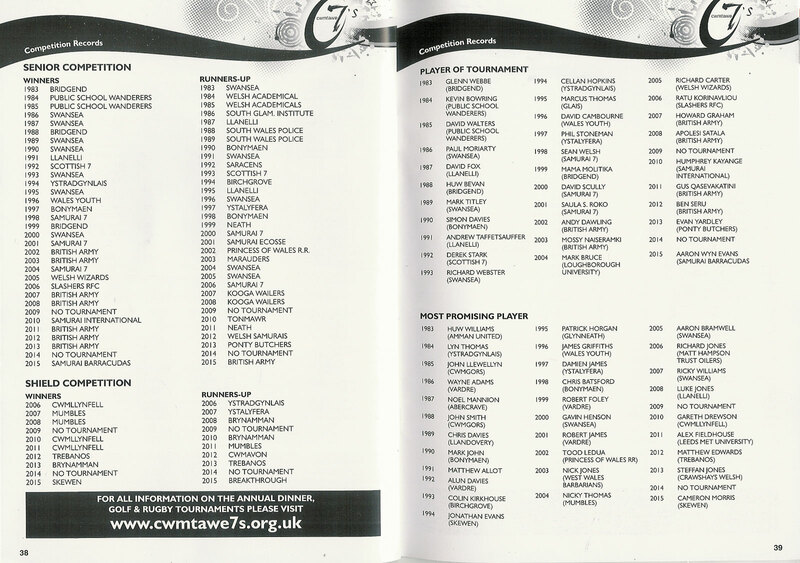 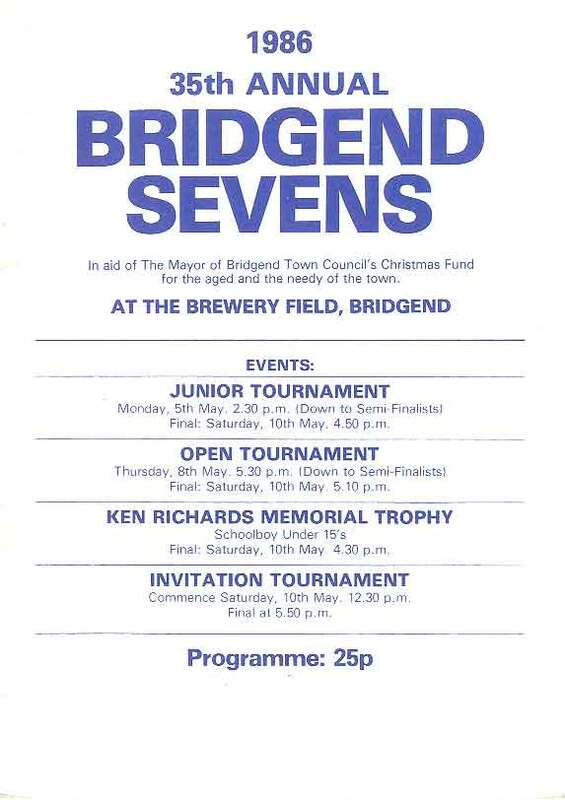 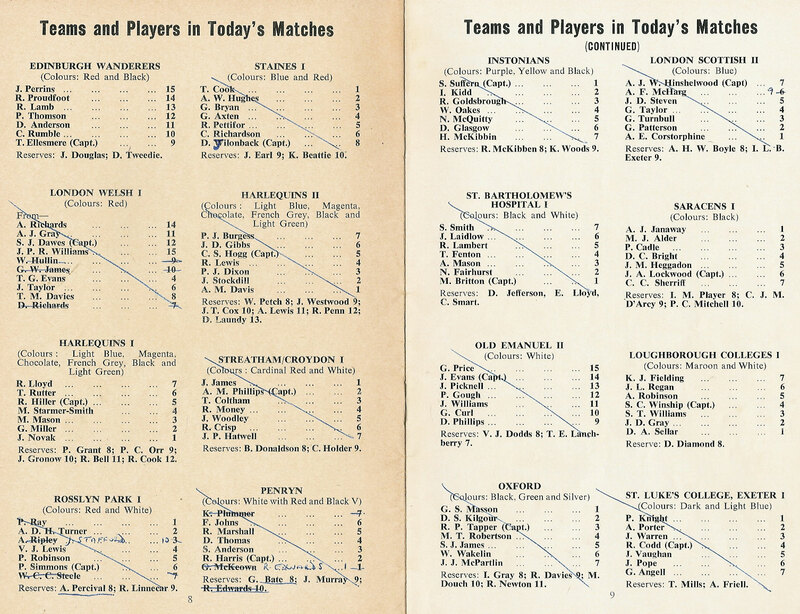 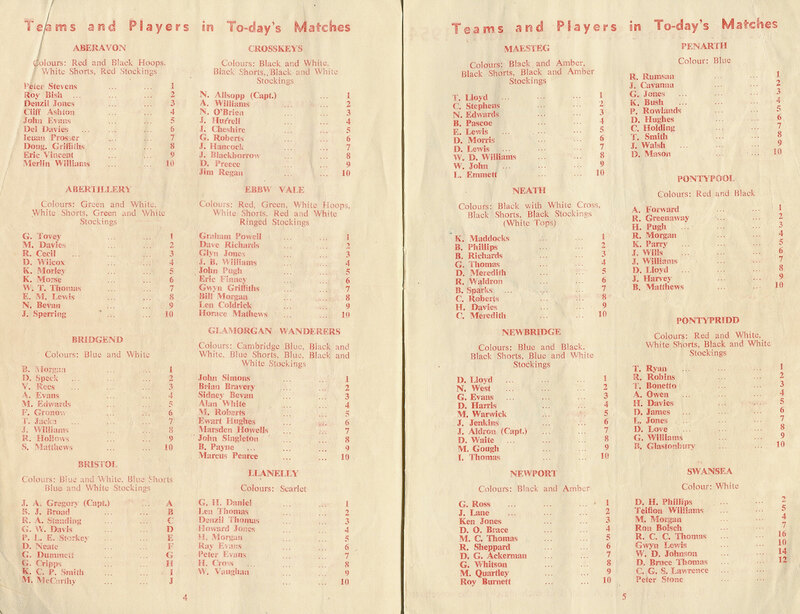 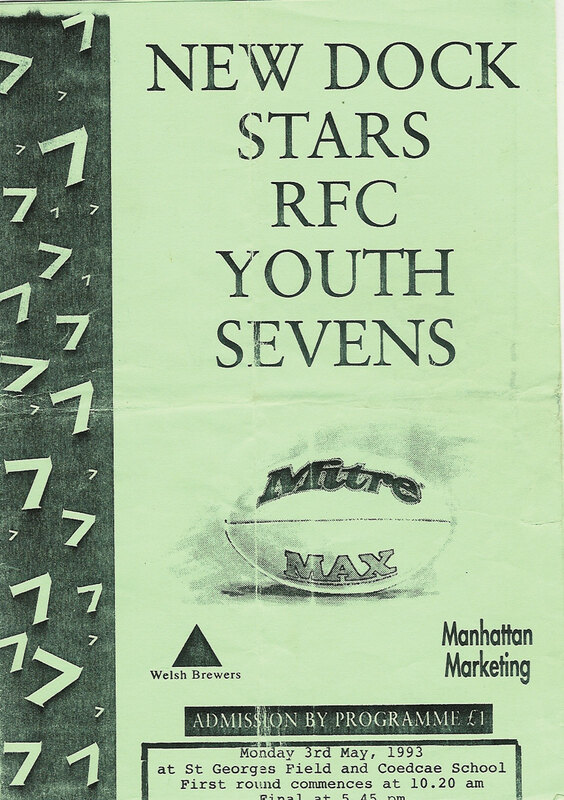 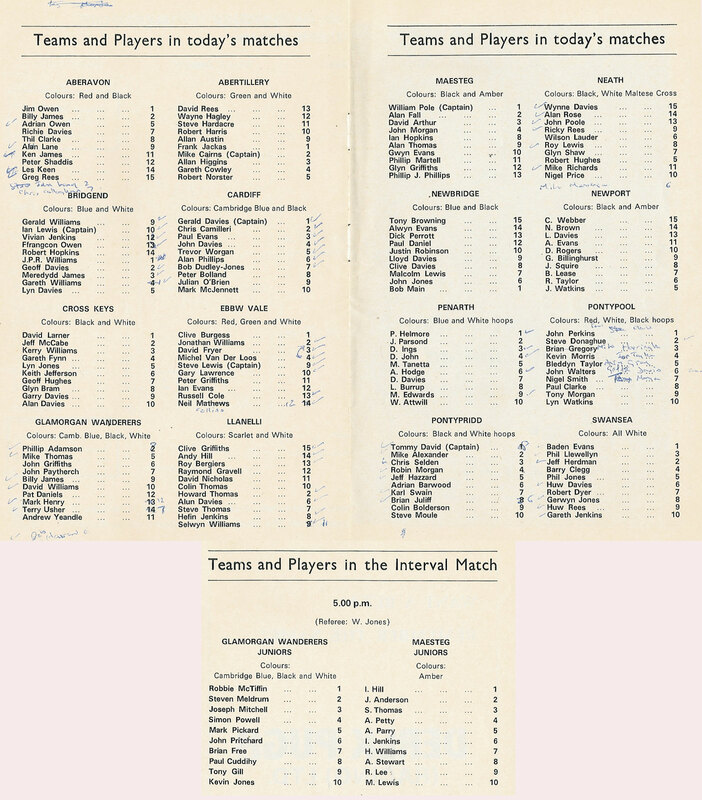 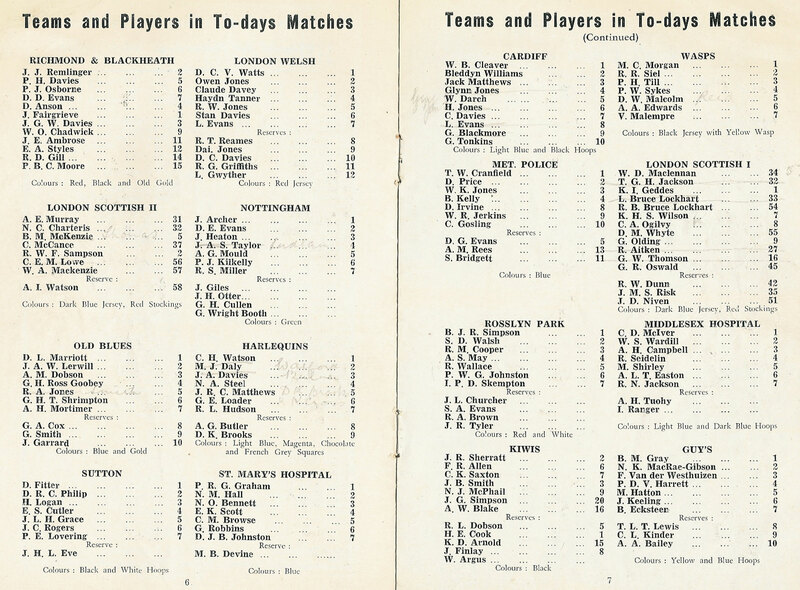 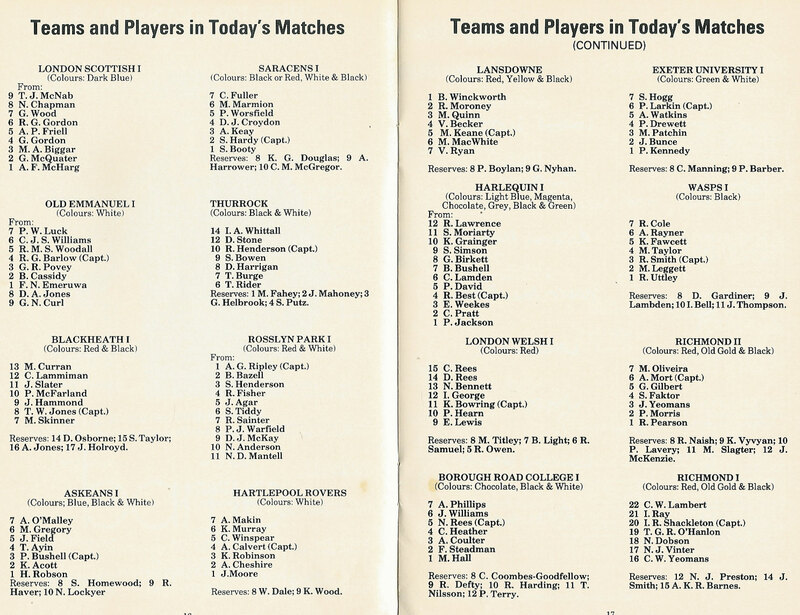 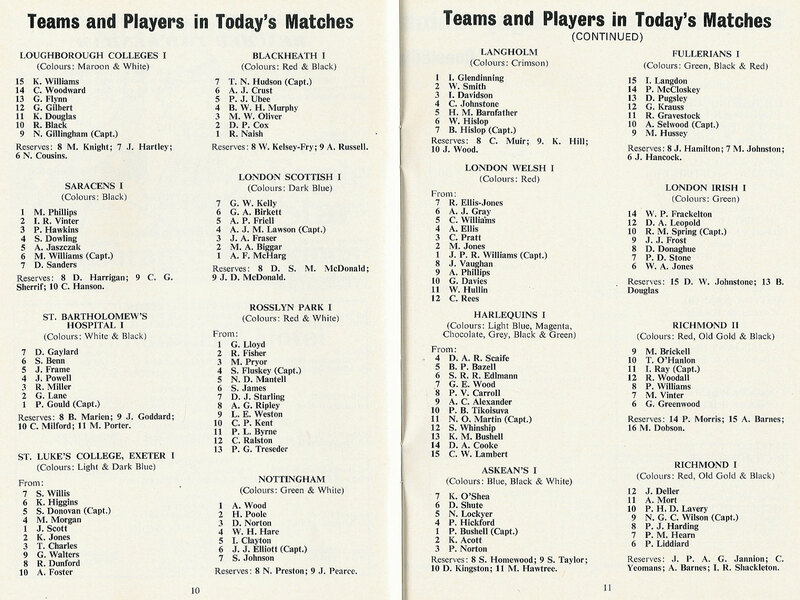 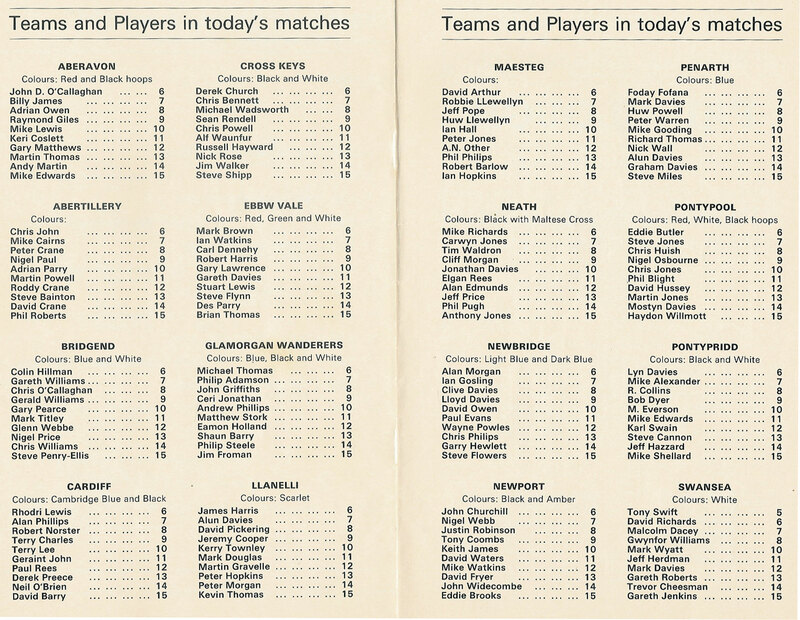 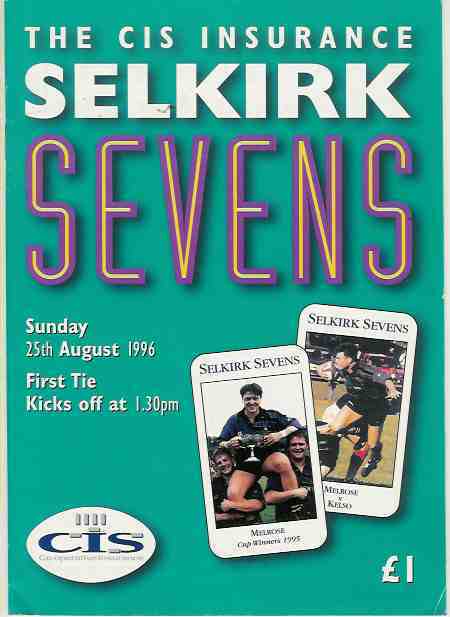 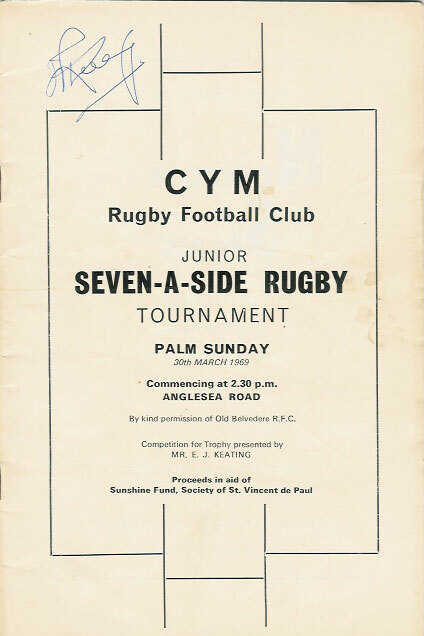 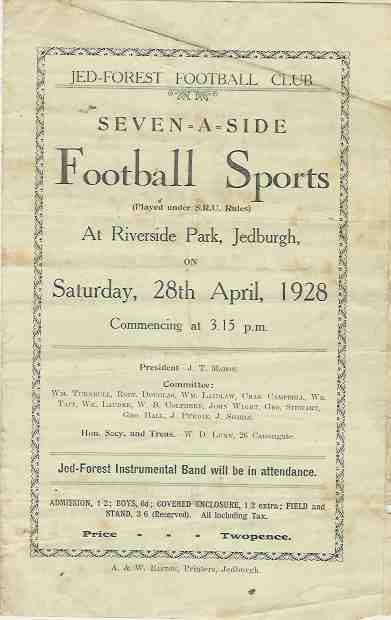 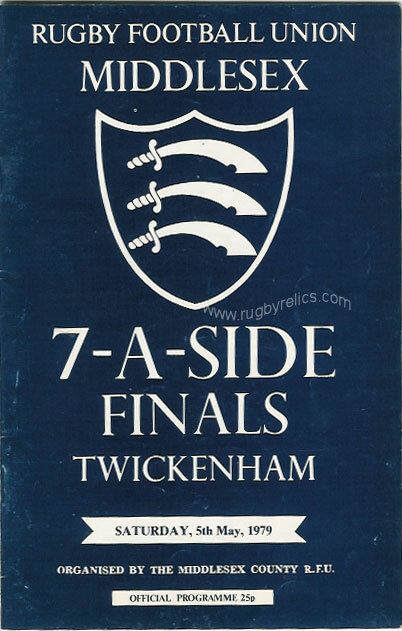 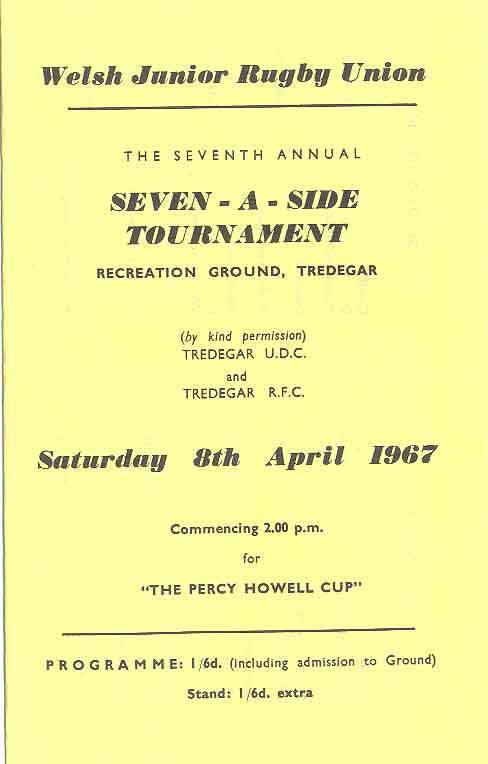 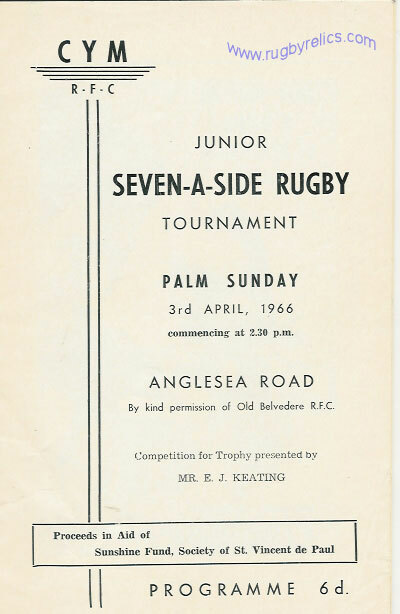 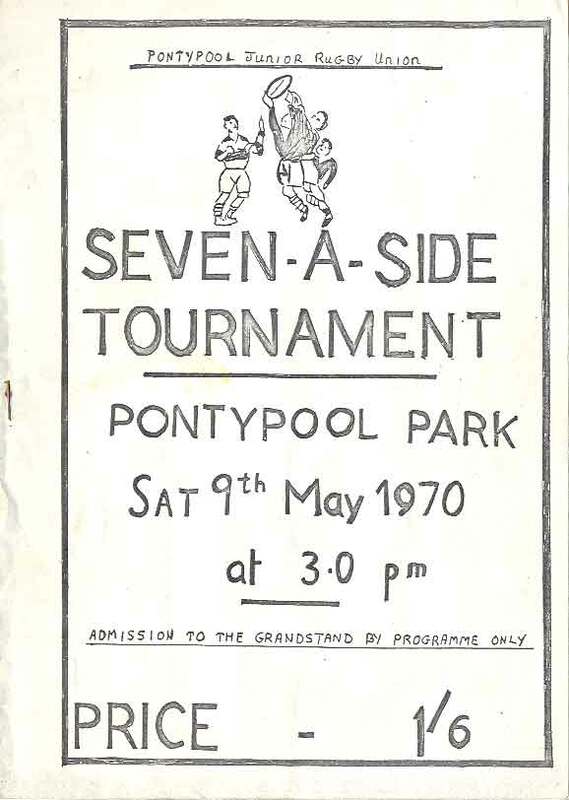 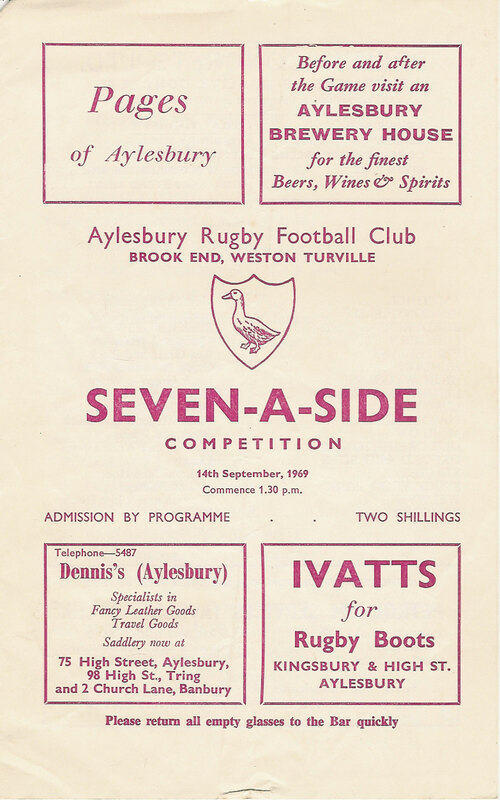 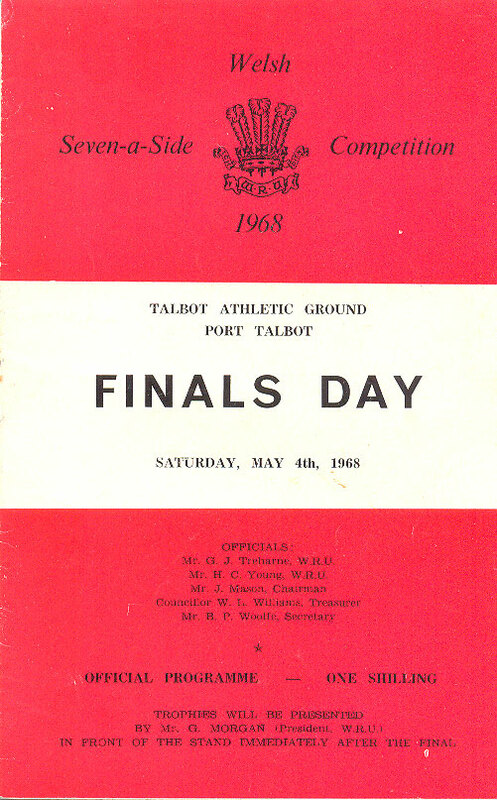 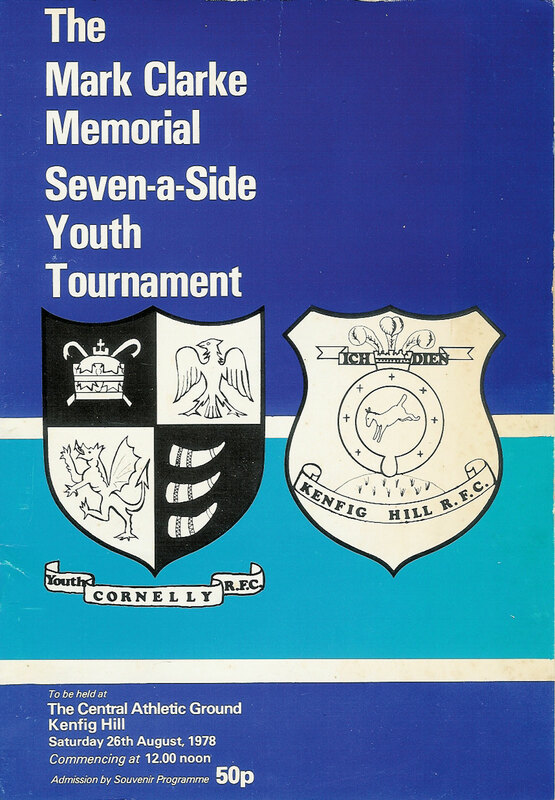 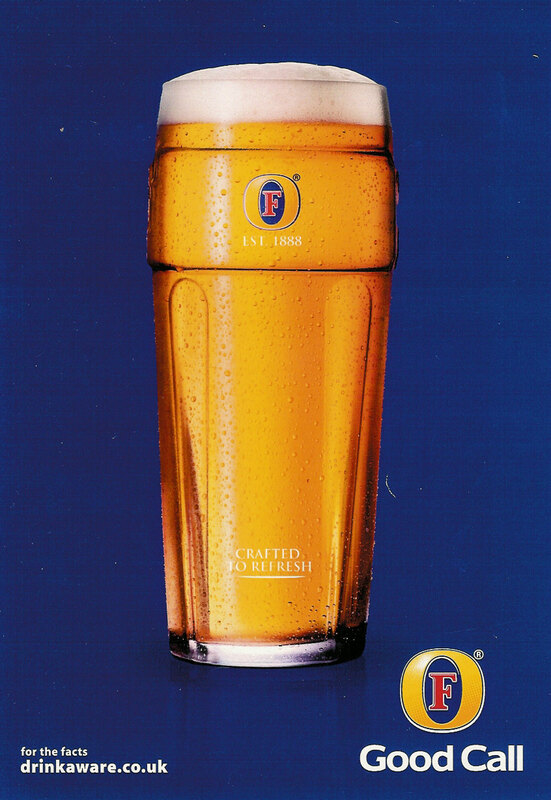 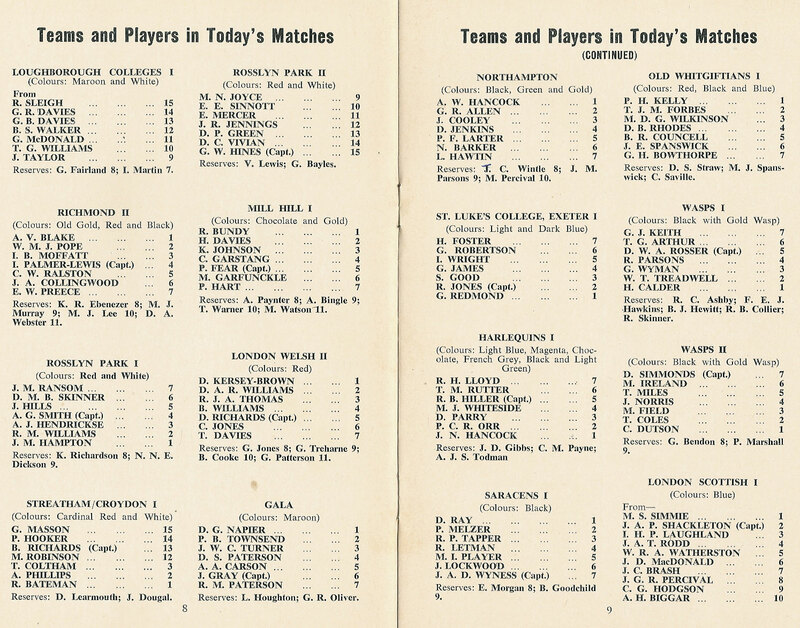 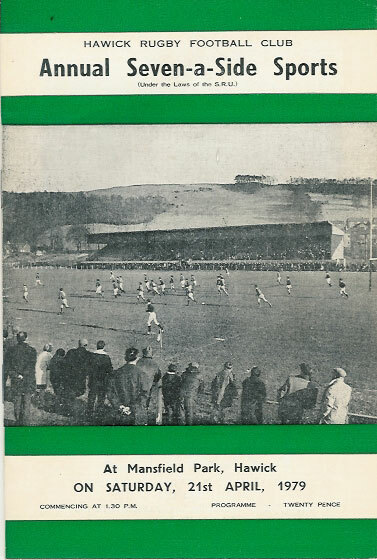 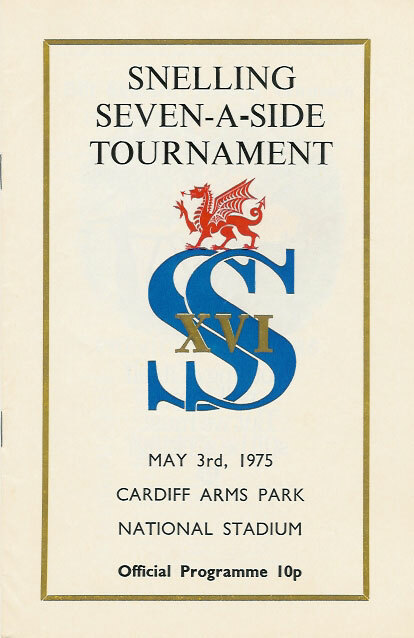 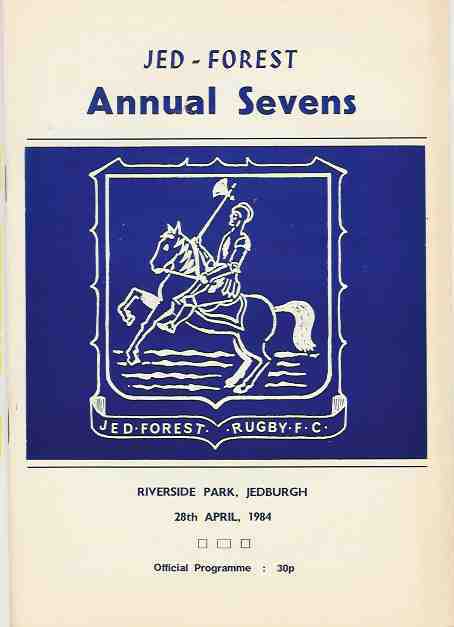 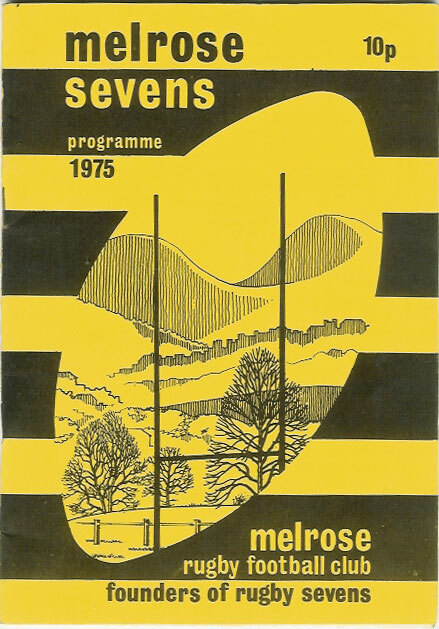 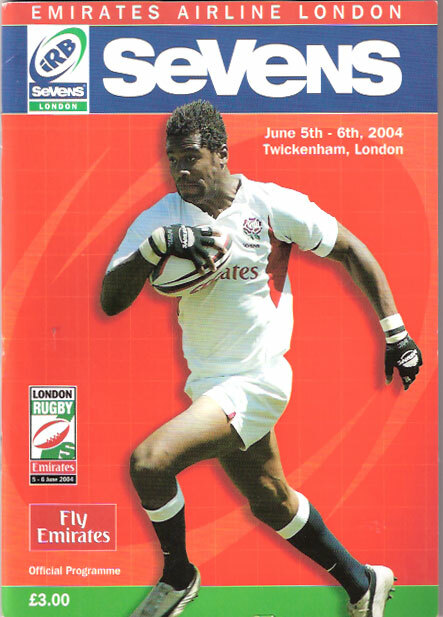 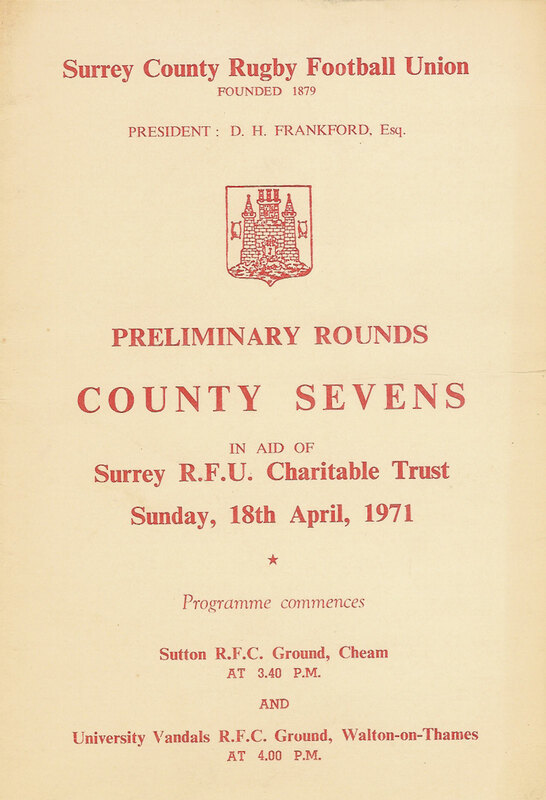 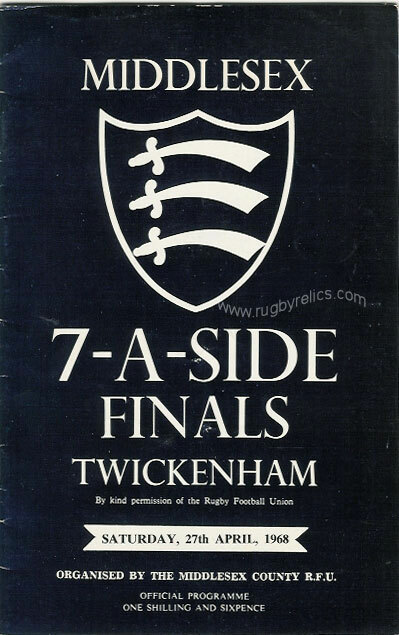 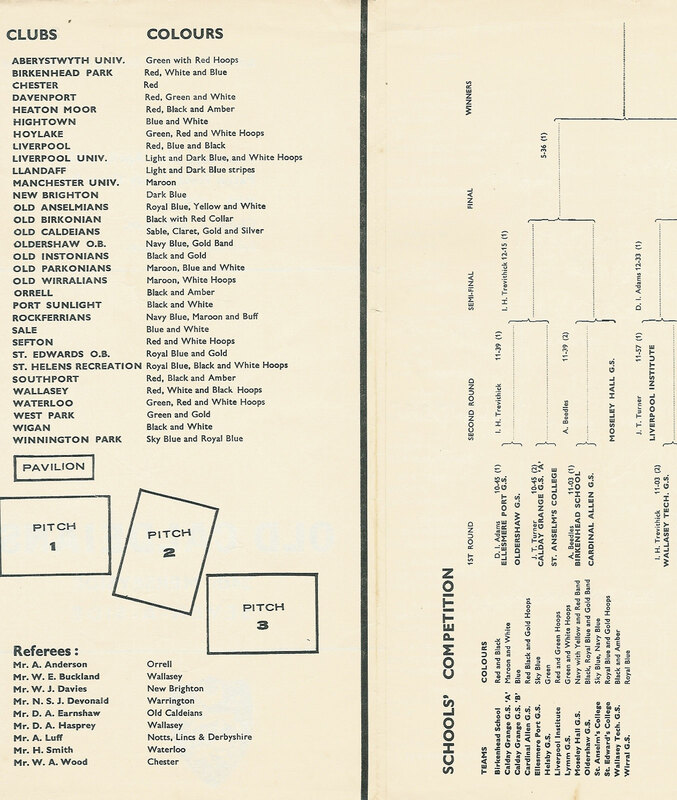 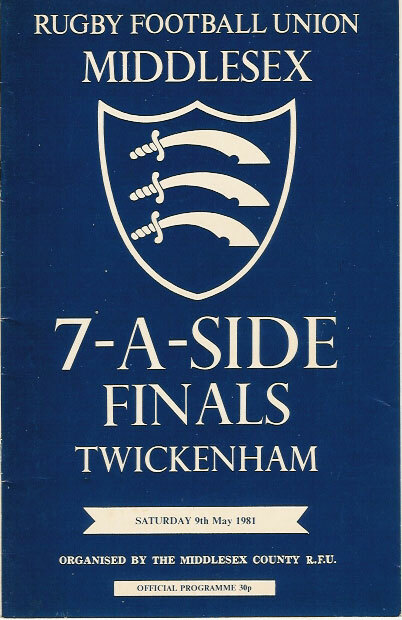 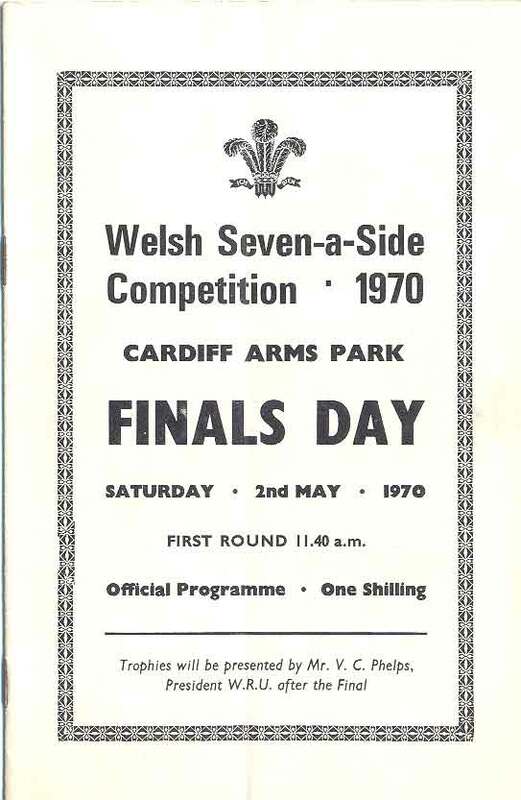 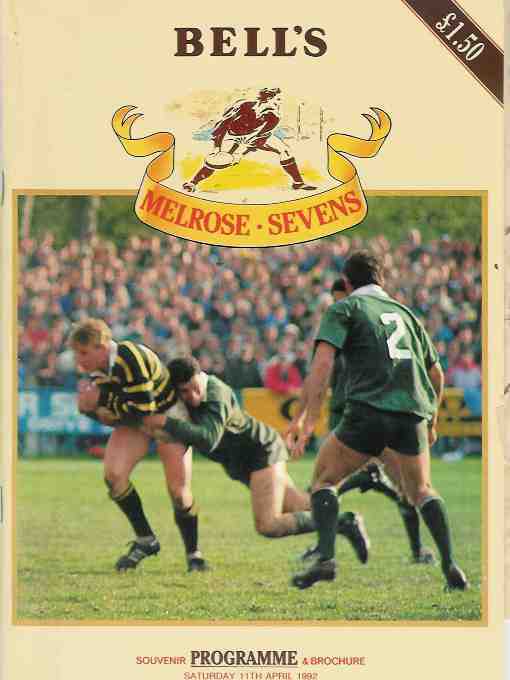 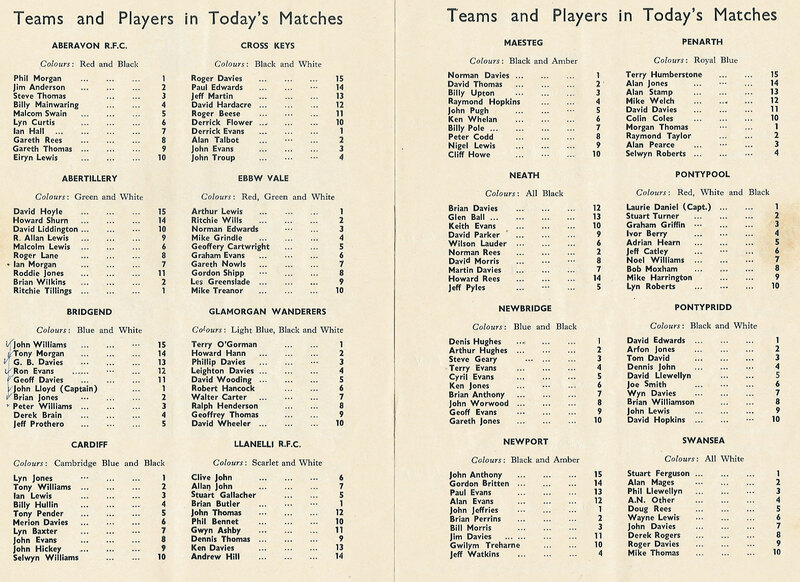 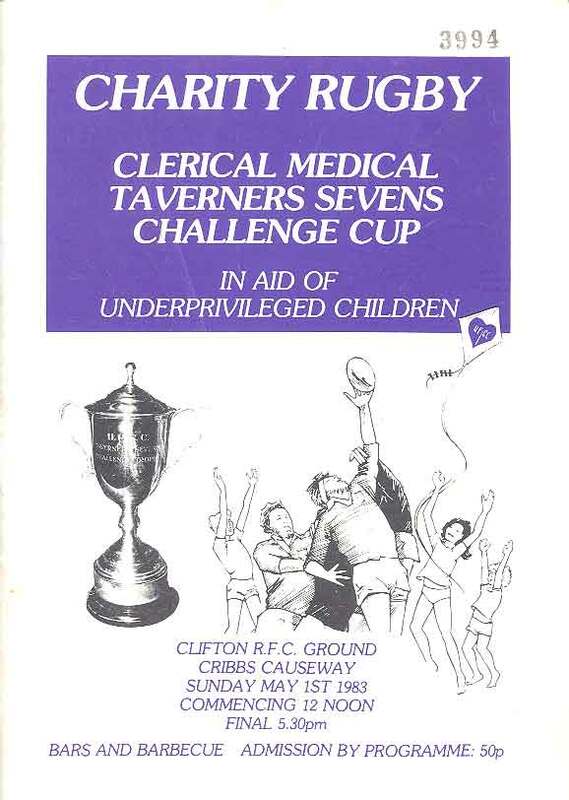 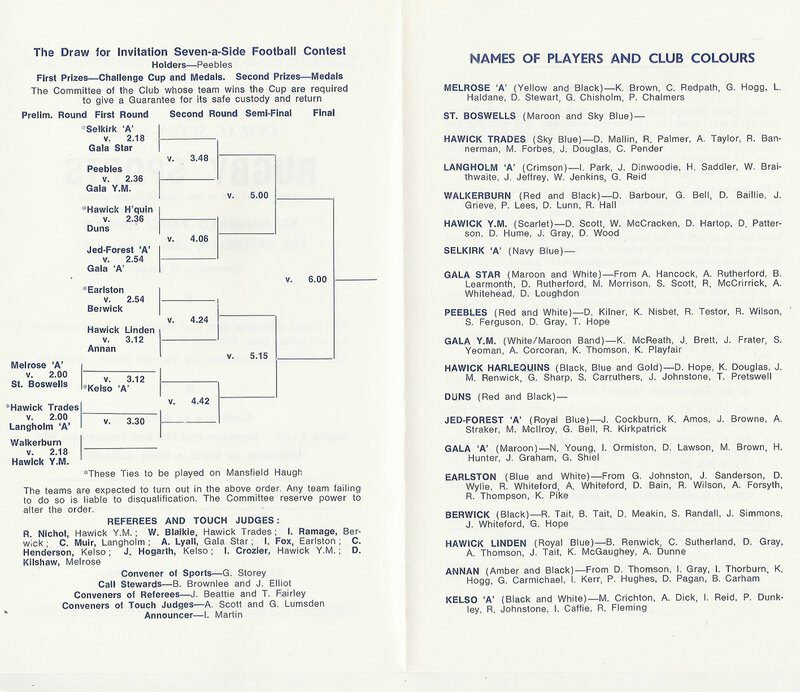 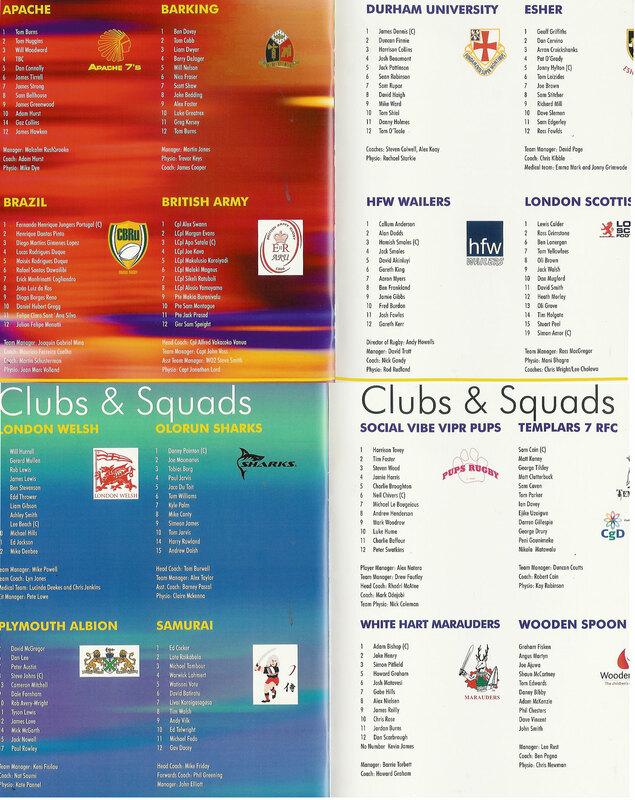 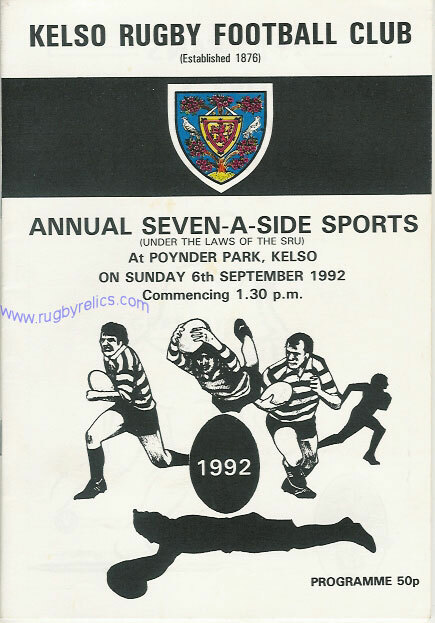 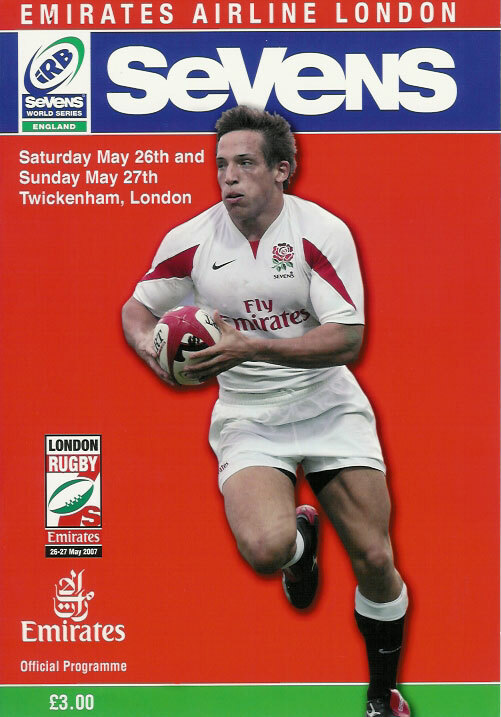 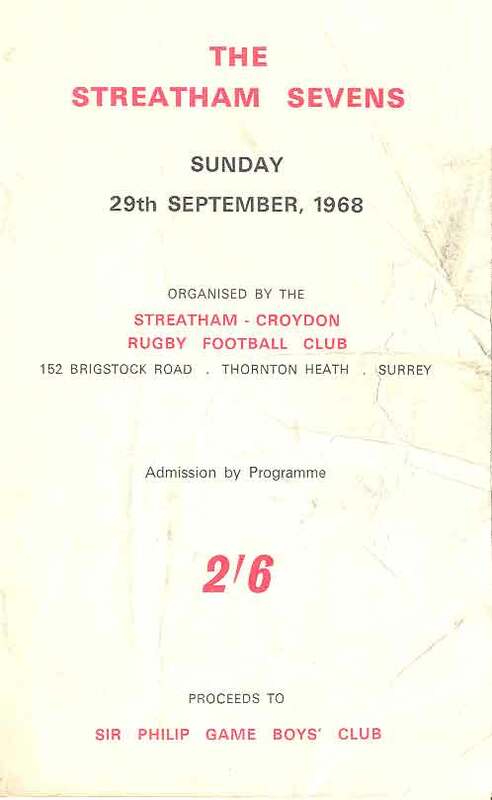 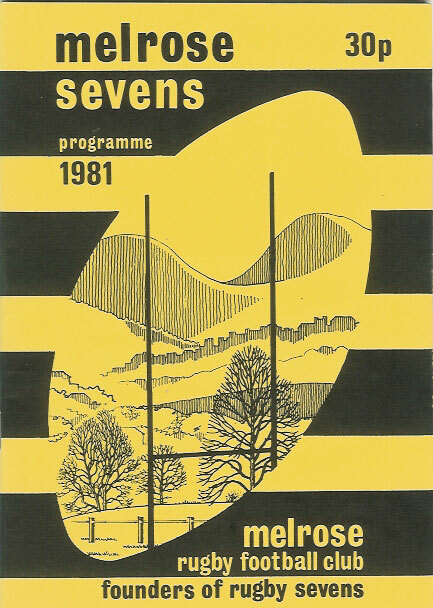 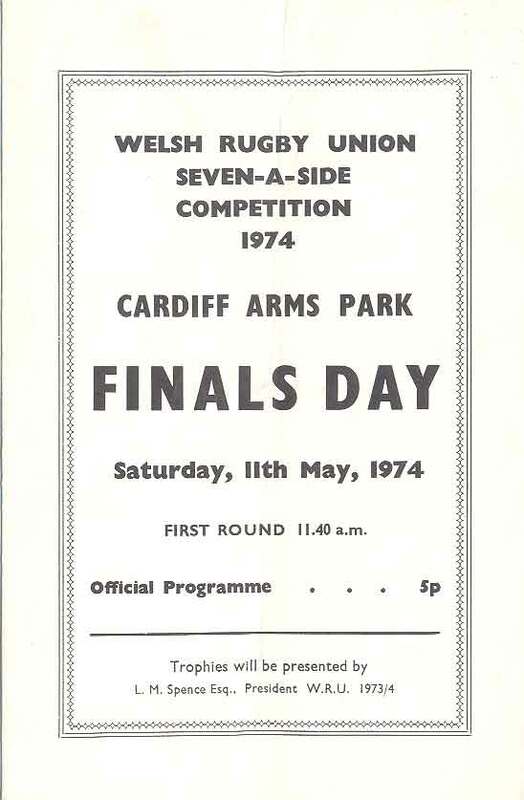 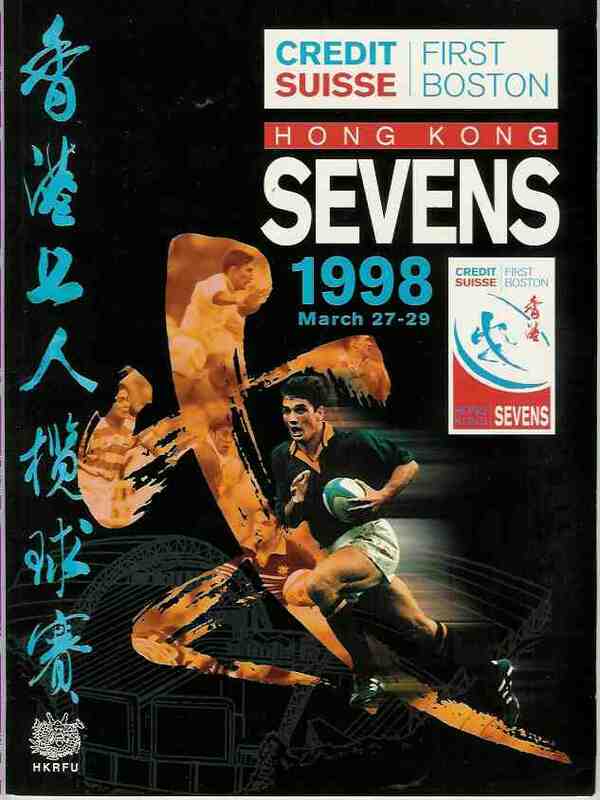 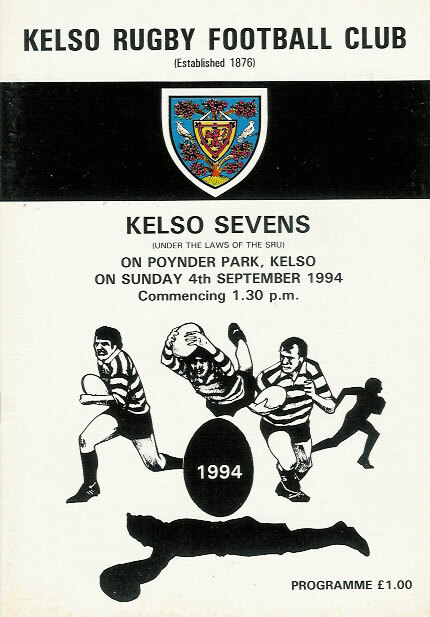 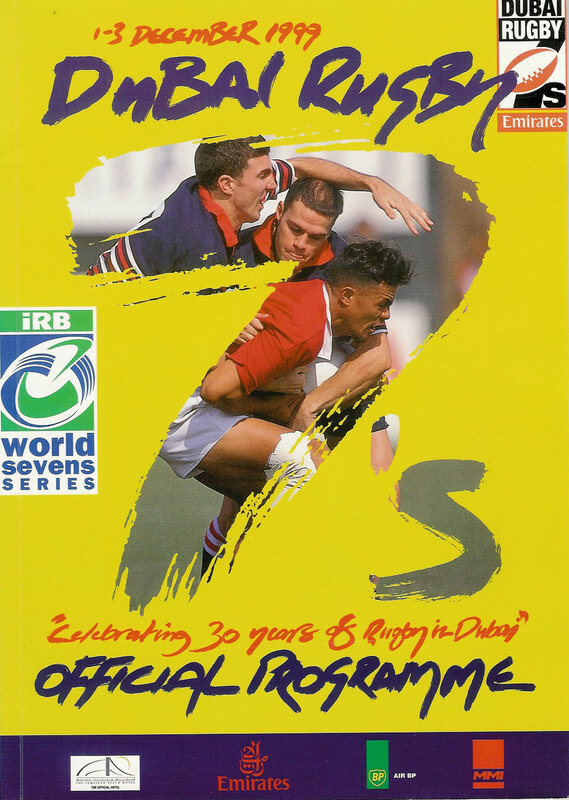 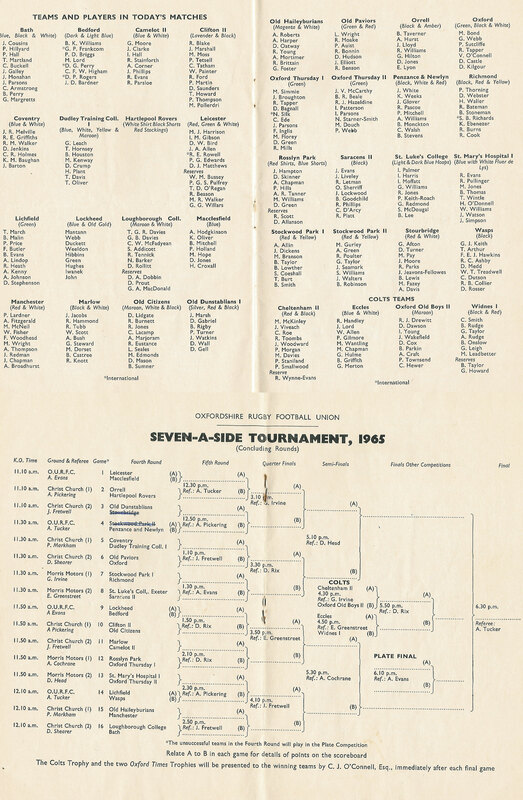 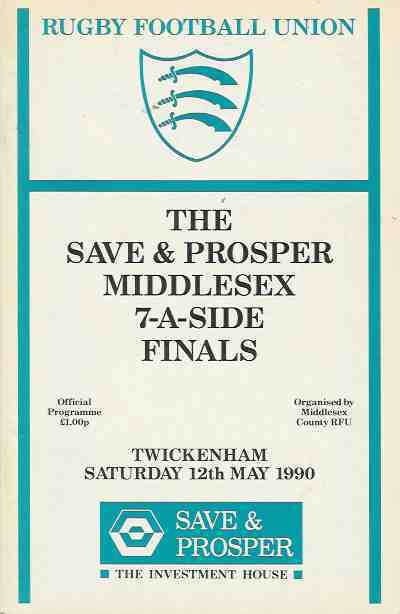 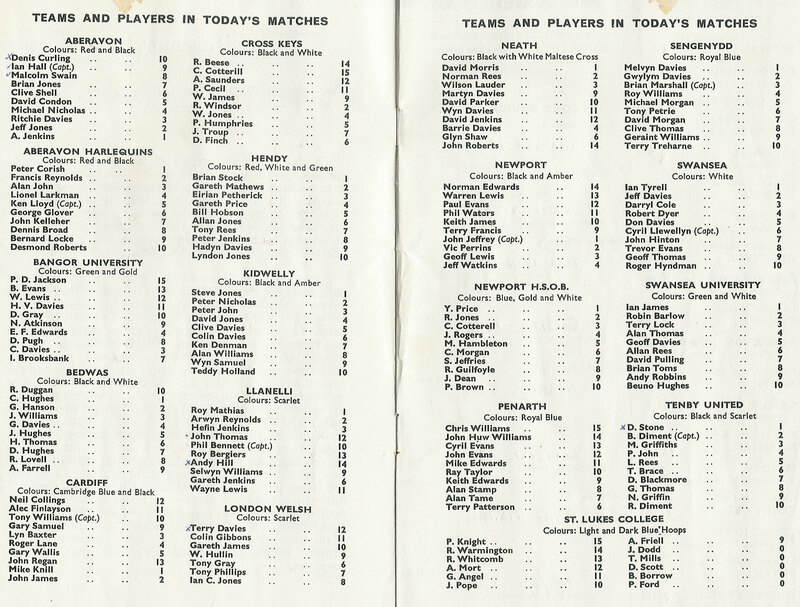 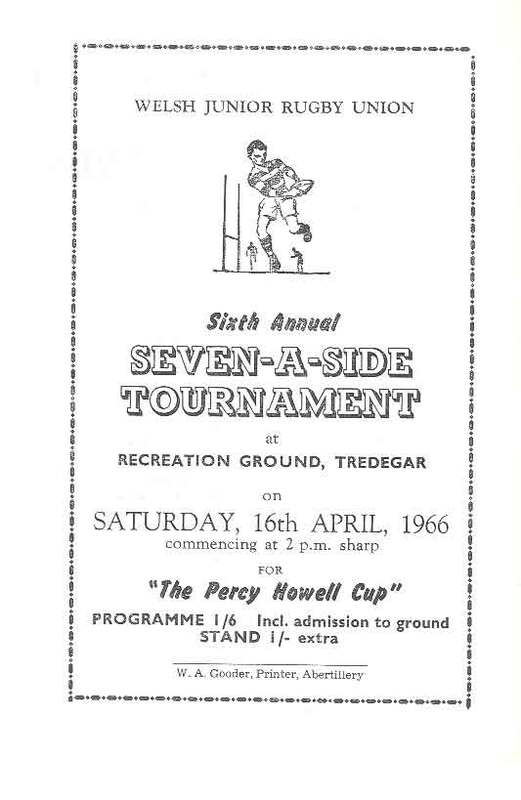 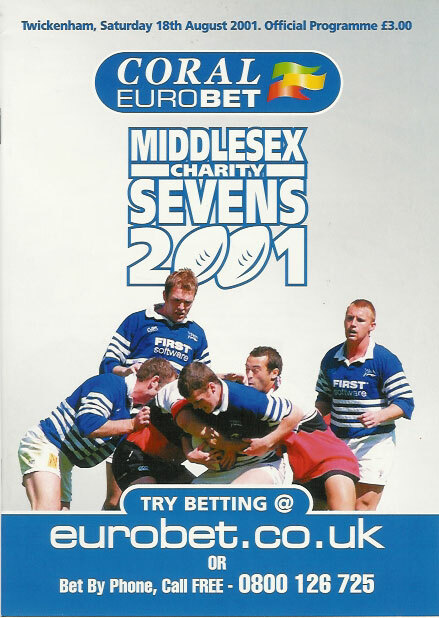 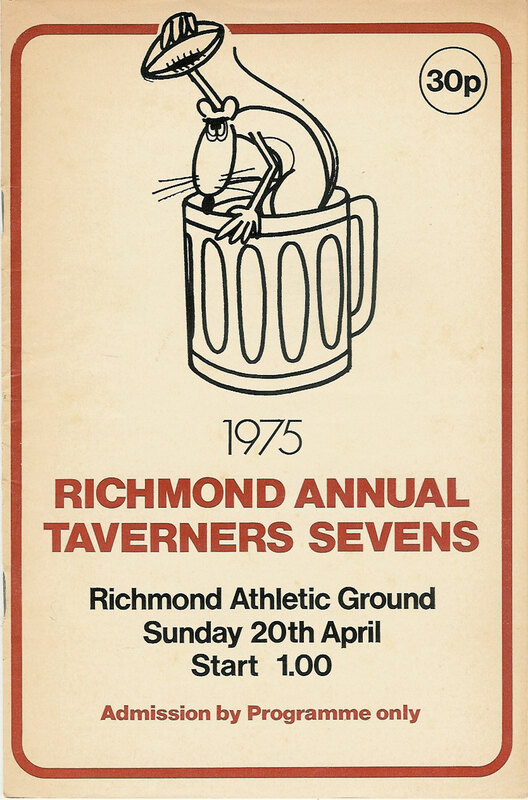 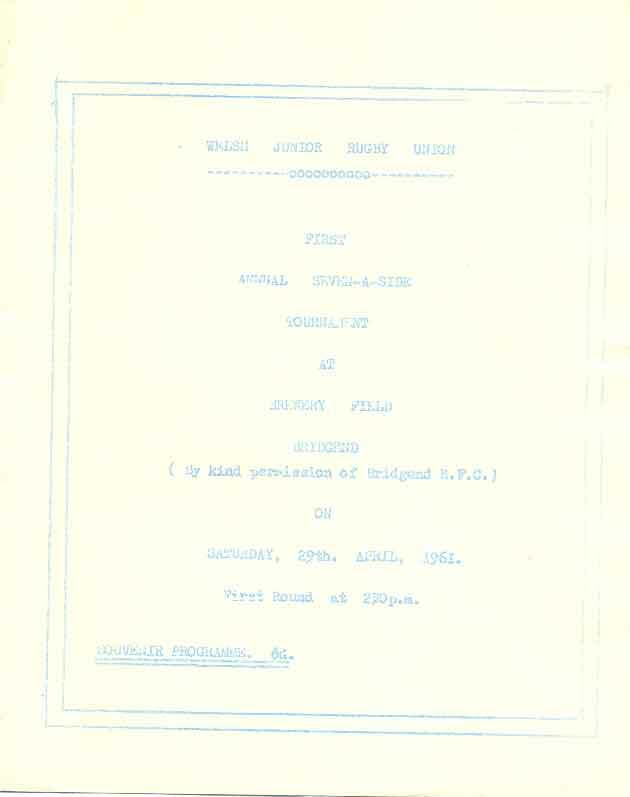 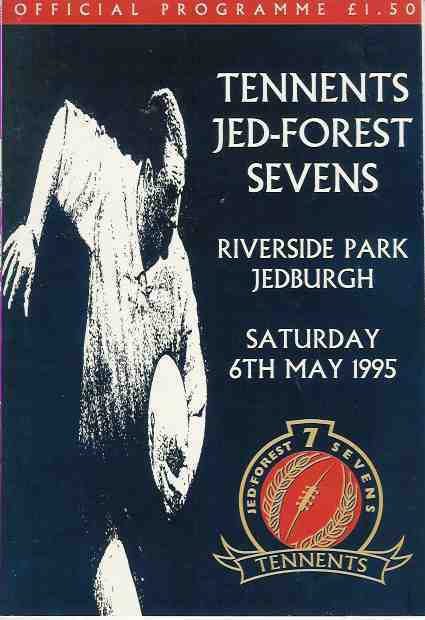 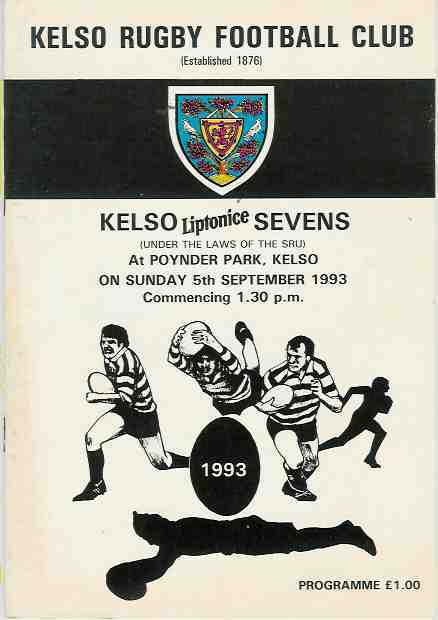 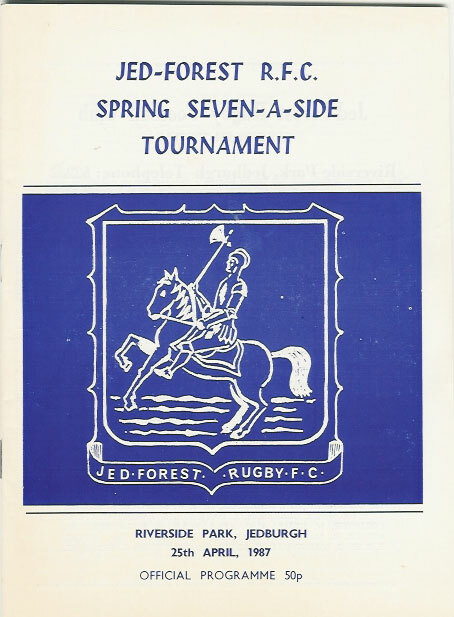 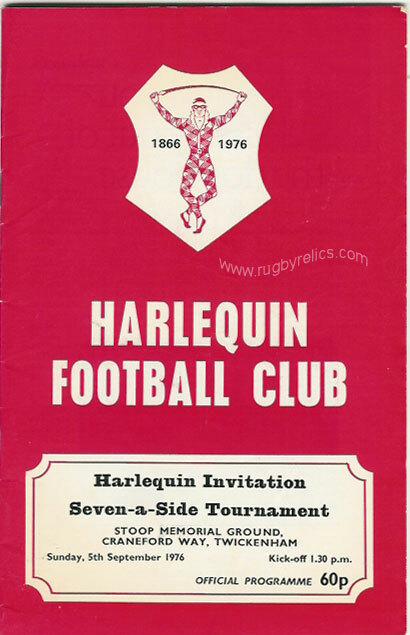 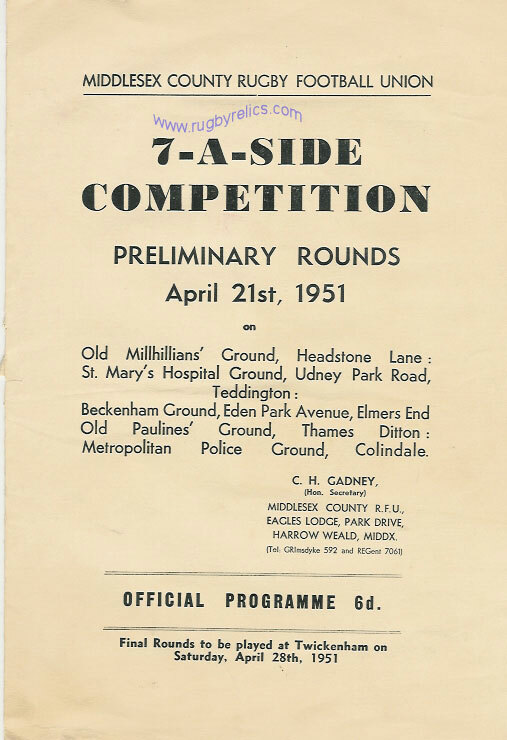 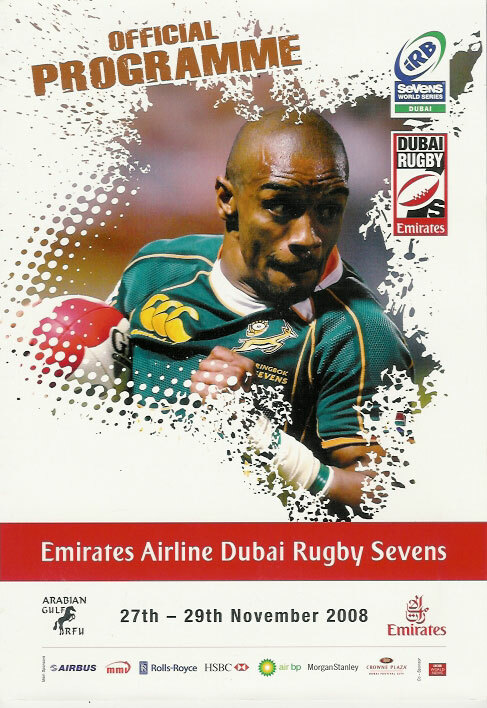 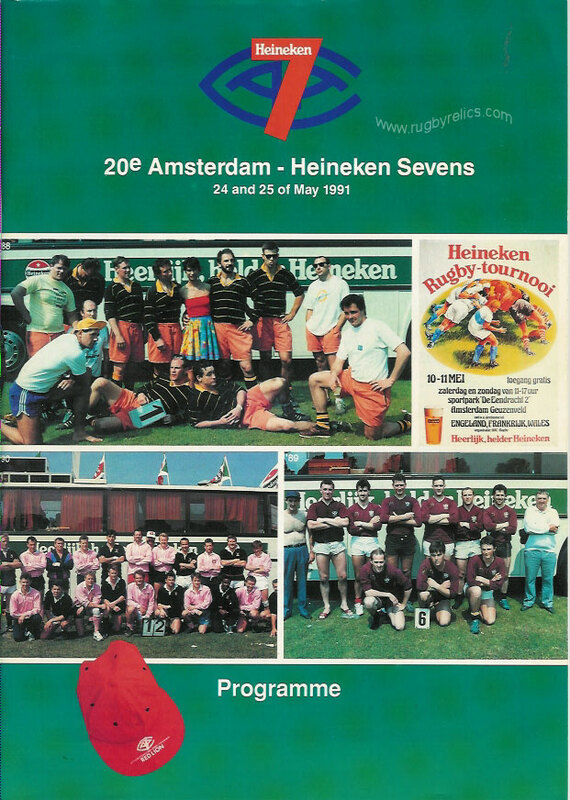 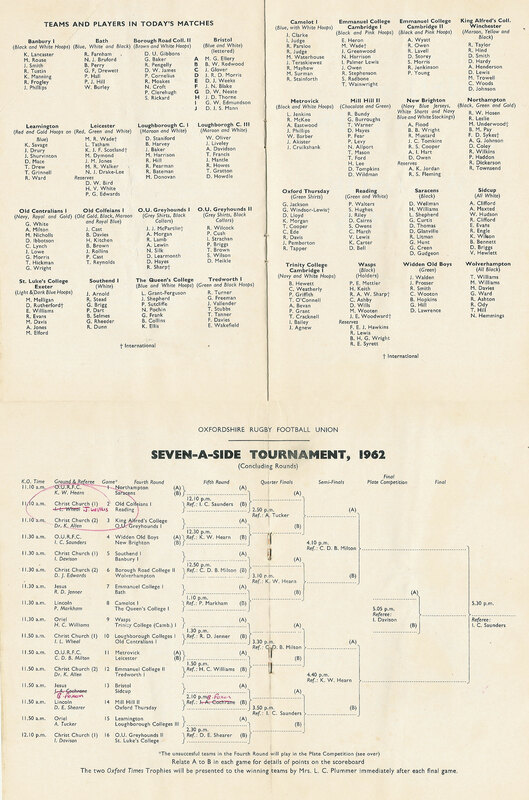 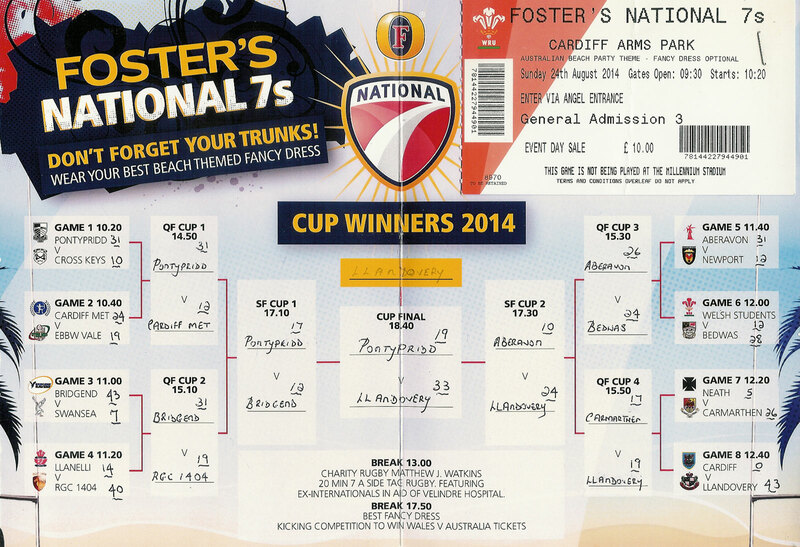 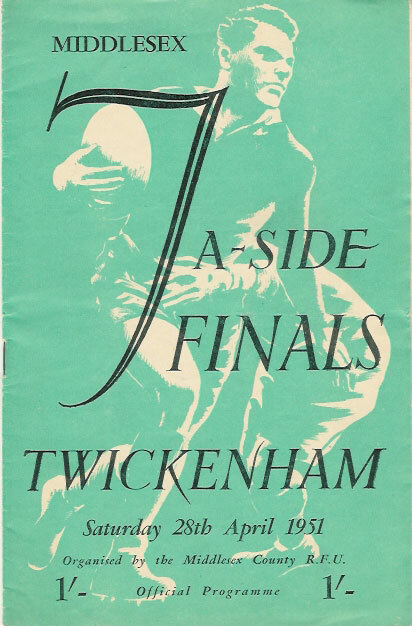 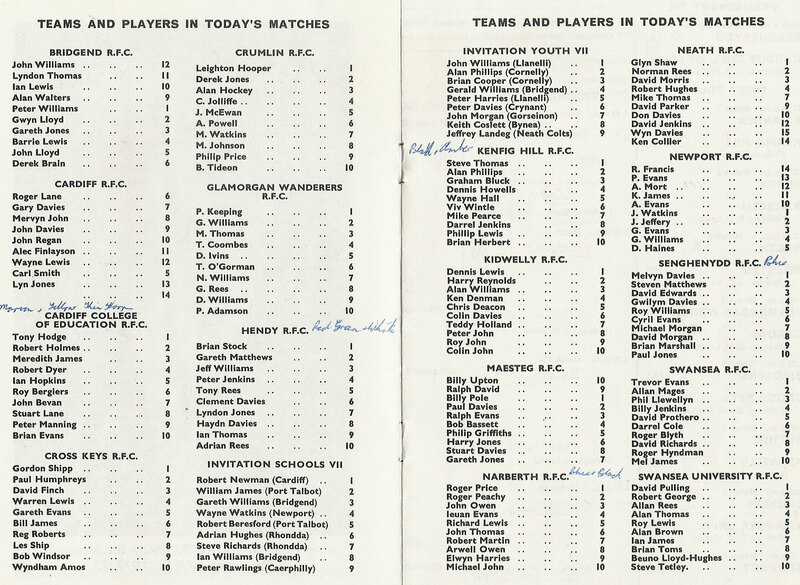 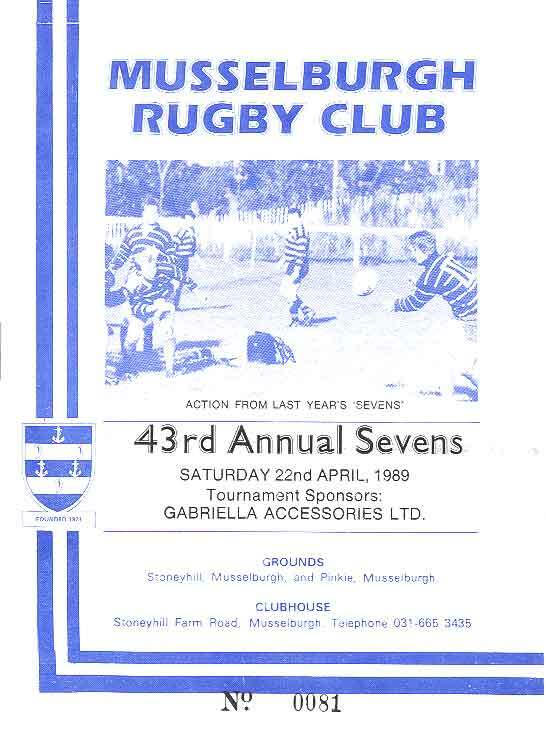 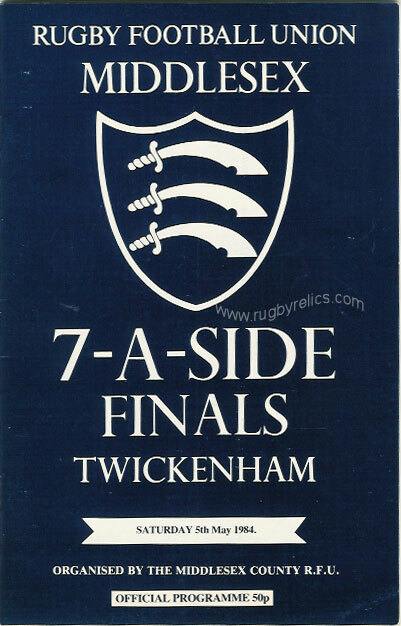 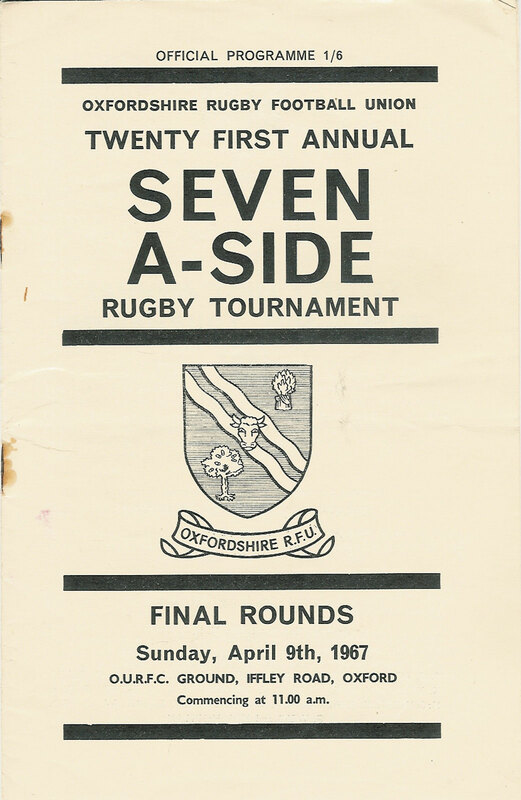 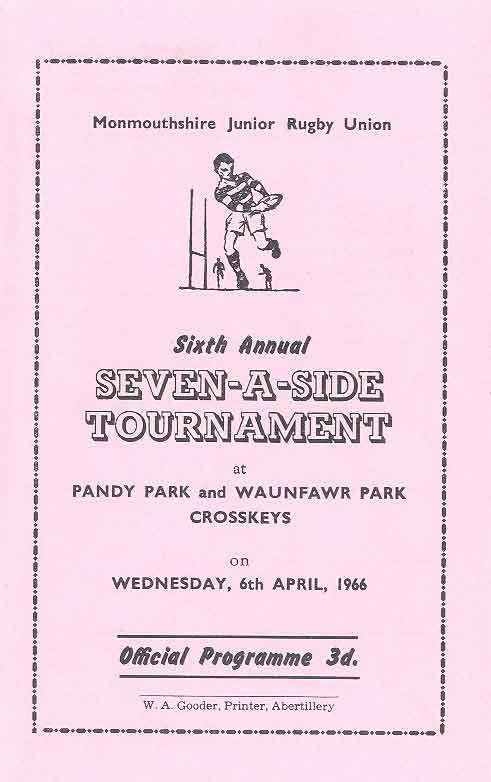 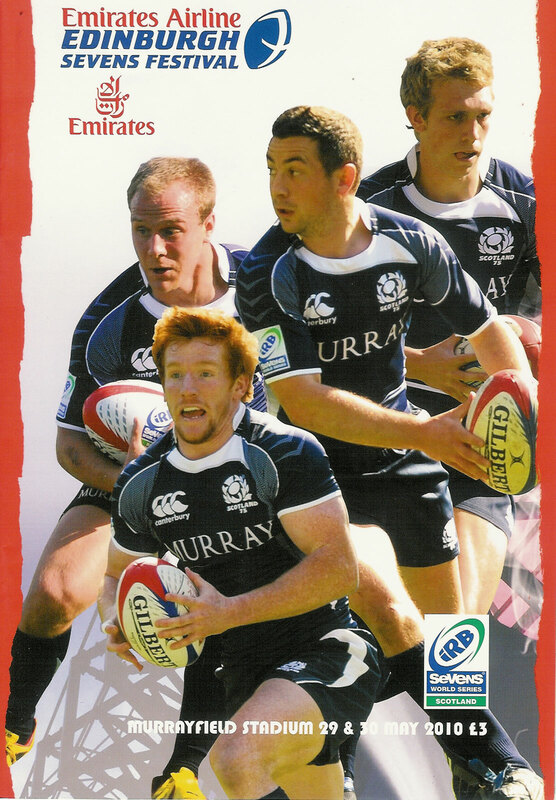 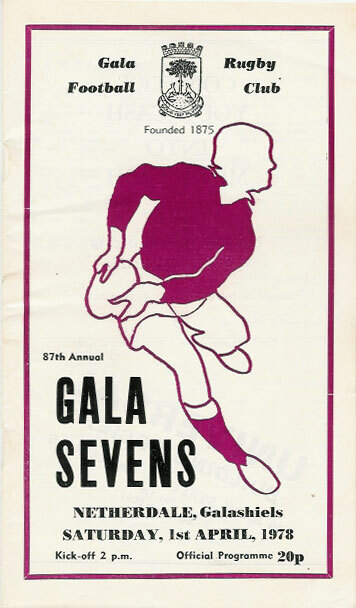 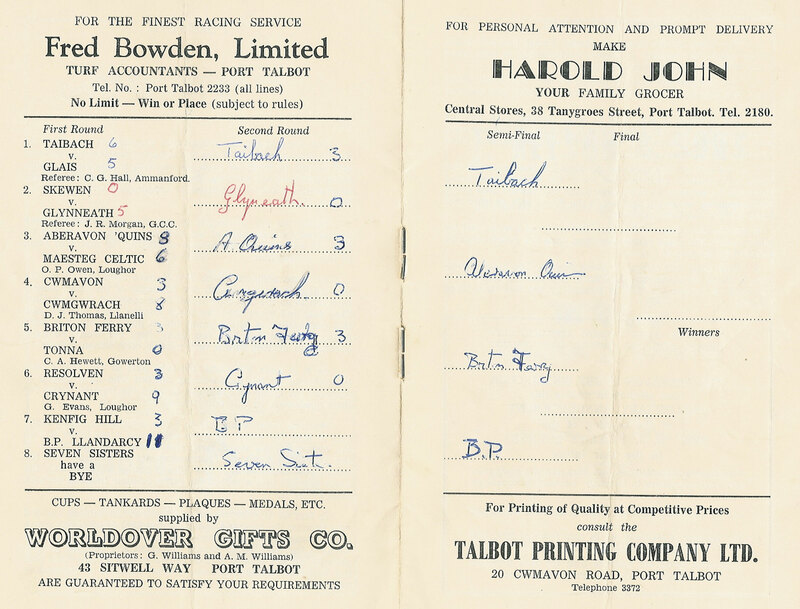 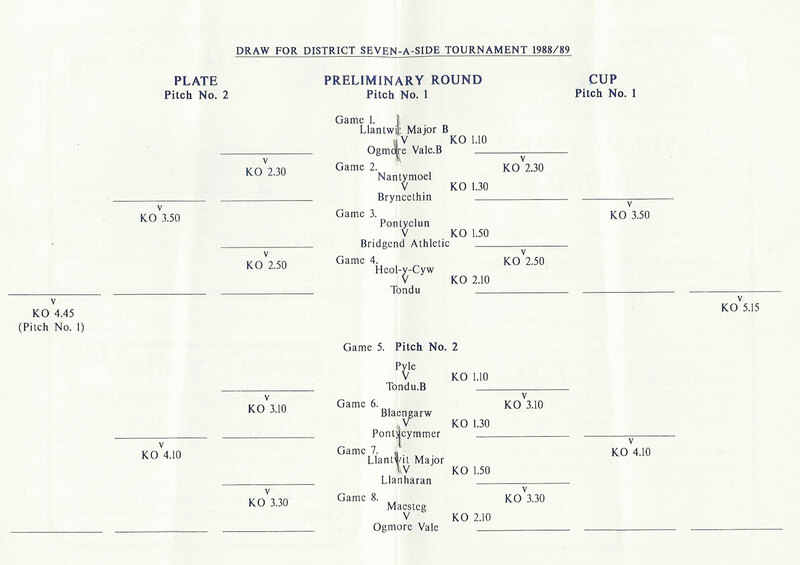 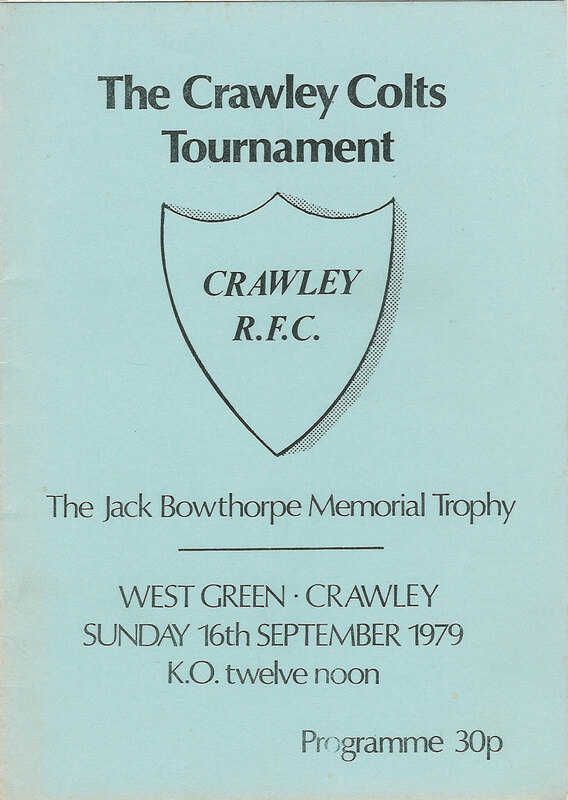 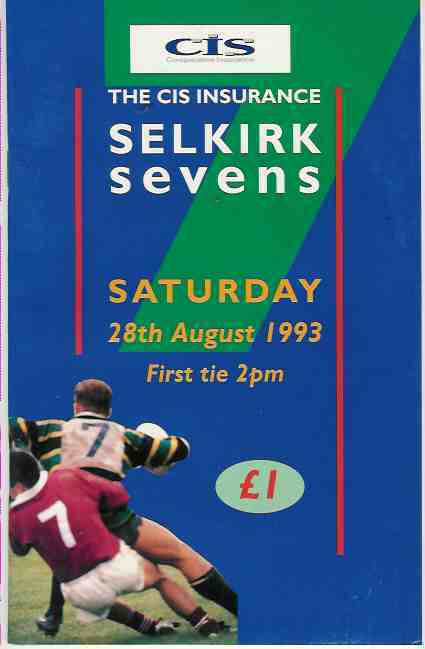 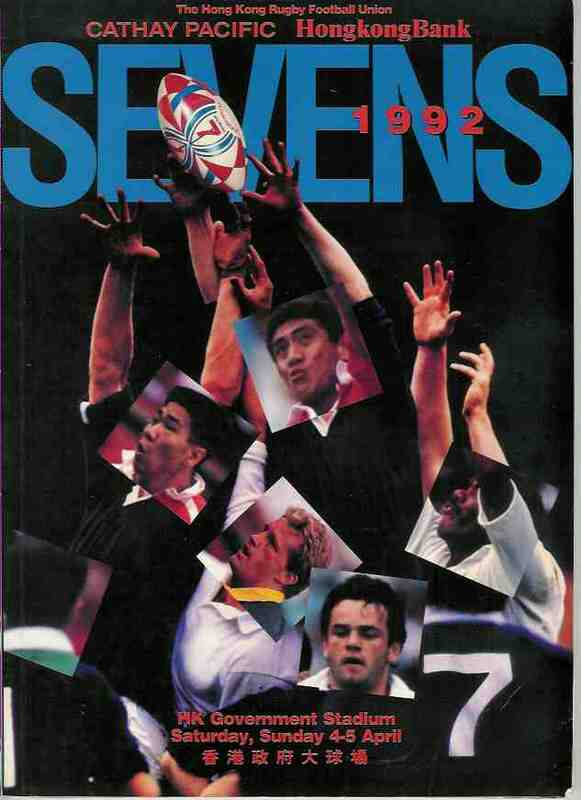 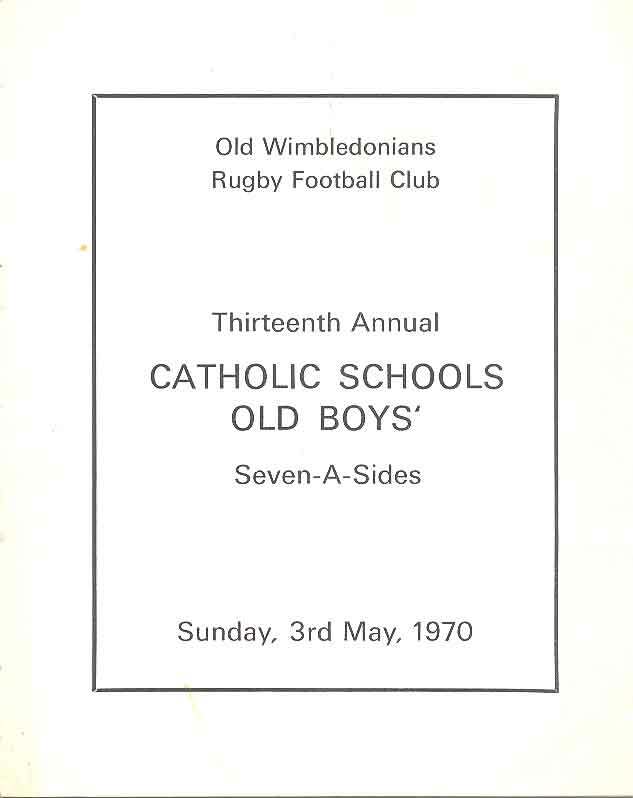 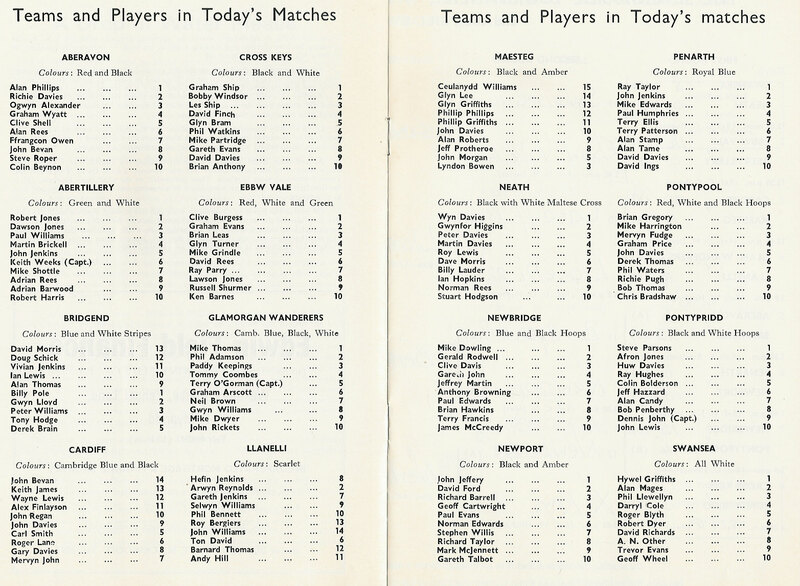 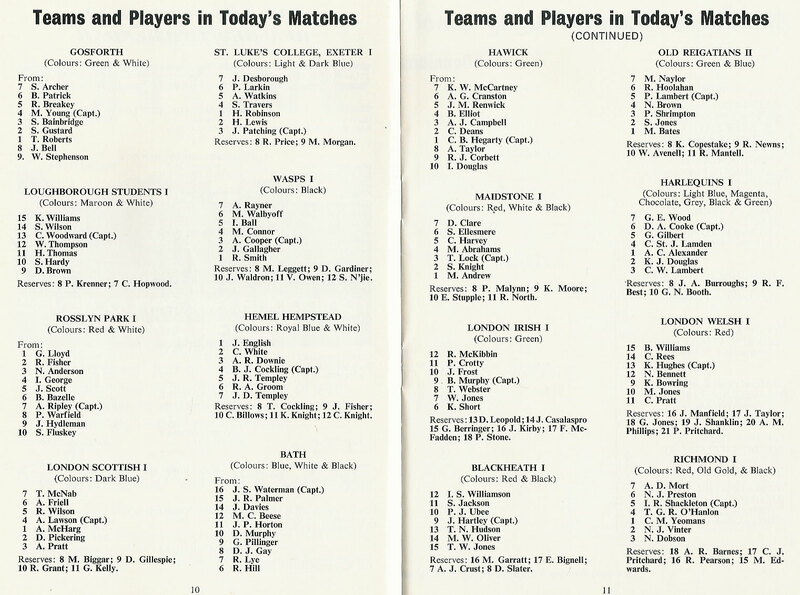 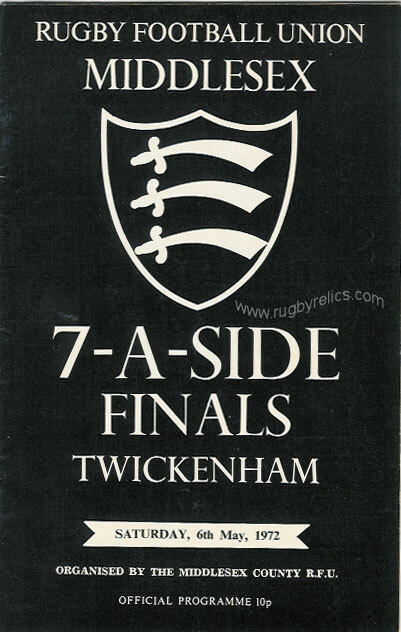 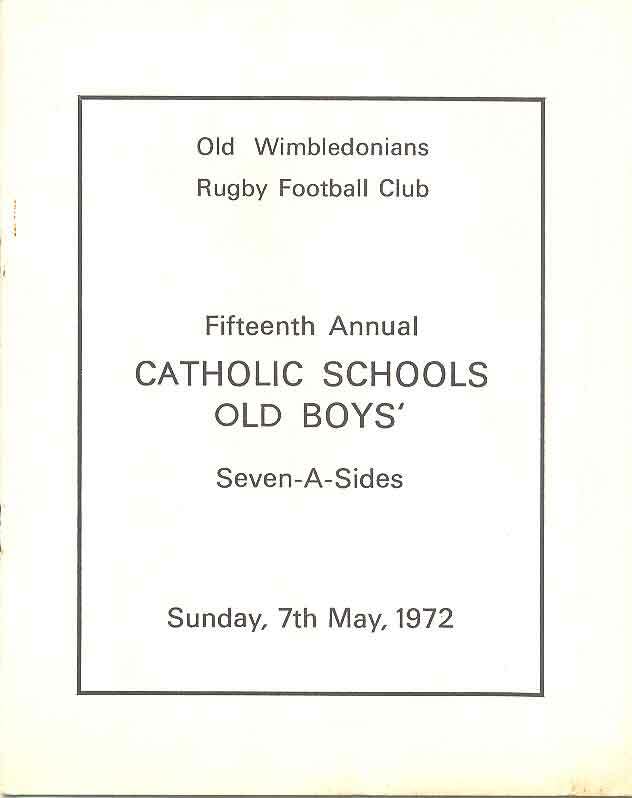 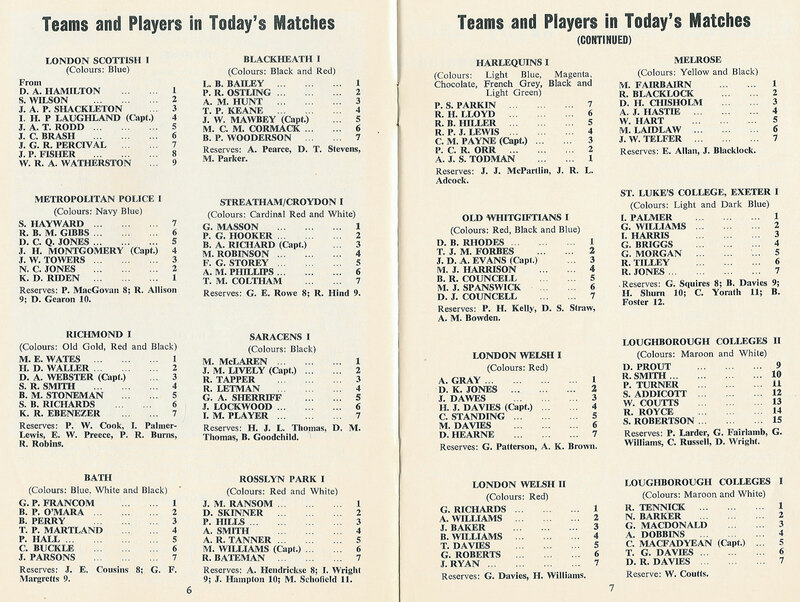 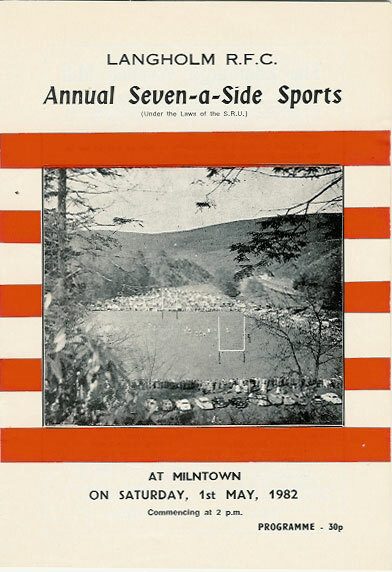 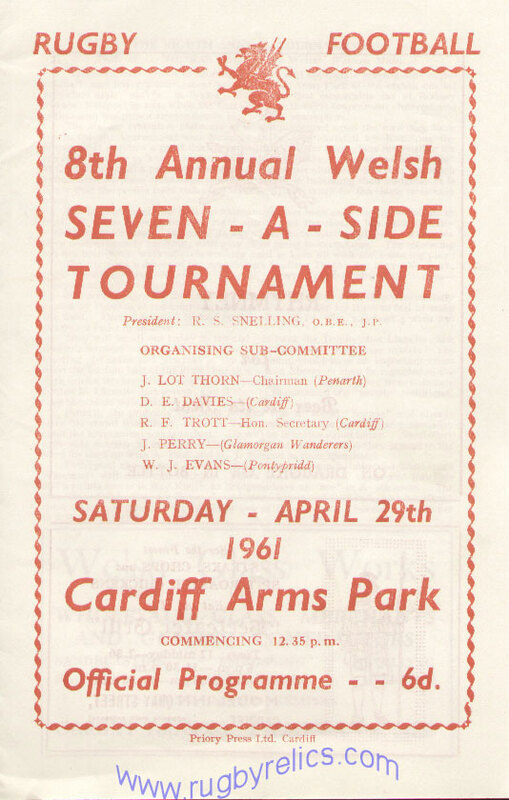 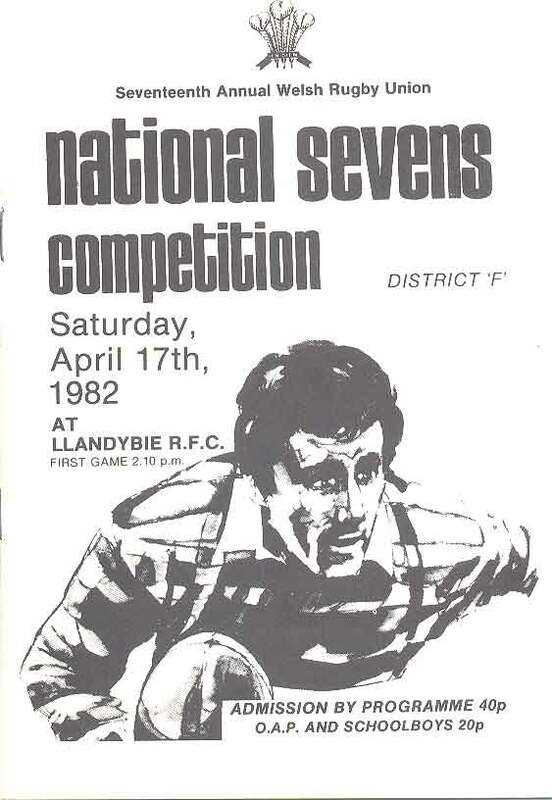 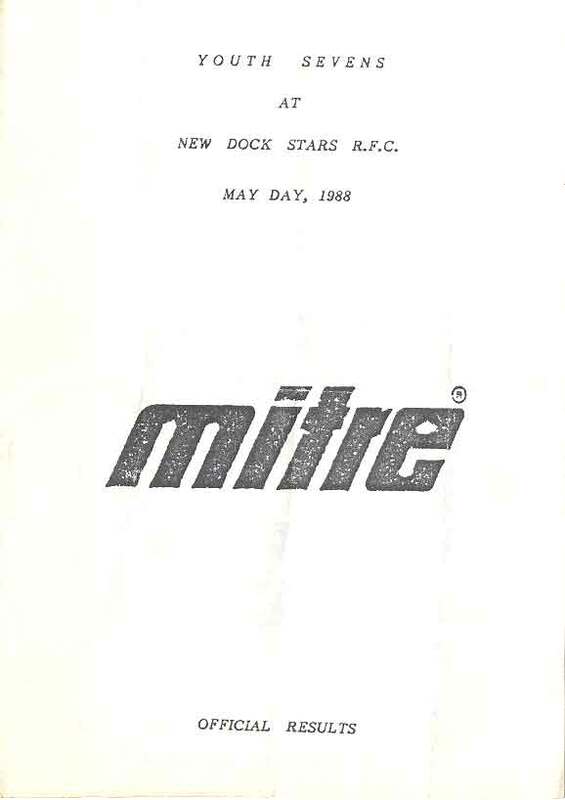 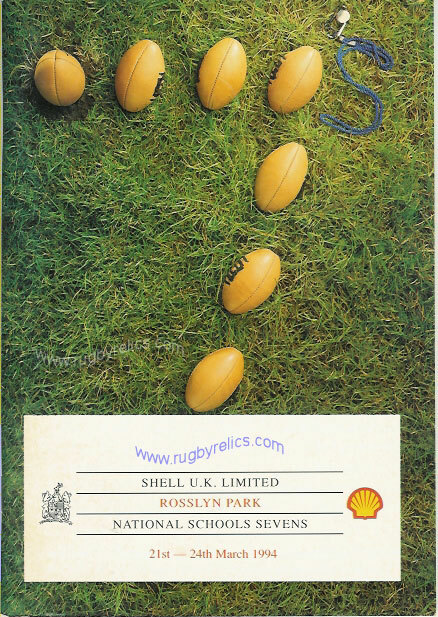 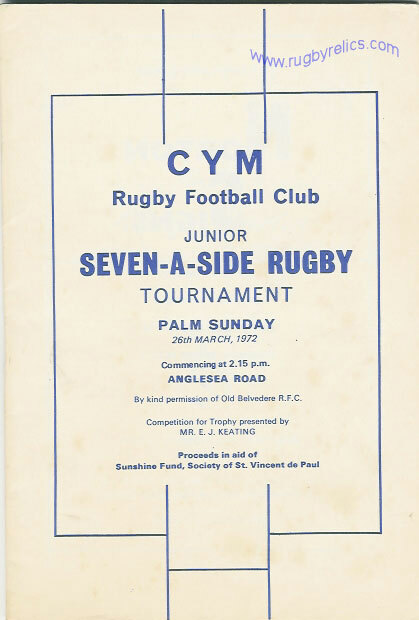 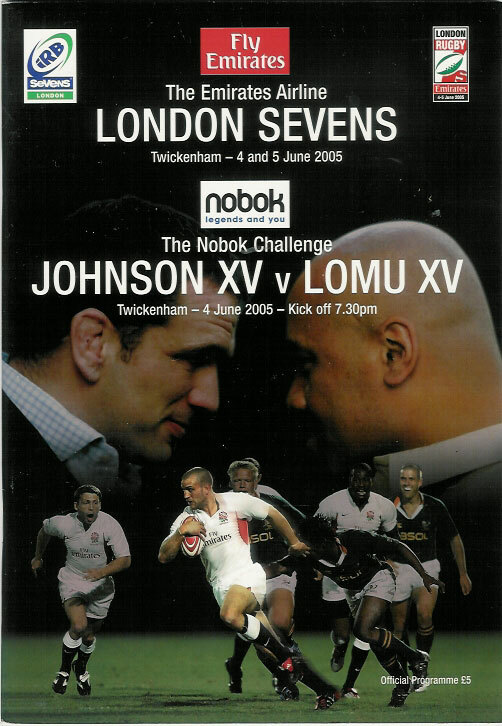 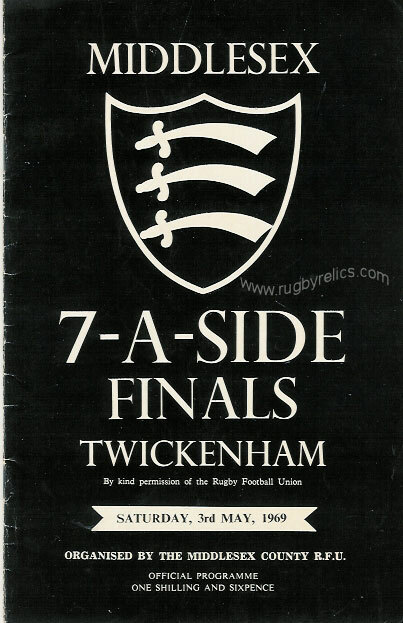 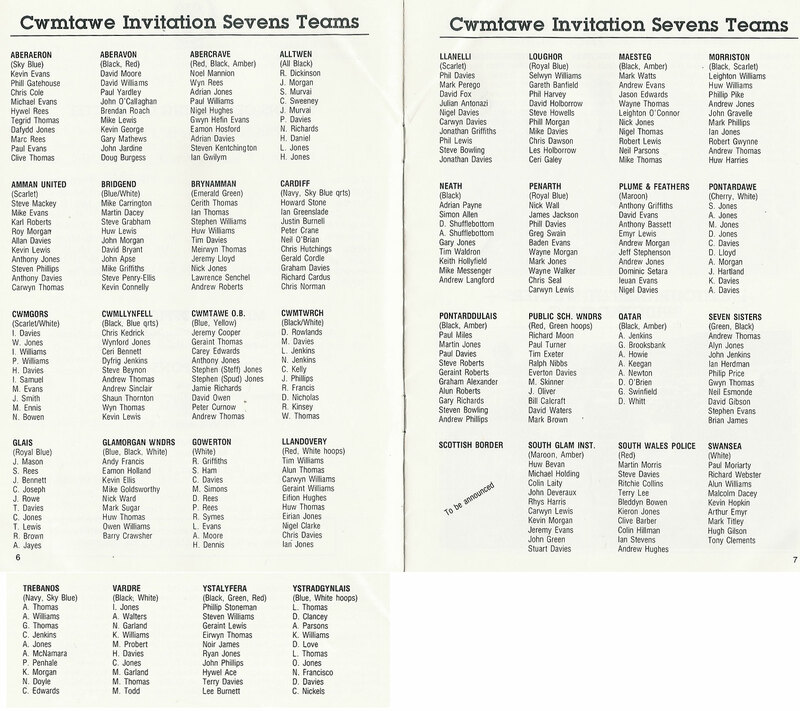 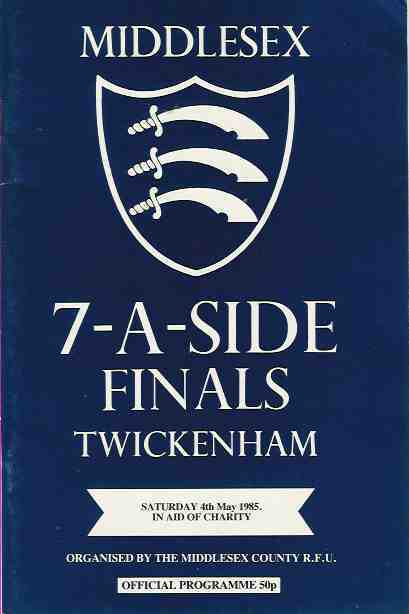 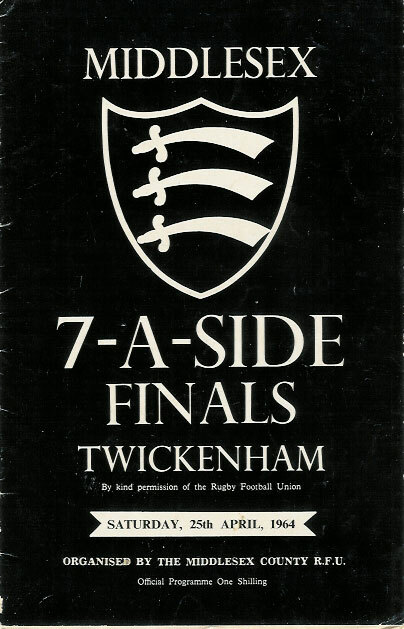 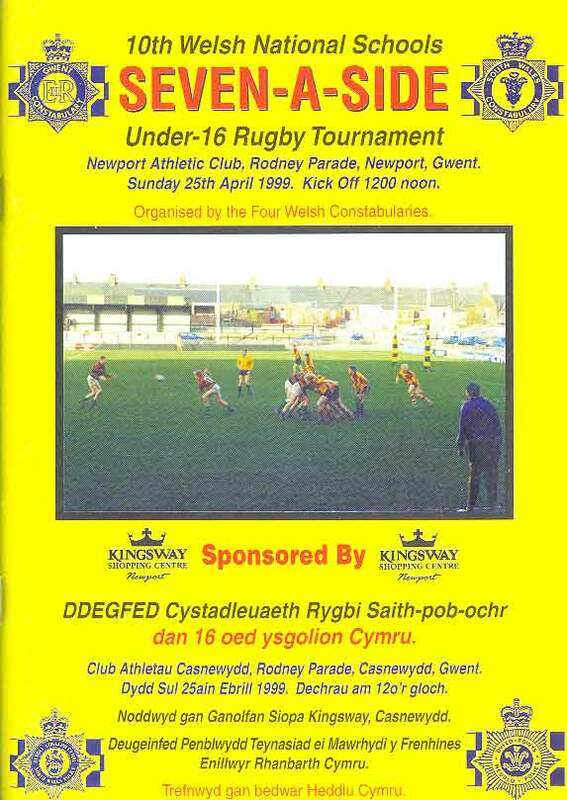 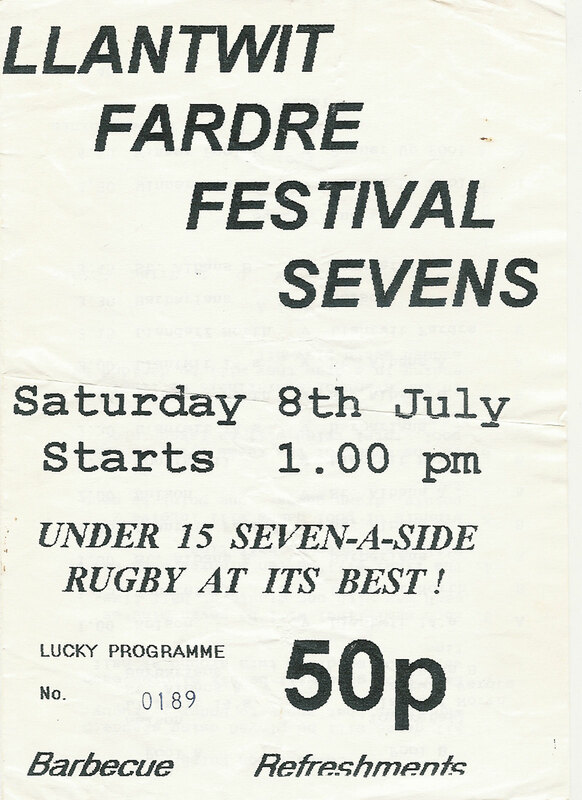 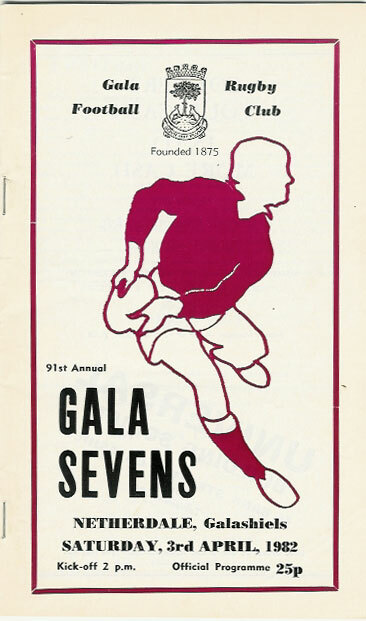 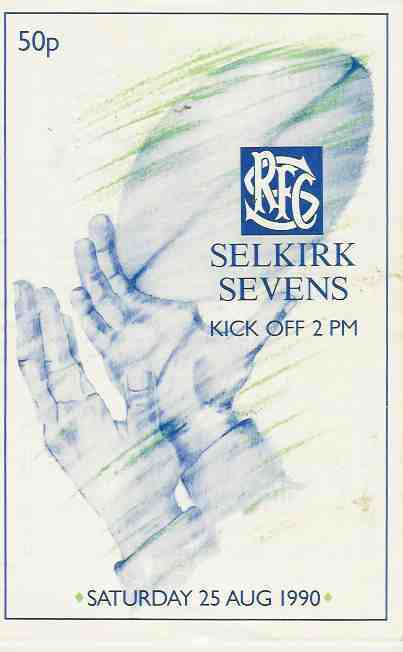 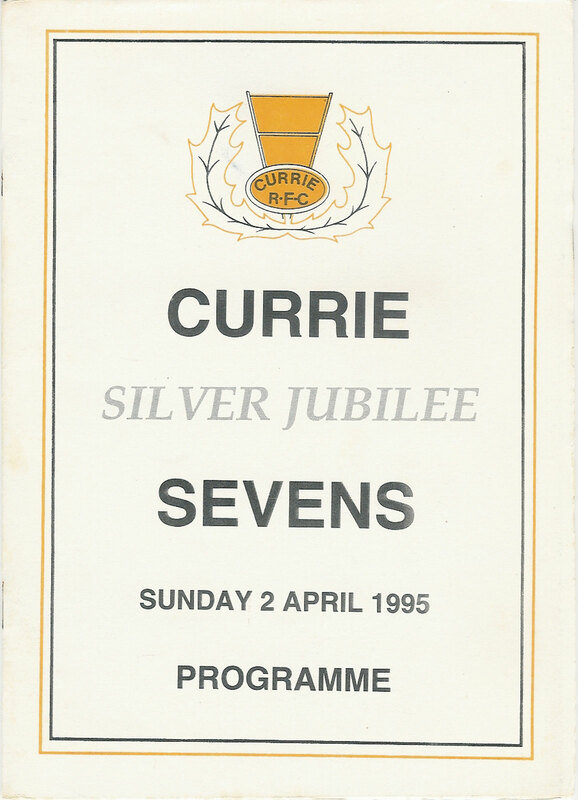 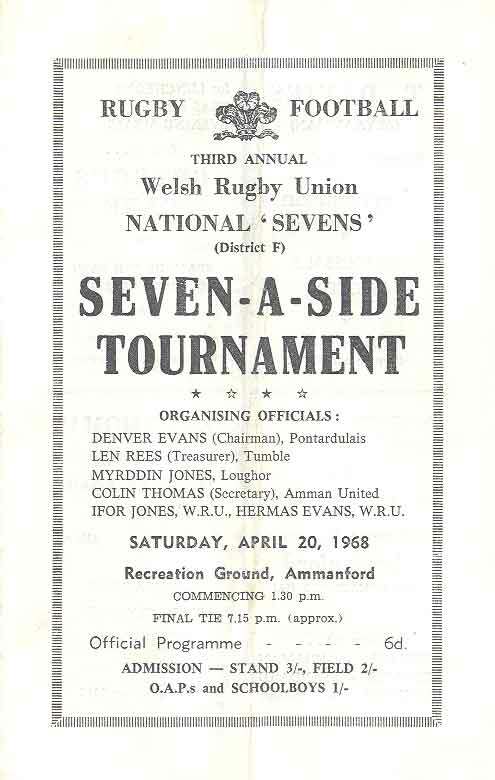 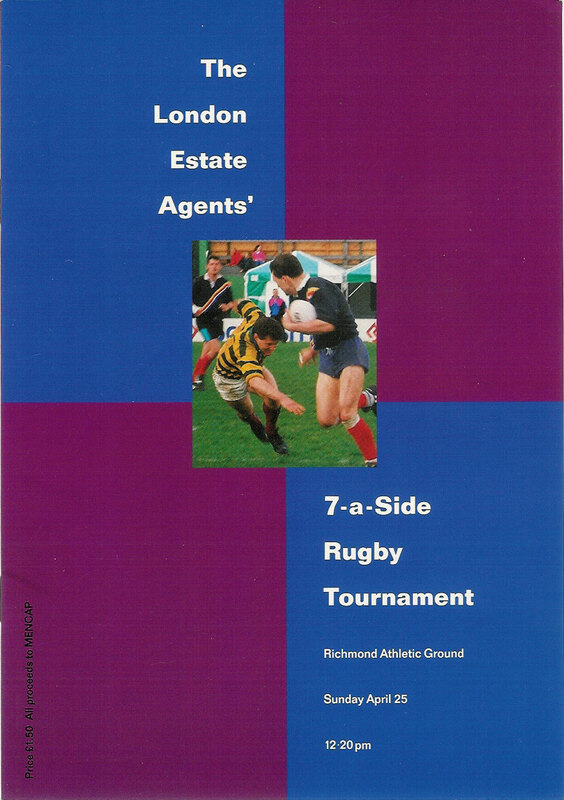 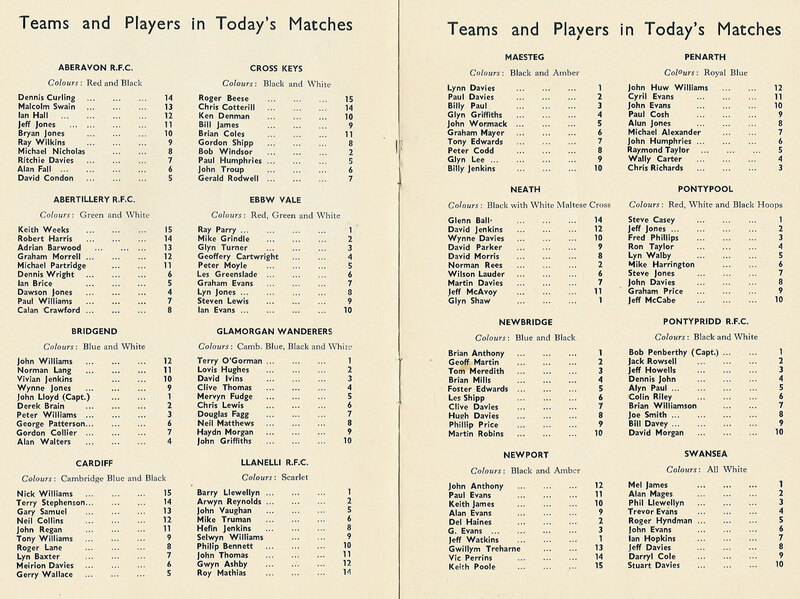 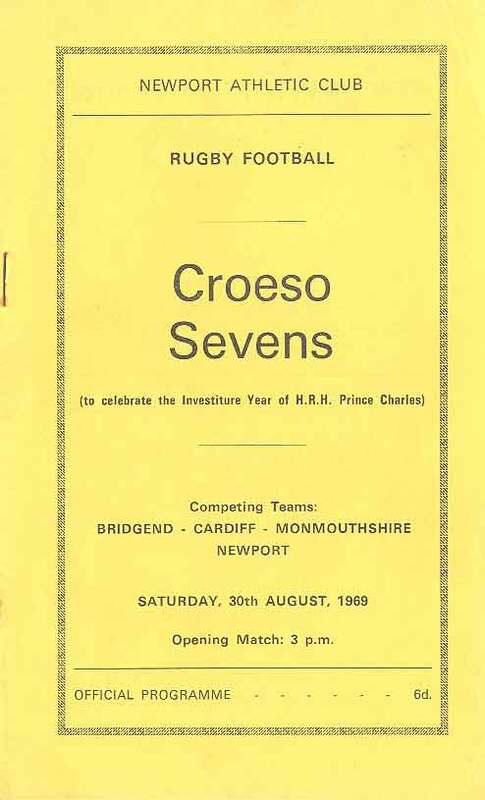 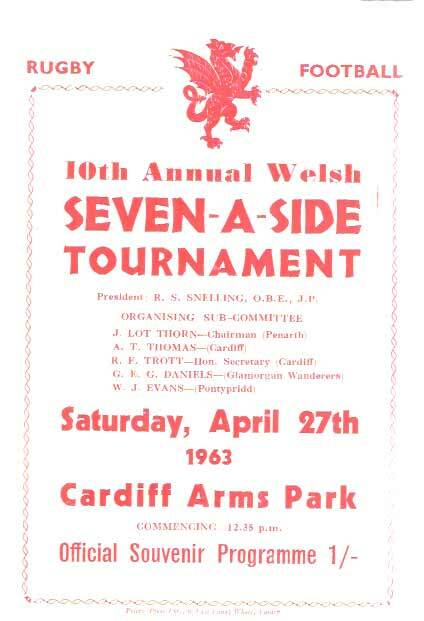 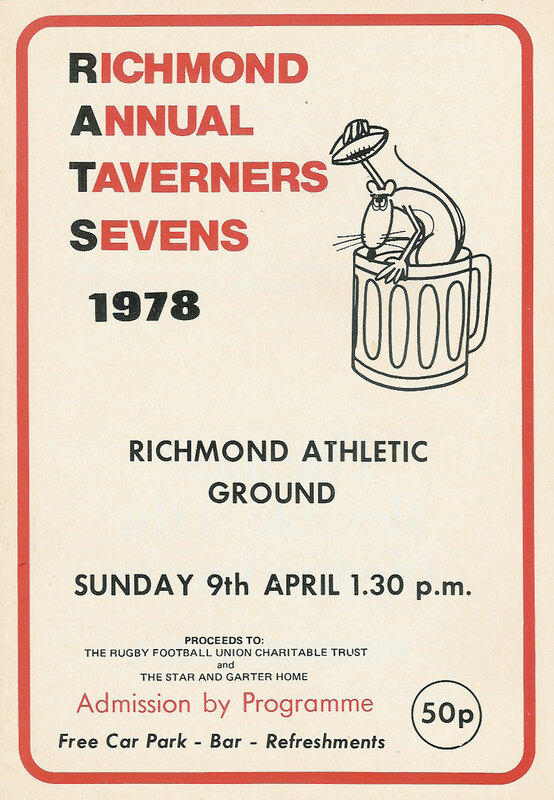 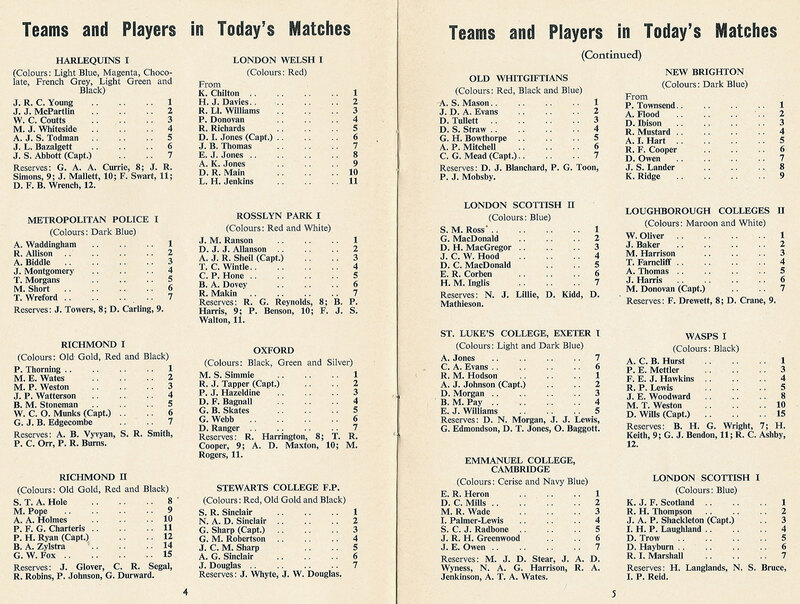 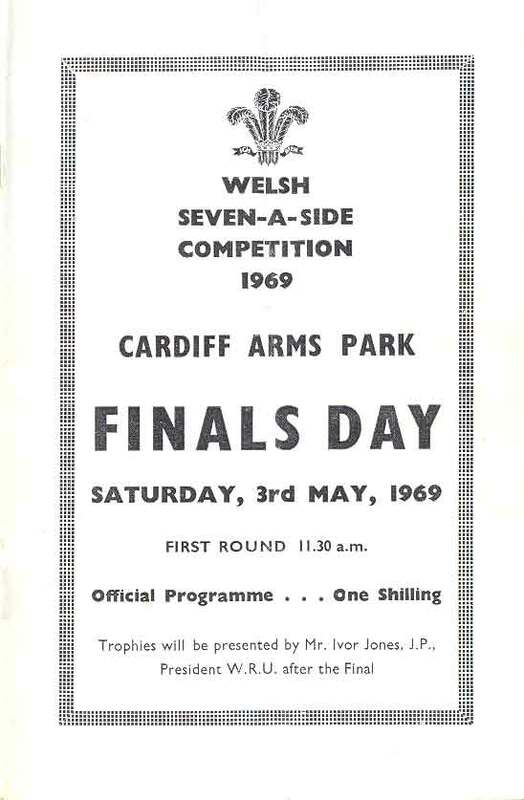 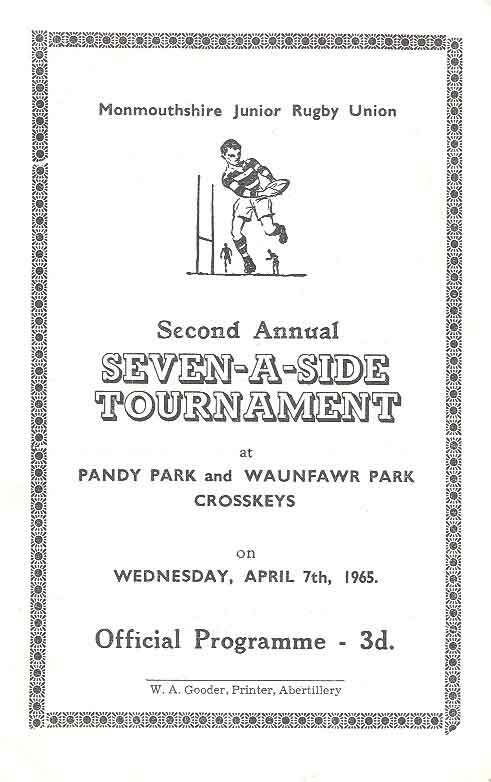 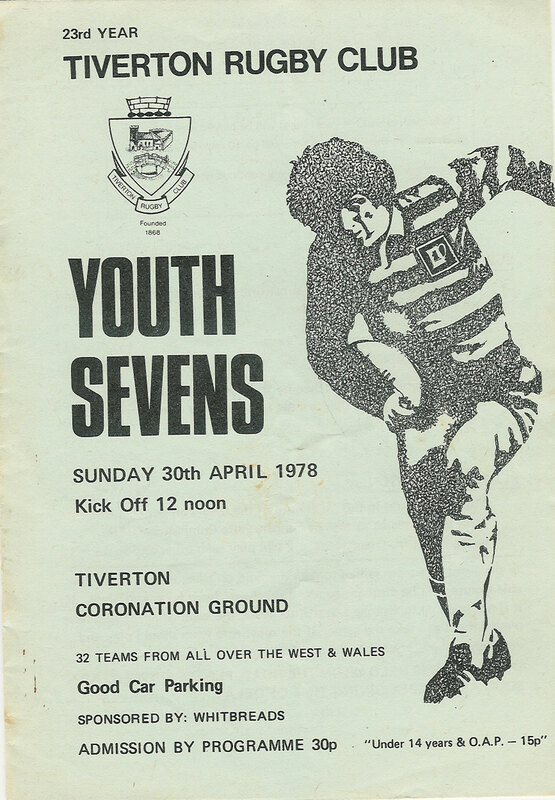 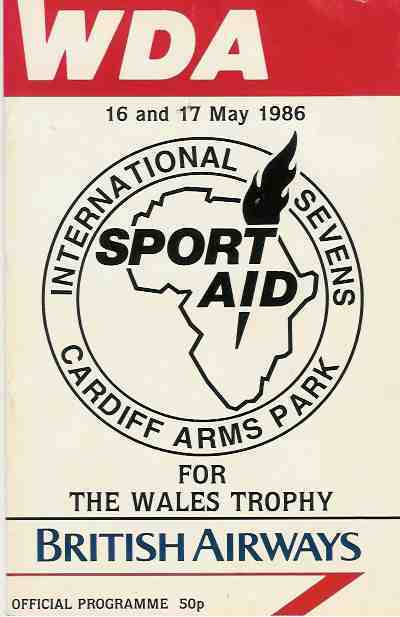 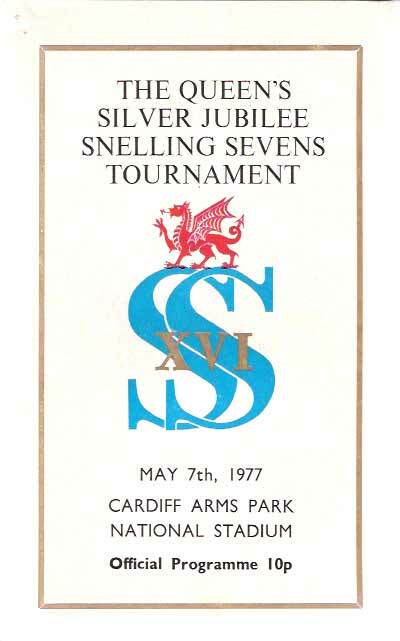 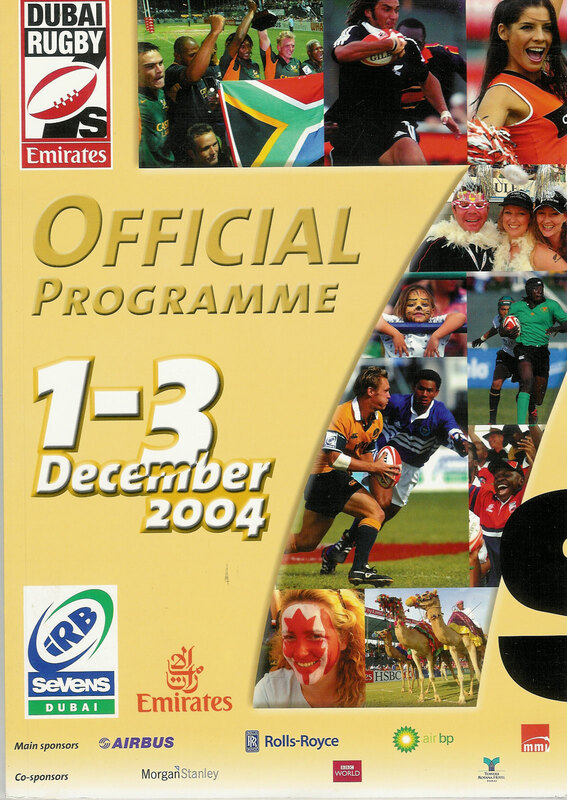 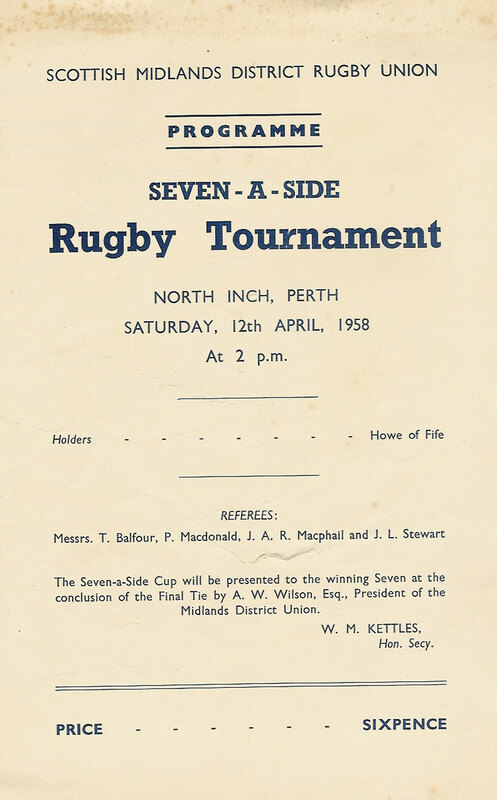 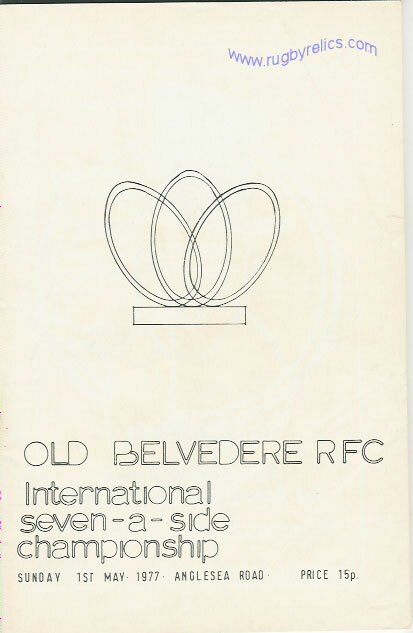 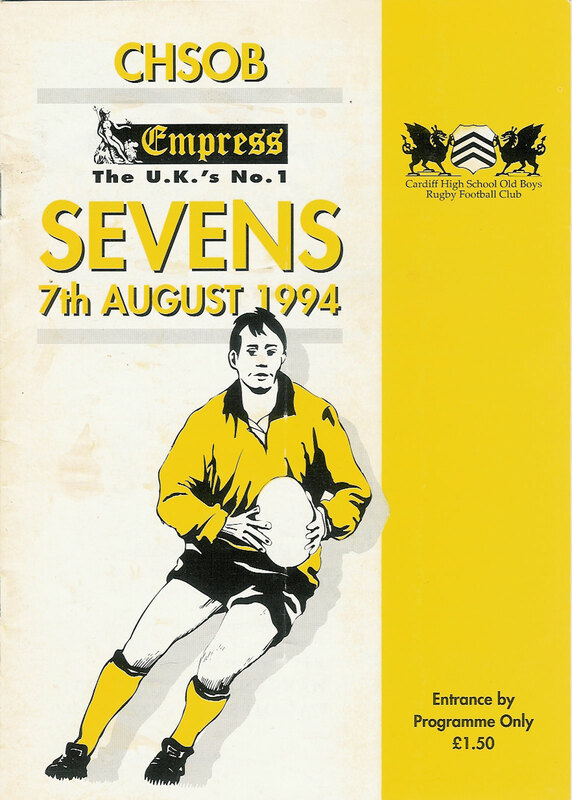 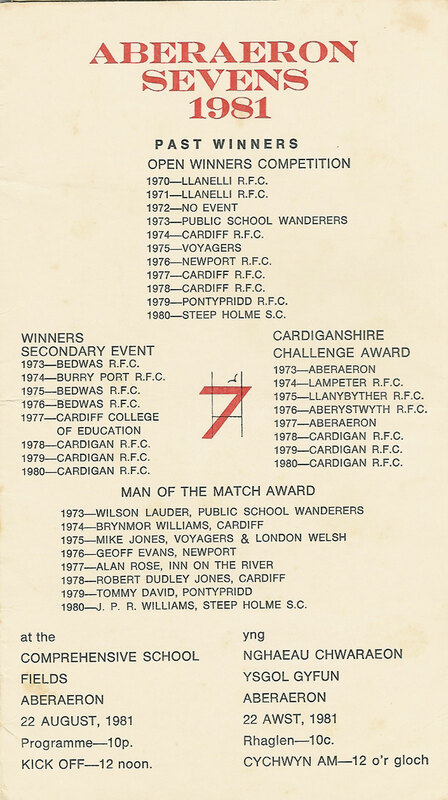 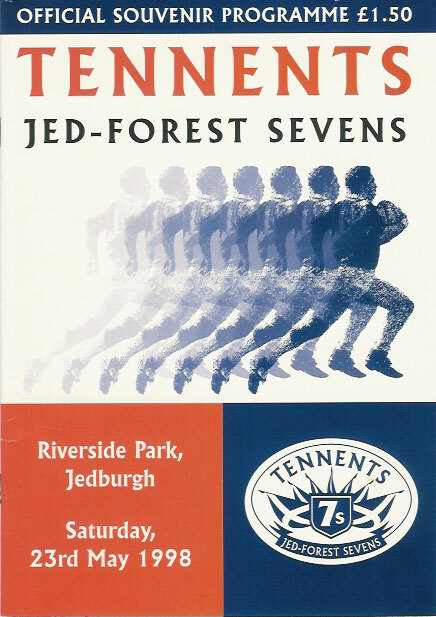 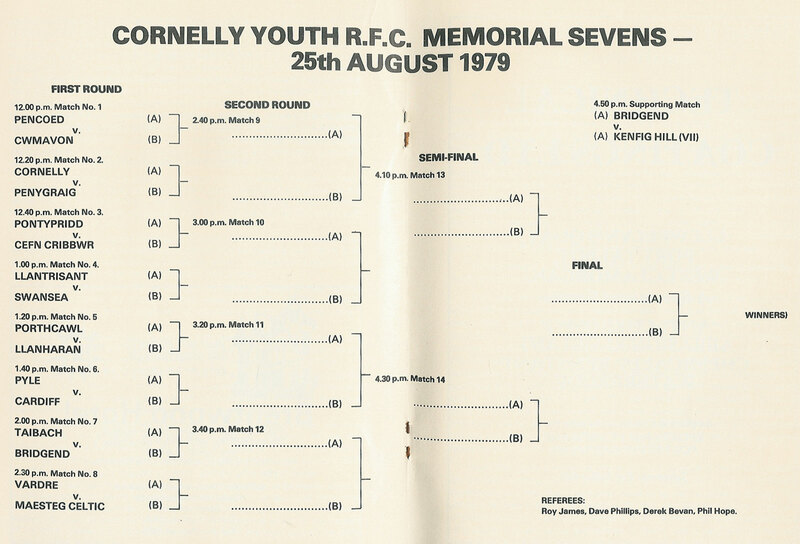 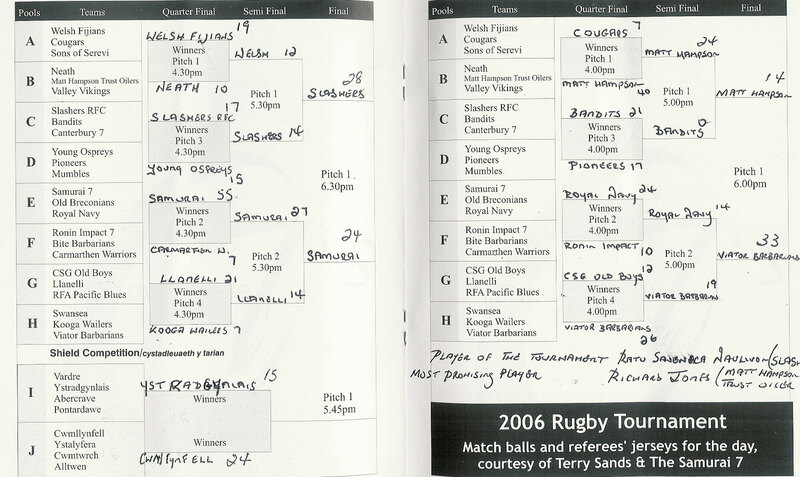 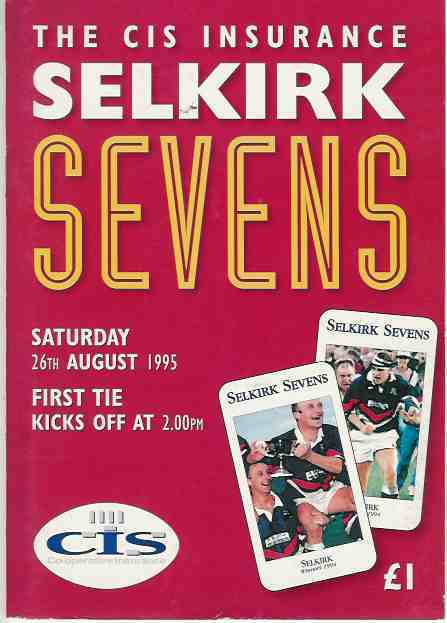 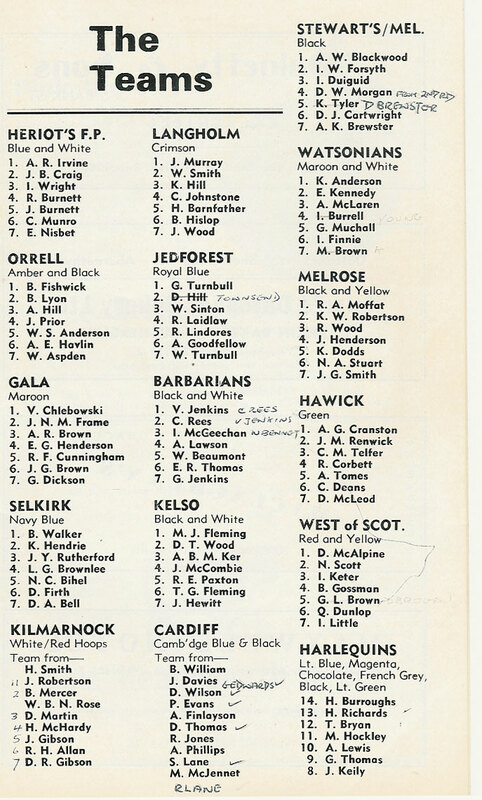 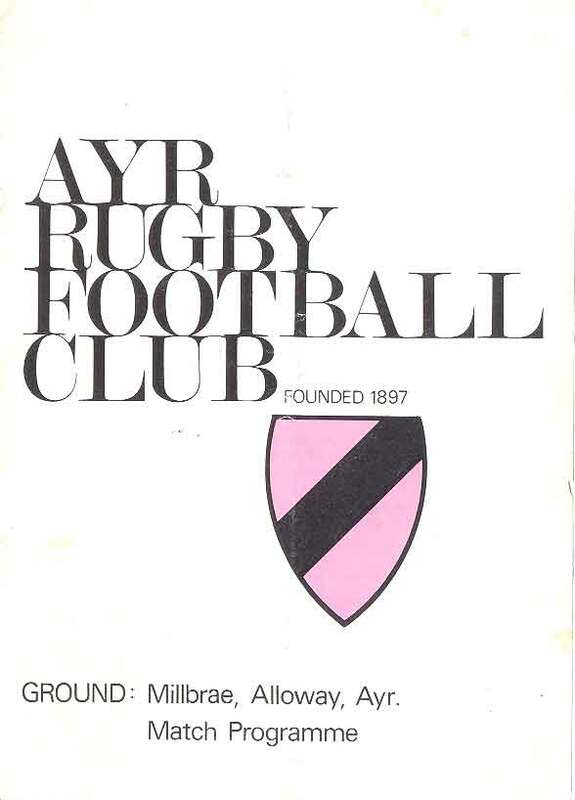 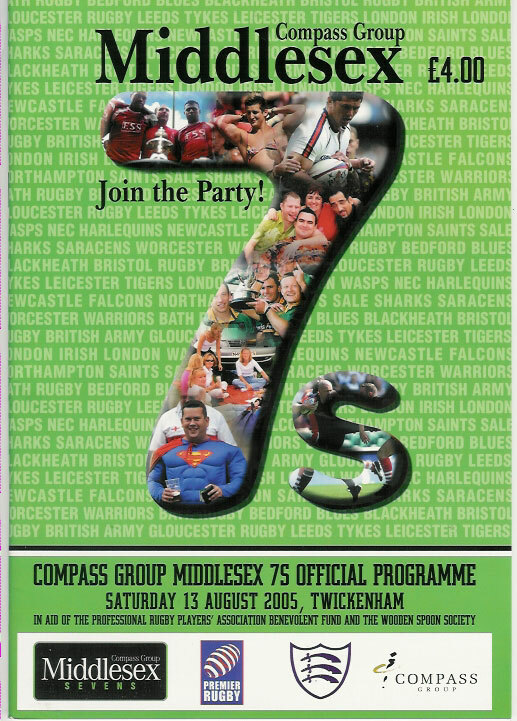 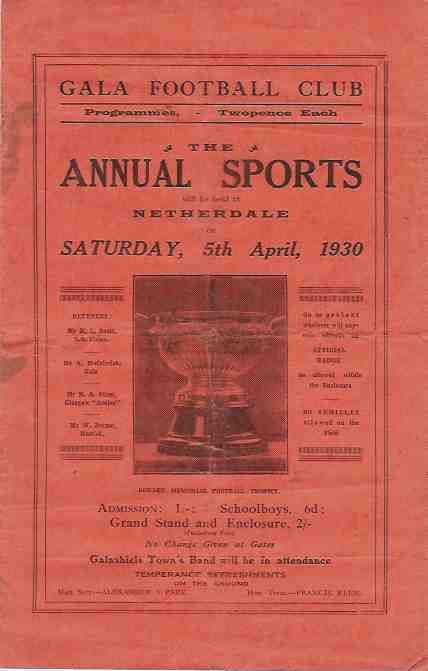 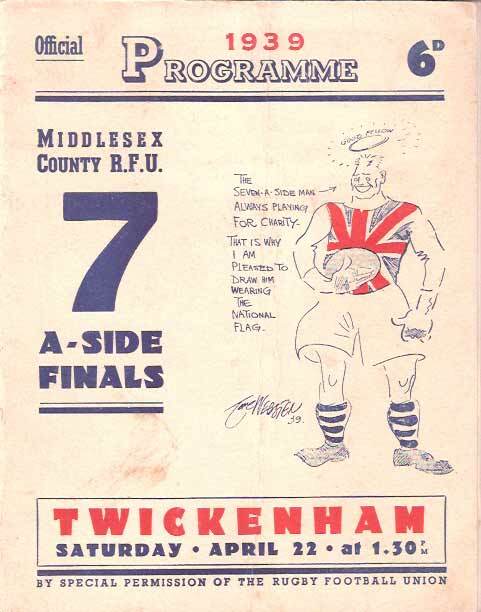 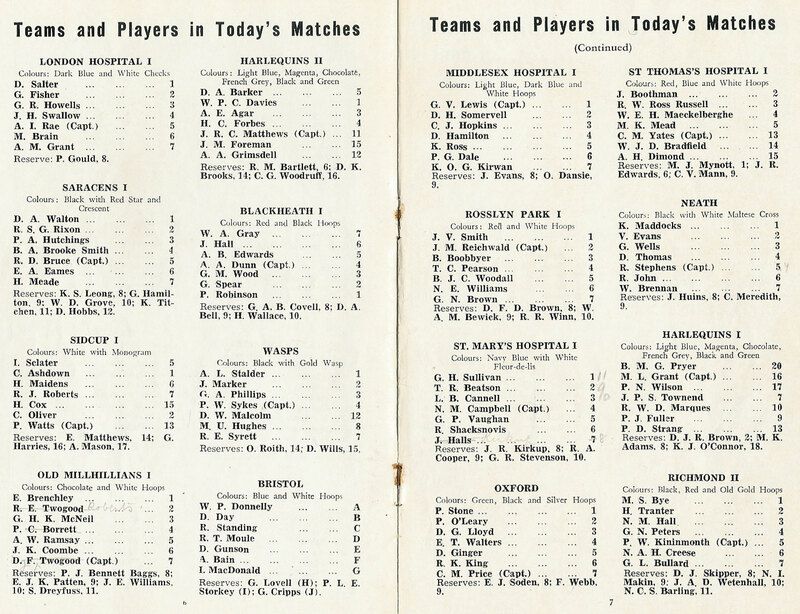 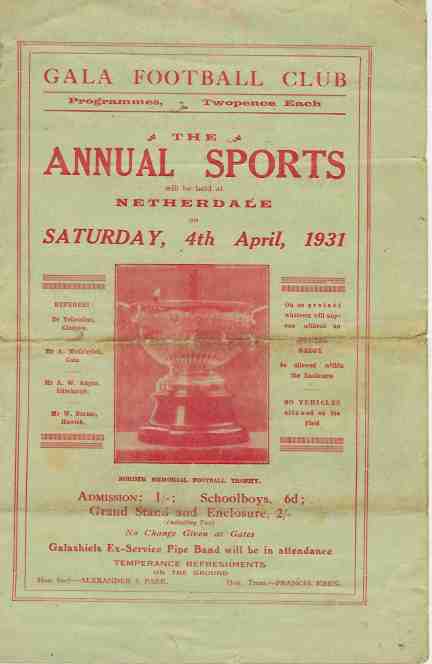 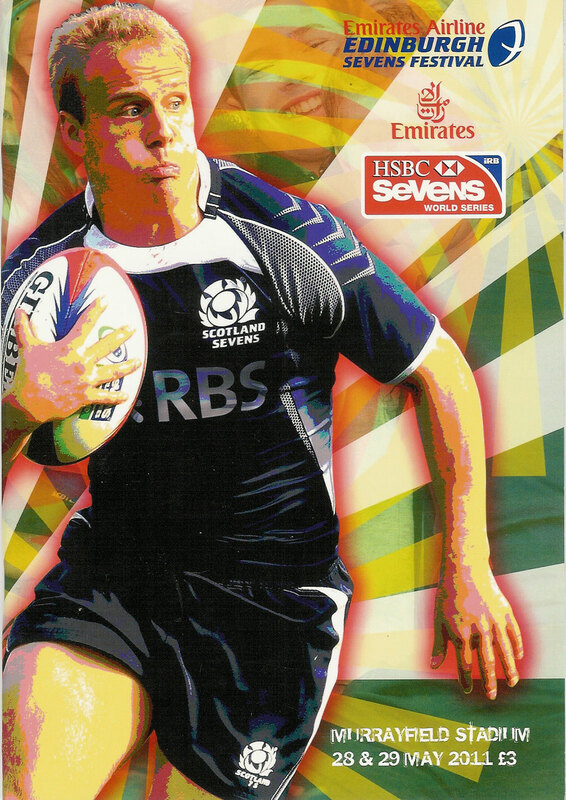 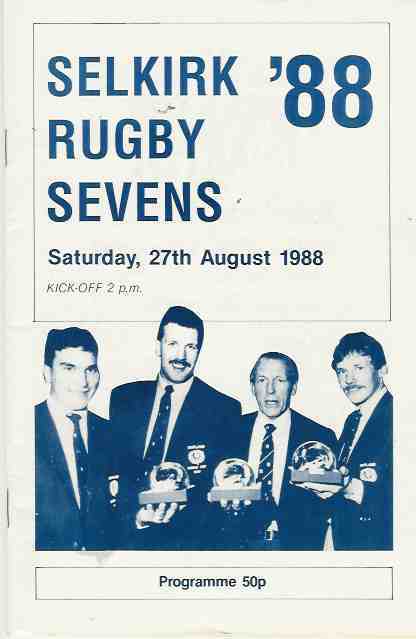 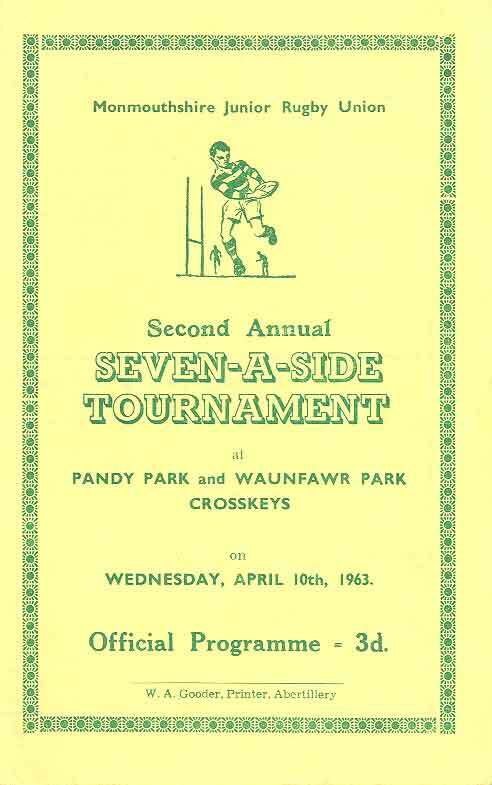 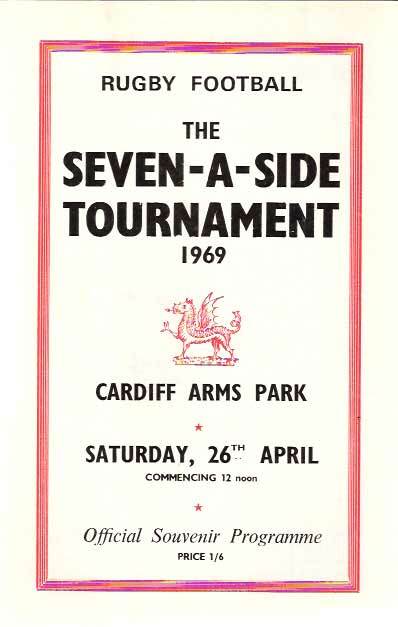 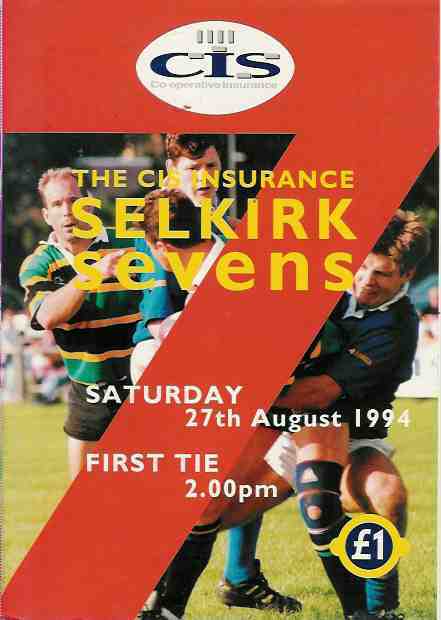 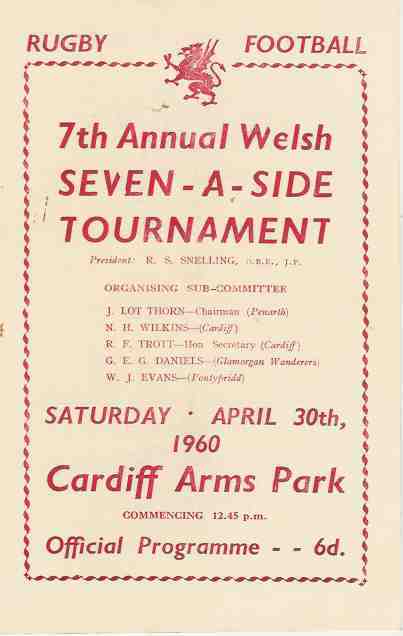 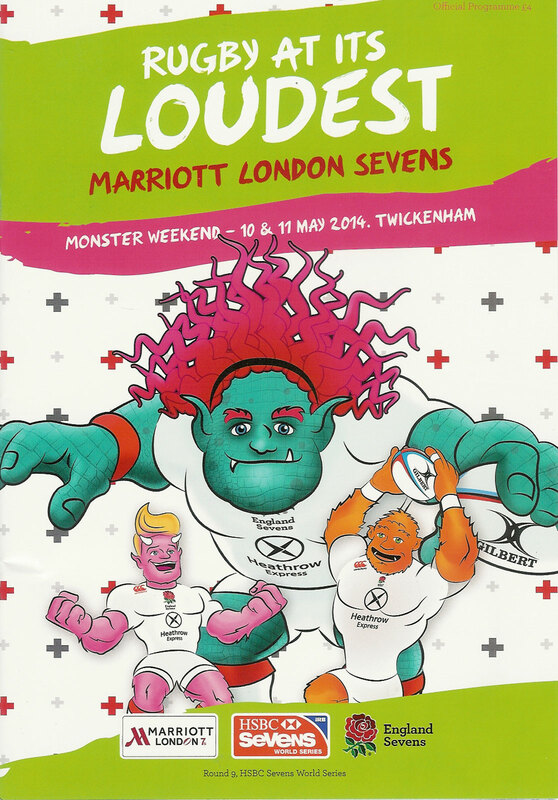 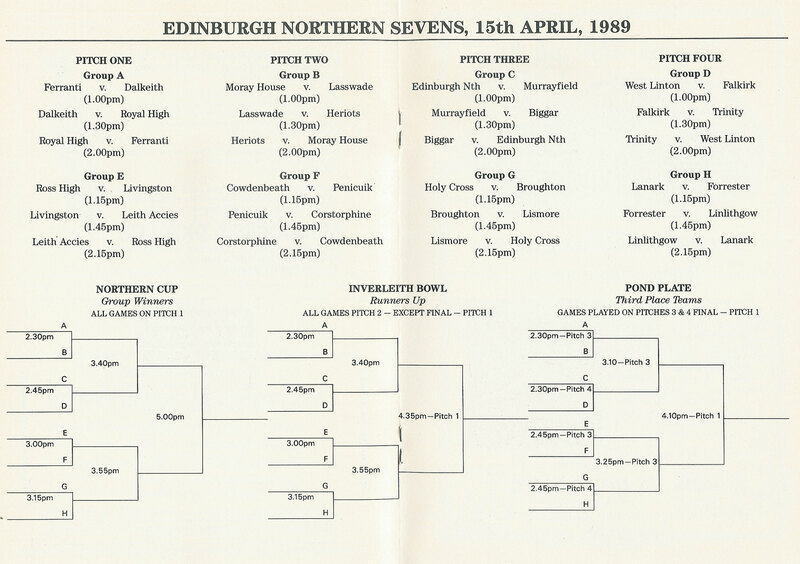 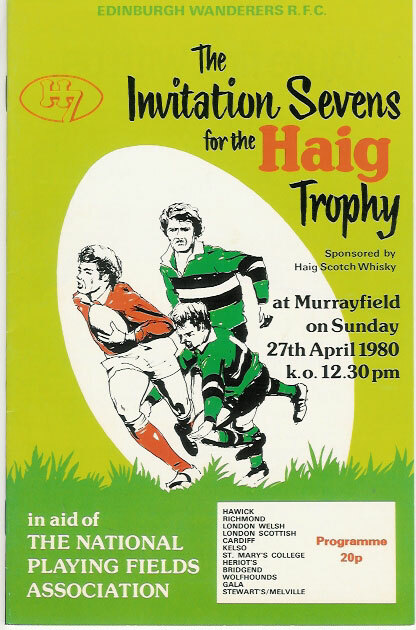 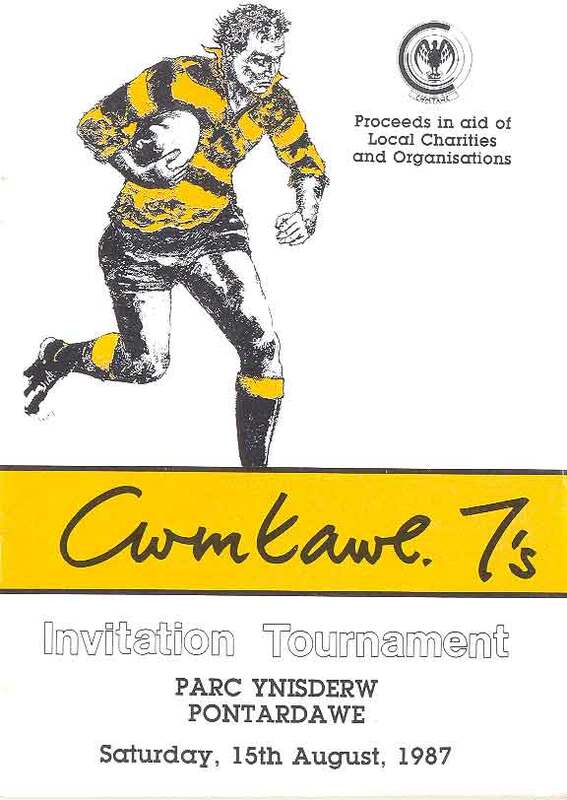 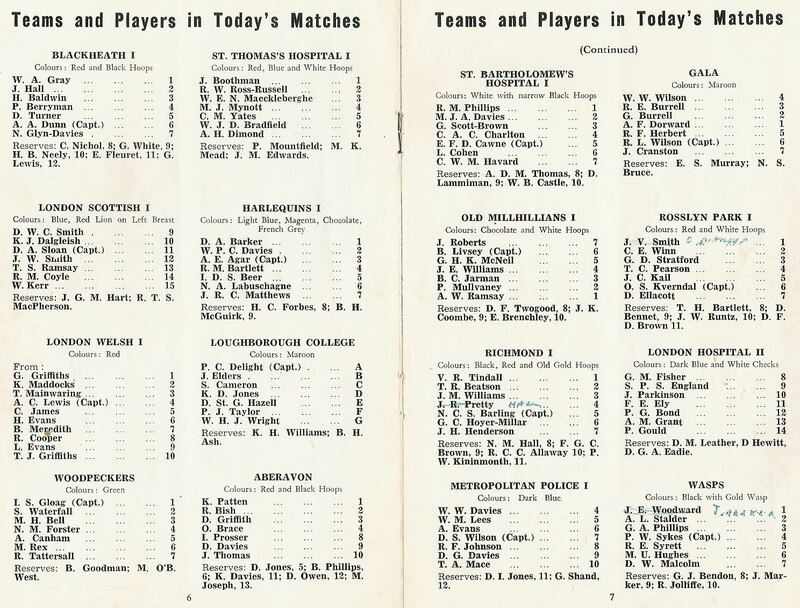 Programmes from the oldest tournament, the Melrose Sevens and other high profile sevens tournaments. 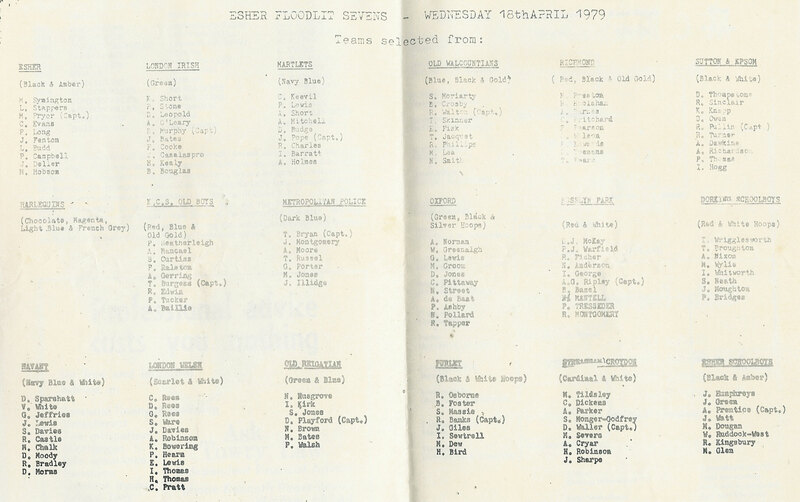 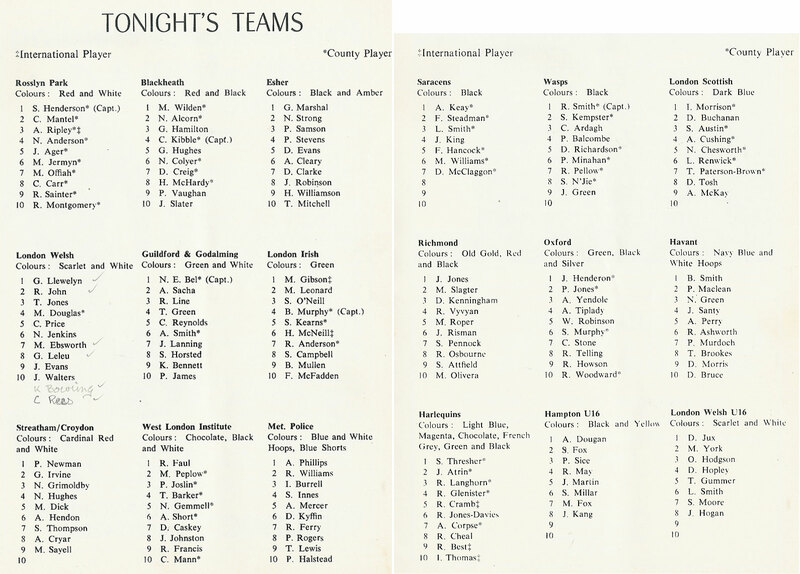 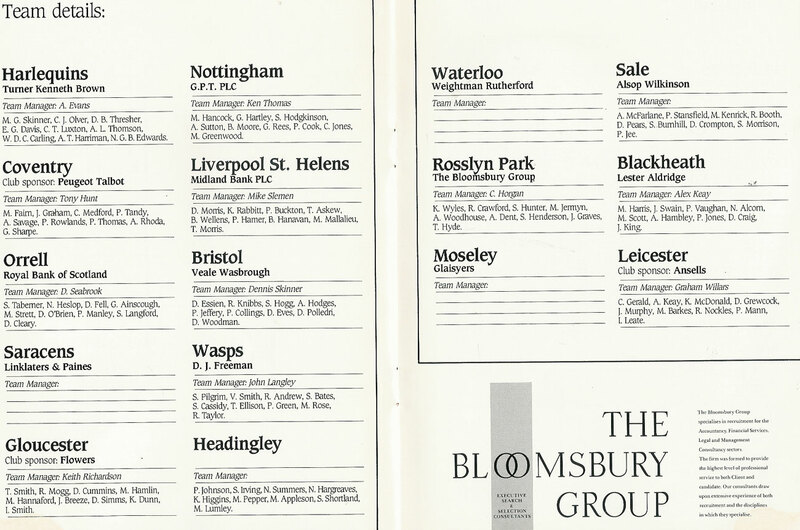 Guest teams: Leicester & Bristol. 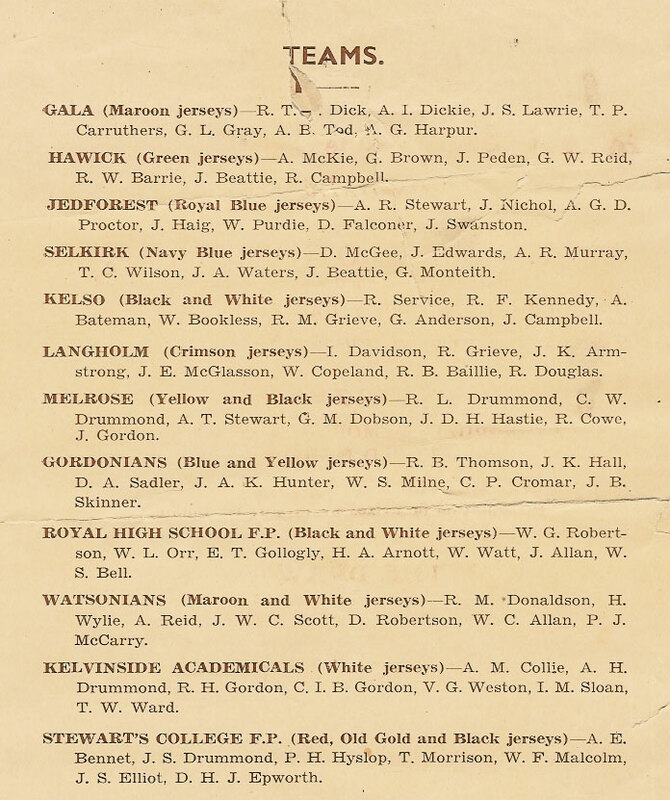 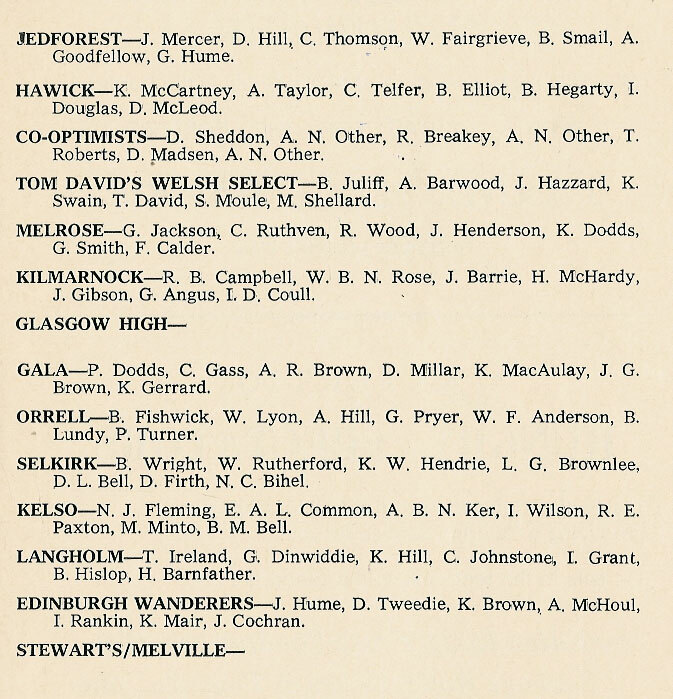 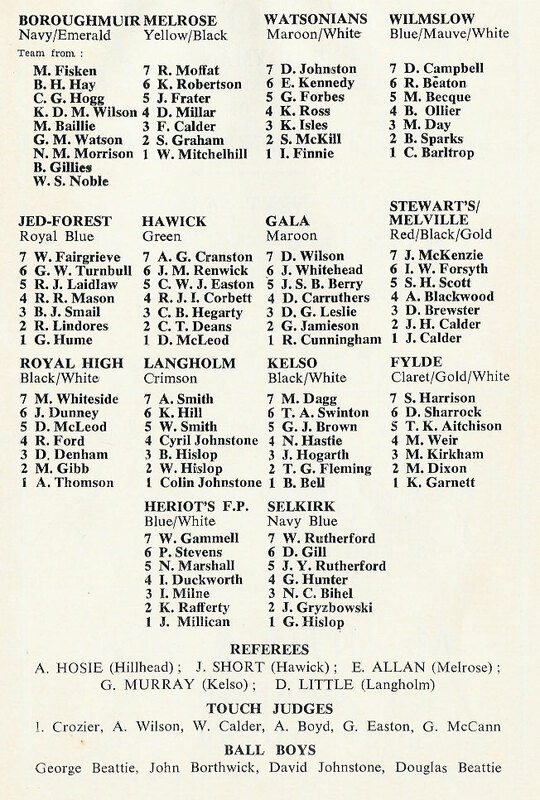 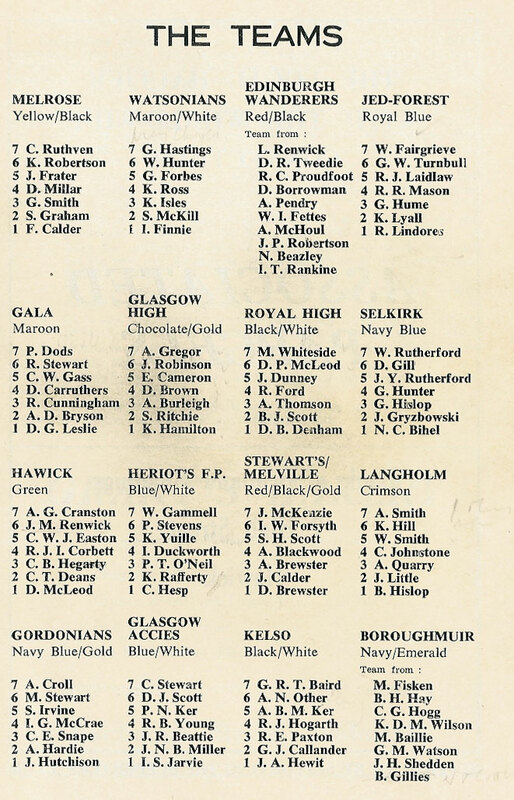 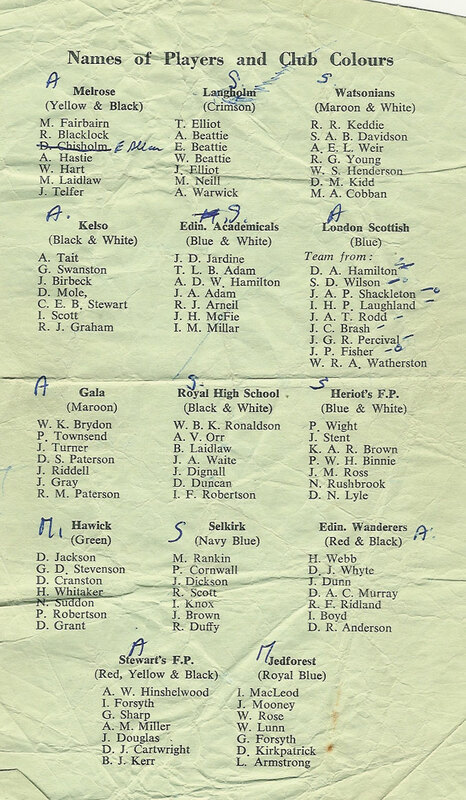 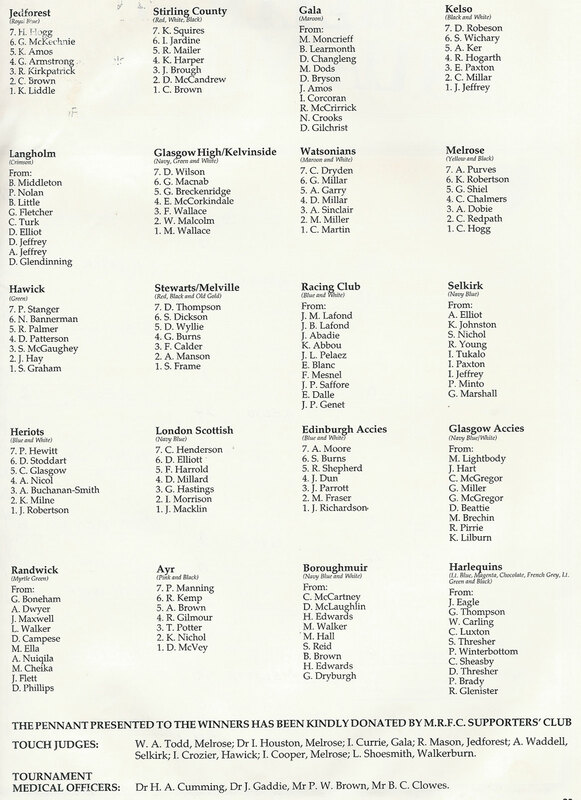 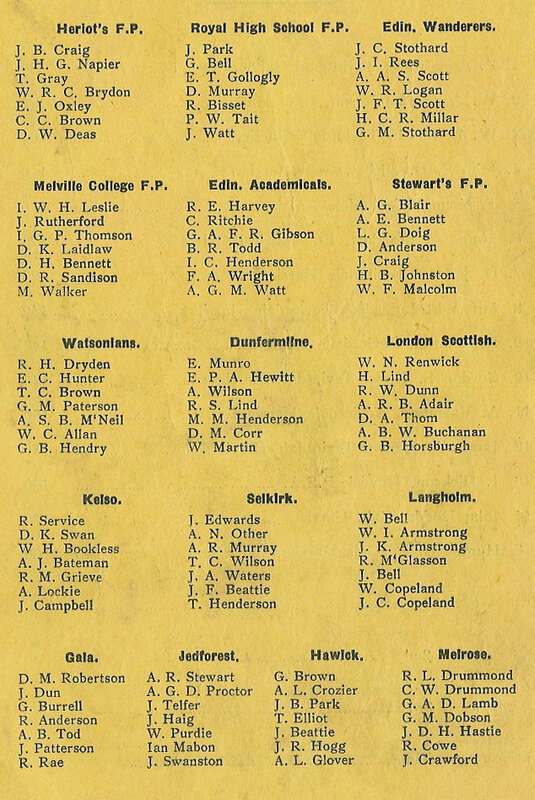 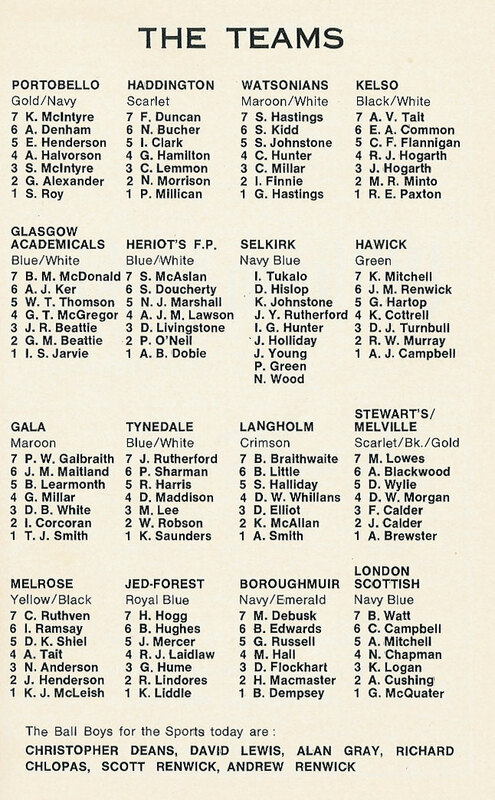 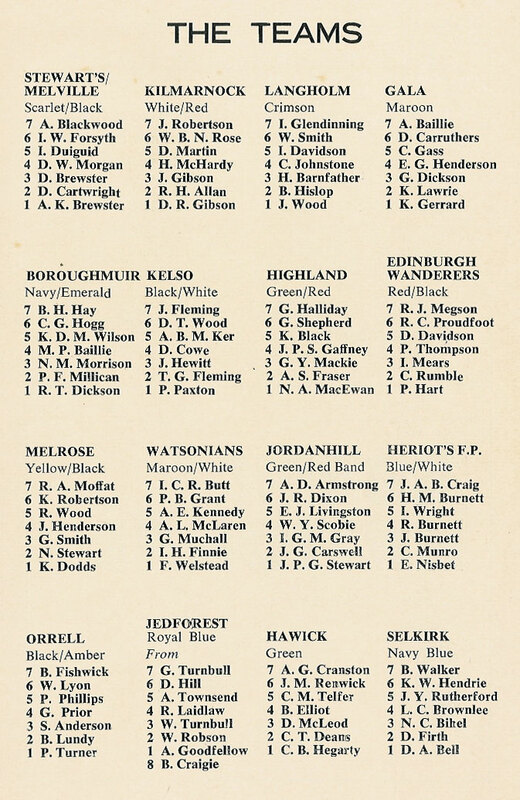 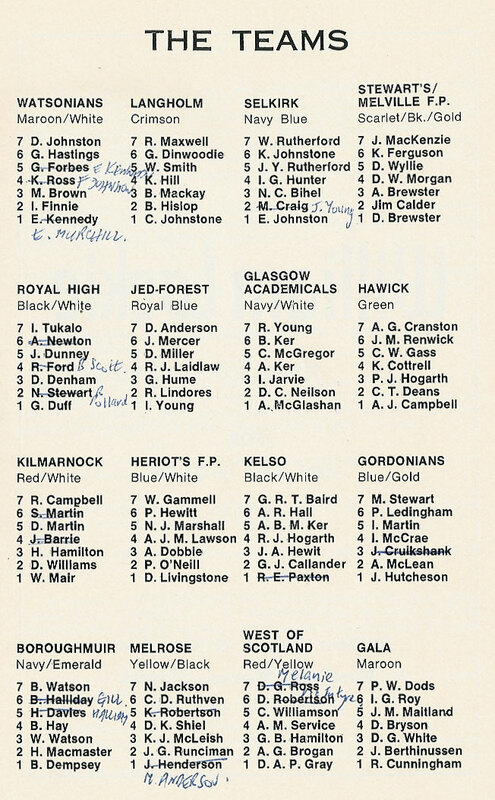 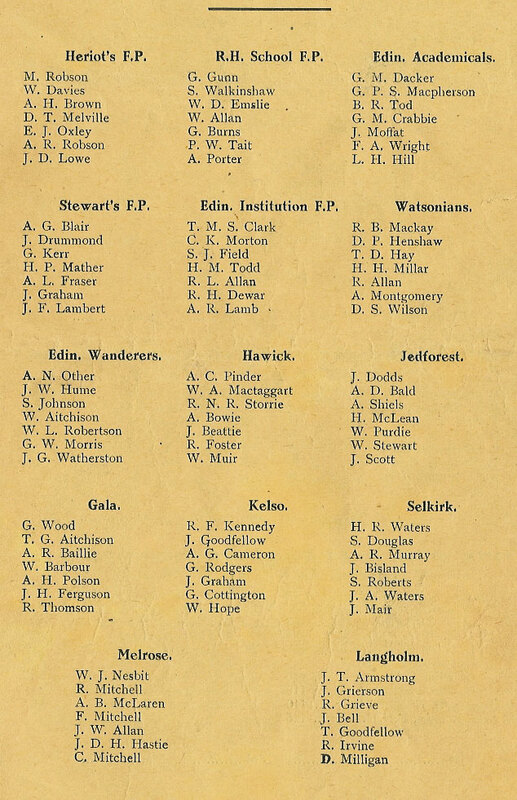 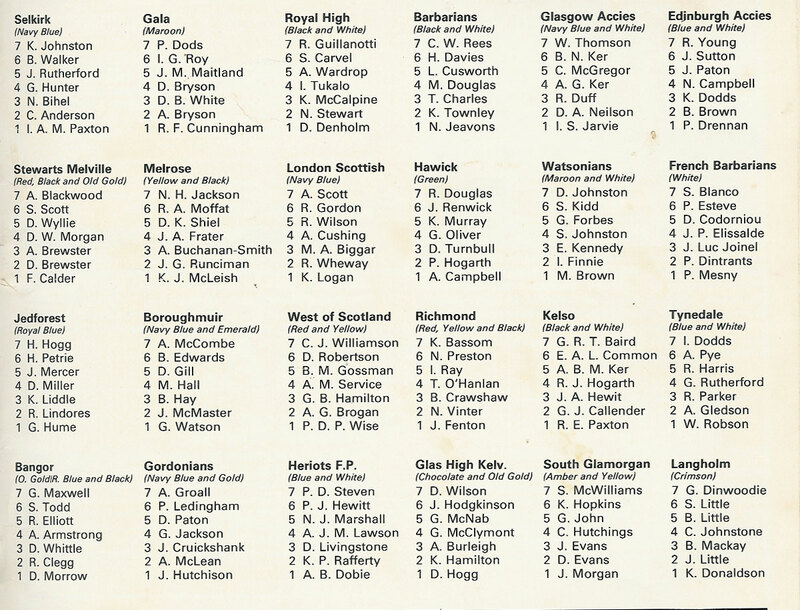 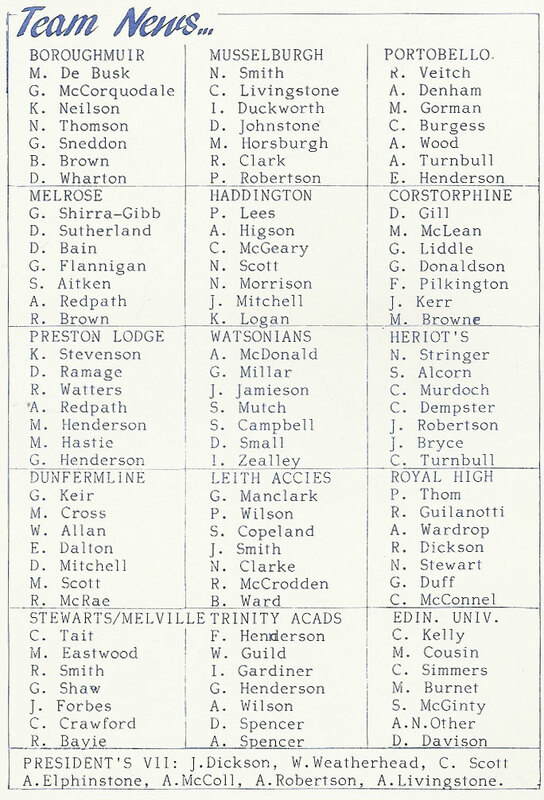 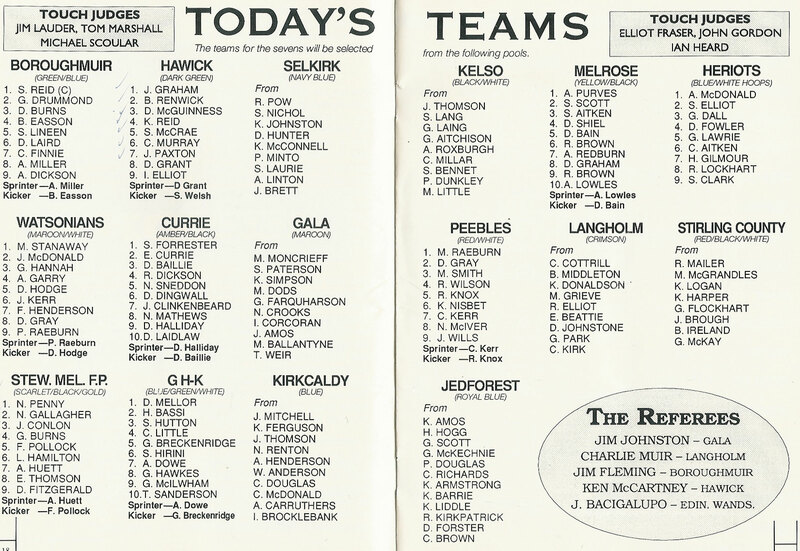 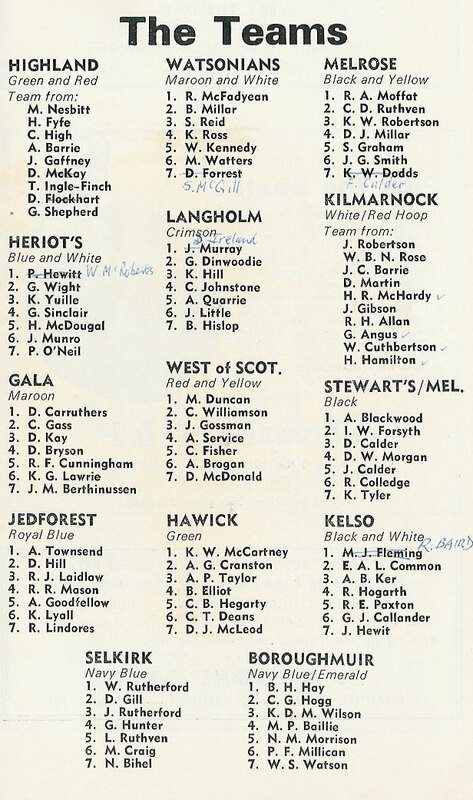 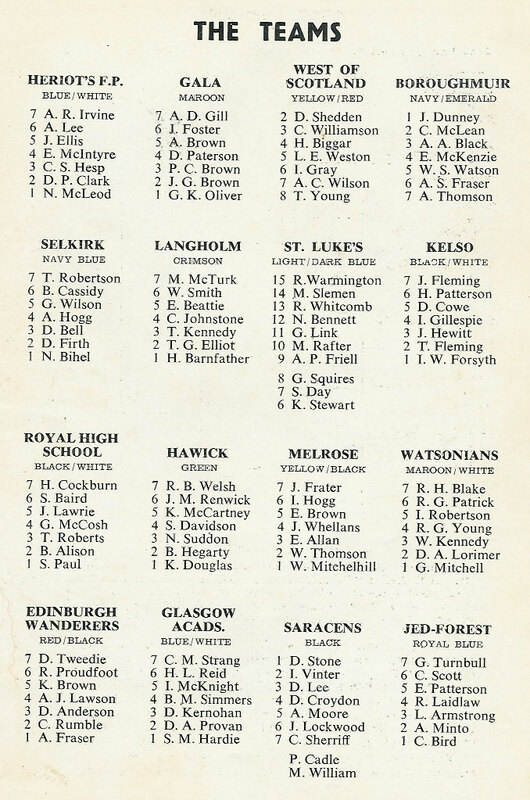 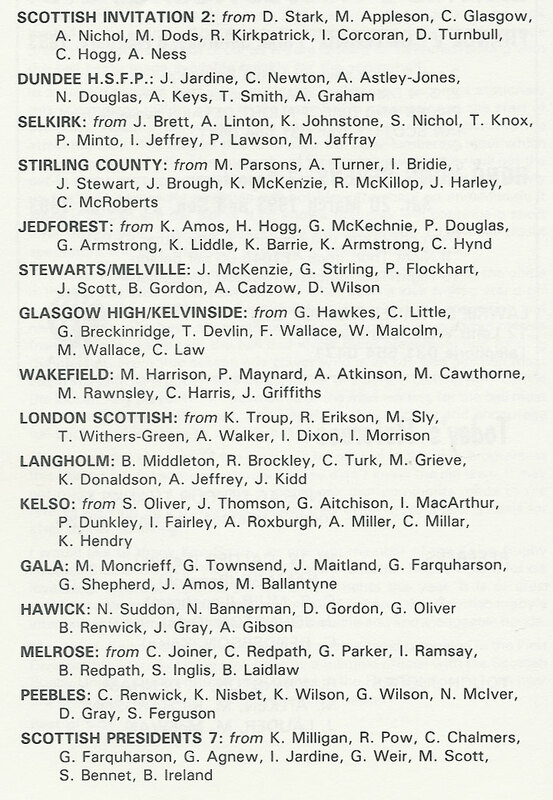 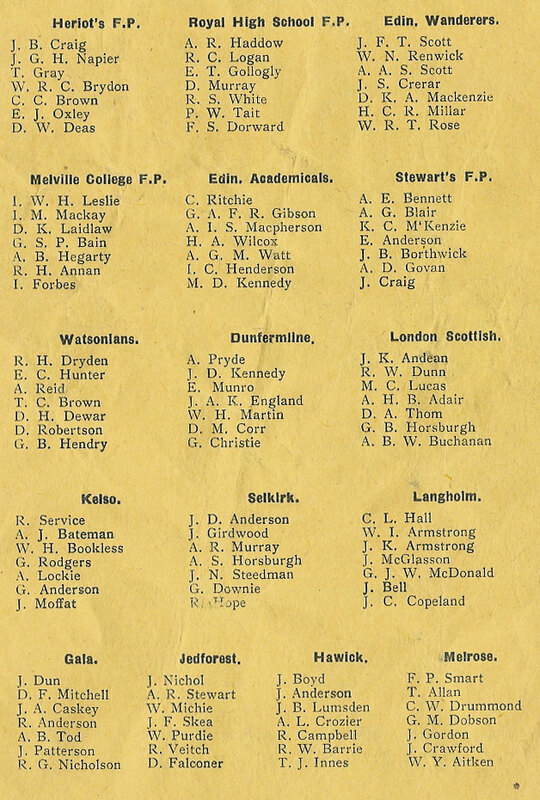 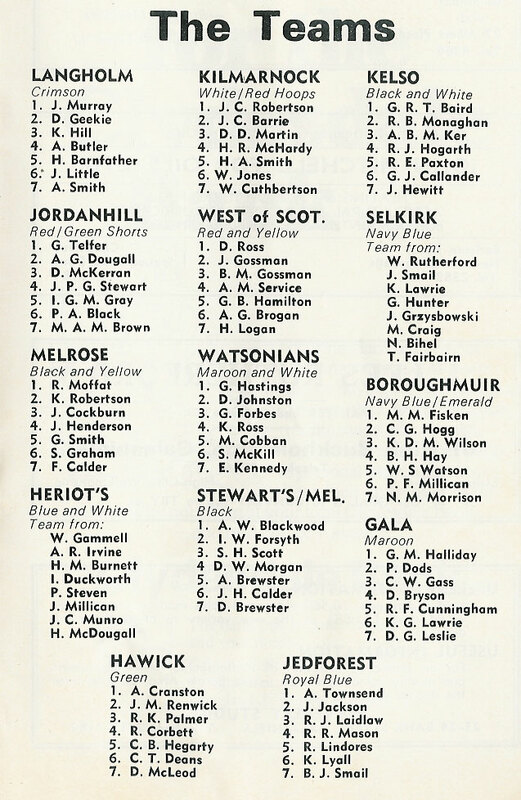 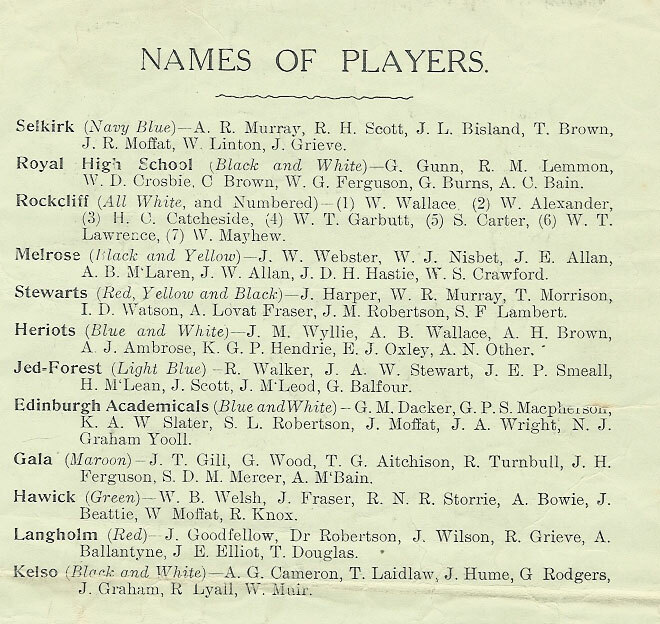 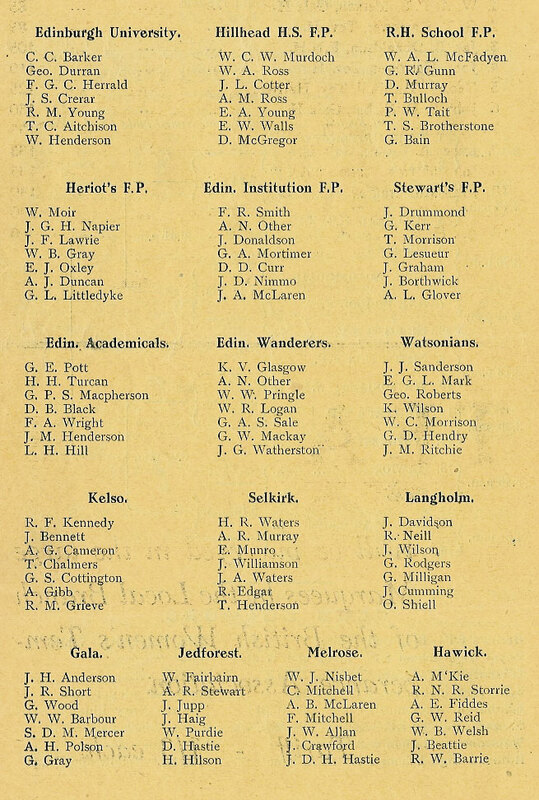 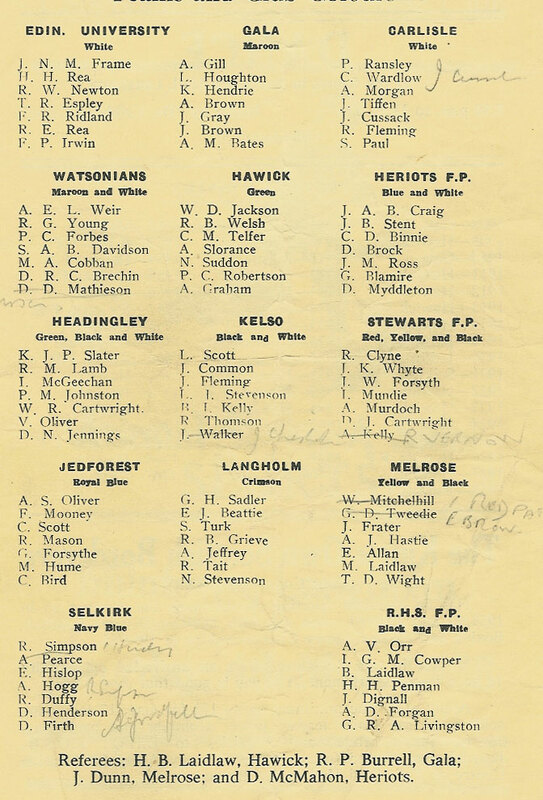 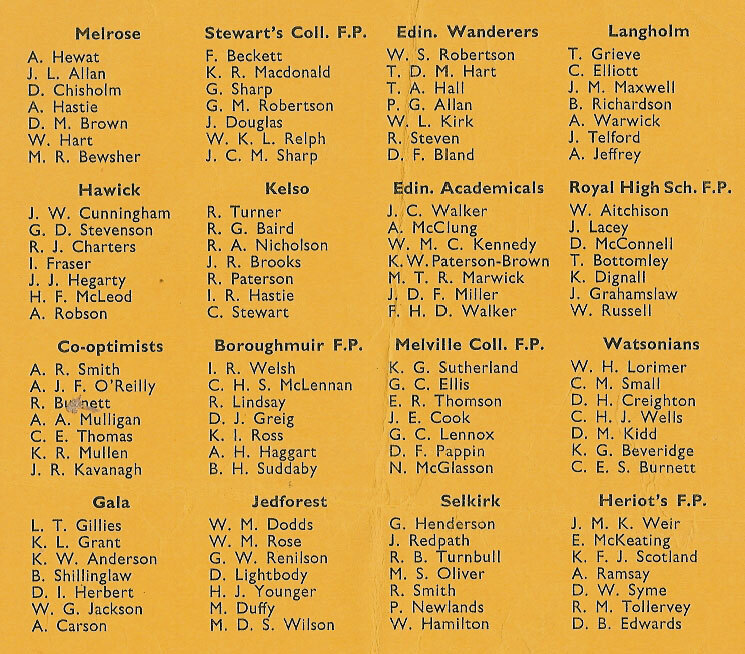 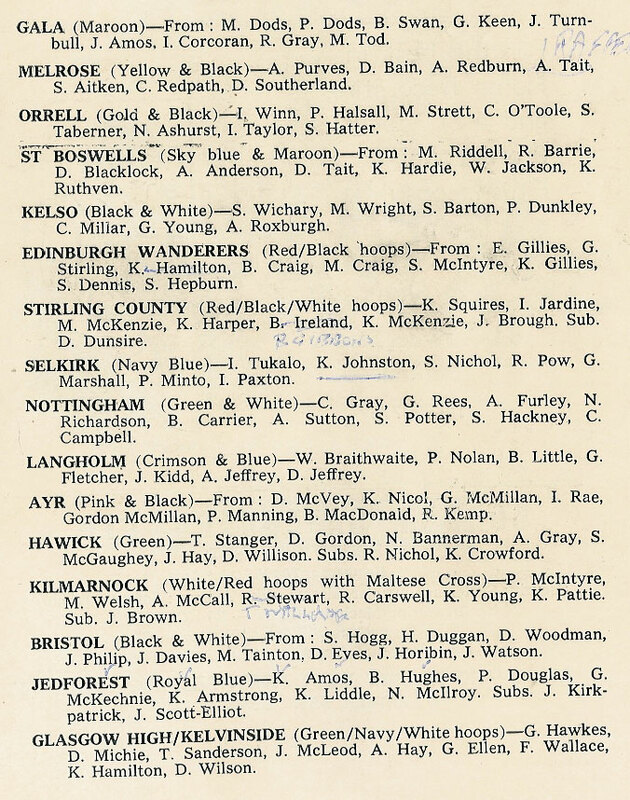 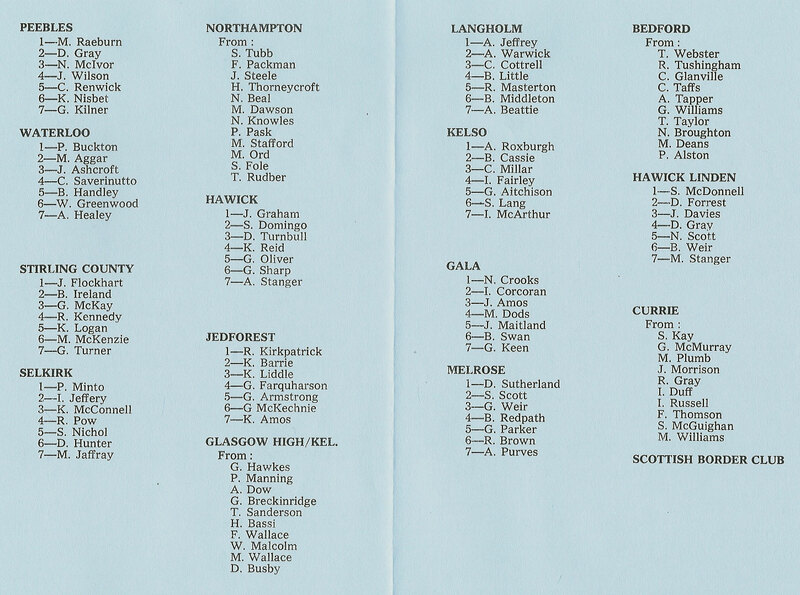 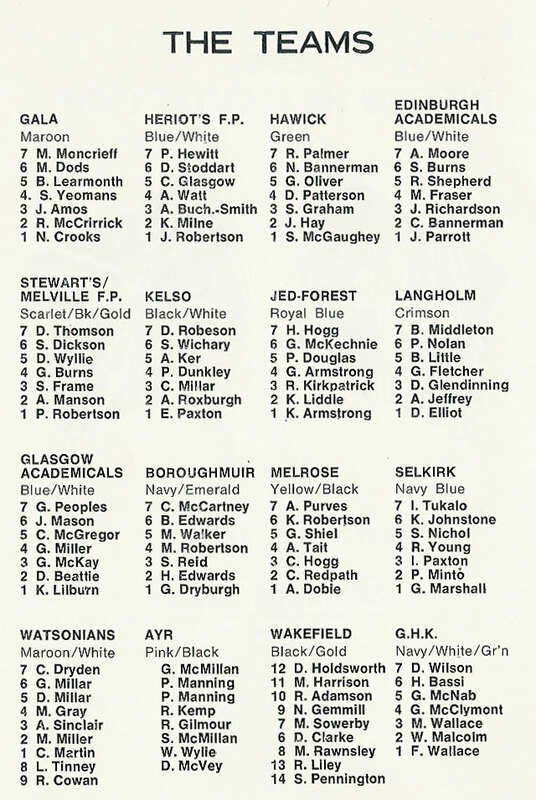 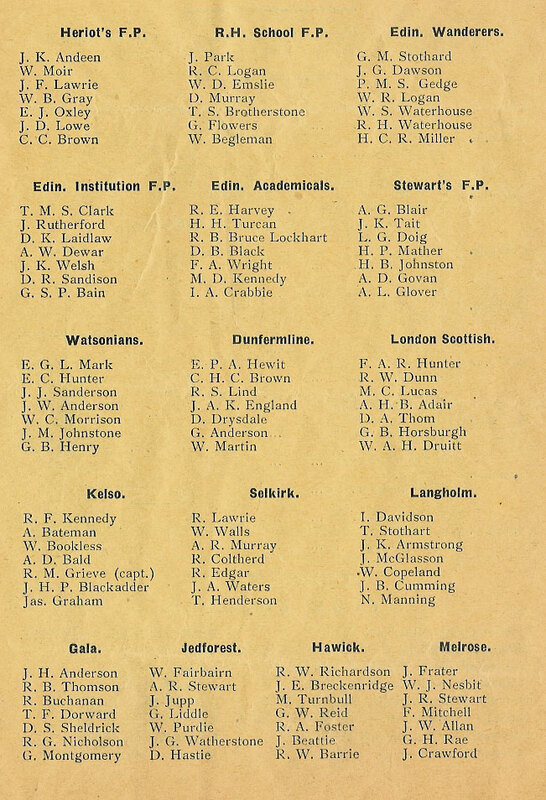 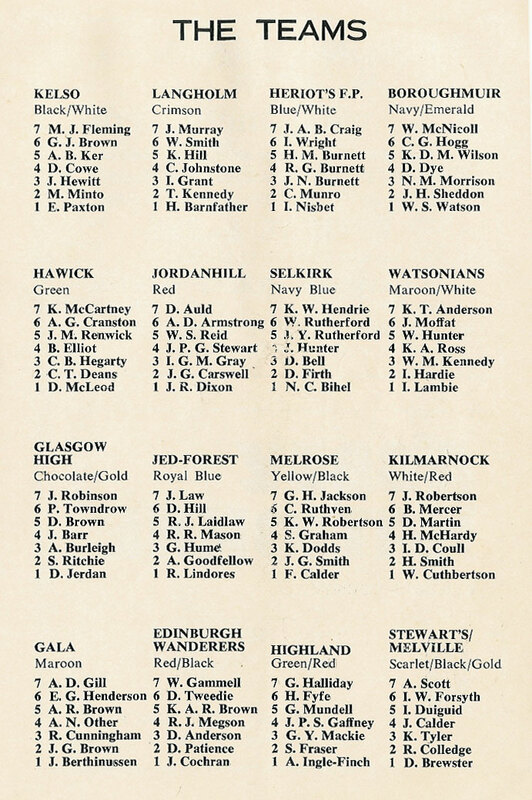 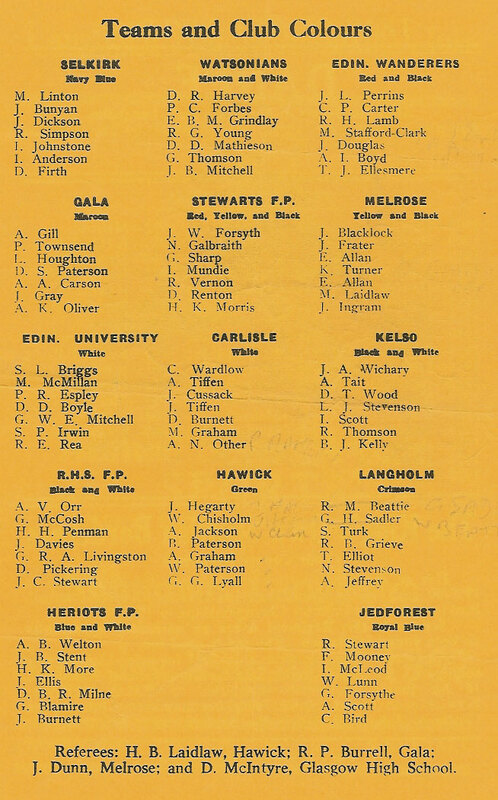 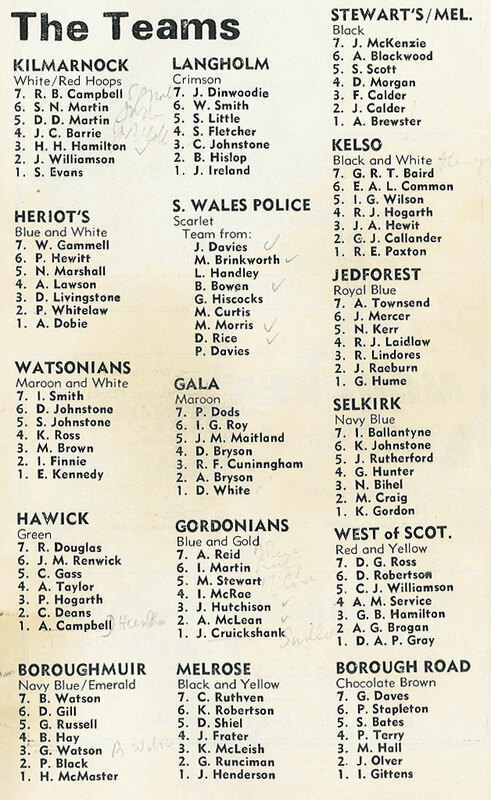 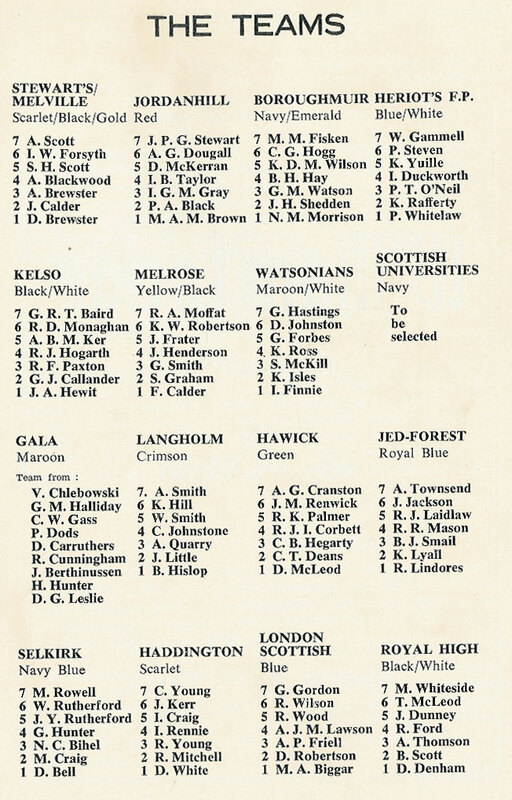 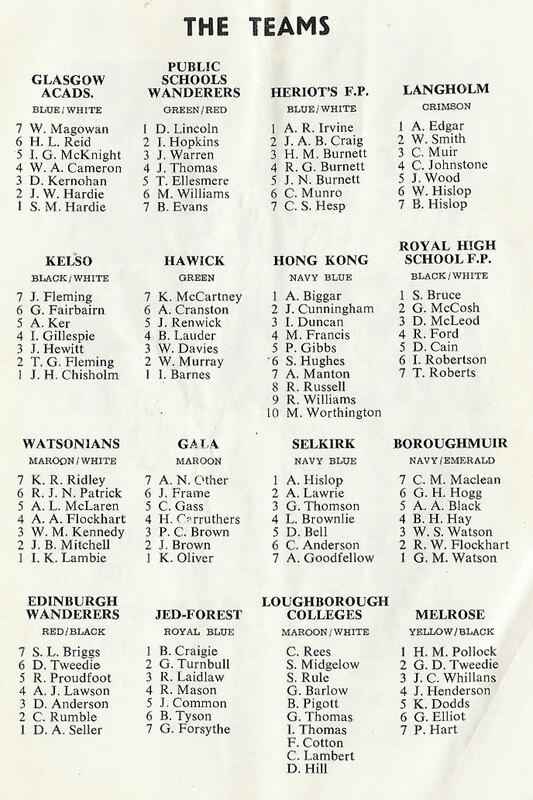 Competing teams - Melrose, Royal HSFP, Gala, Institution FP, Watsonians, Jedforest, Stewarts FP, Heriots FP, Selkirk, Edinburgh Accies, Kelso, Edinburgh Wands, Hawick, Langholm. 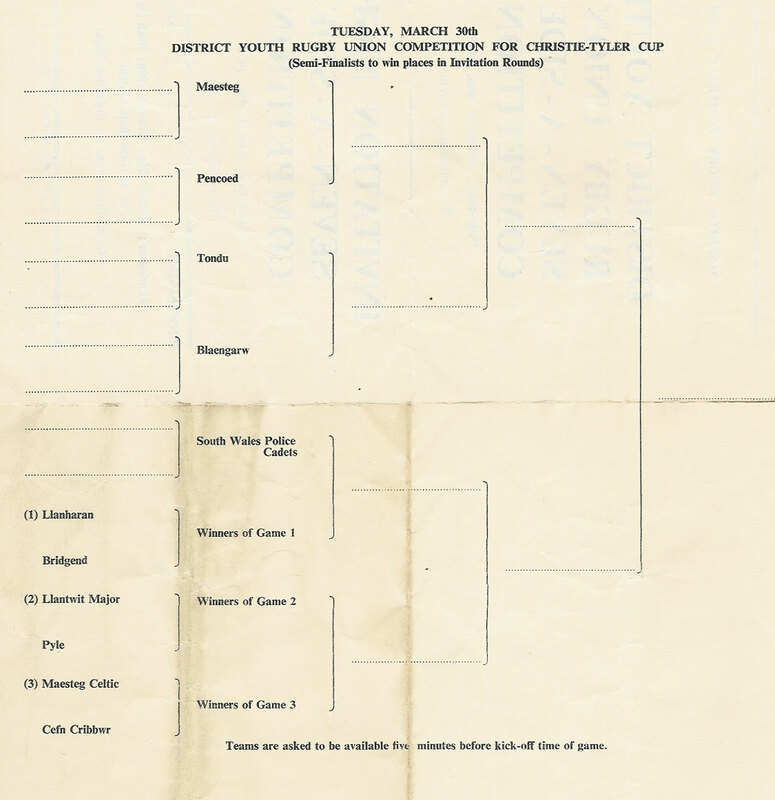 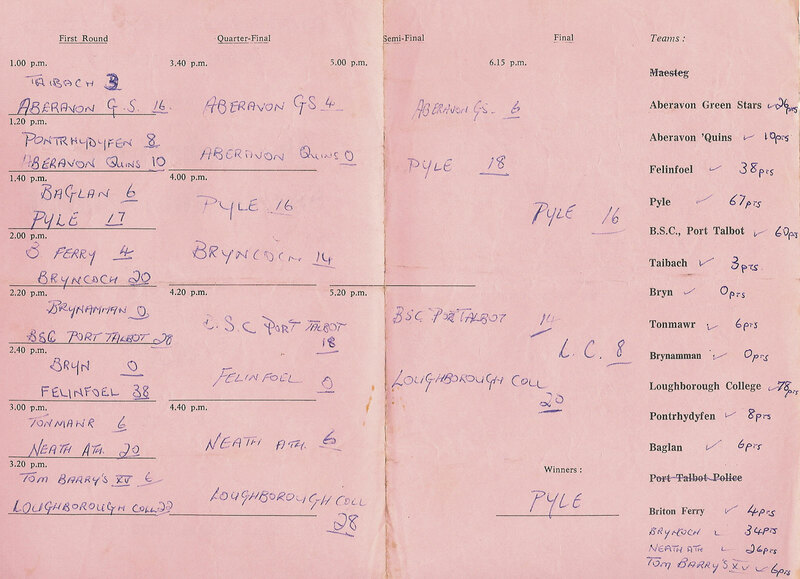 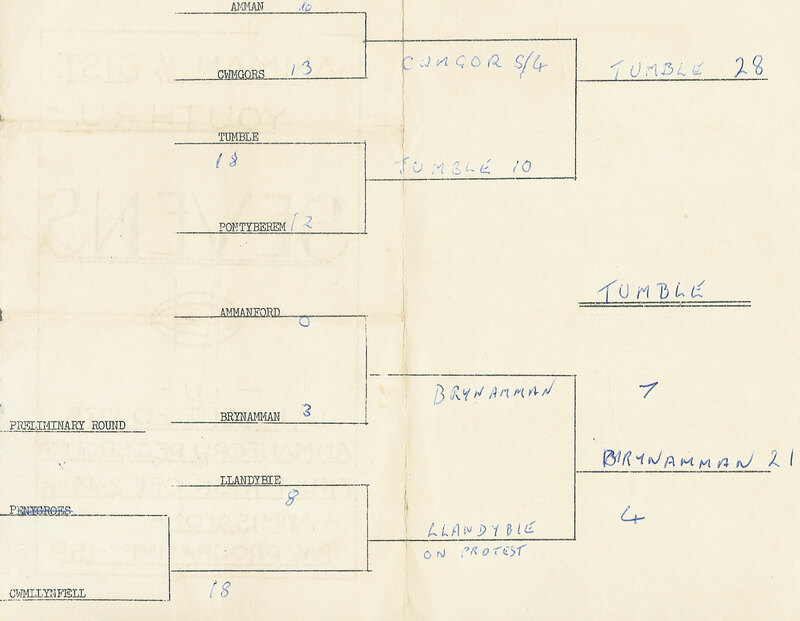 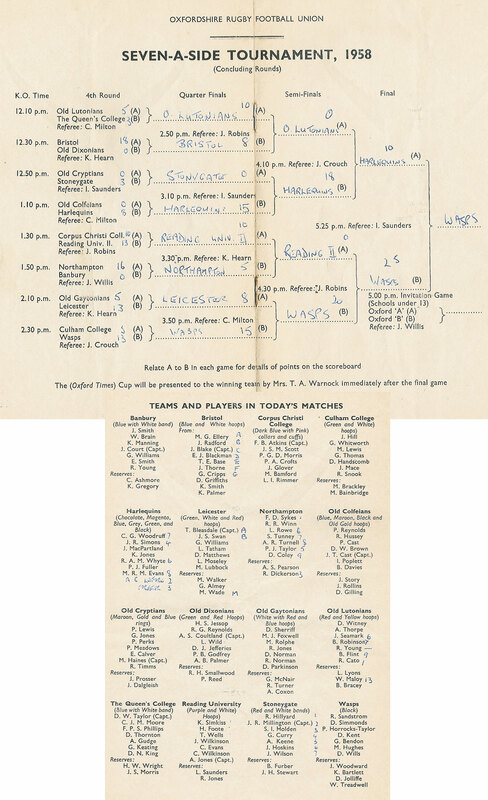 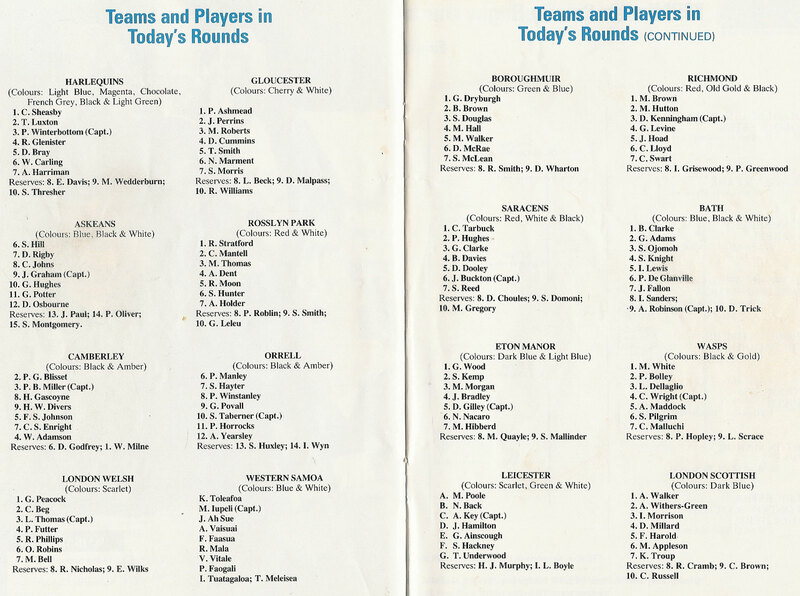 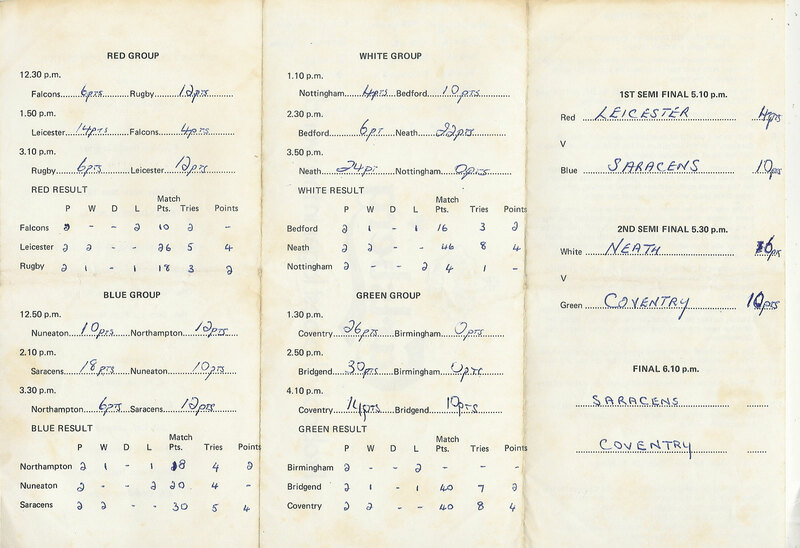 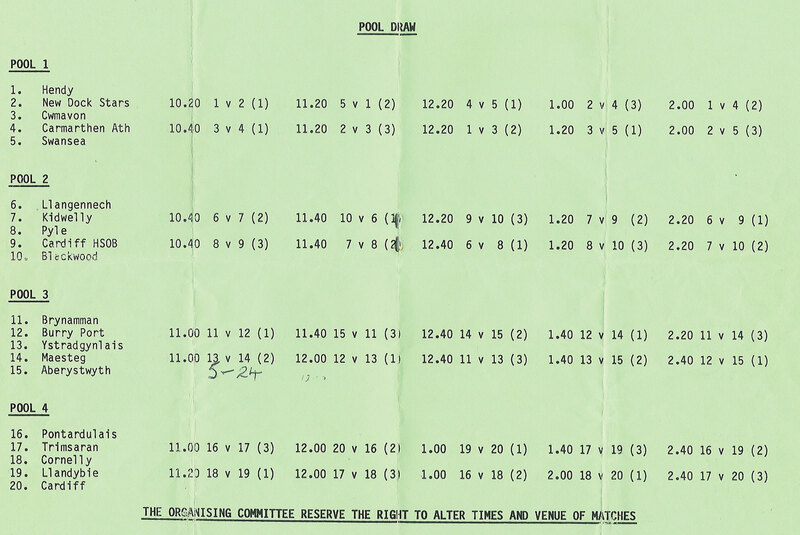 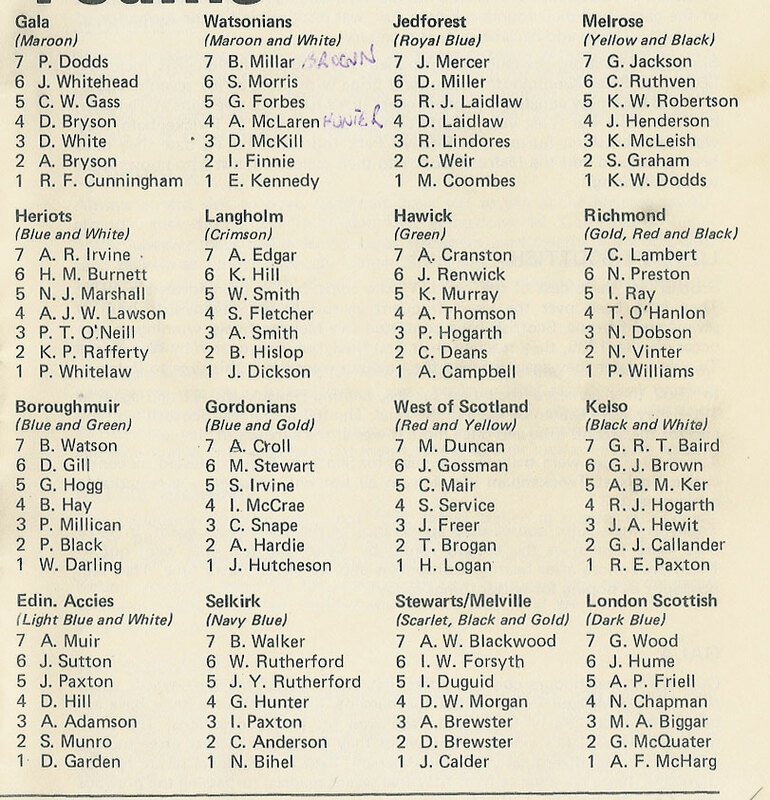 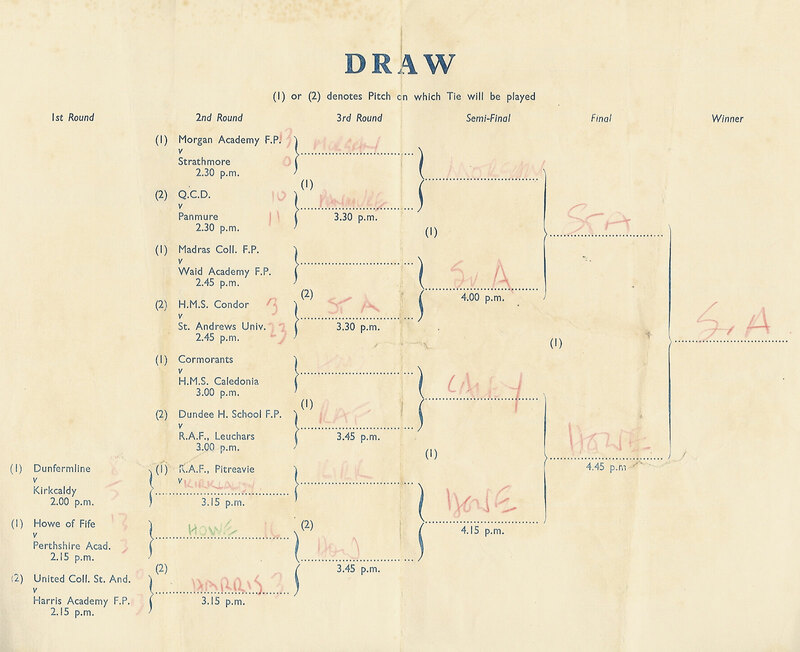 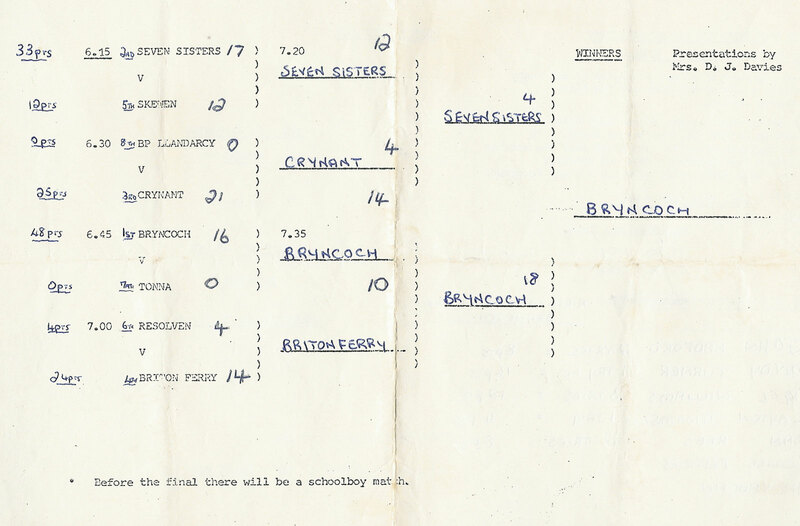 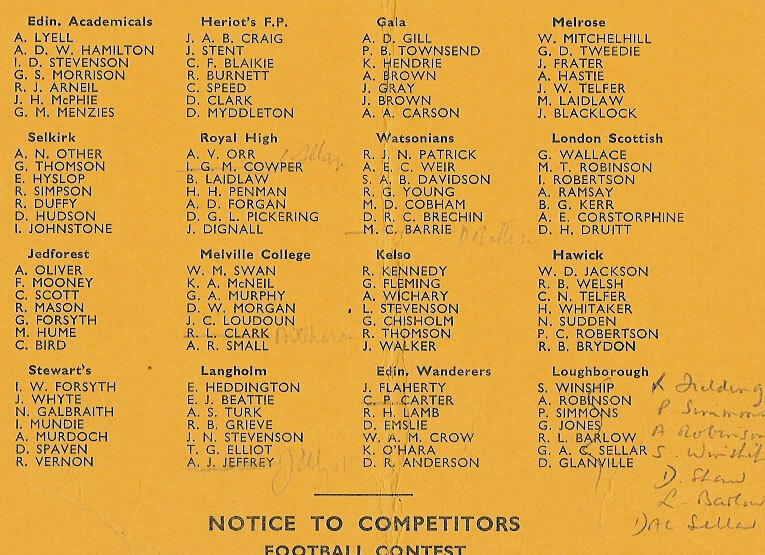 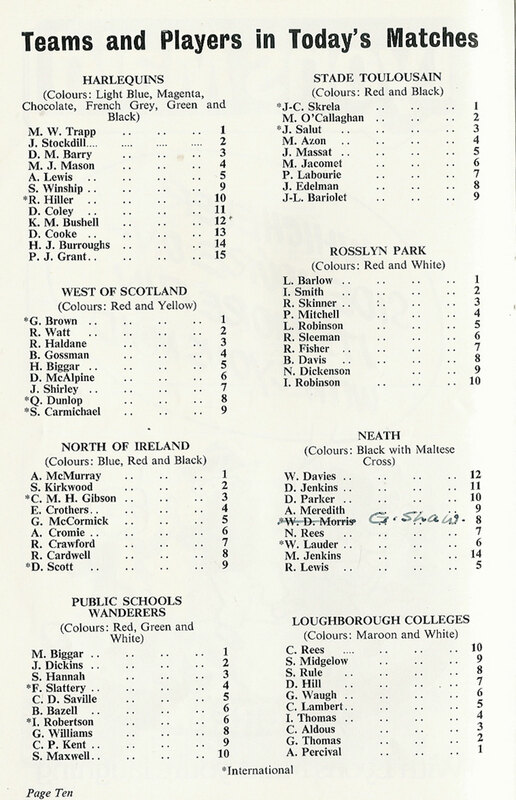 1968 Winners - Loughborough Coll. 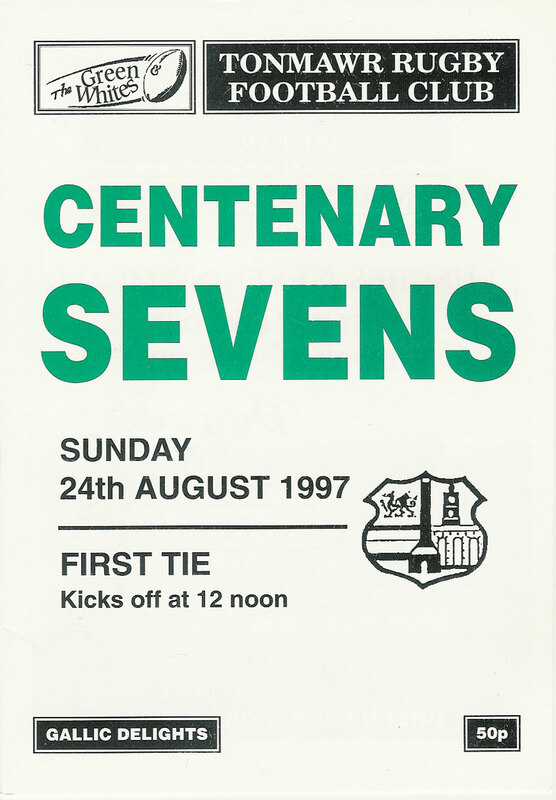 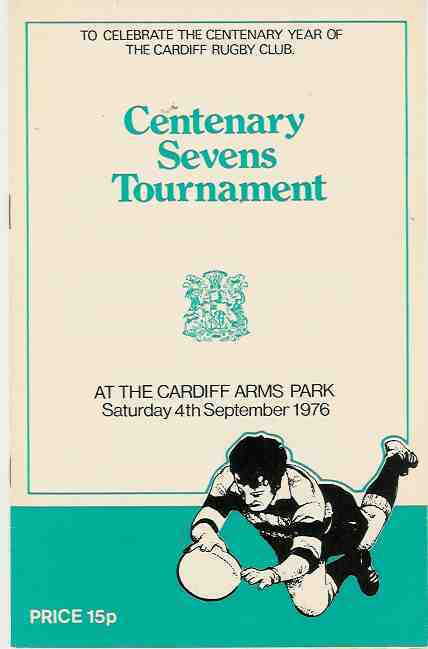 Centenary Sevens - A4 size, 56 page brochure with historical articles relating to the history of the world's oldest sevens tournament. 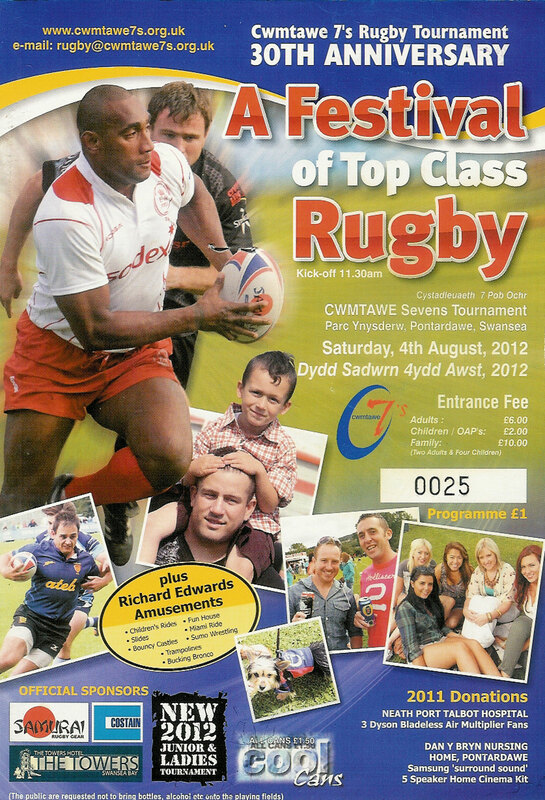 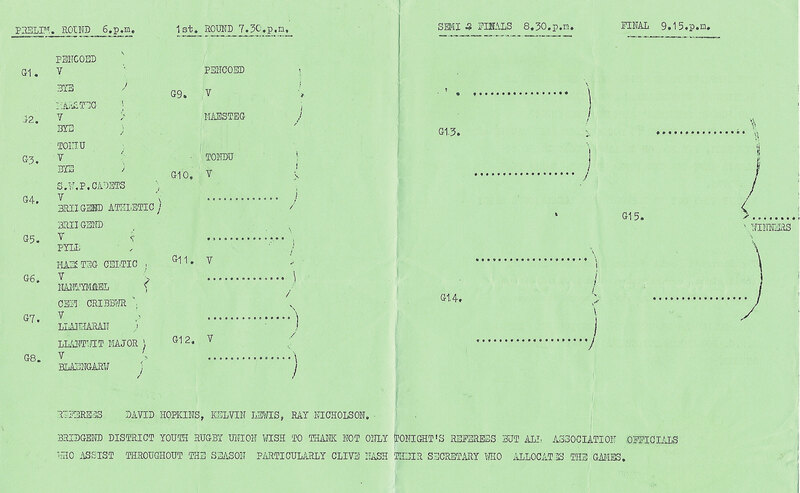 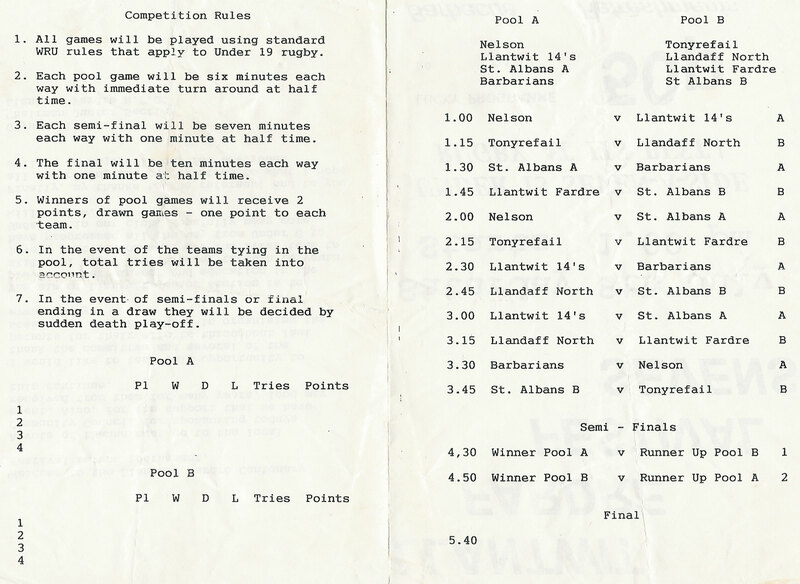 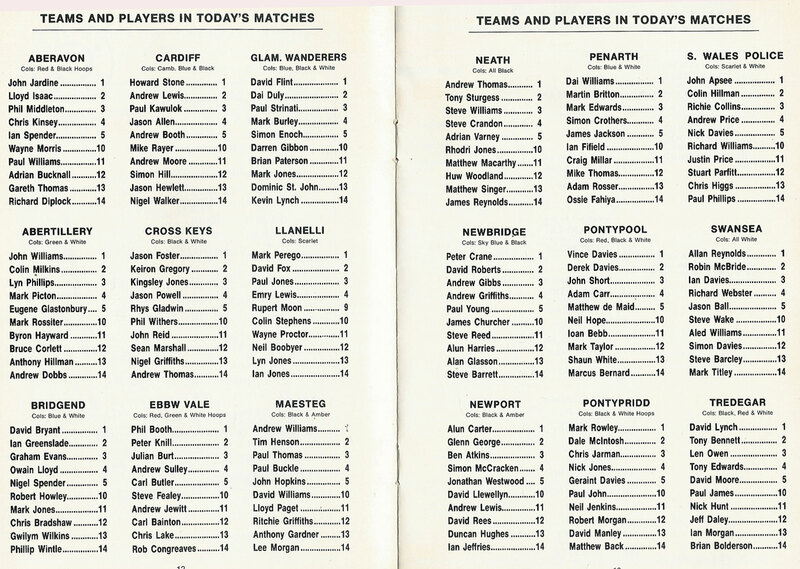 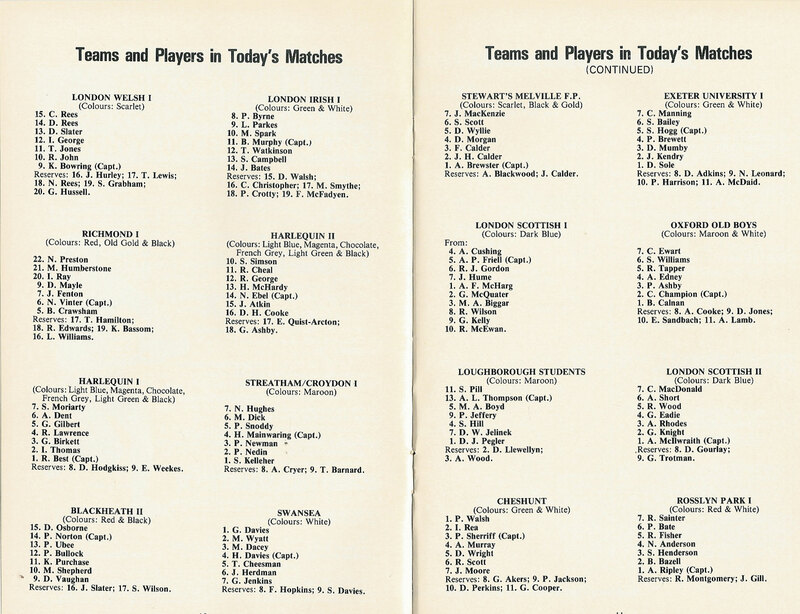 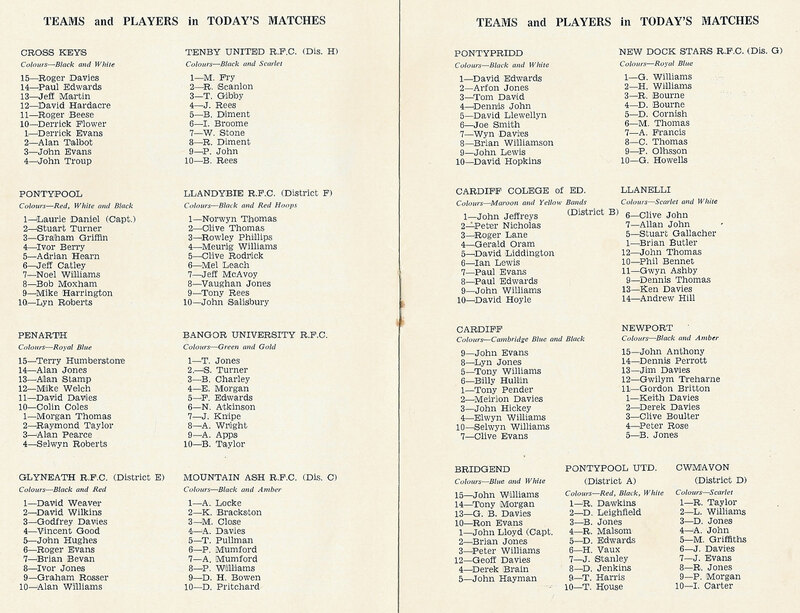 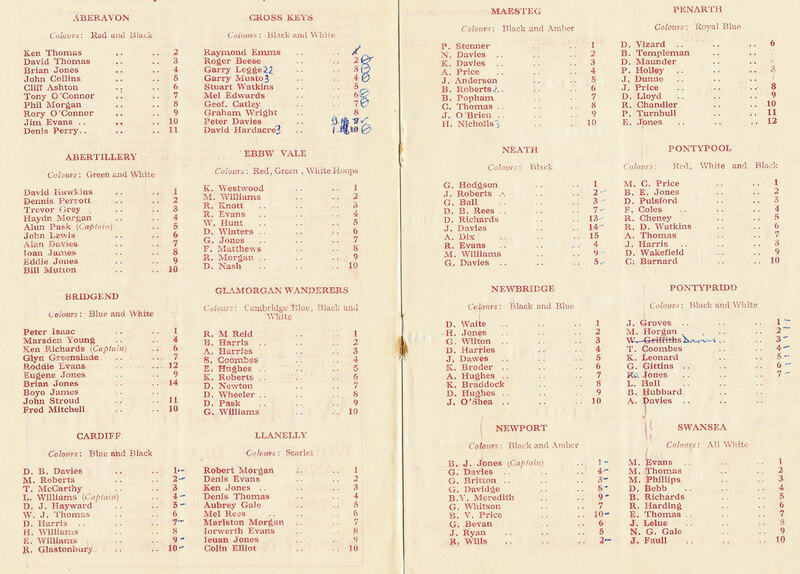 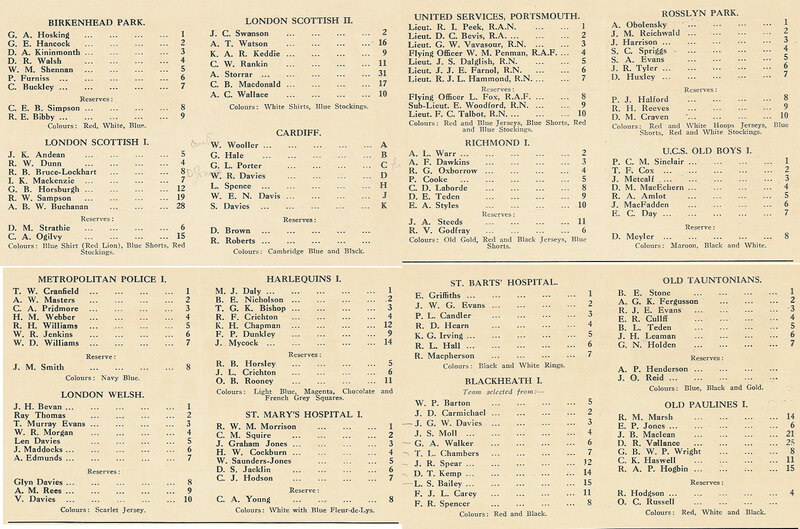 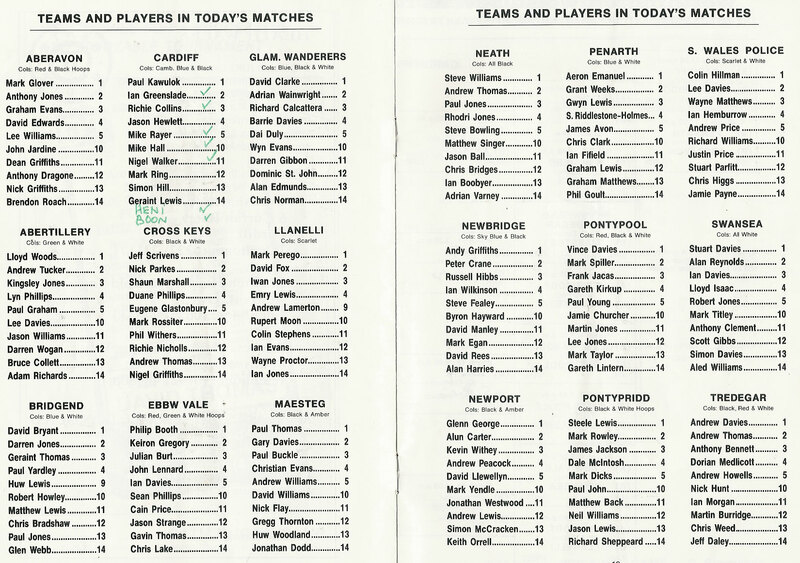 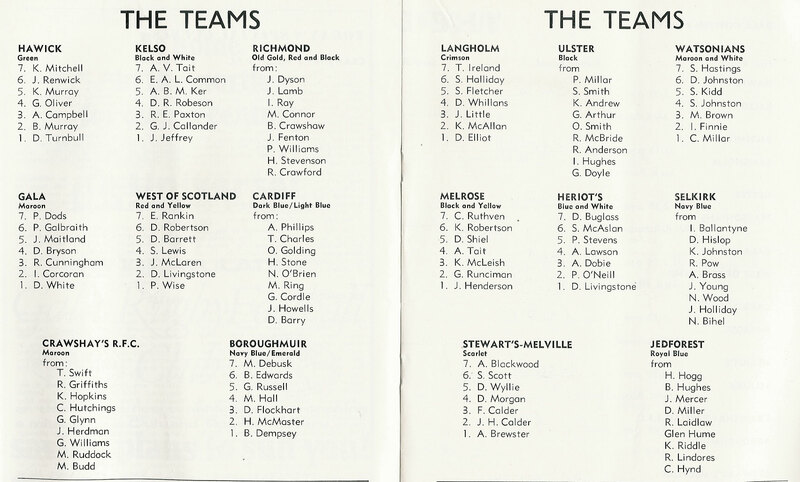 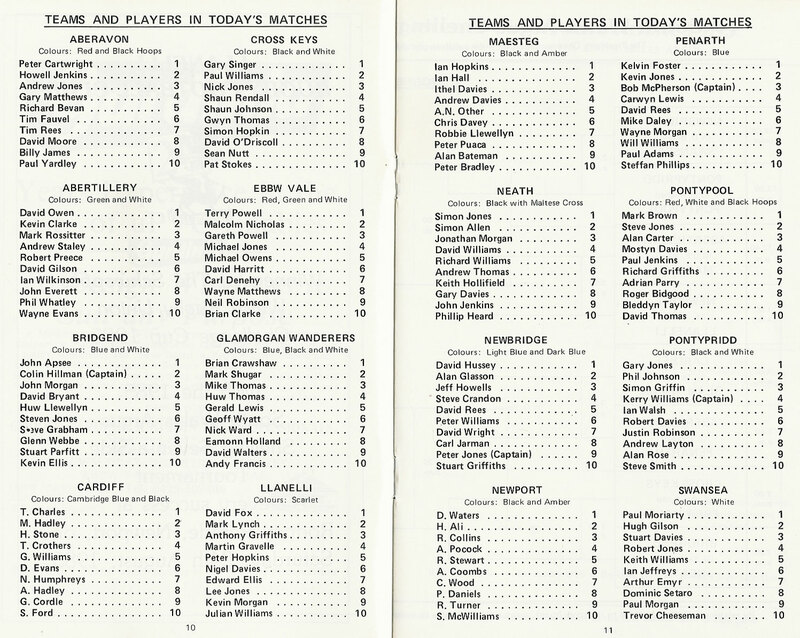 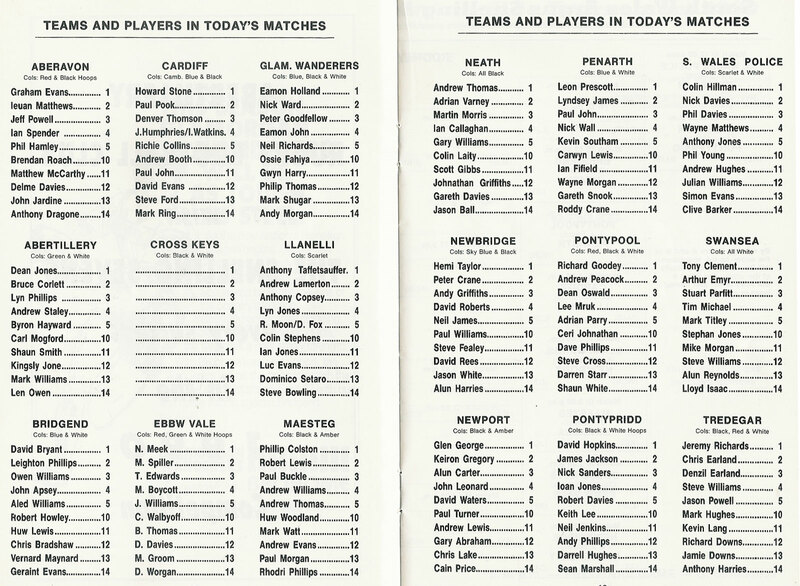 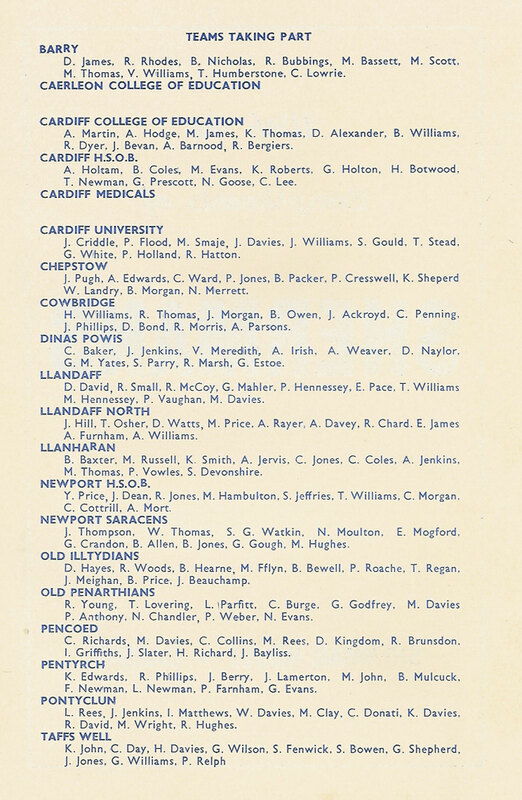 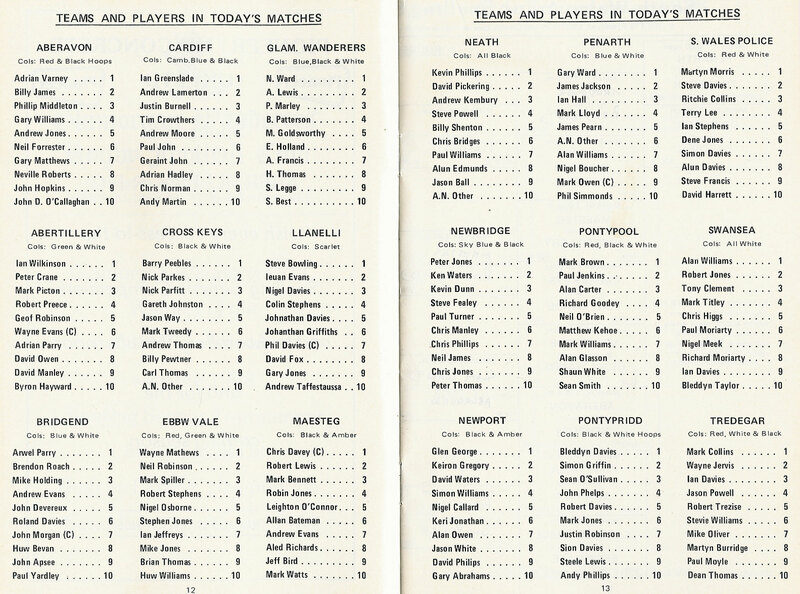 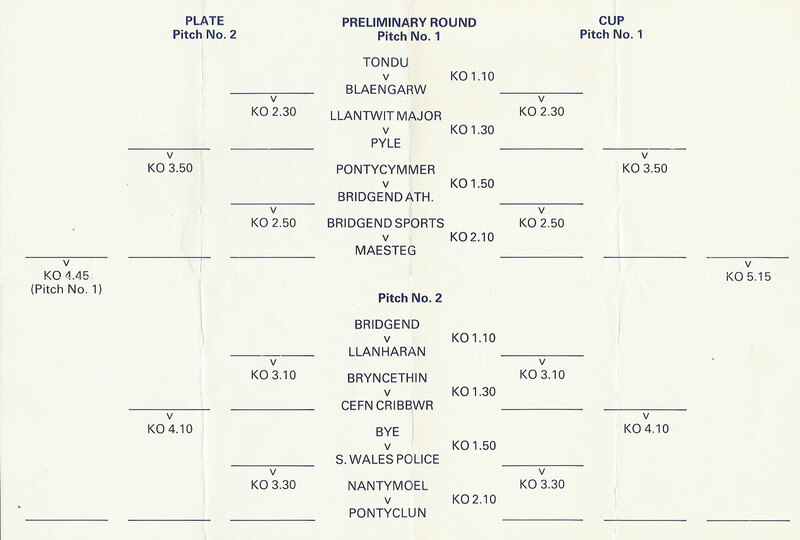 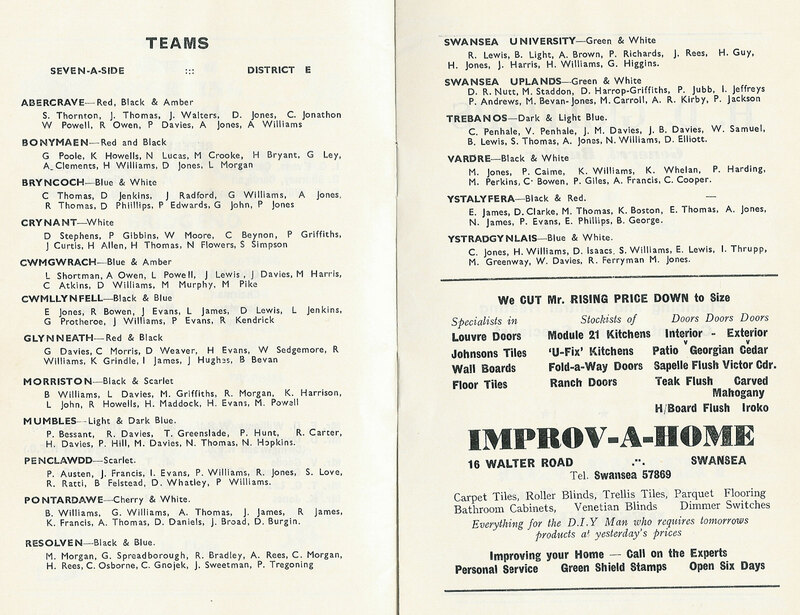 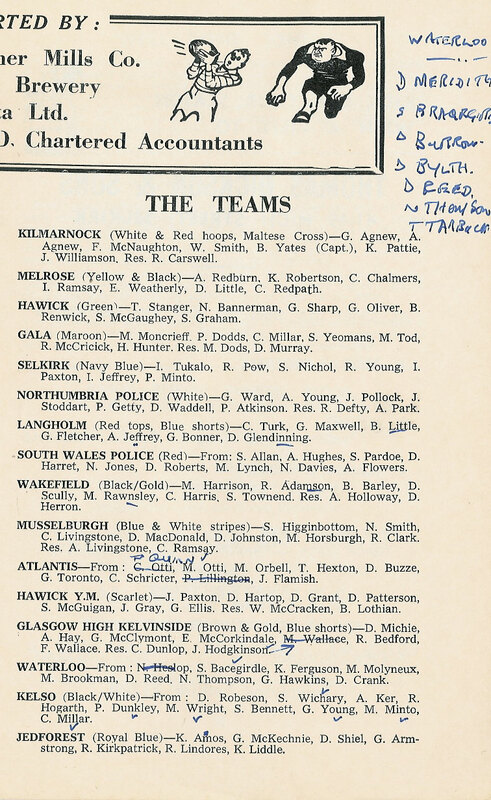 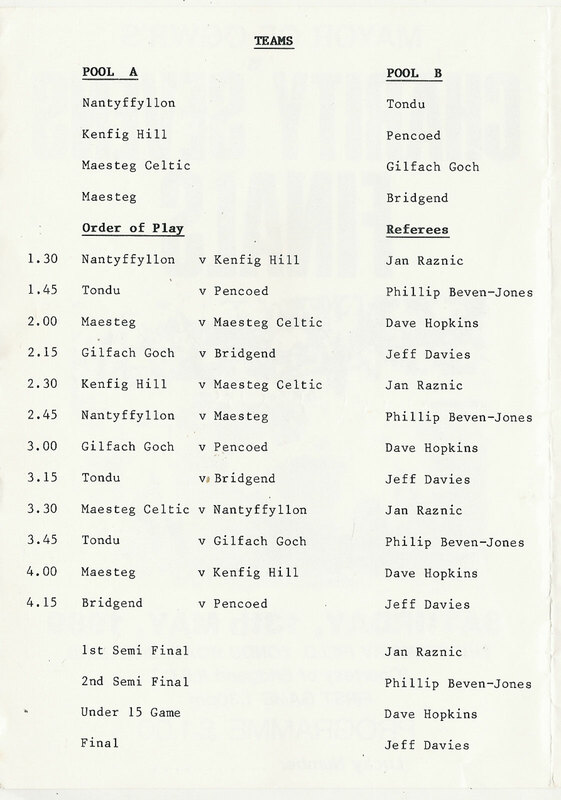 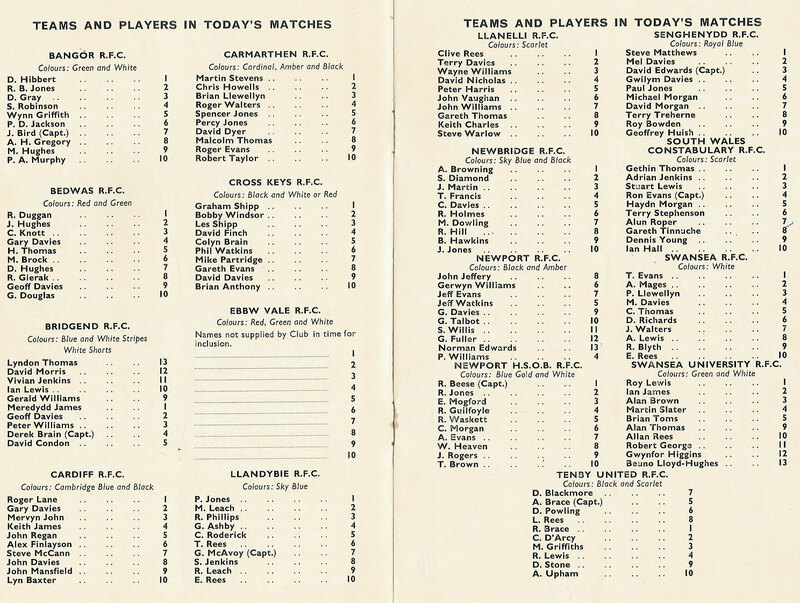 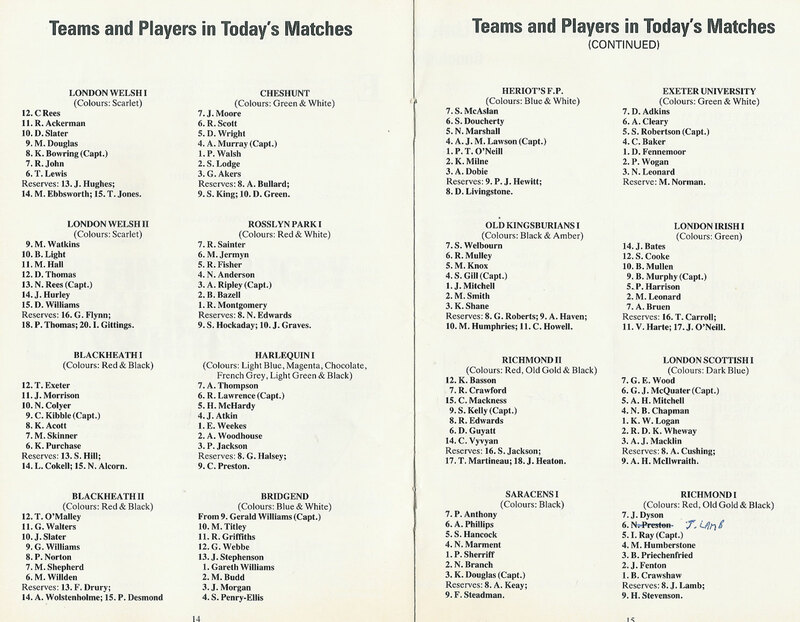 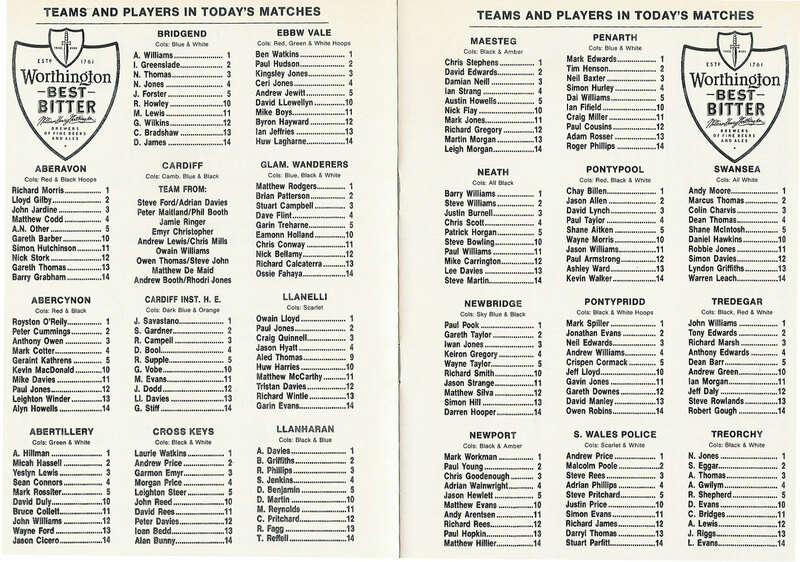 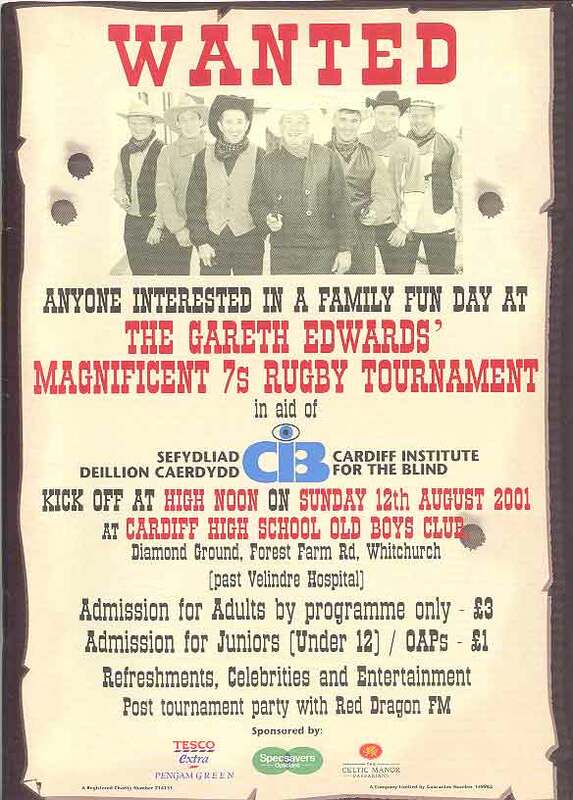 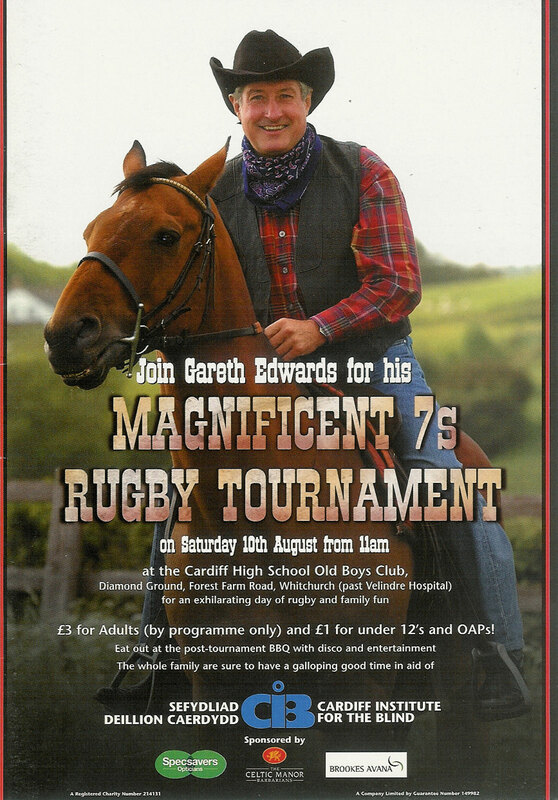 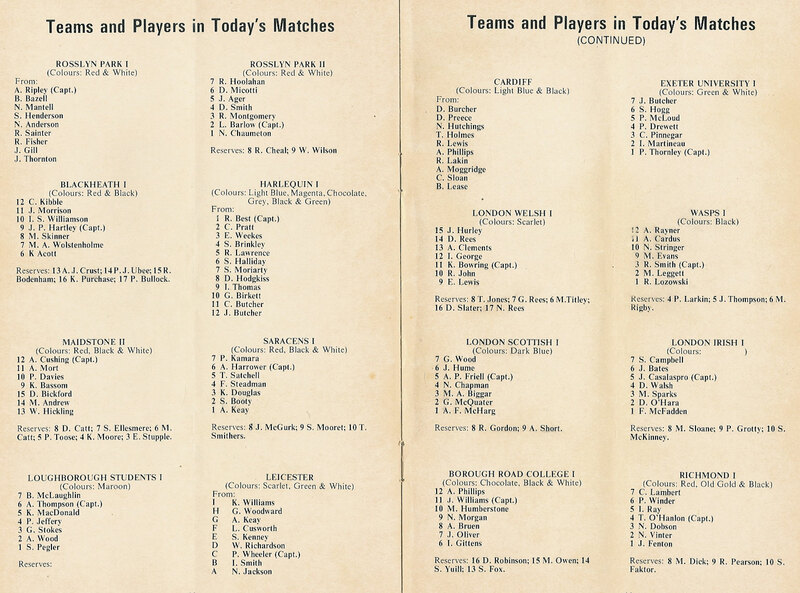 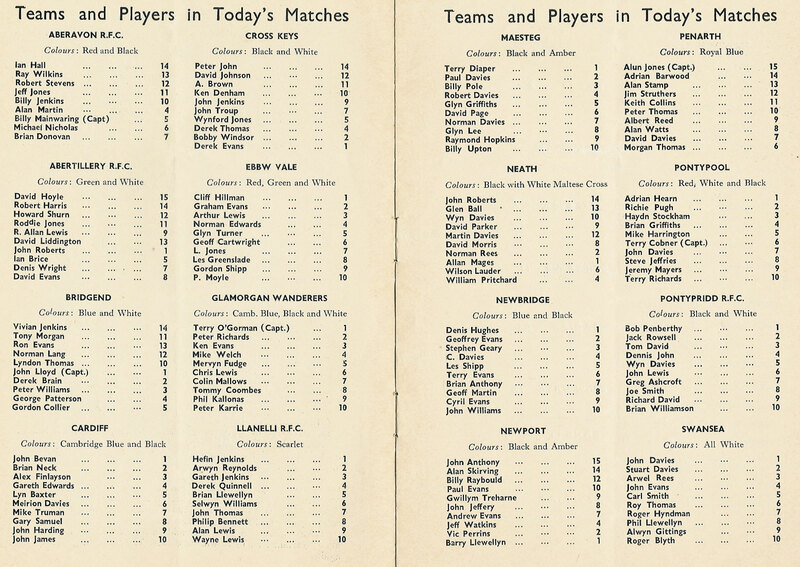 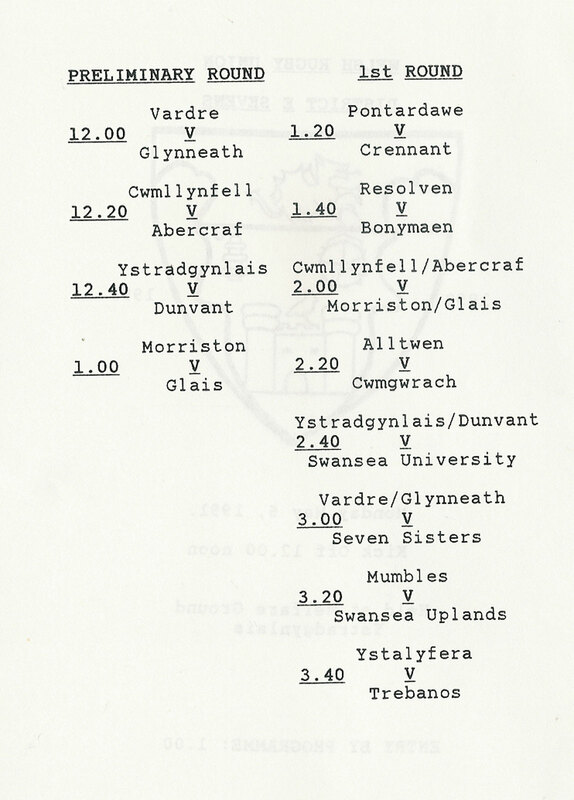 Guest teams include The Barbarians, London Scottish, French Barbarians, Richmond, Bangor, & South Glamorgan Institute. 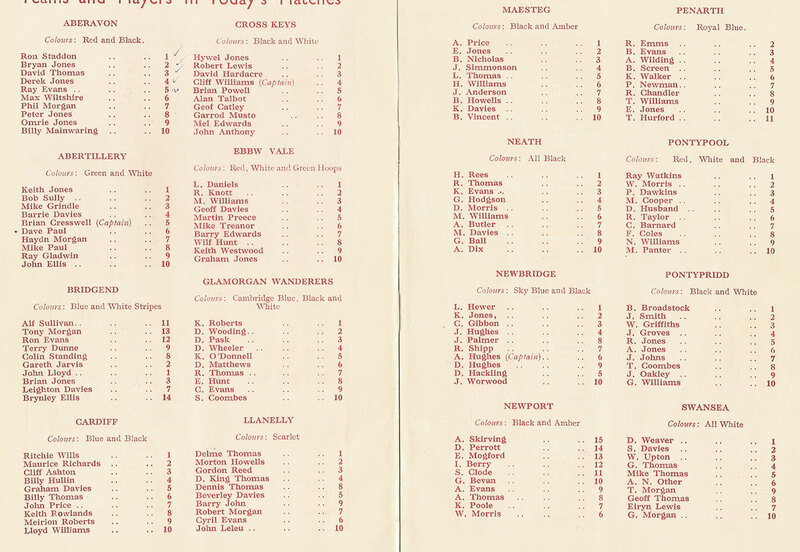 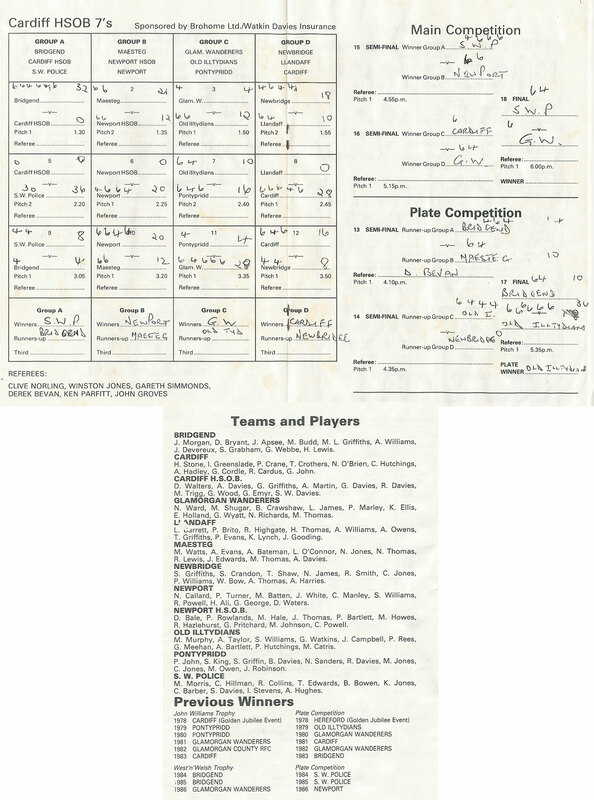 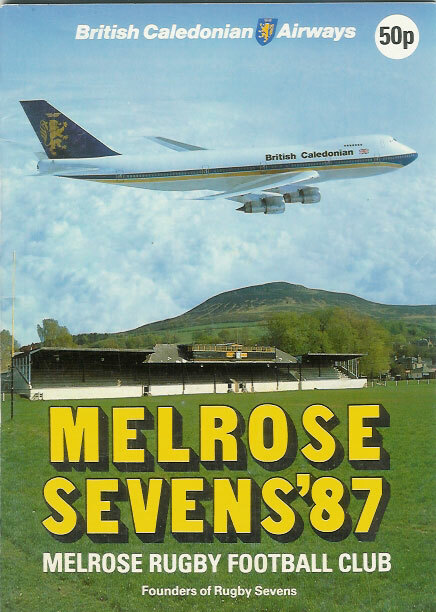 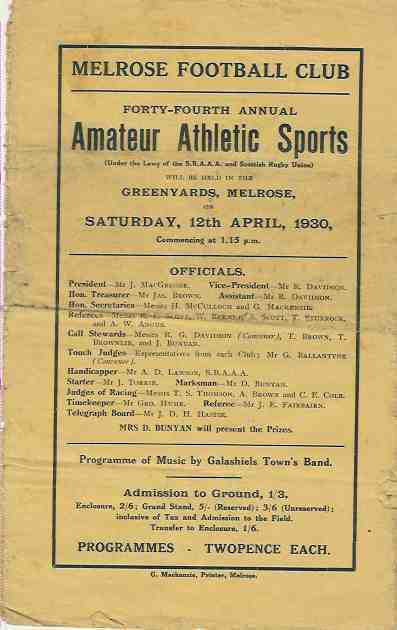 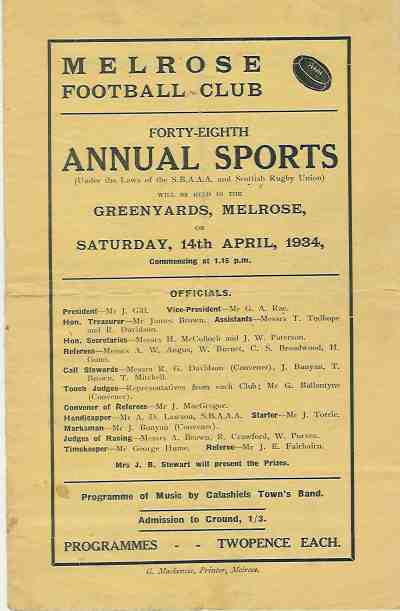 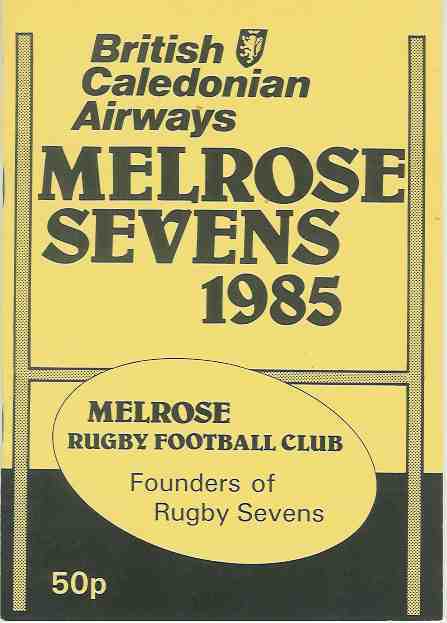 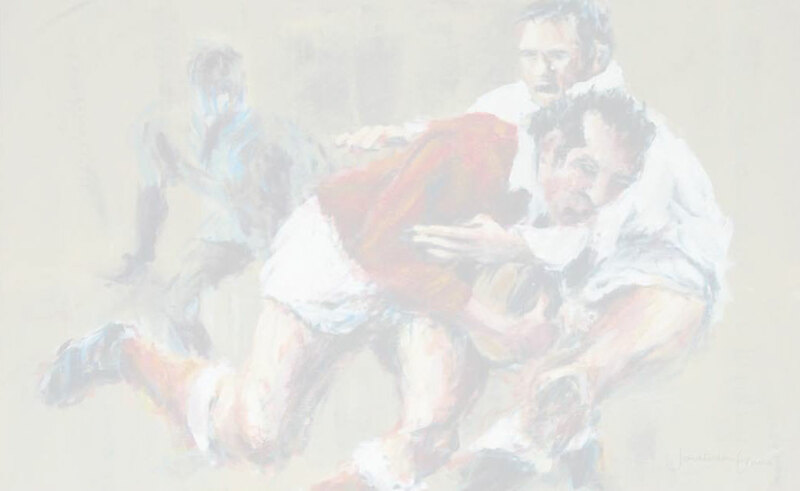 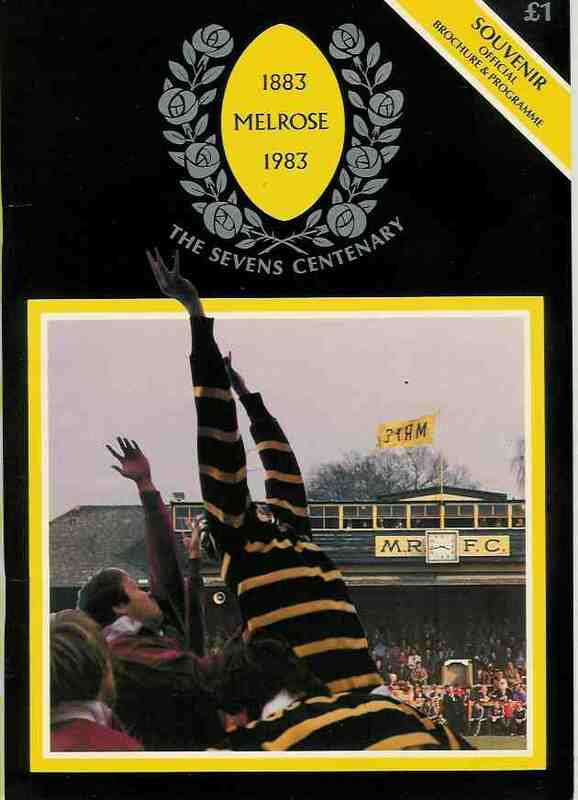 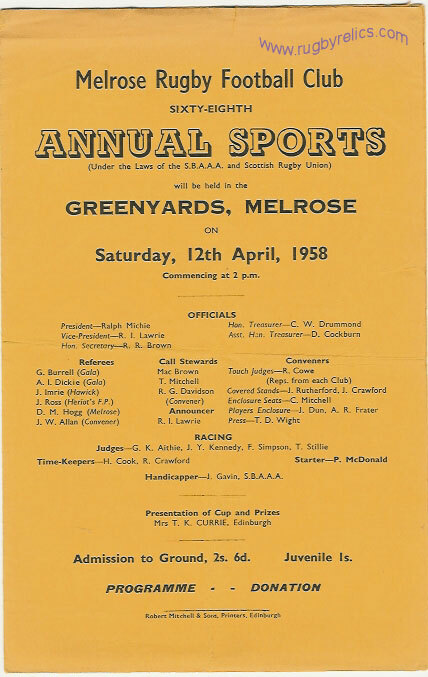 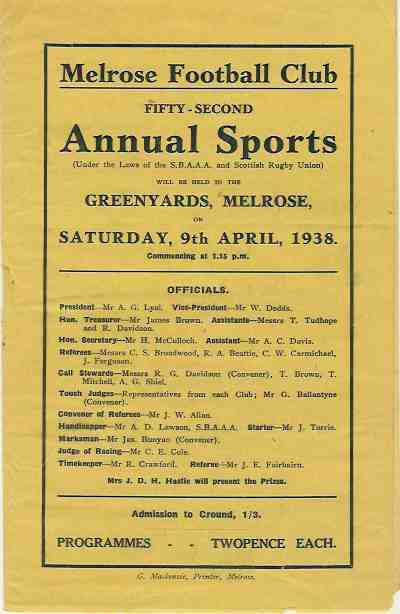 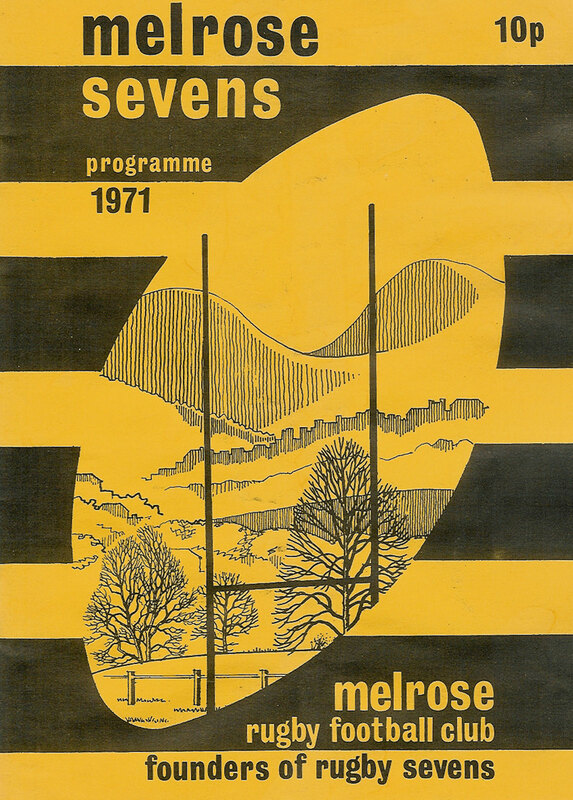 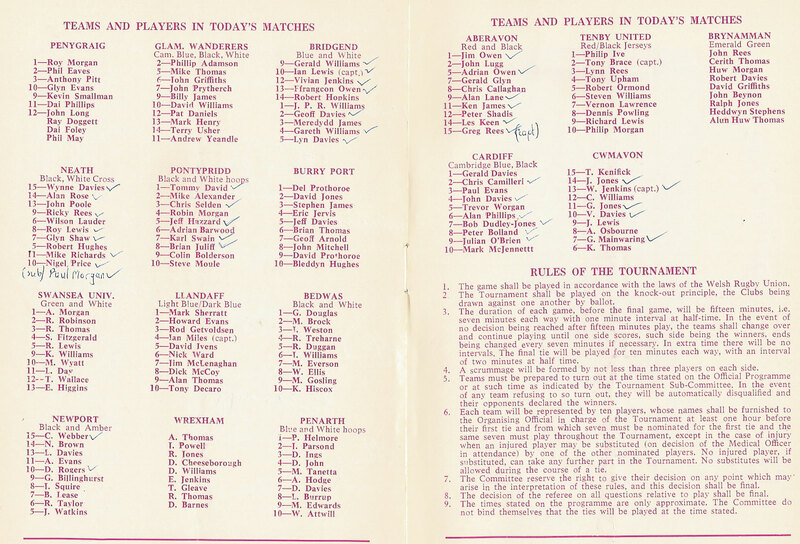 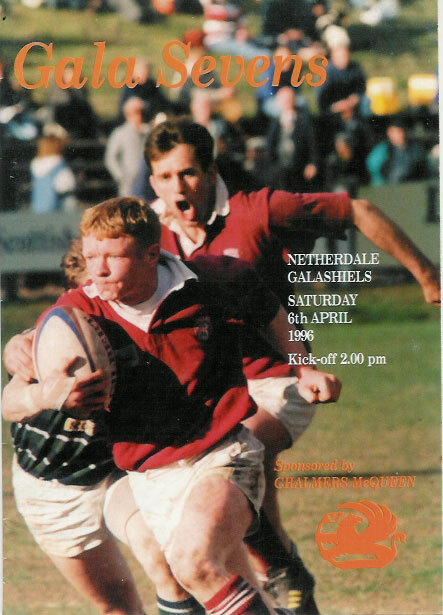 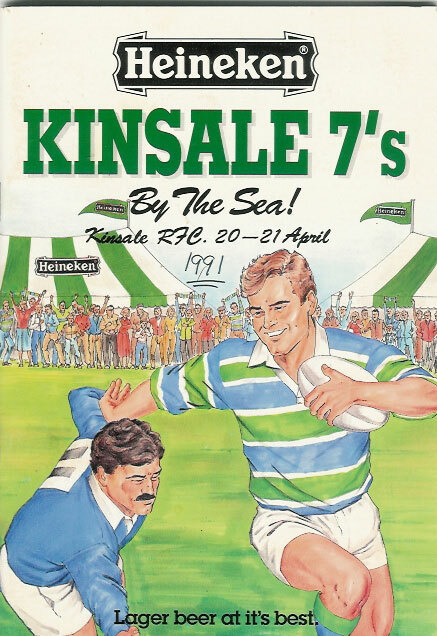 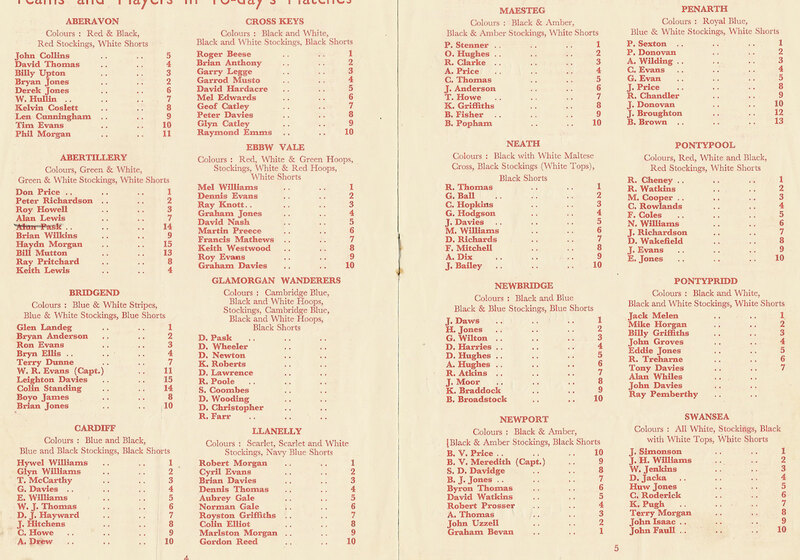 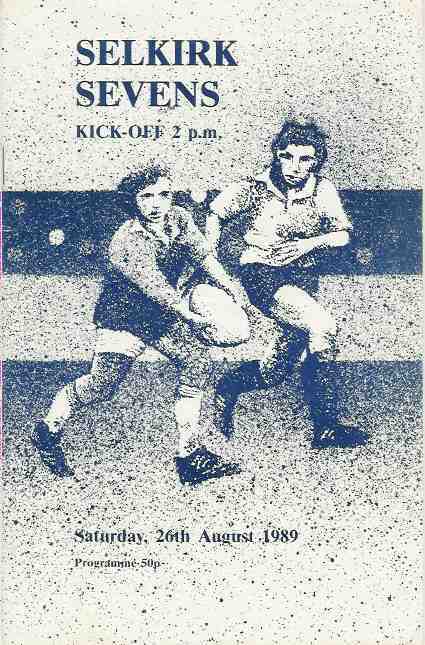 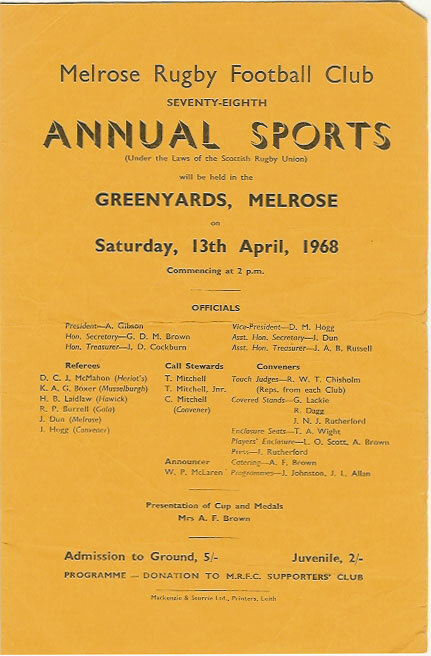 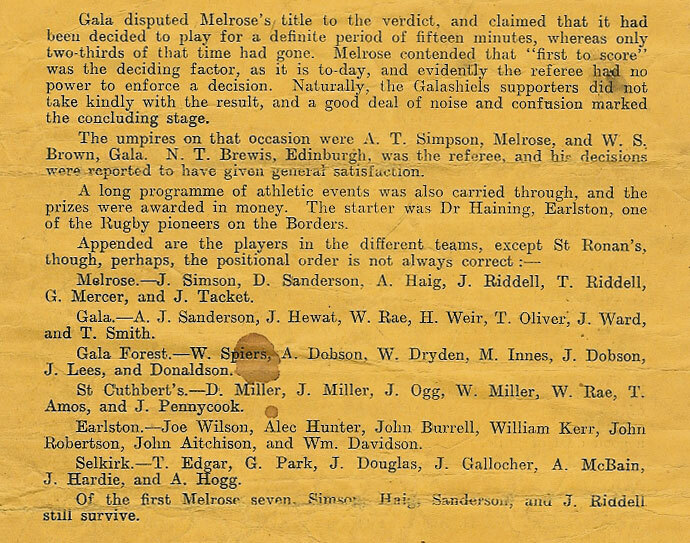 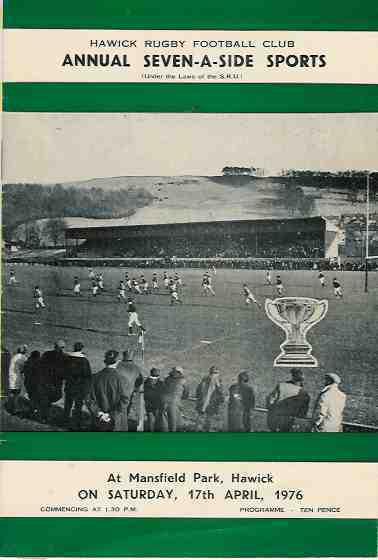 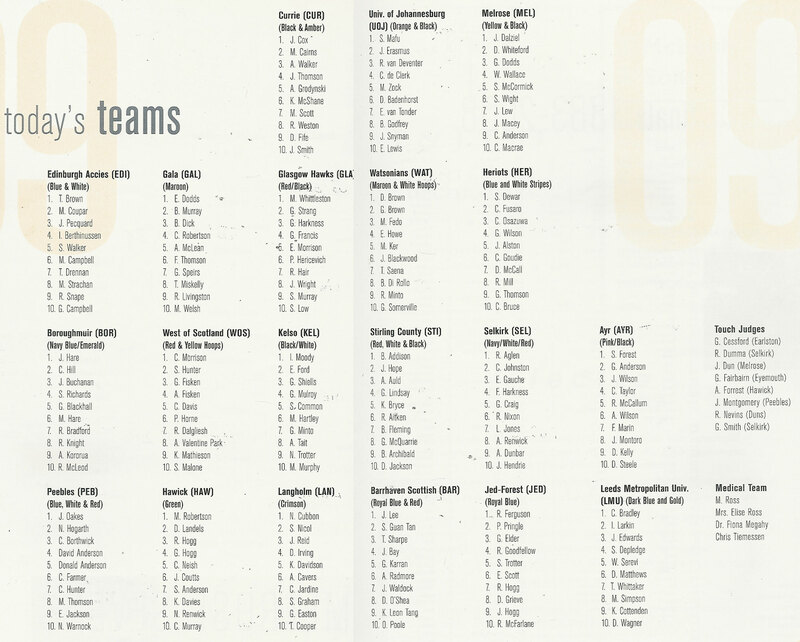 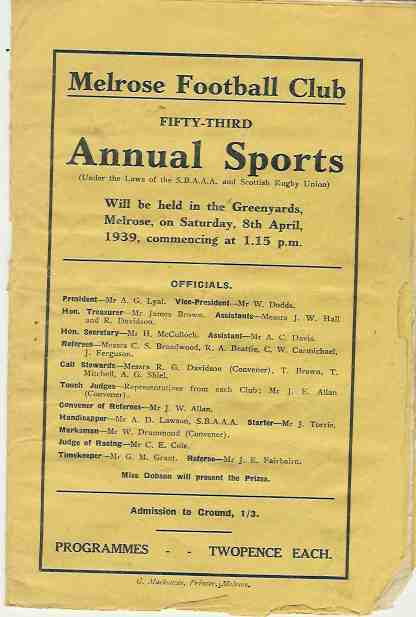 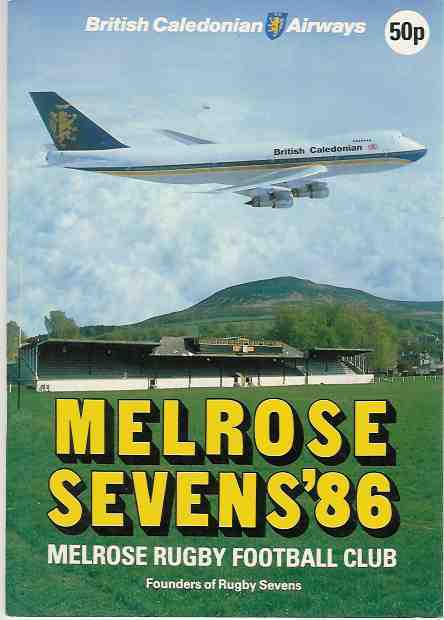 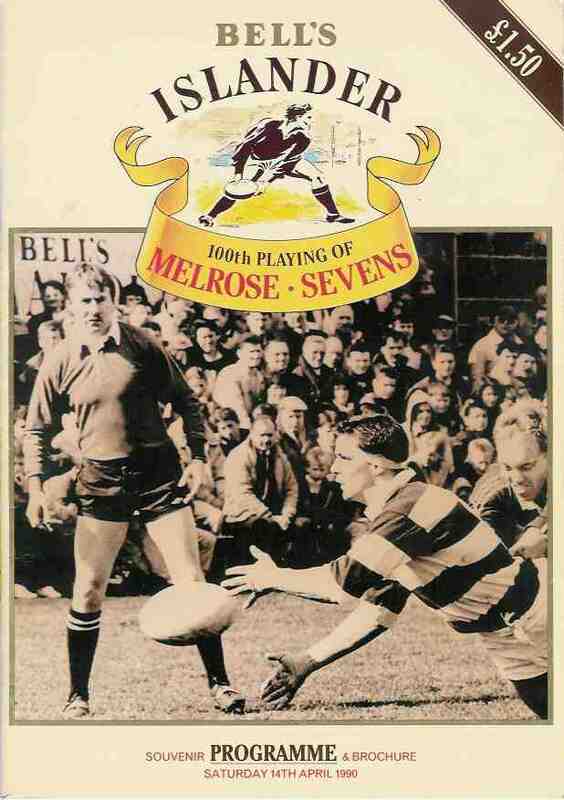 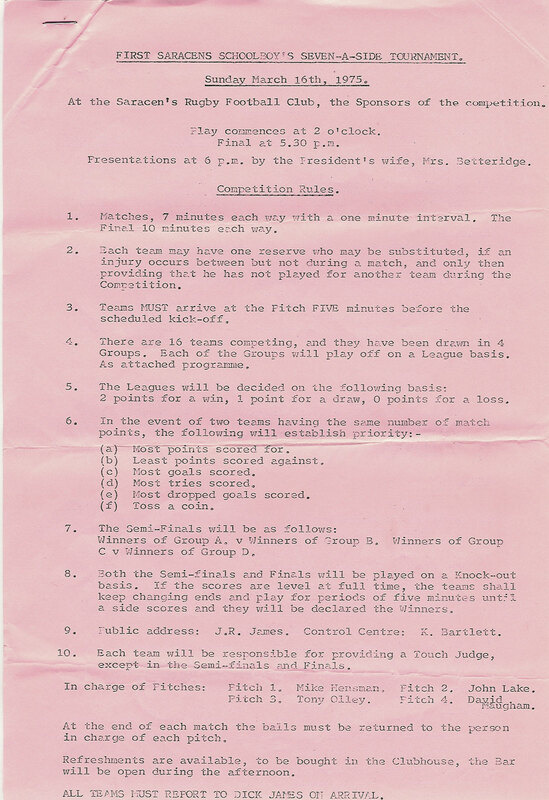 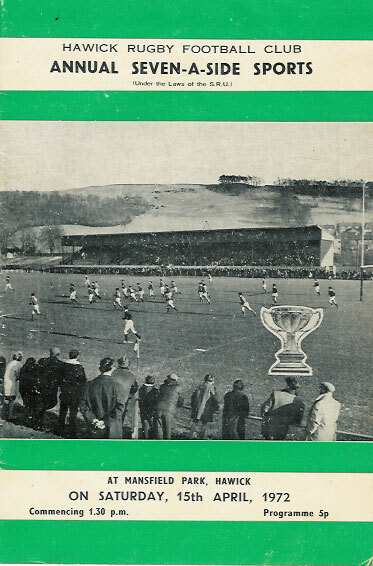 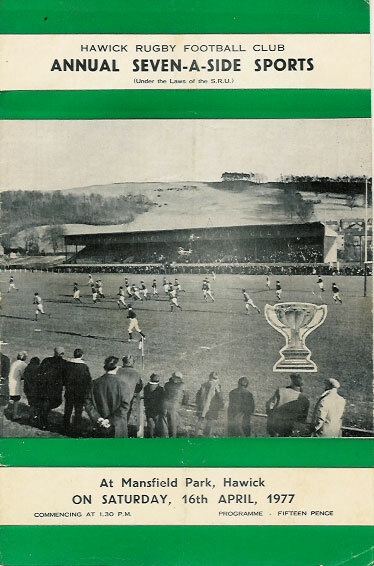 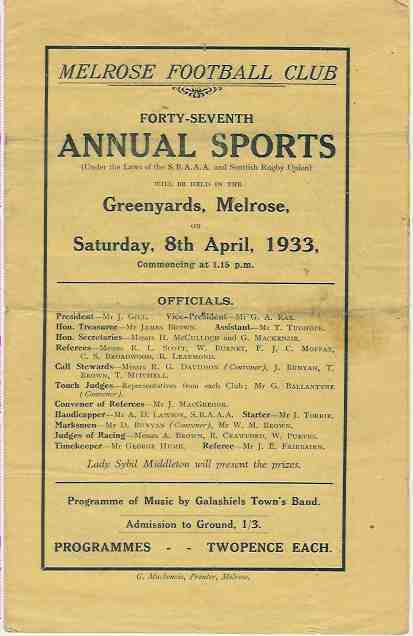 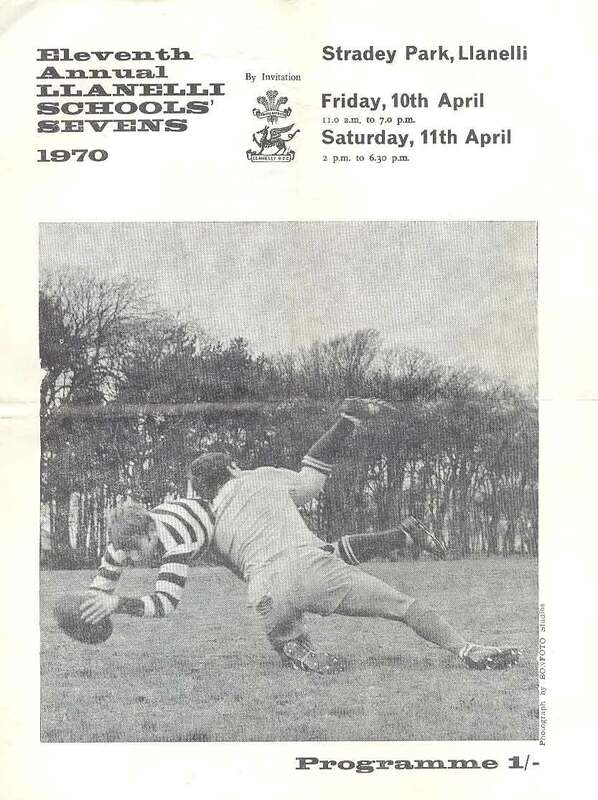 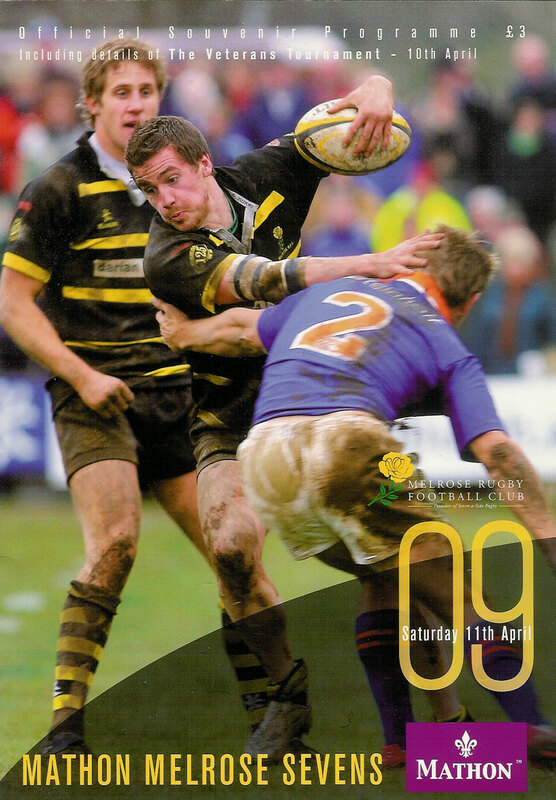 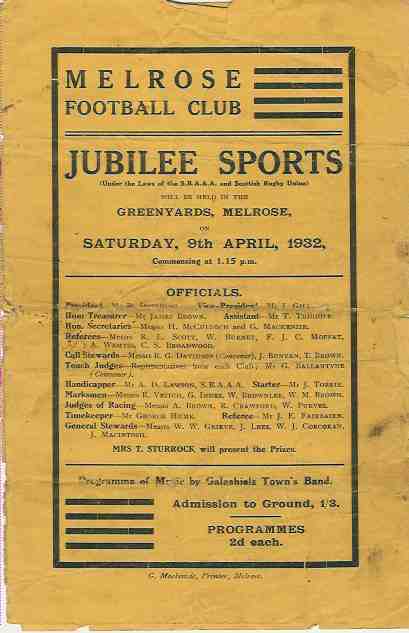 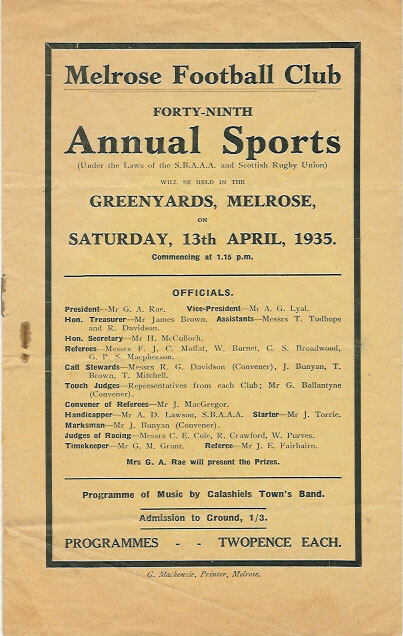 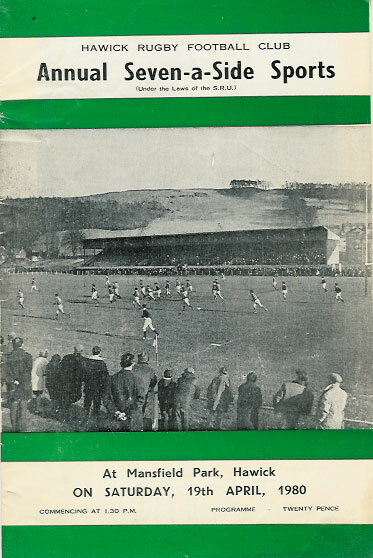 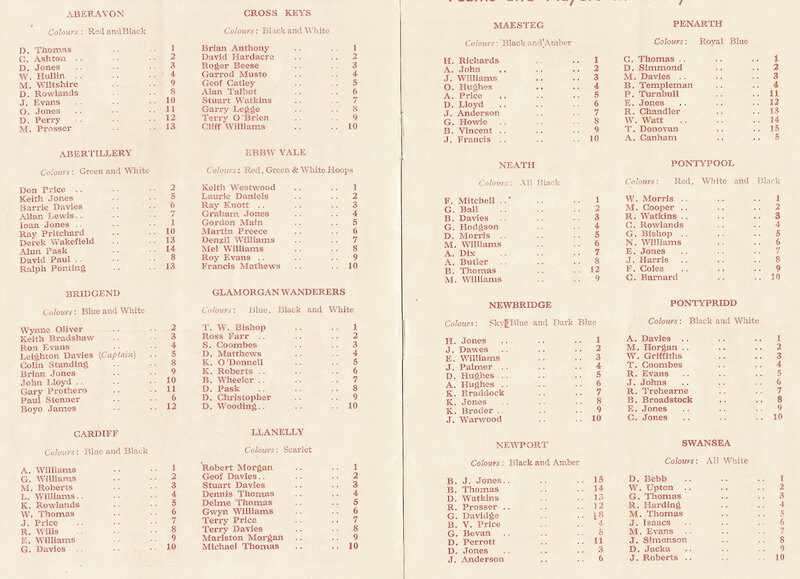 100th playing of the Melrose Sevens, A4 size, 48 page brochure with many historical articles. 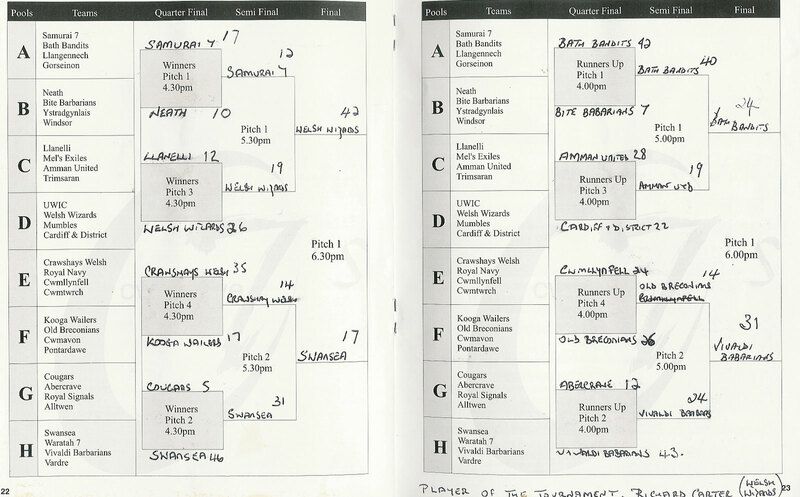 1992 Winners - Bay of Plenty. 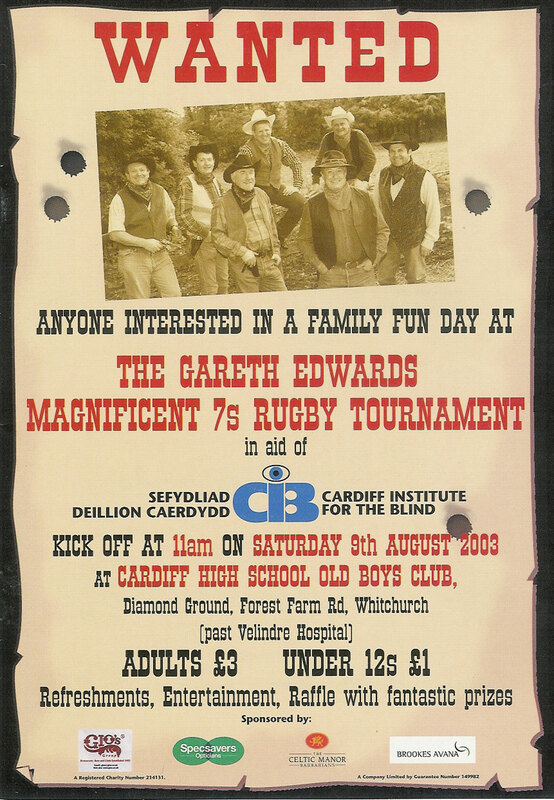 @ Cardiff. 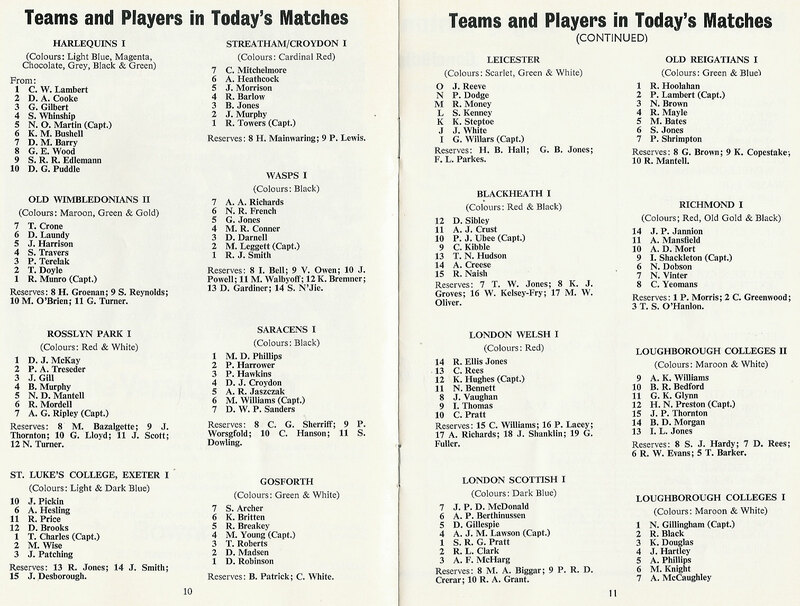 Guest Team - Leicester. 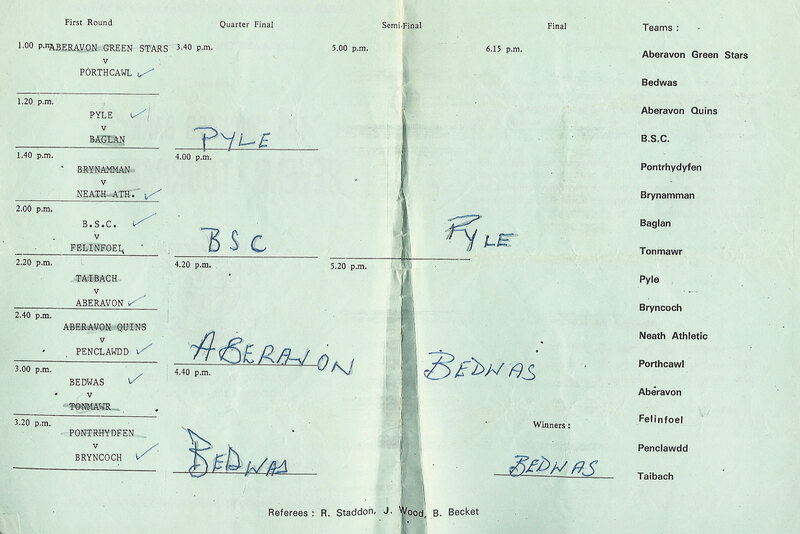 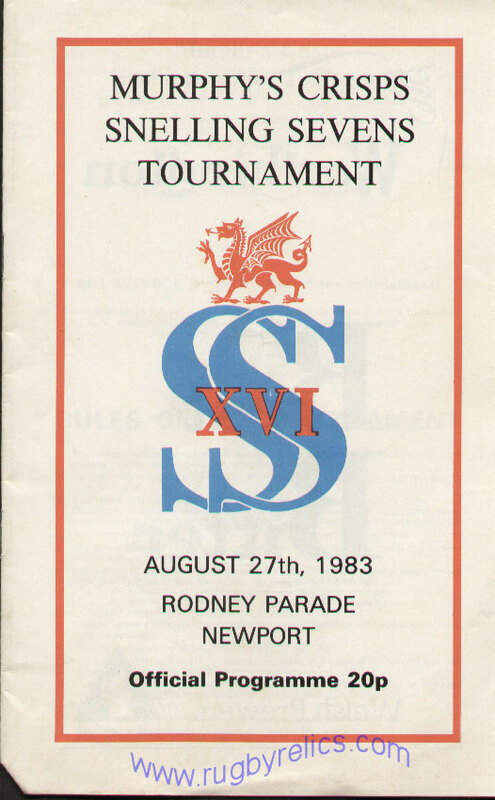 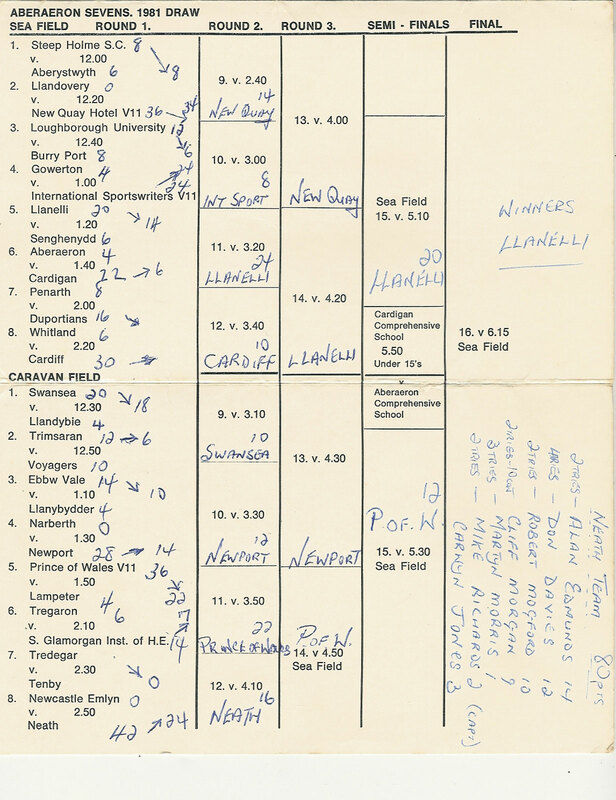 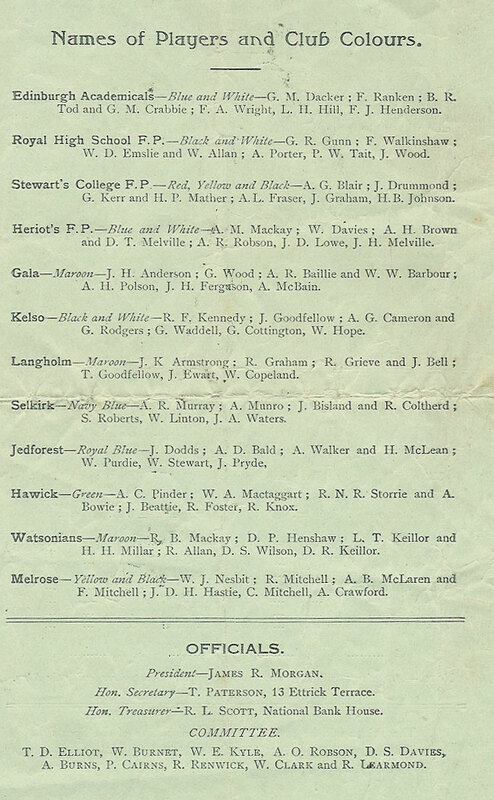 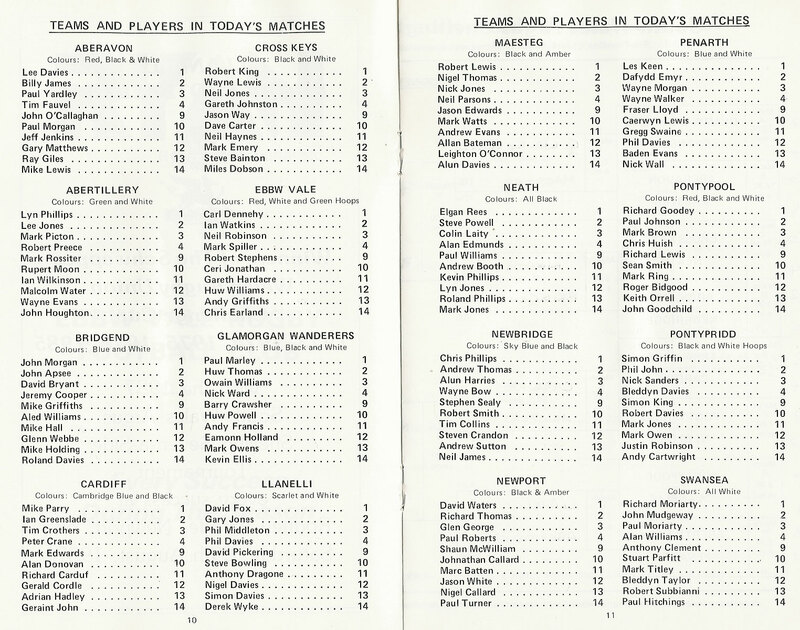 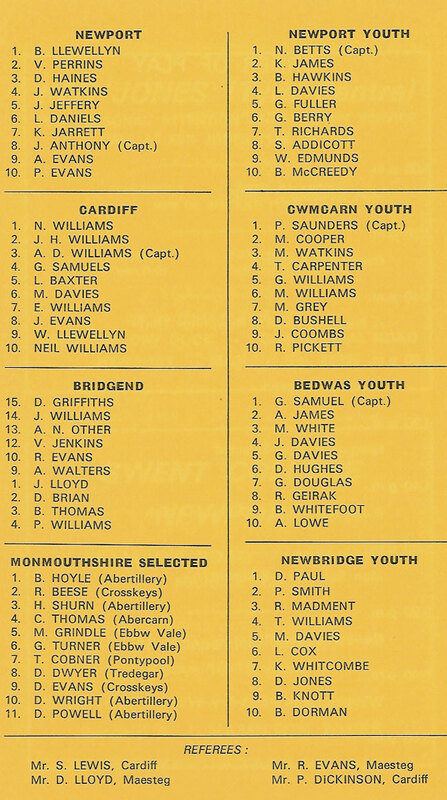 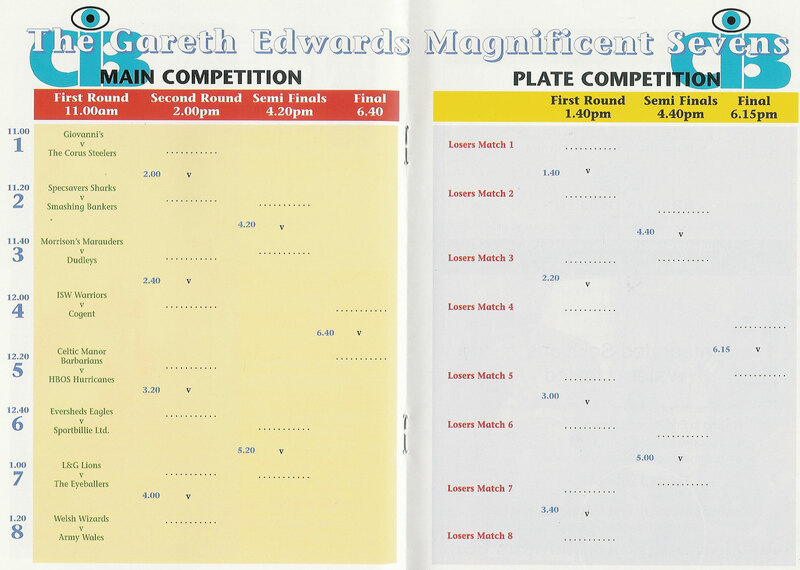 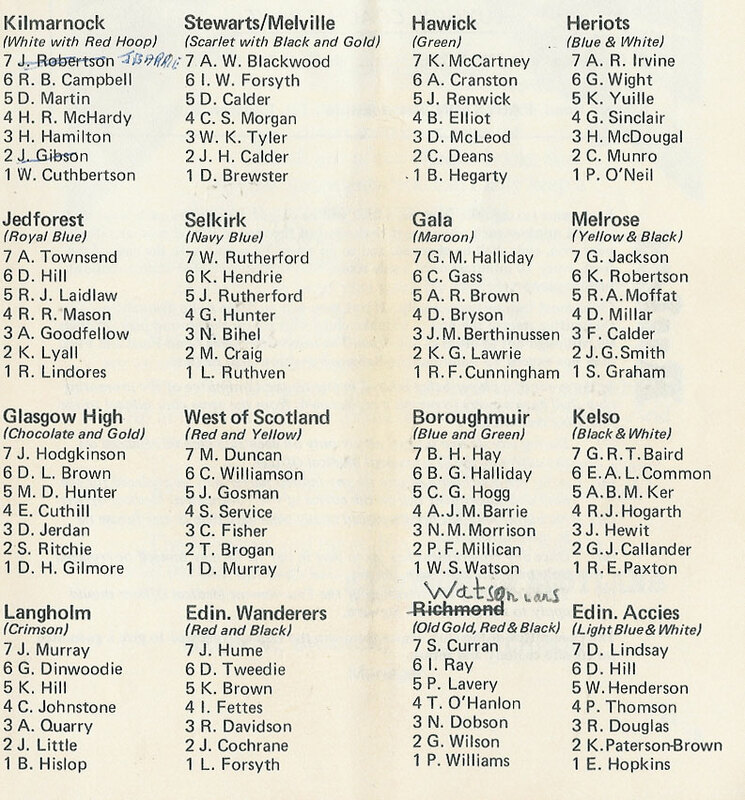 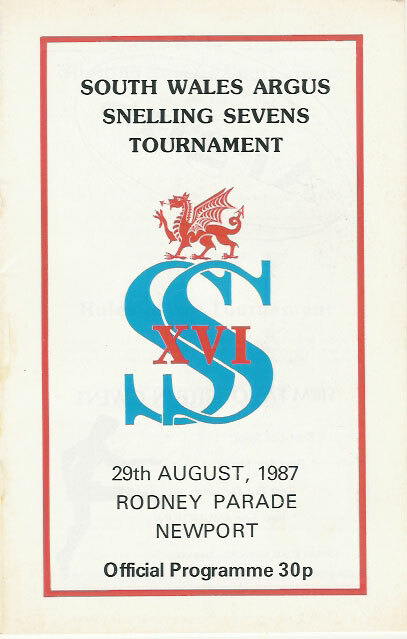 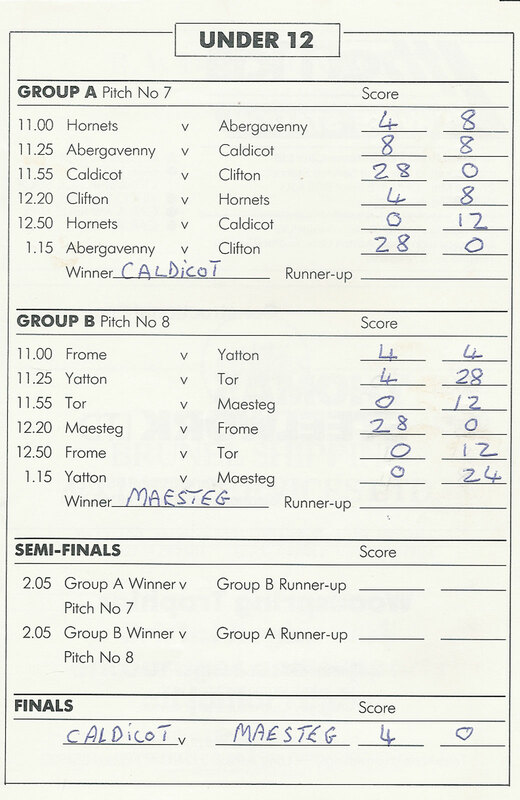 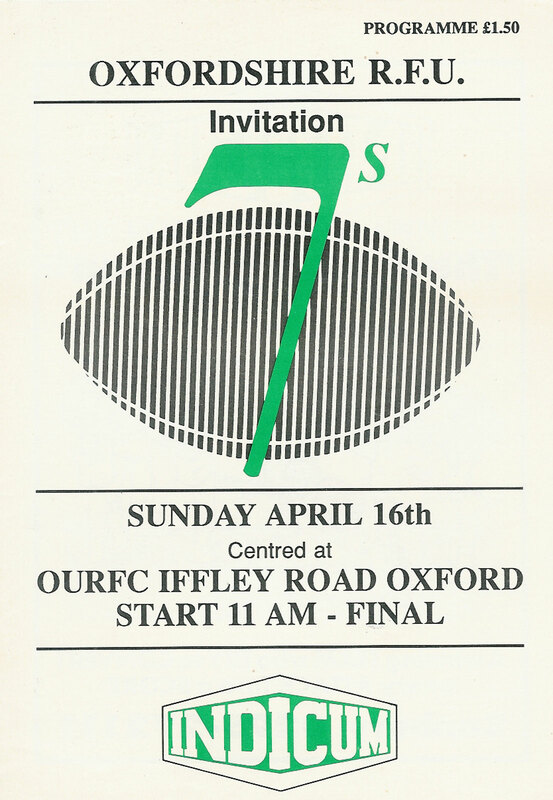 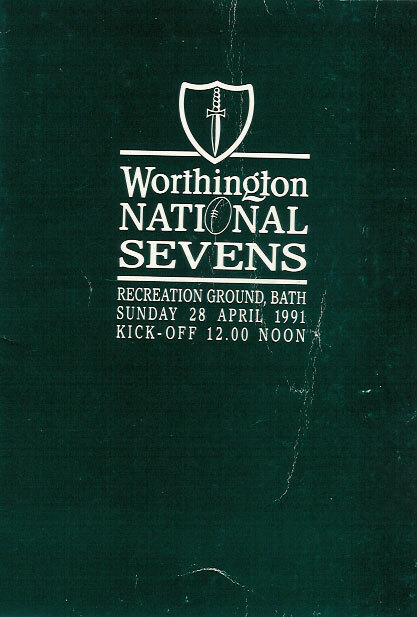 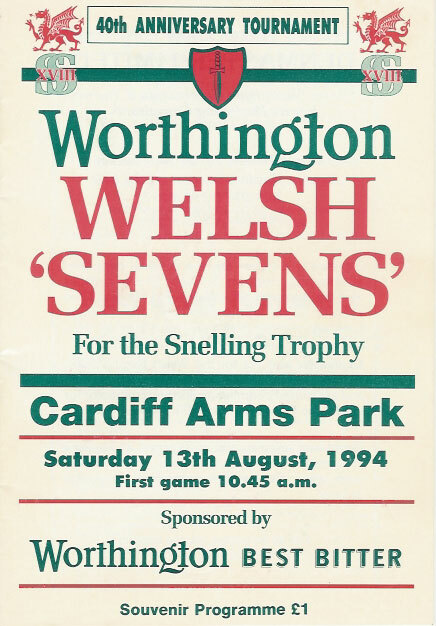 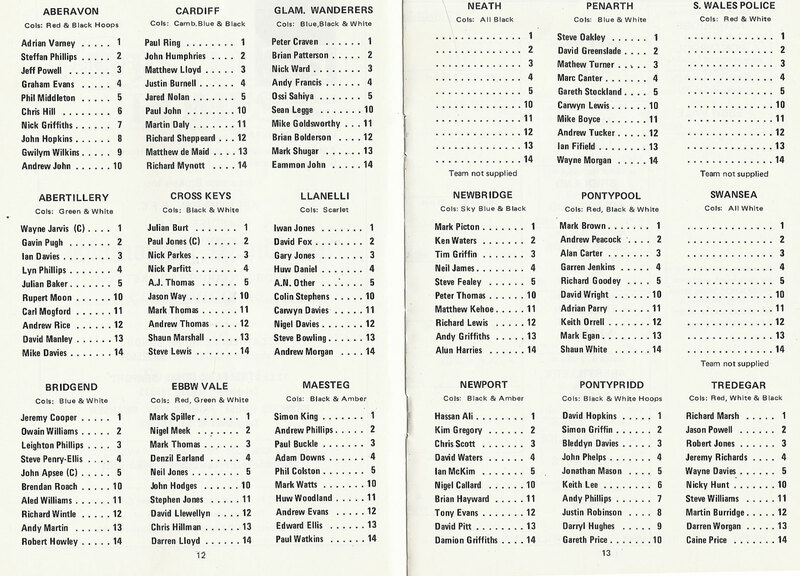 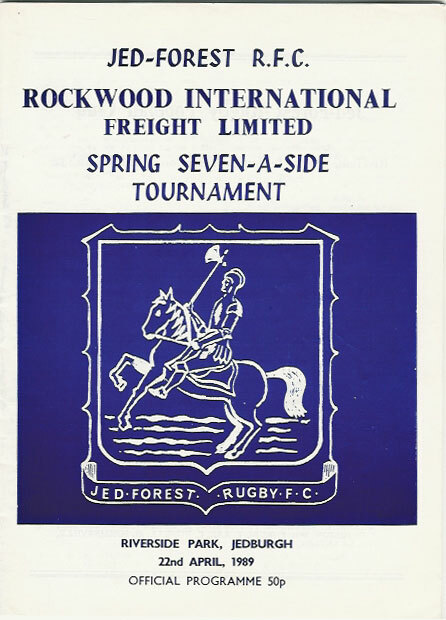 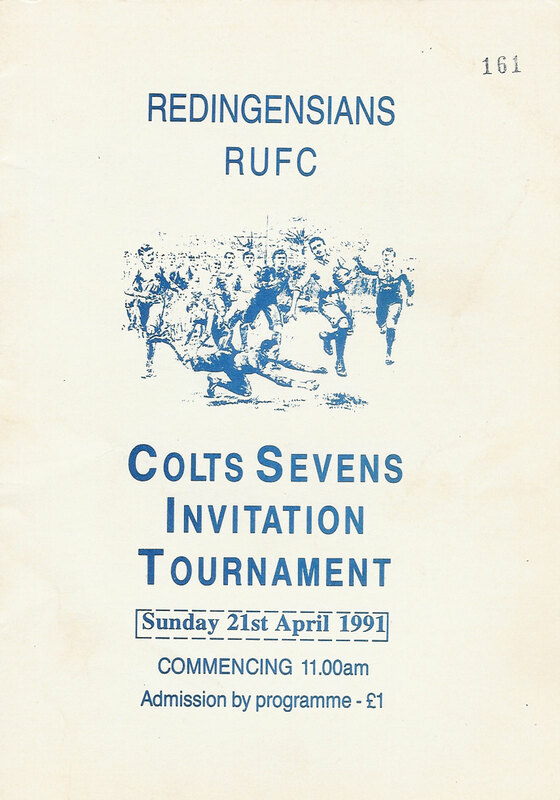 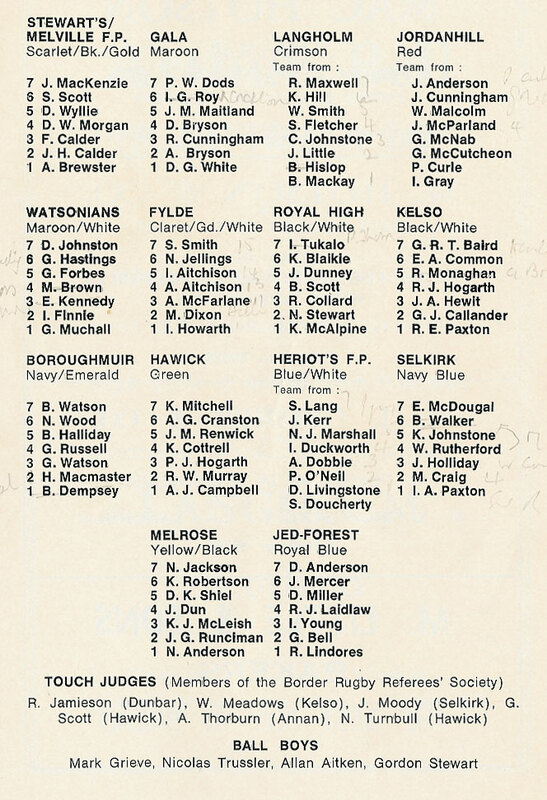 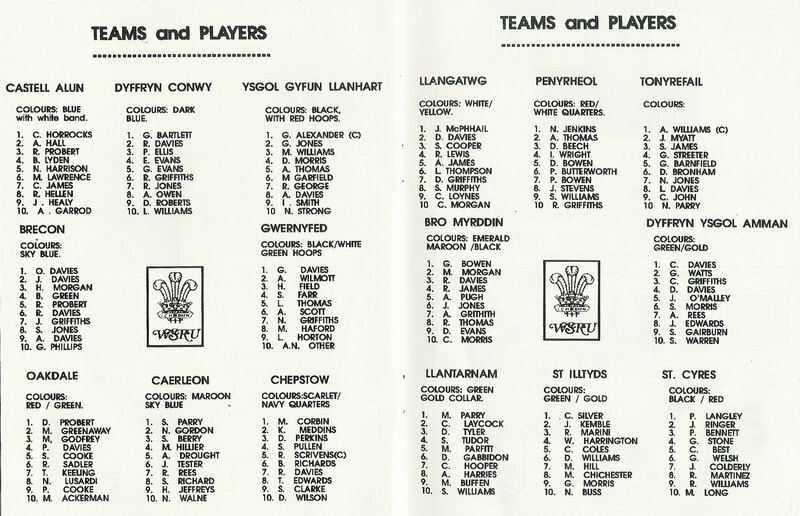 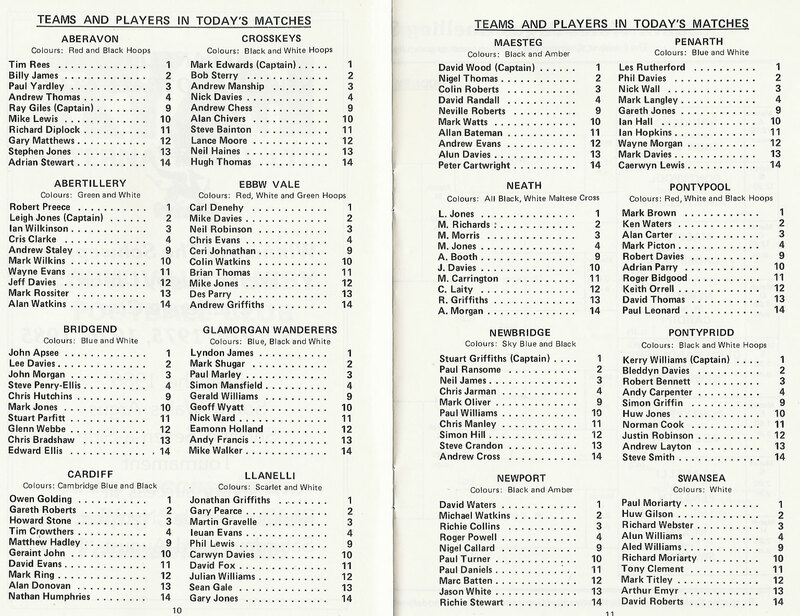 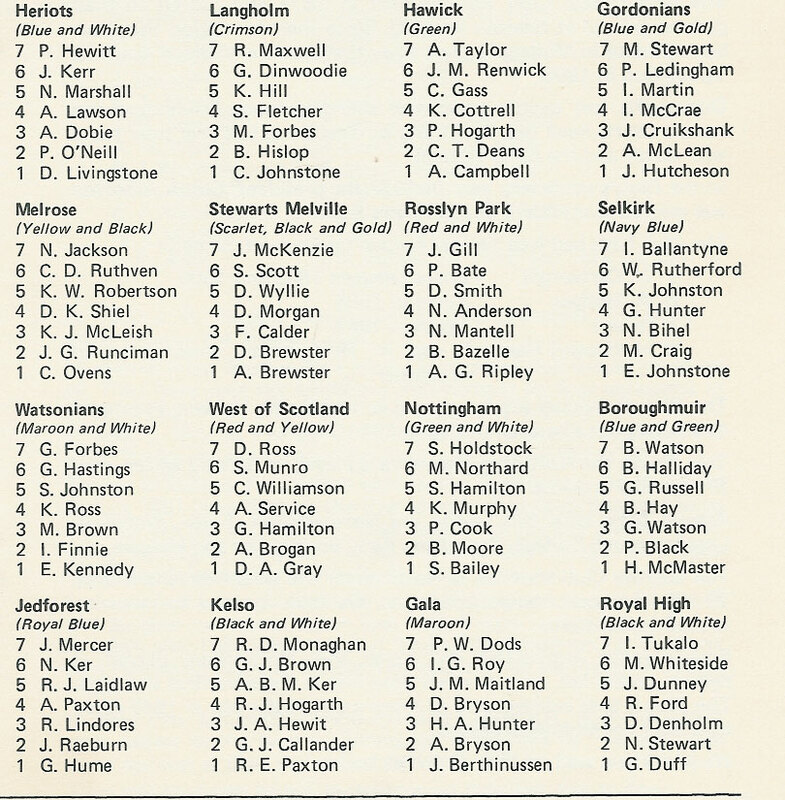 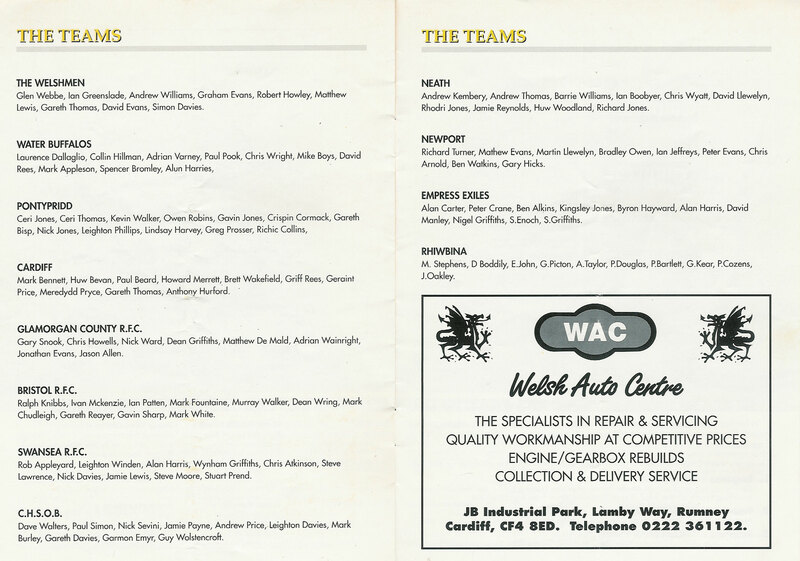 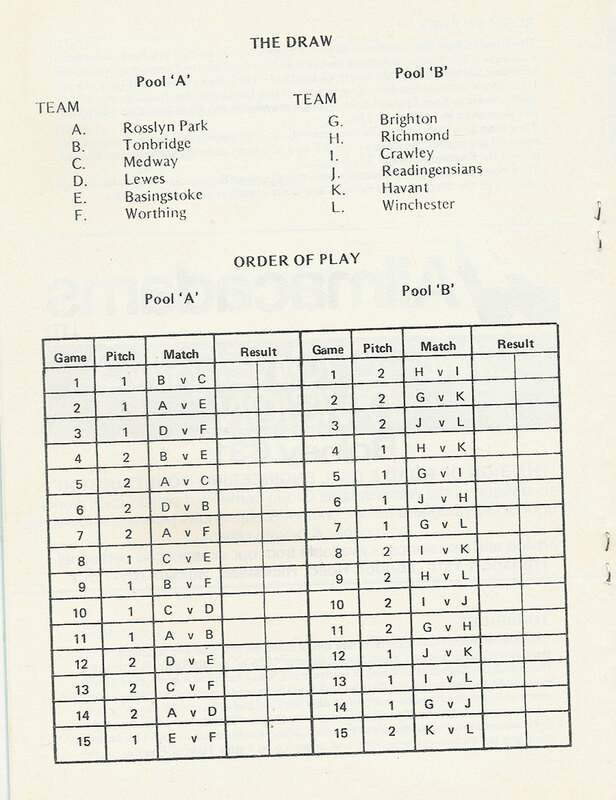 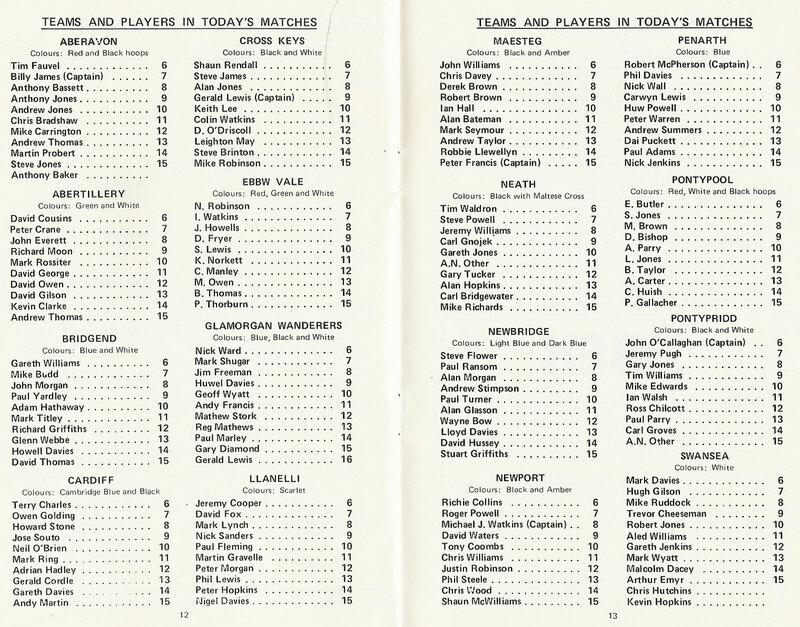 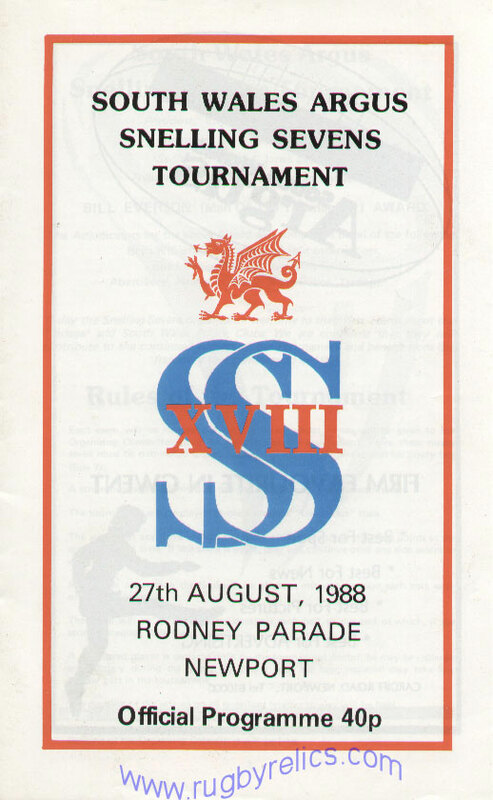 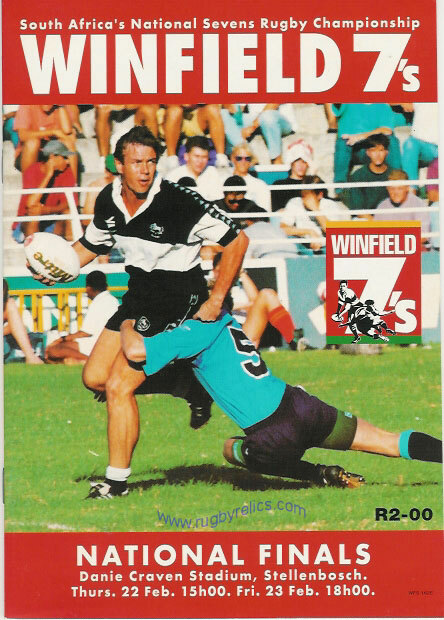 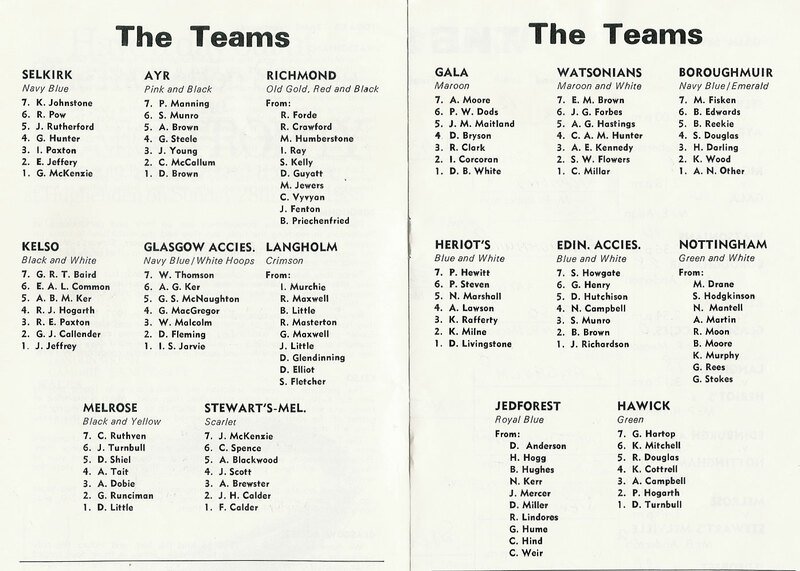 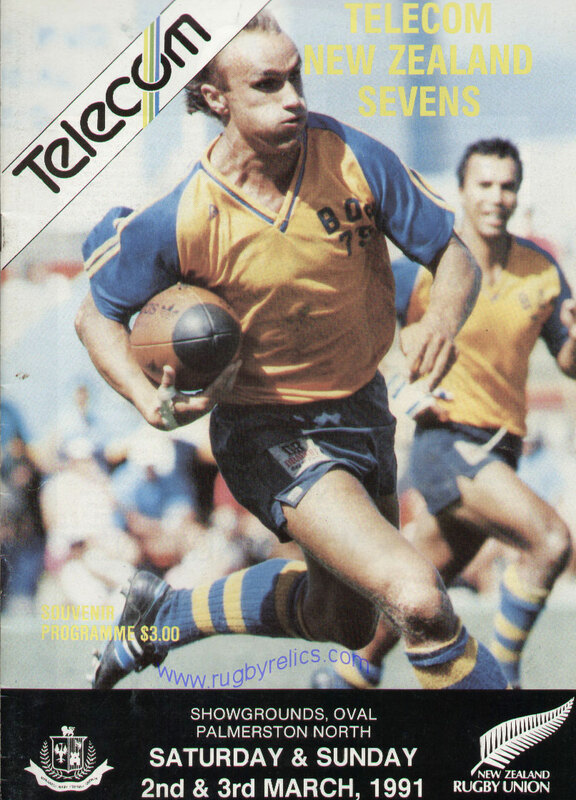 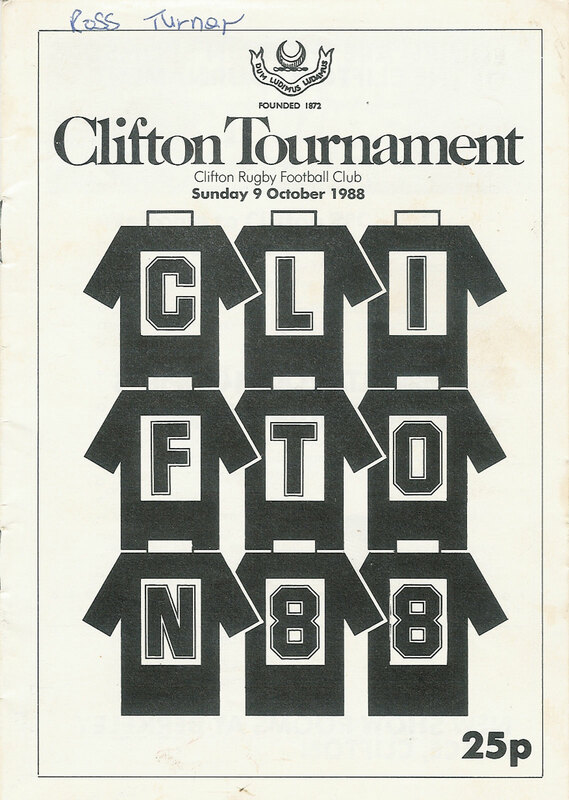 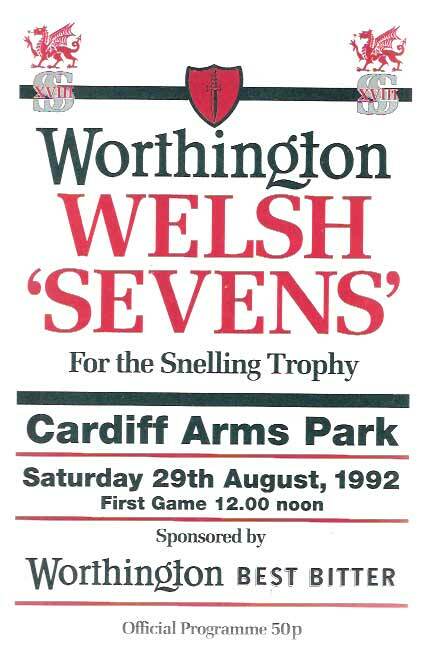 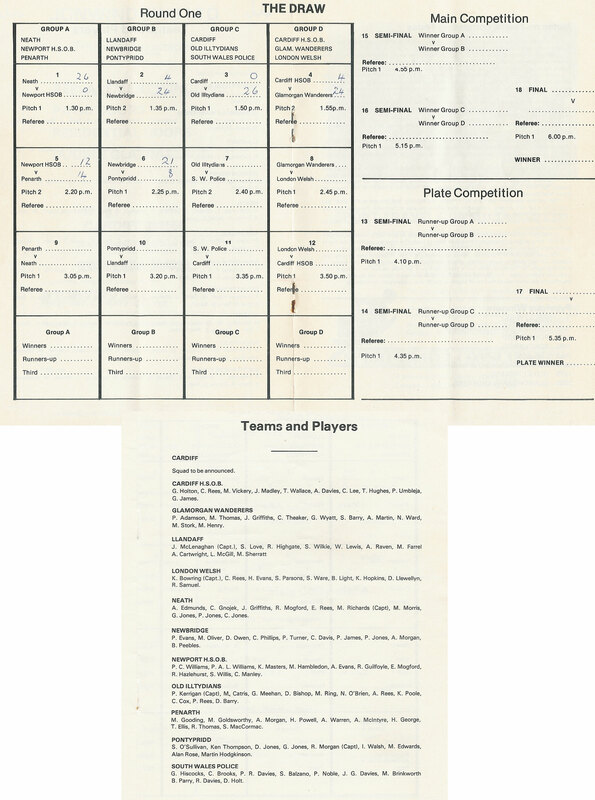 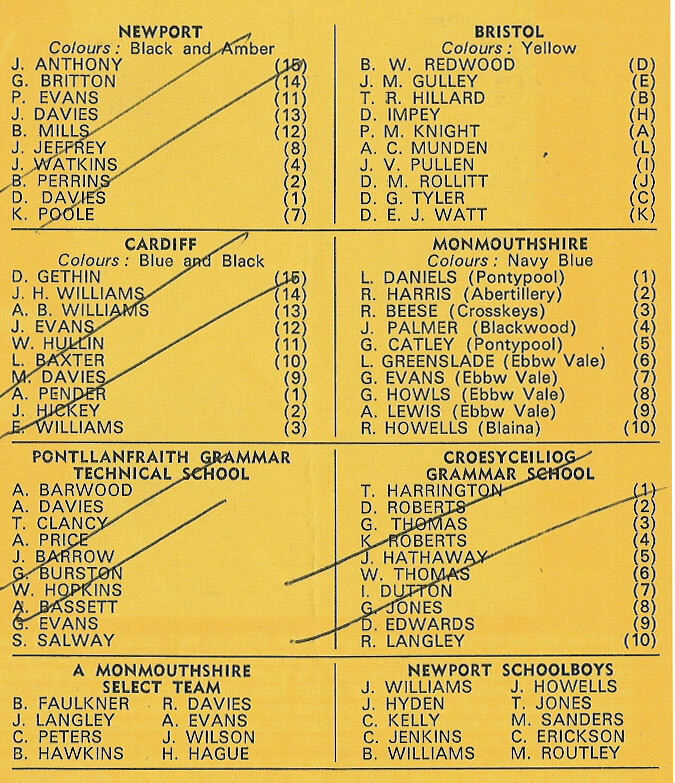 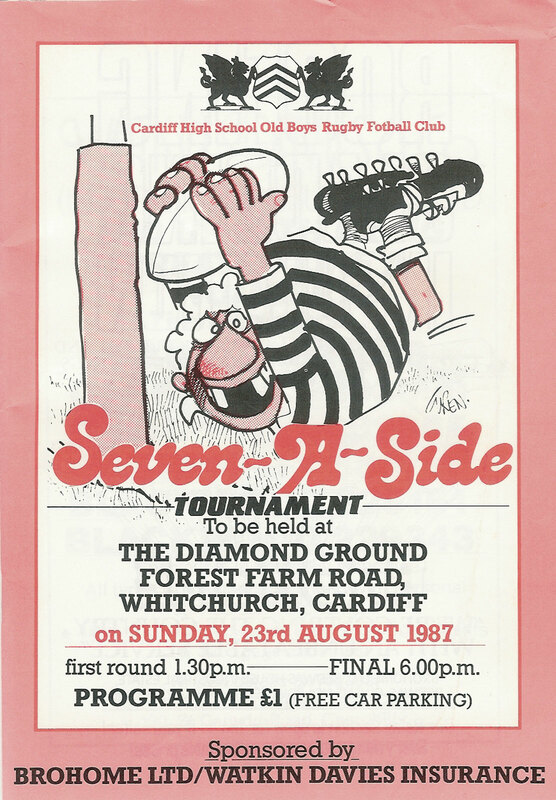 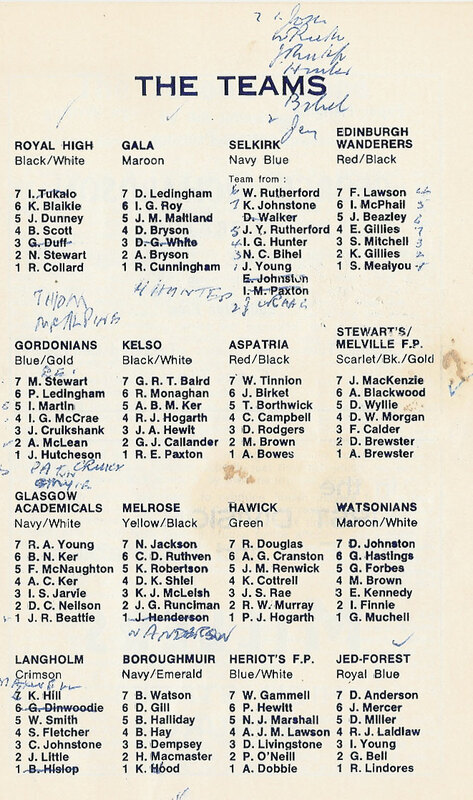 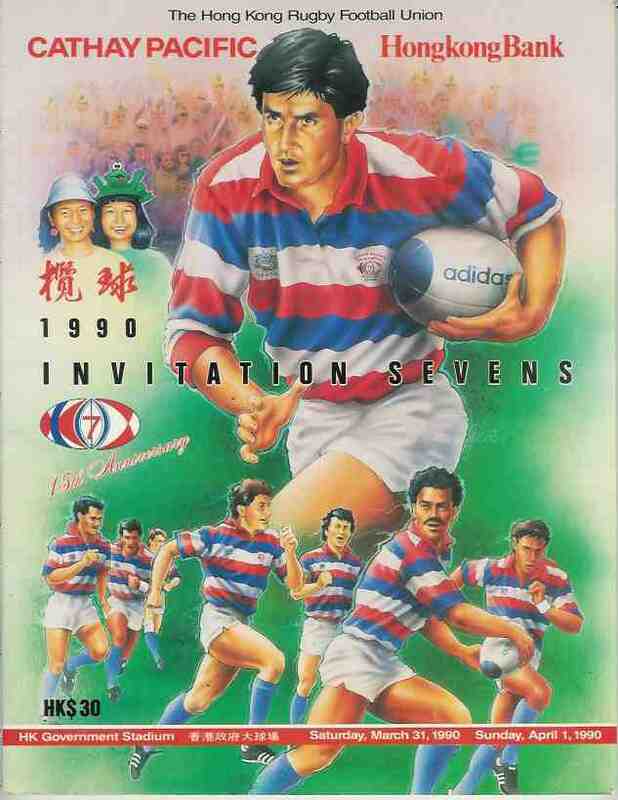 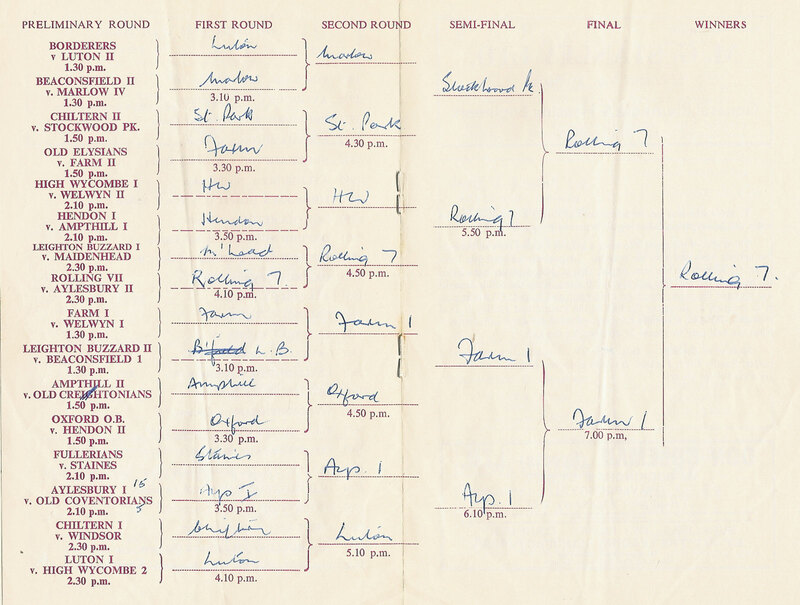 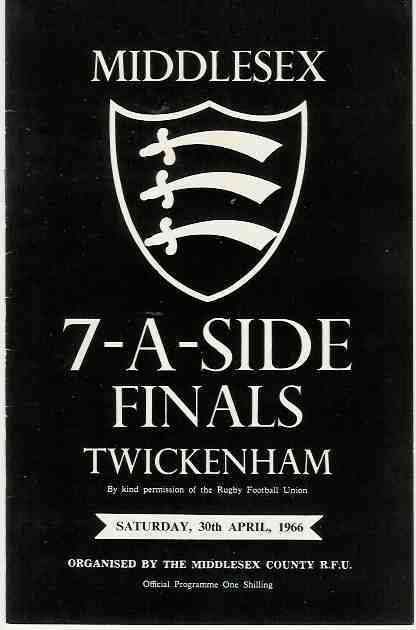 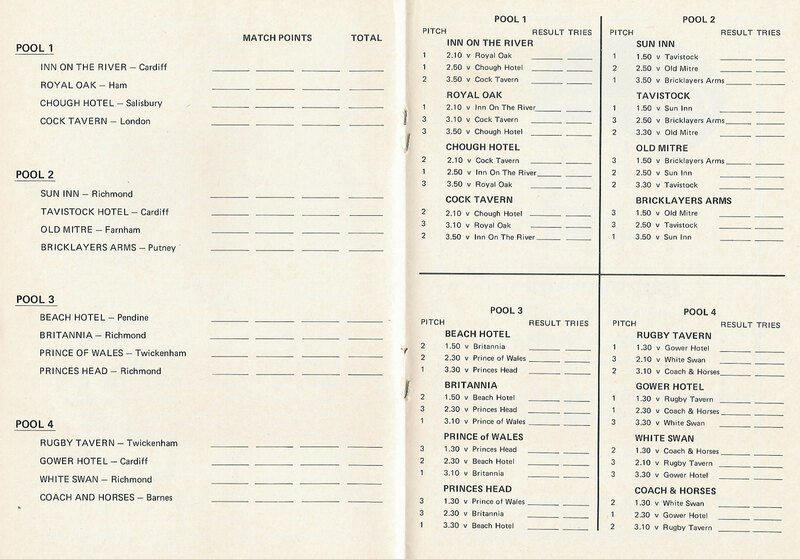 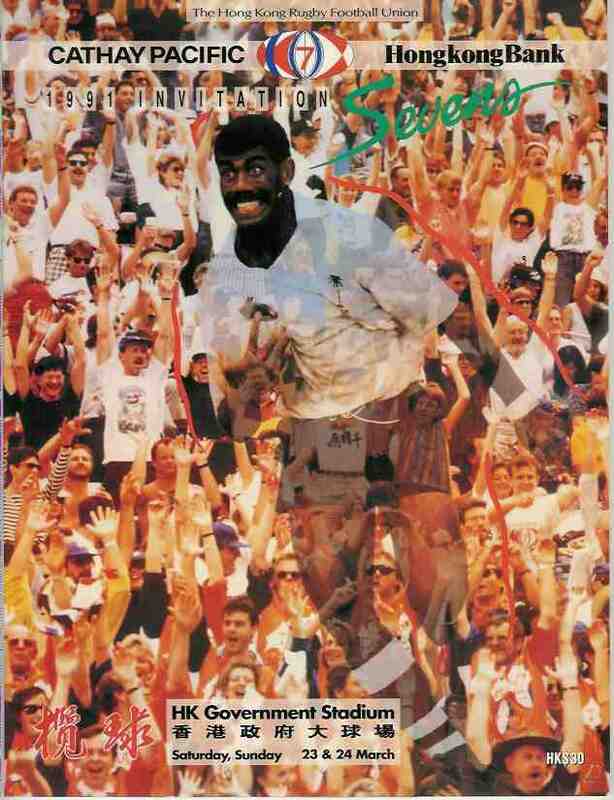 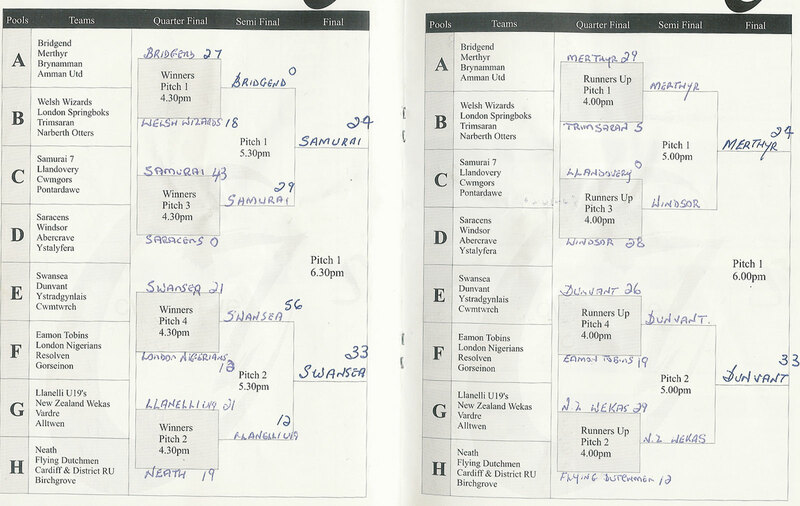 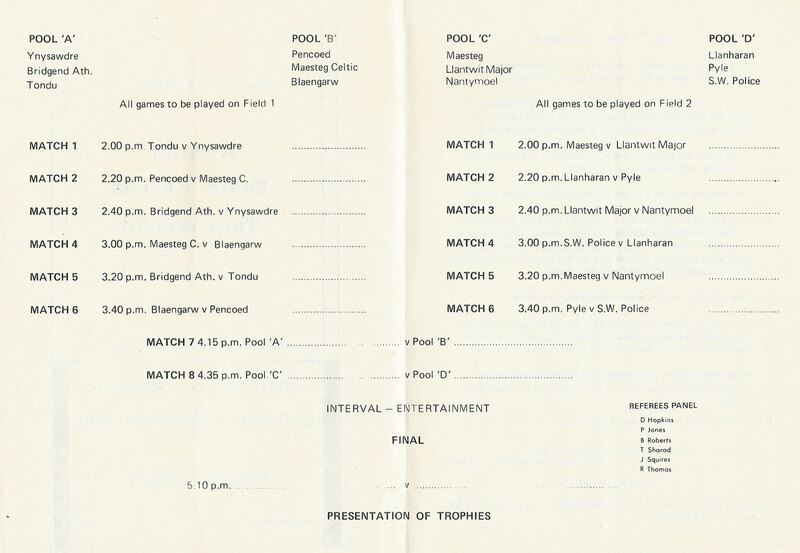 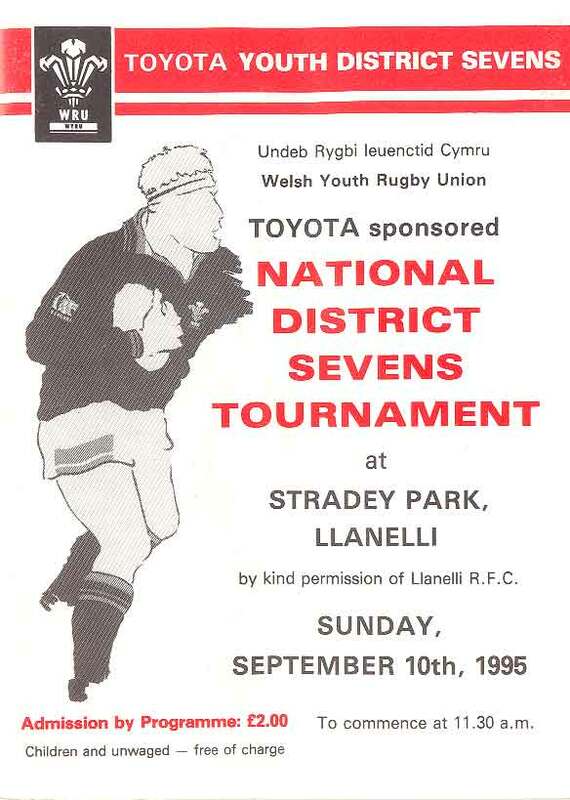 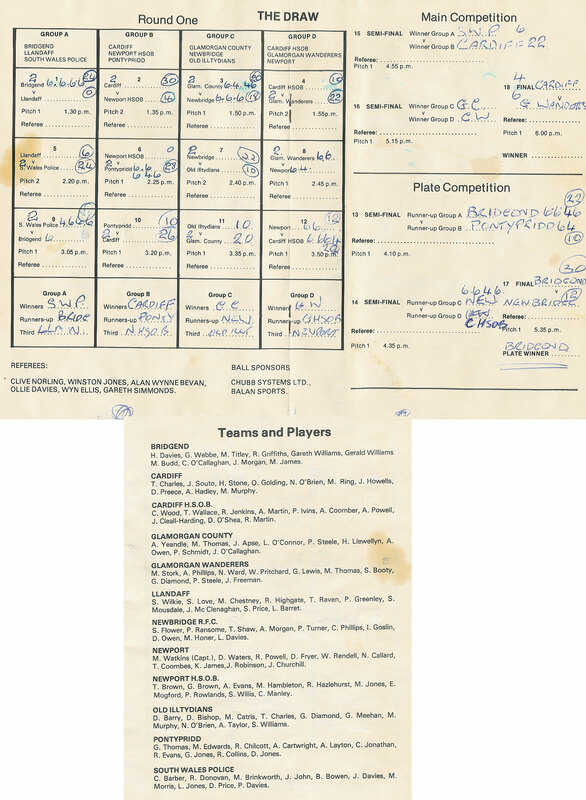 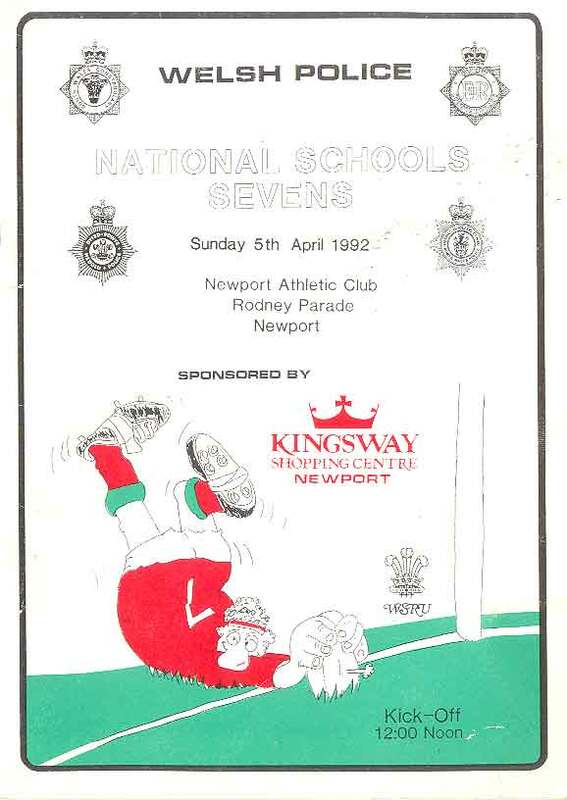 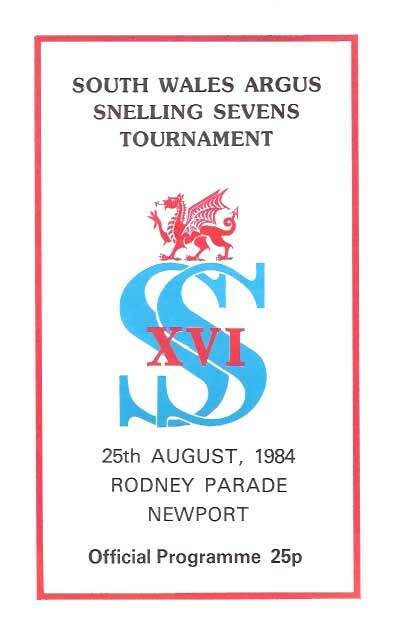 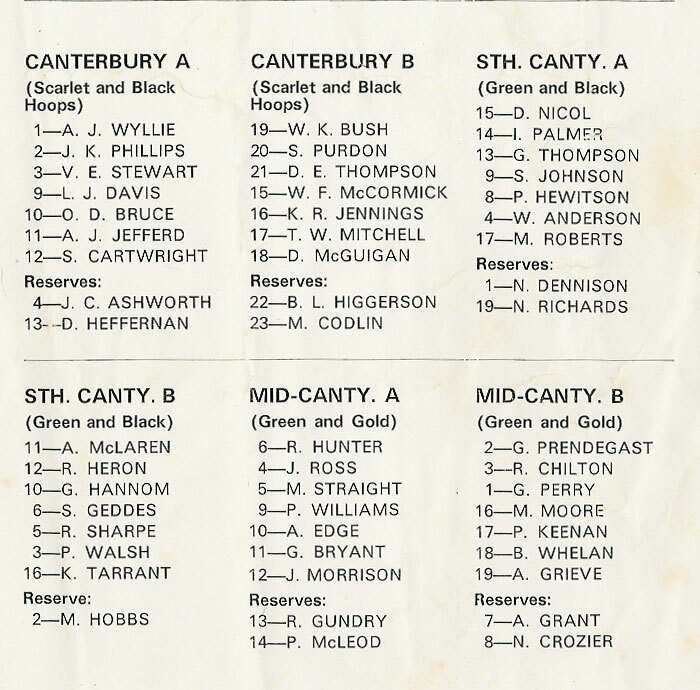 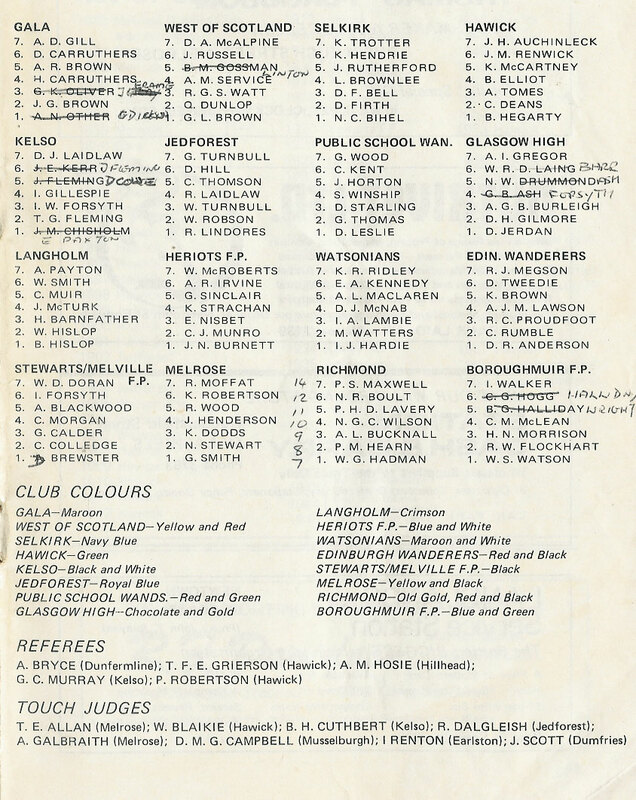 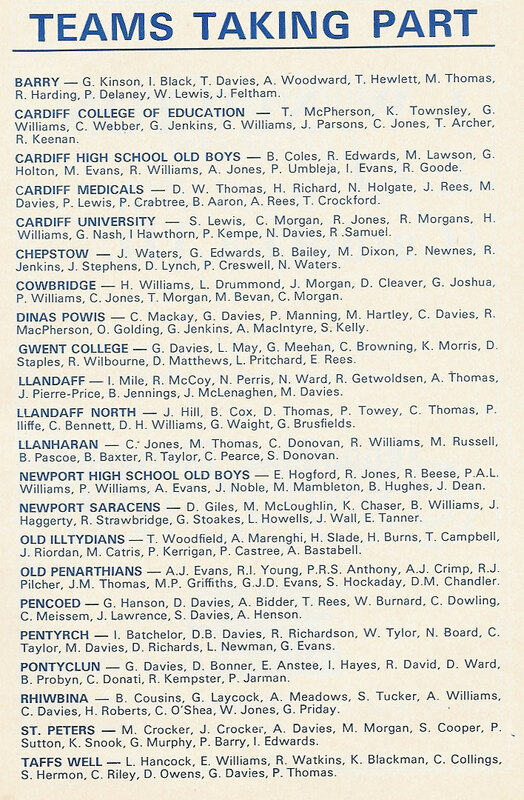 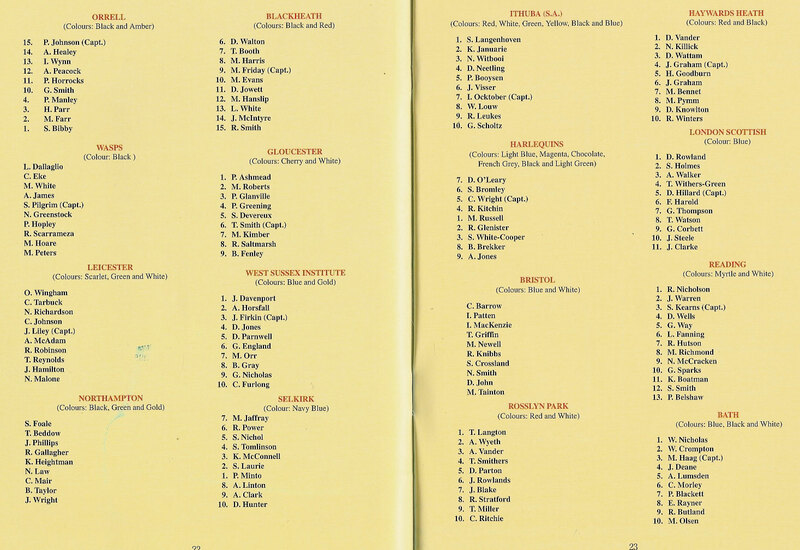 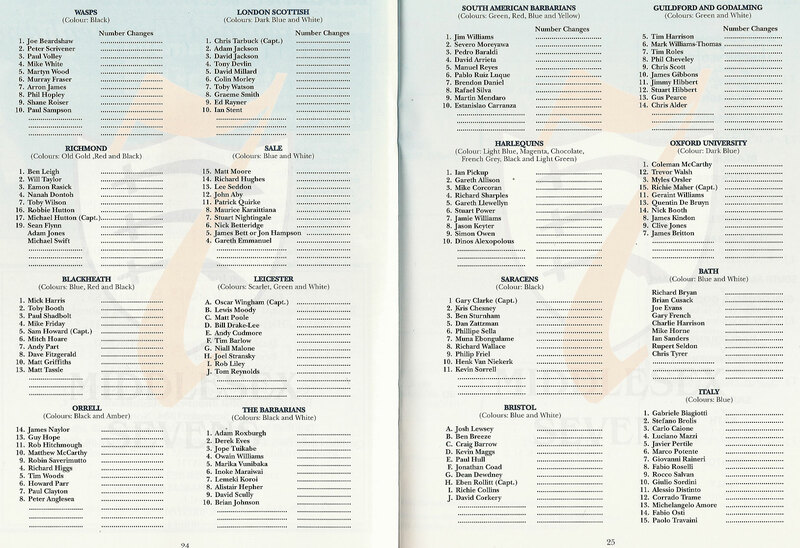 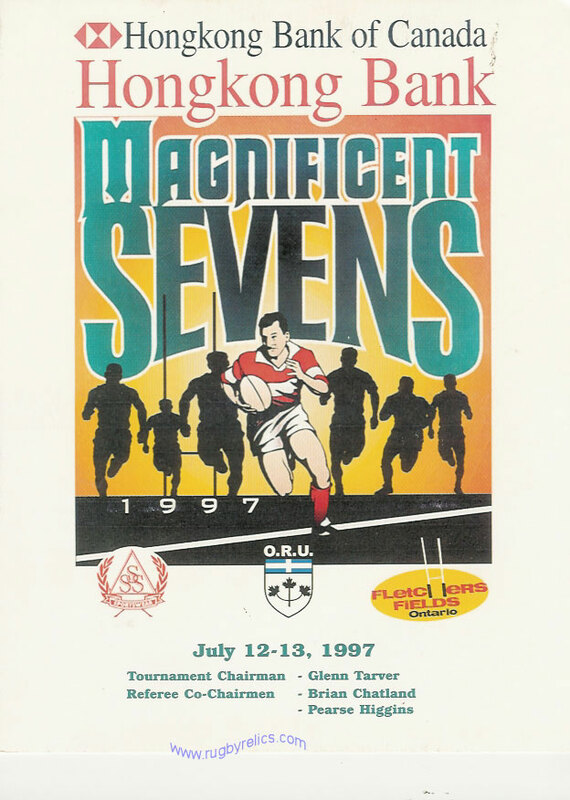 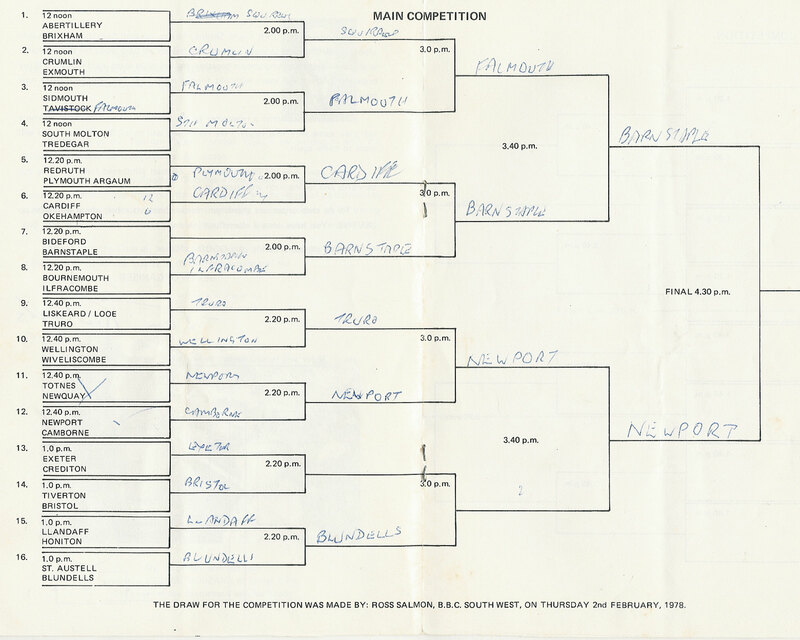 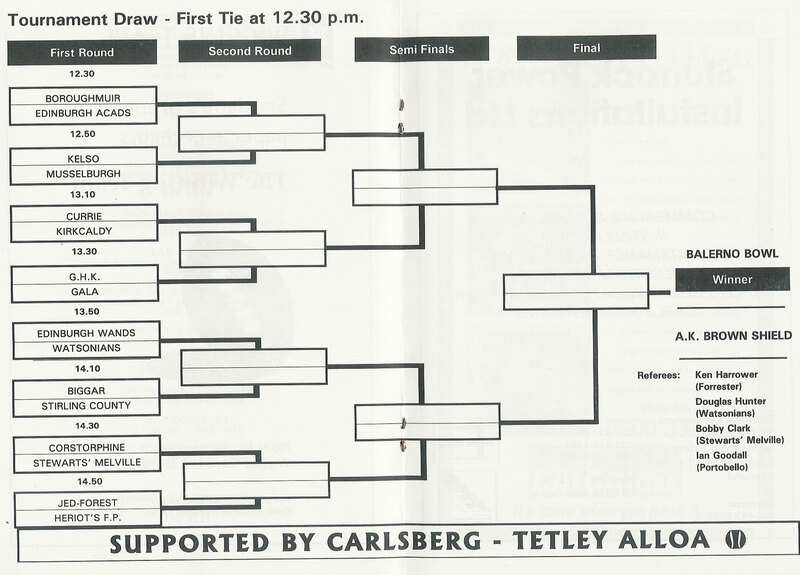 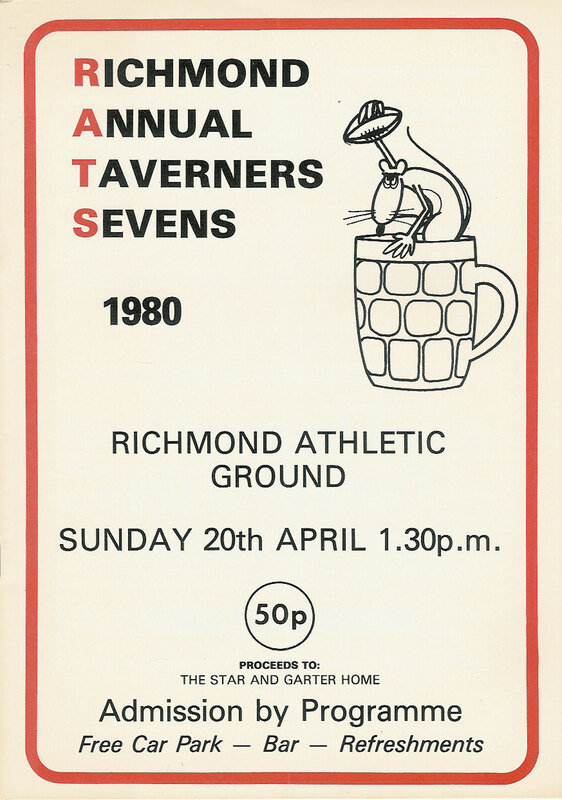 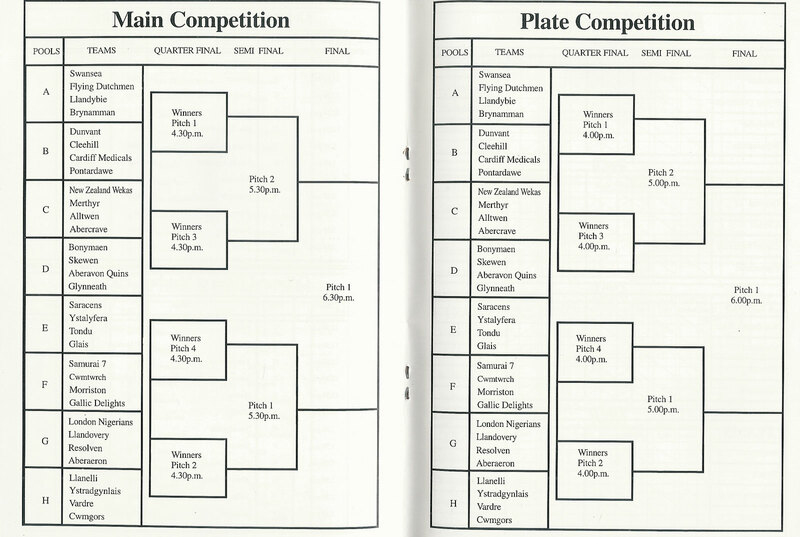 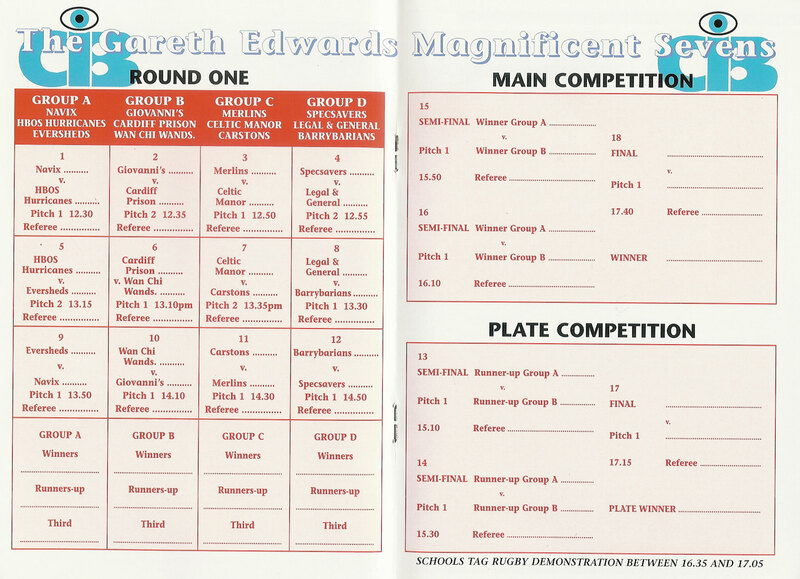 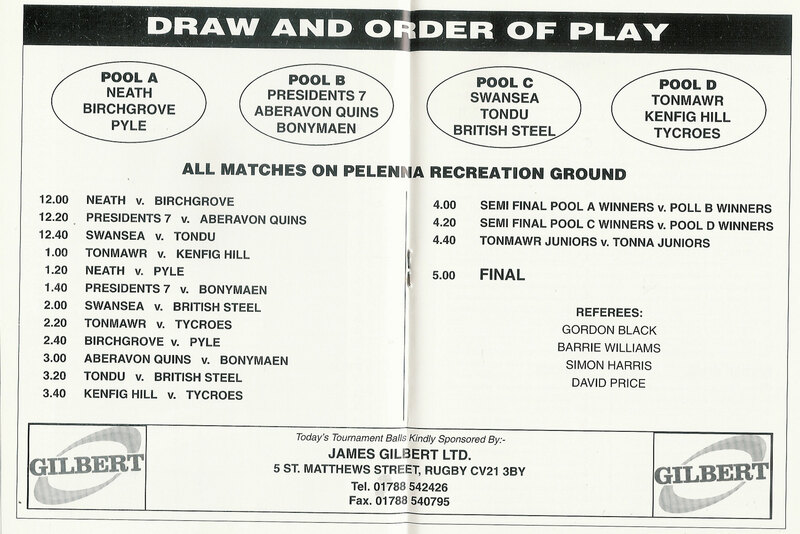 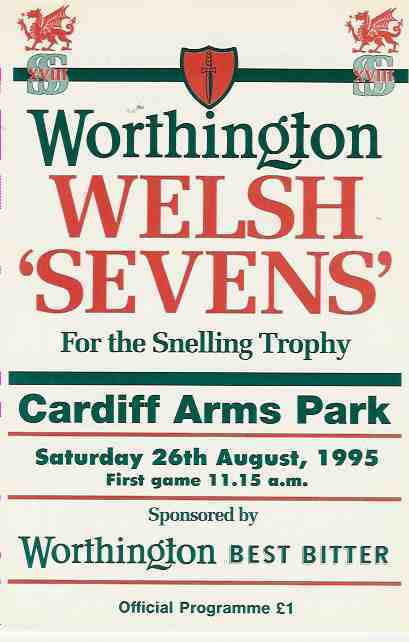 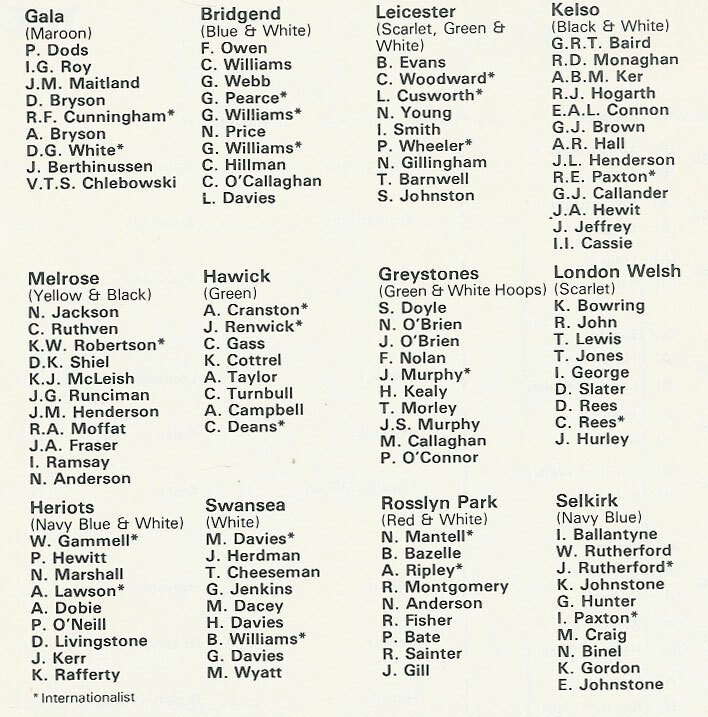 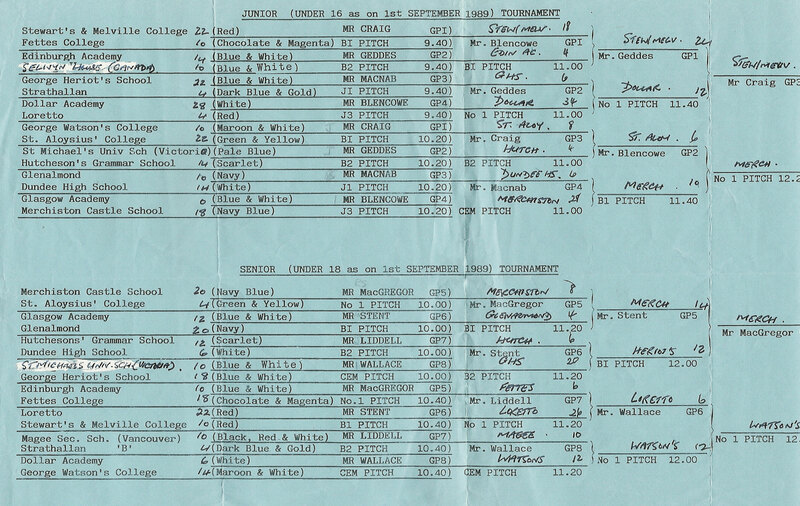 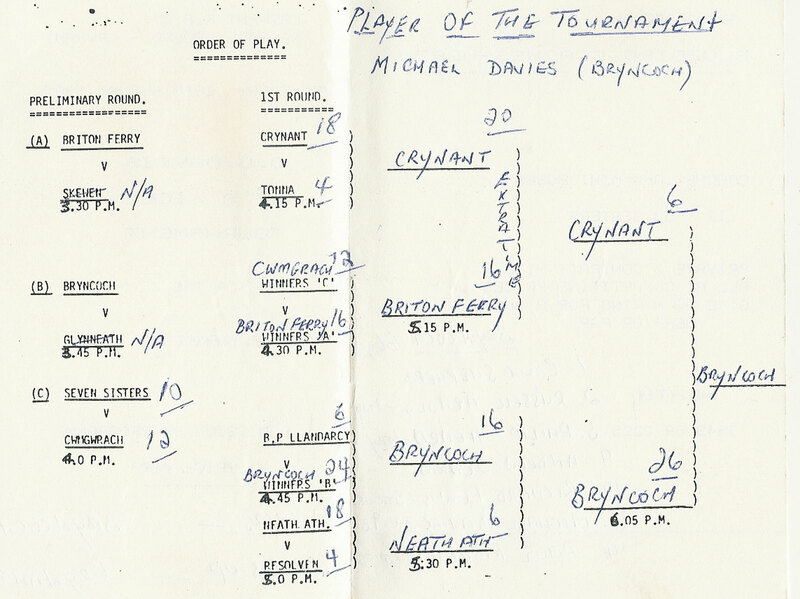 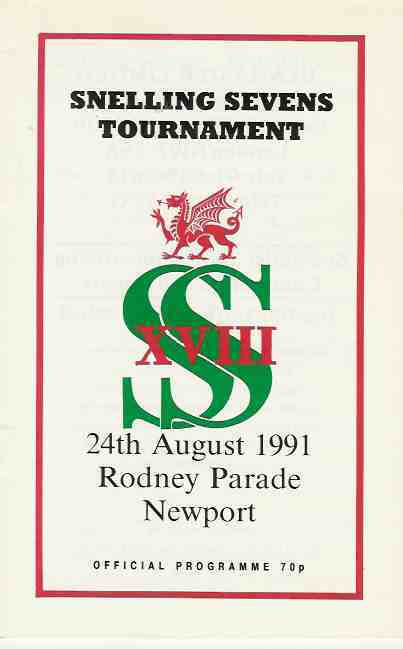 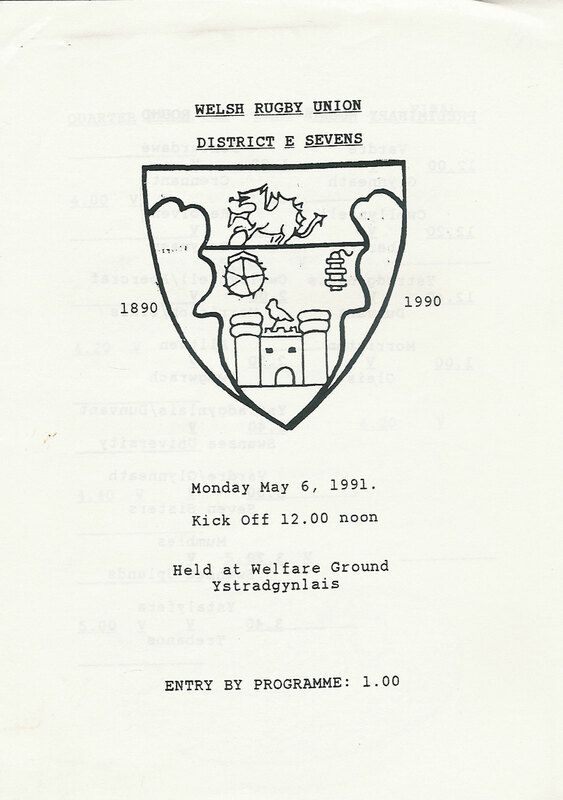 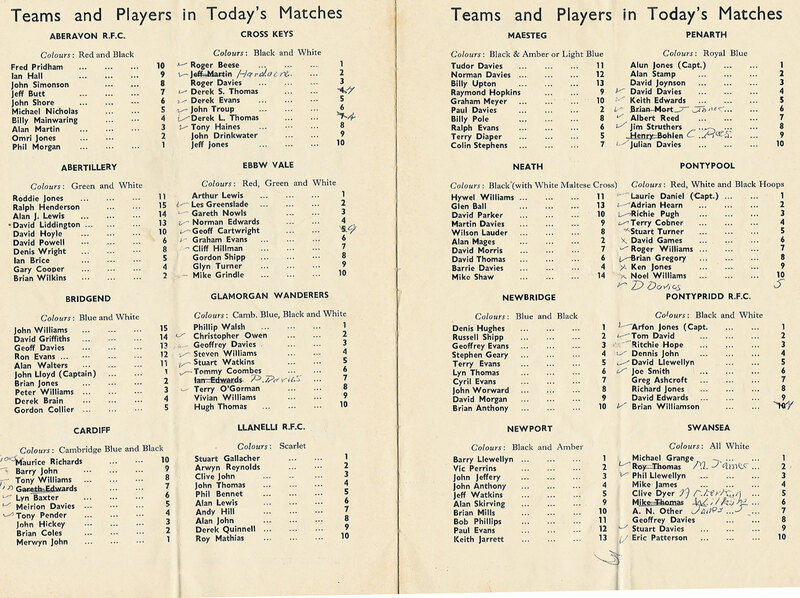 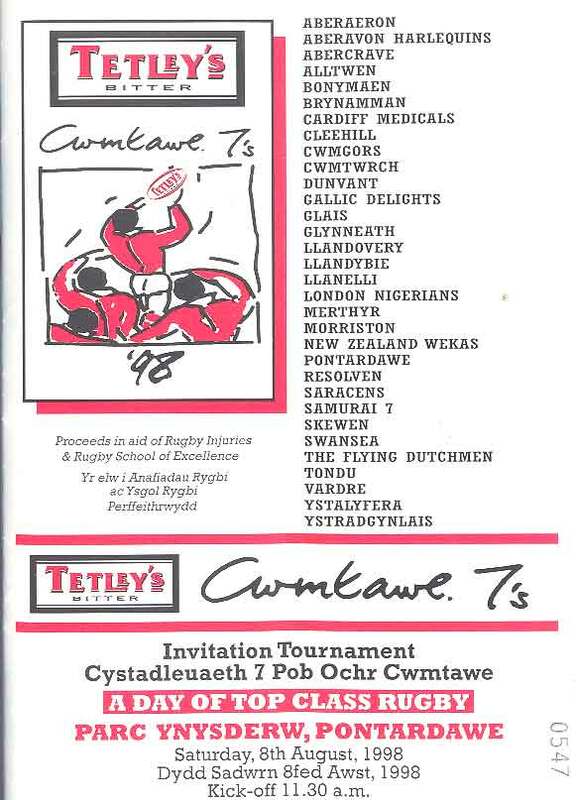 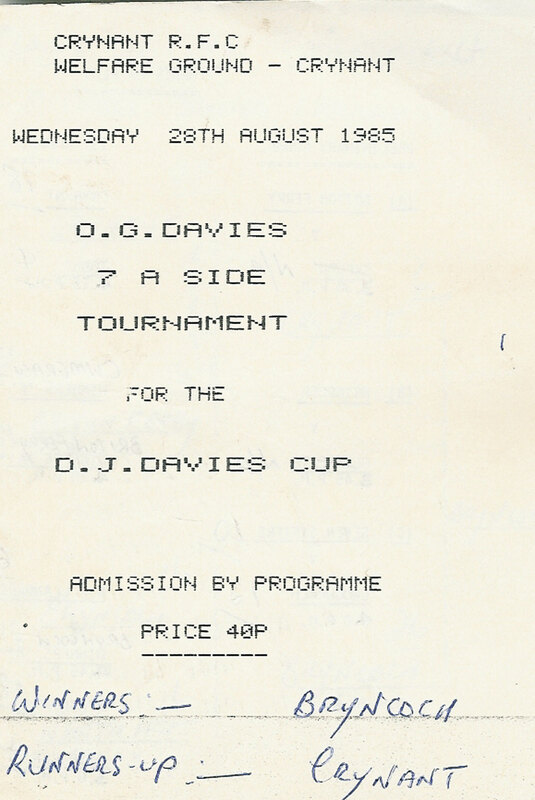 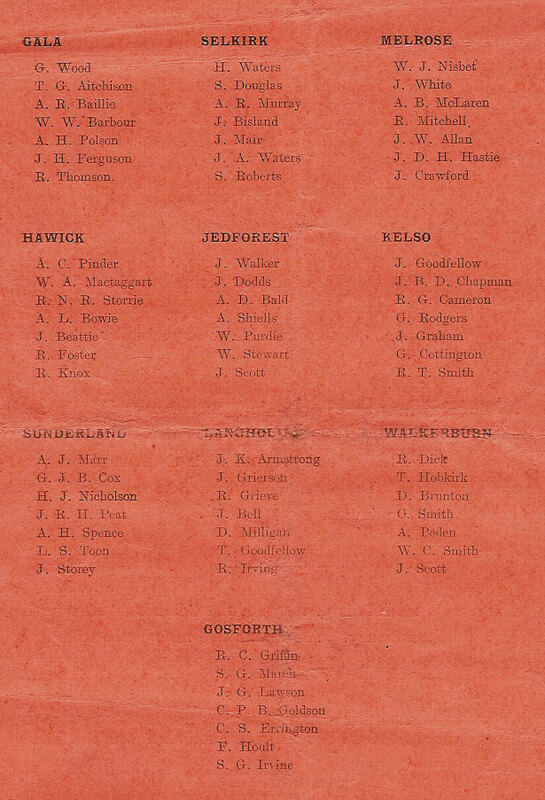 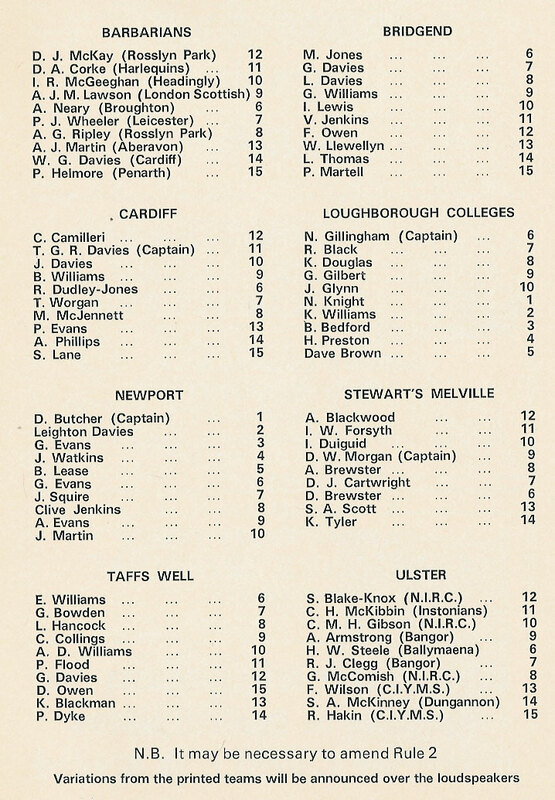 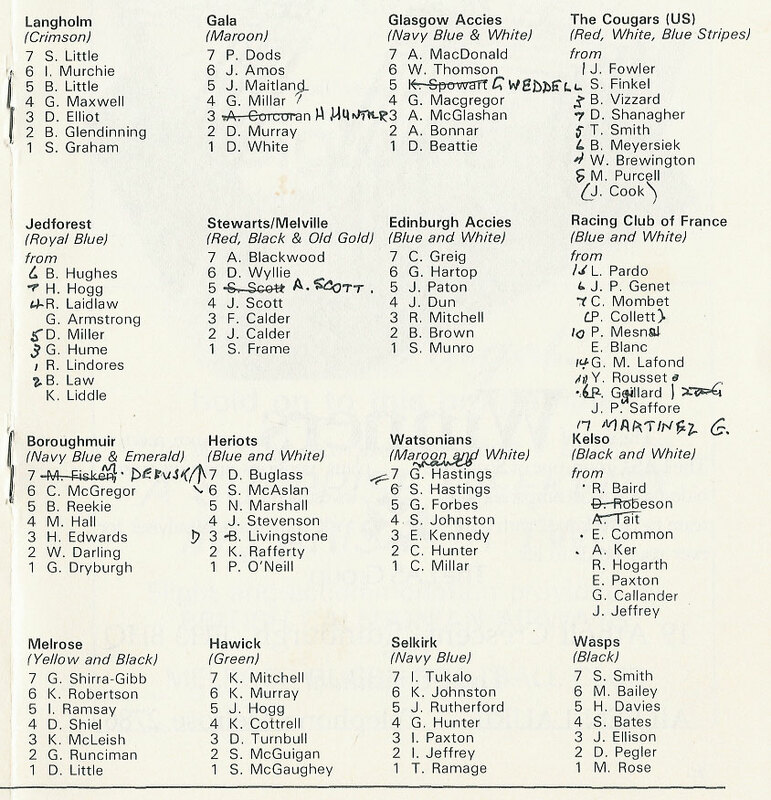 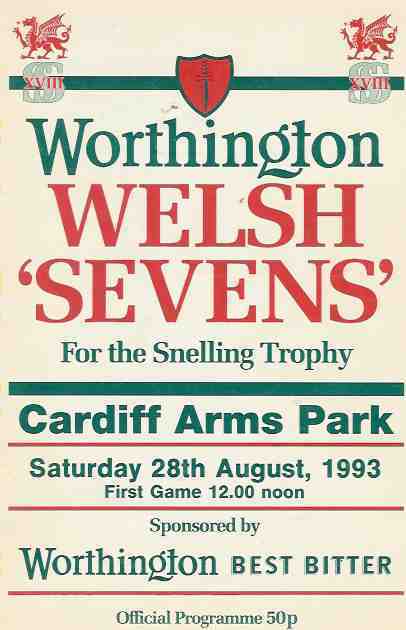 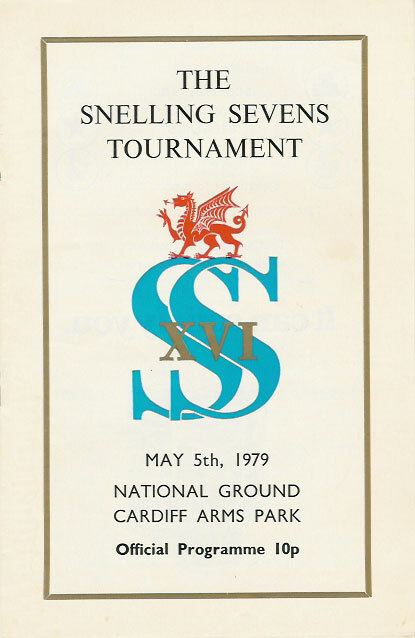 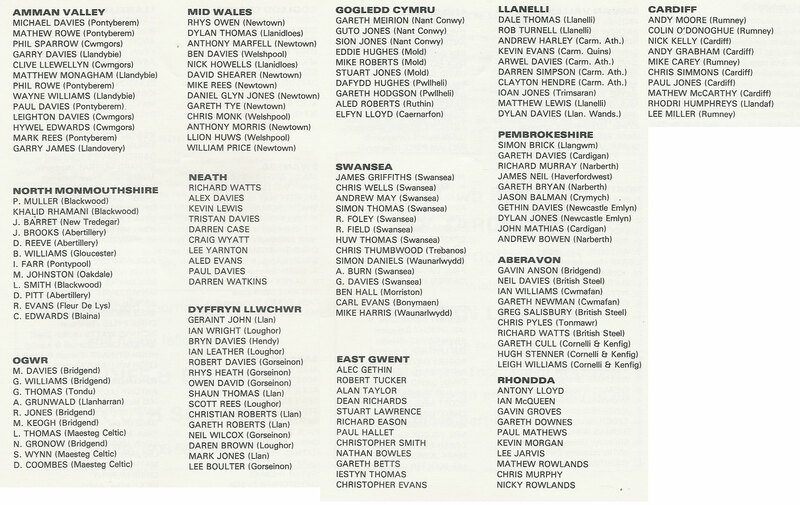 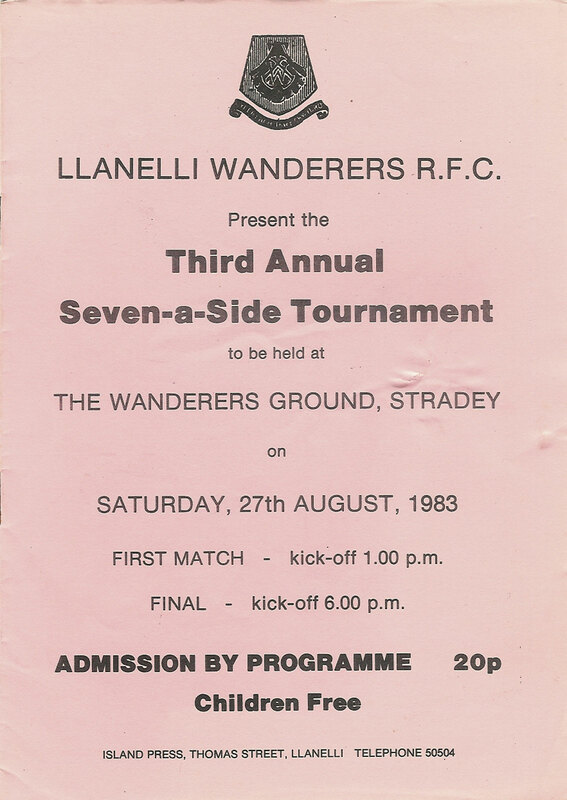 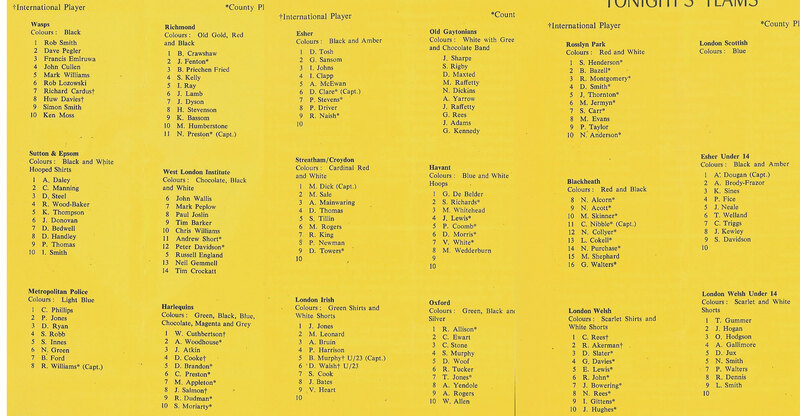 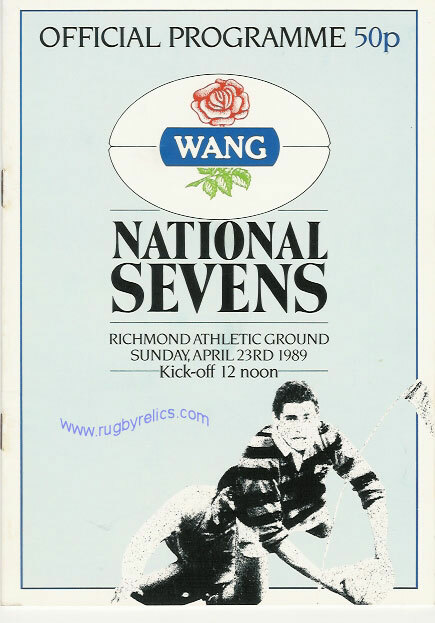 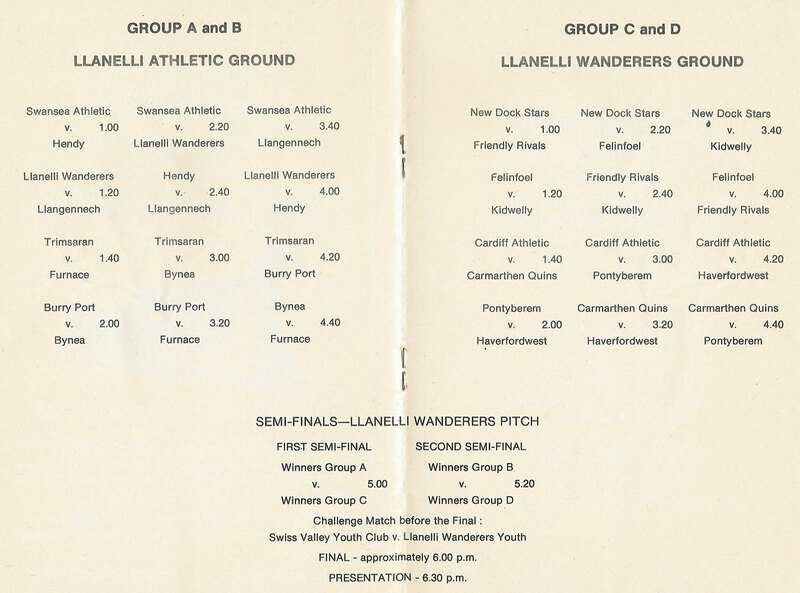 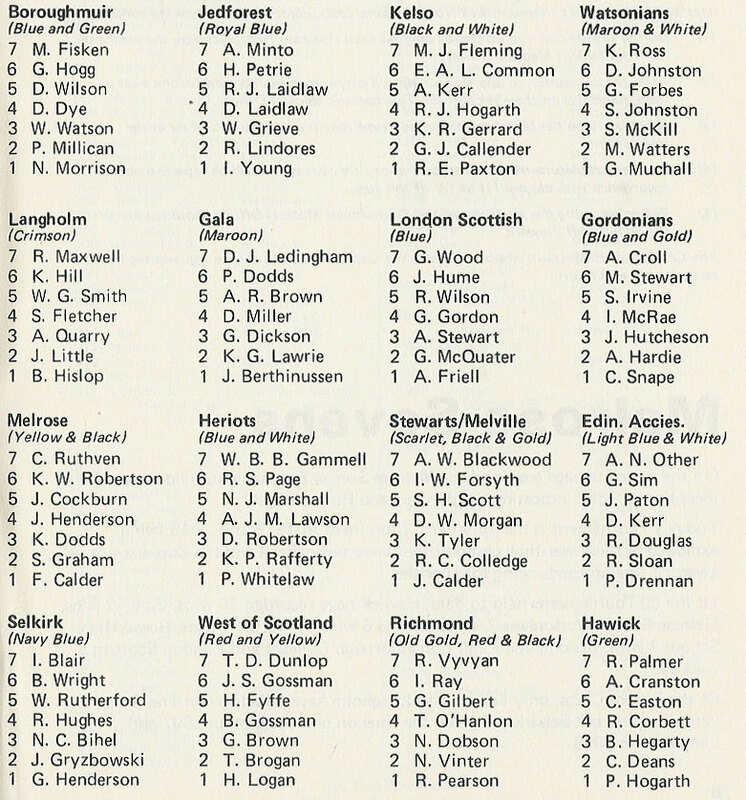 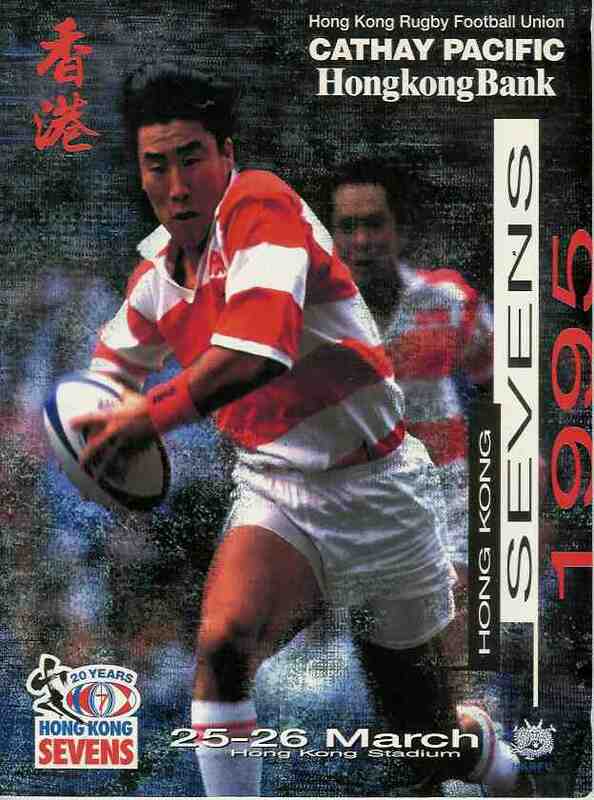 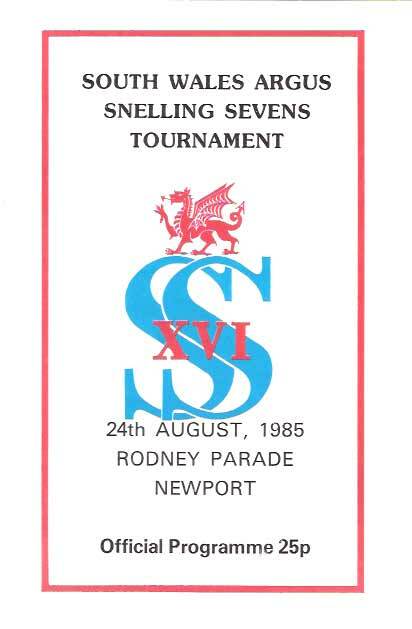 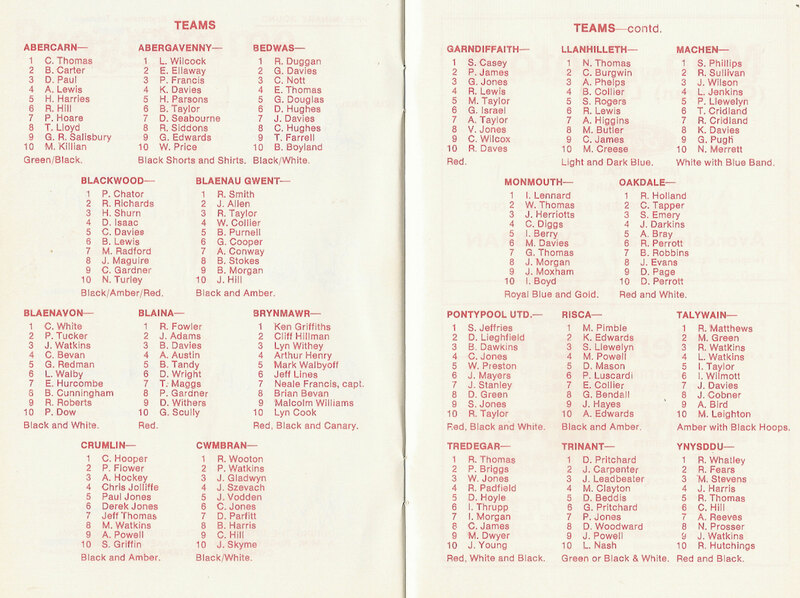 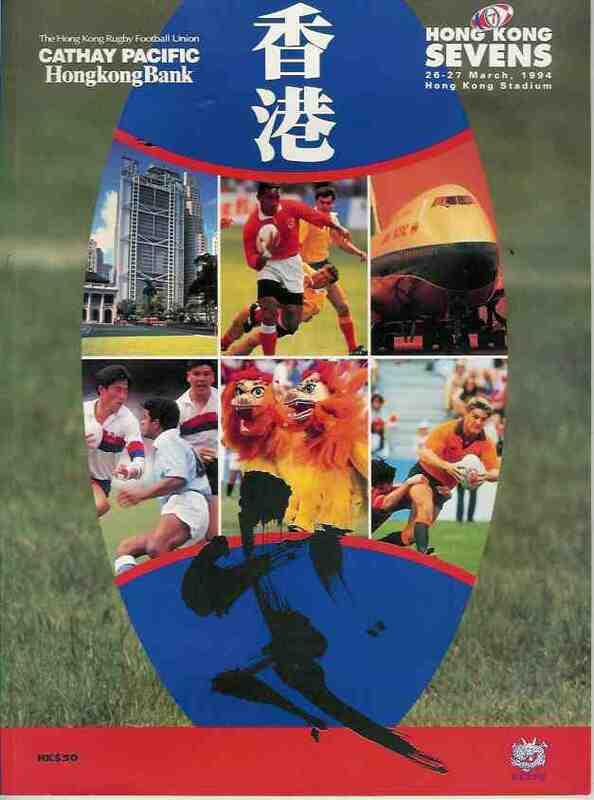 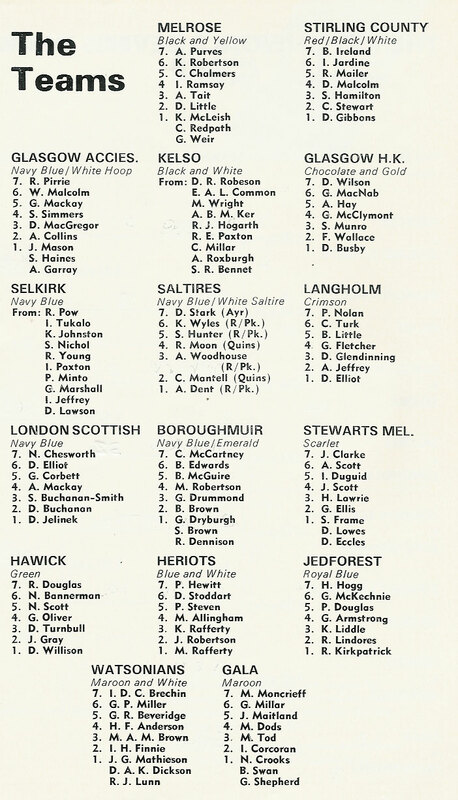 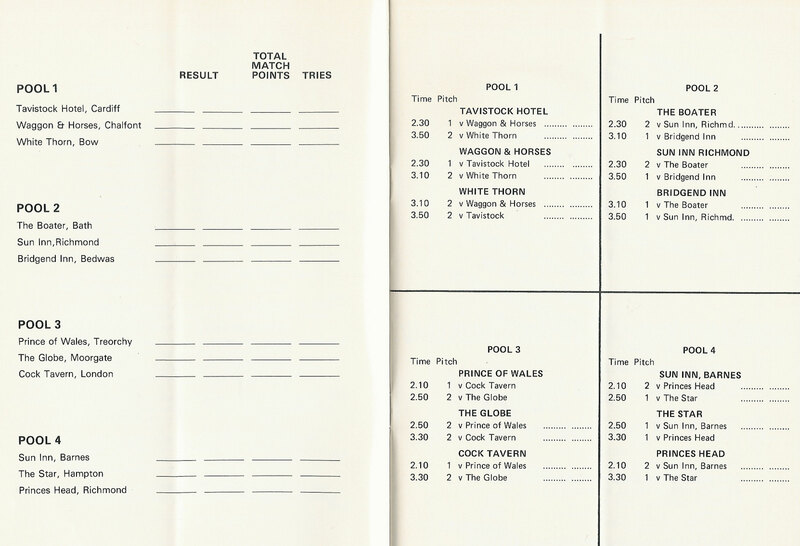 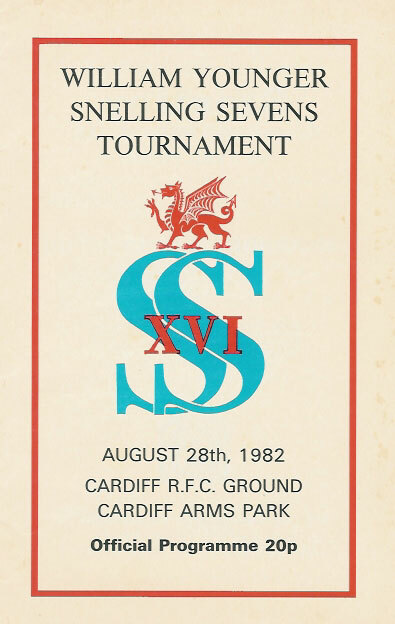 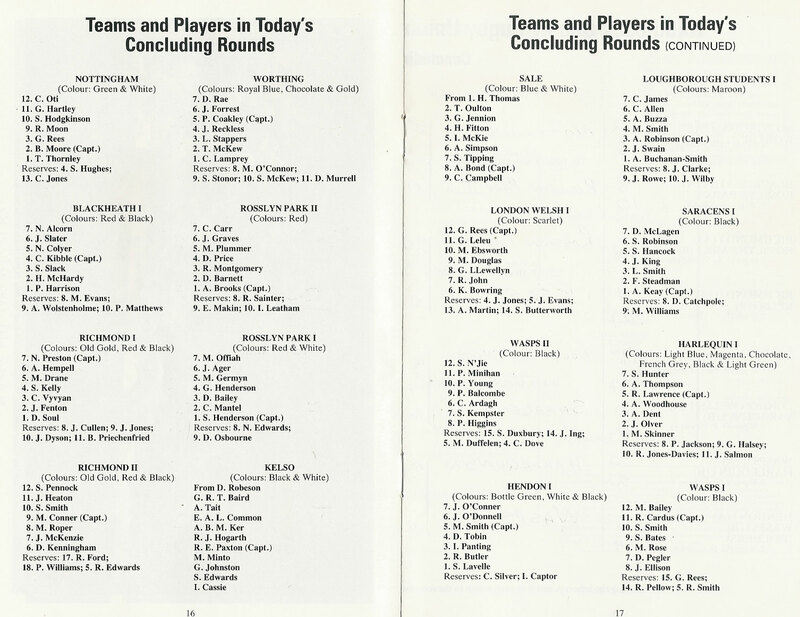 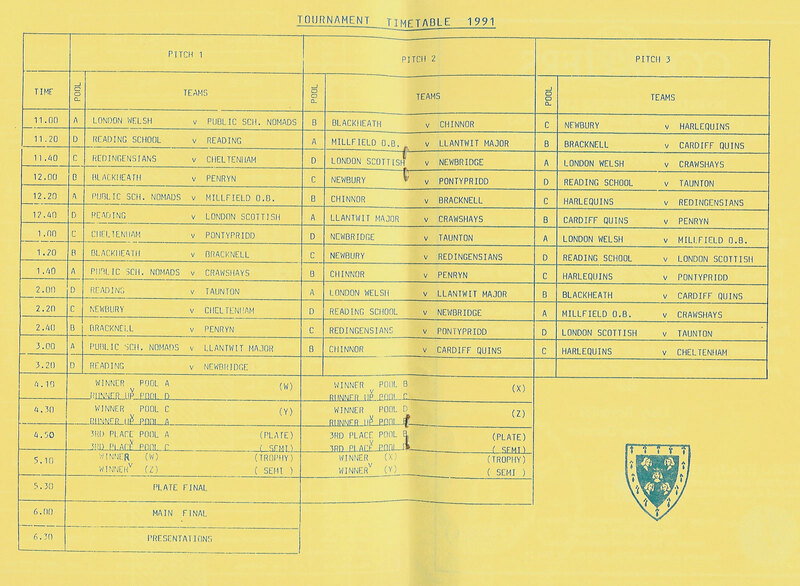 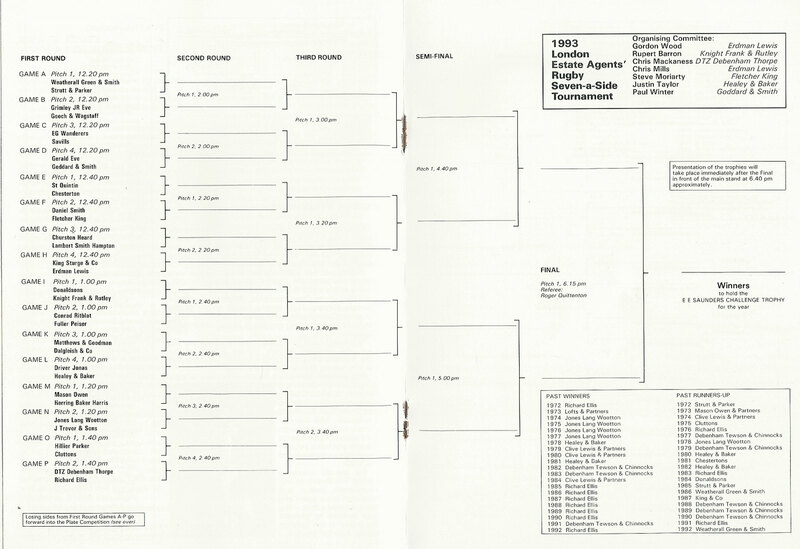 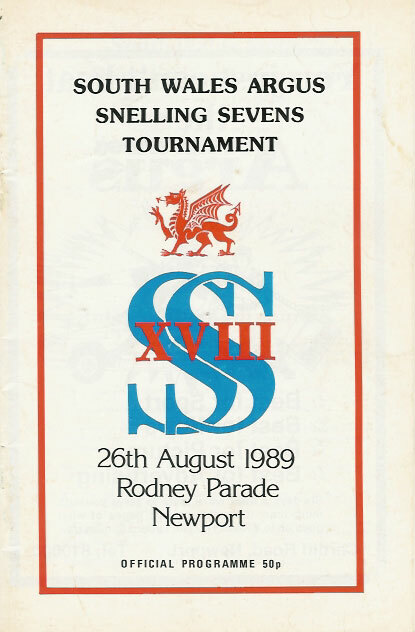 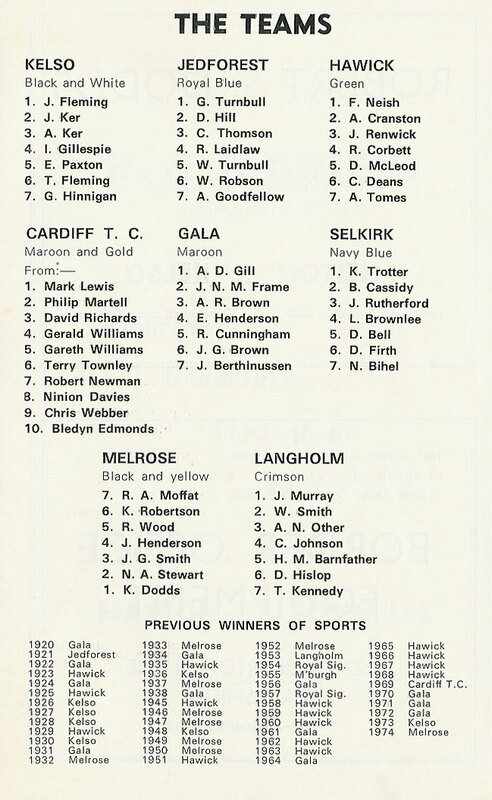 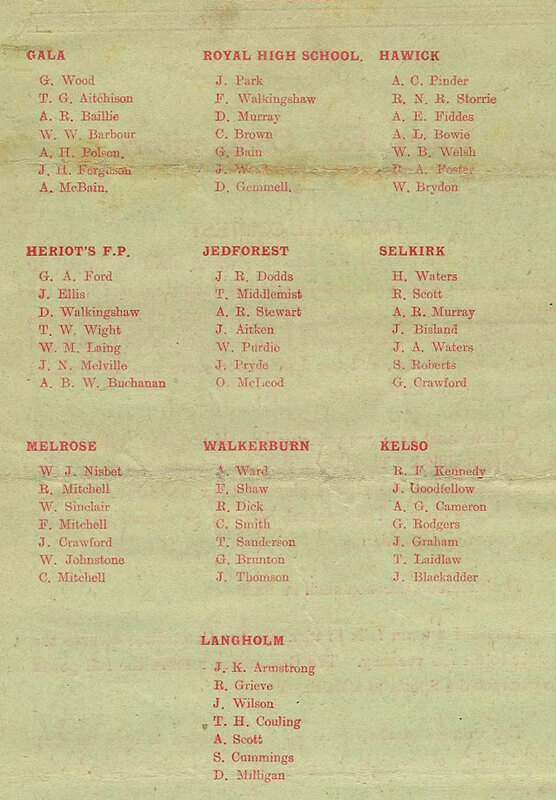 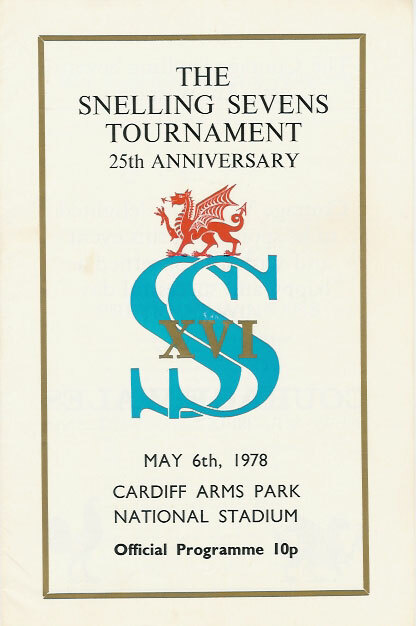 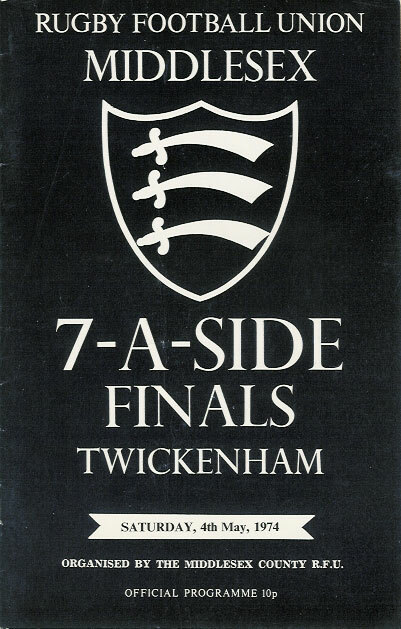 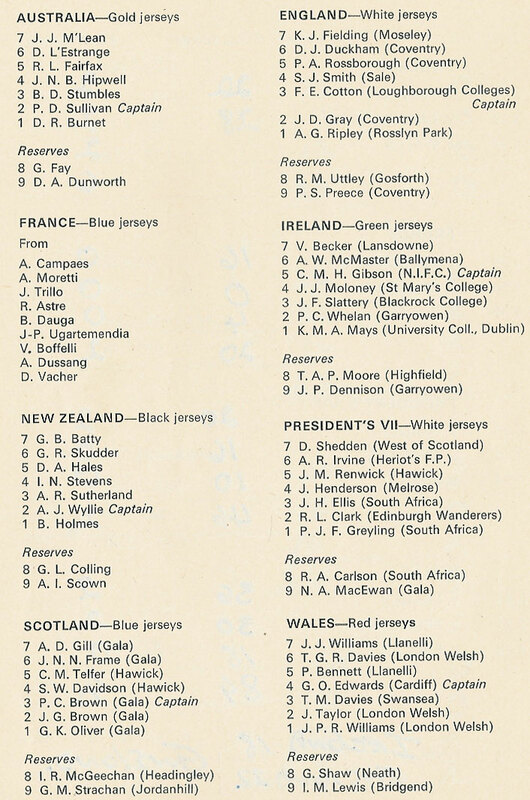 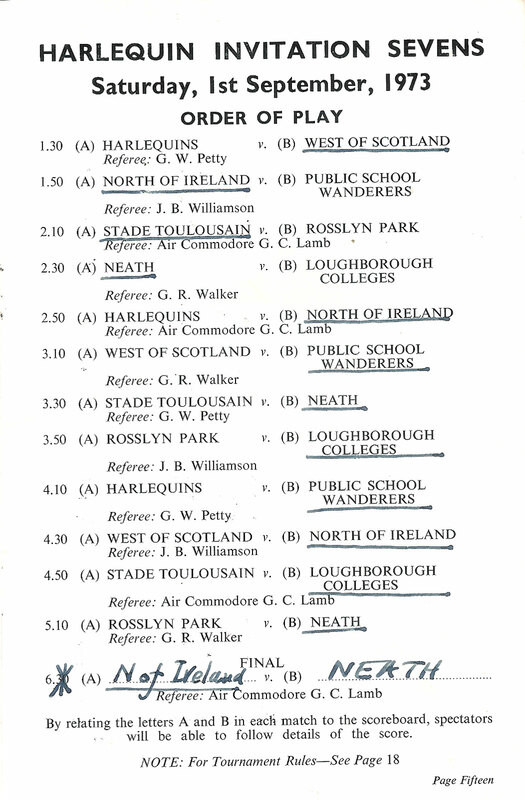 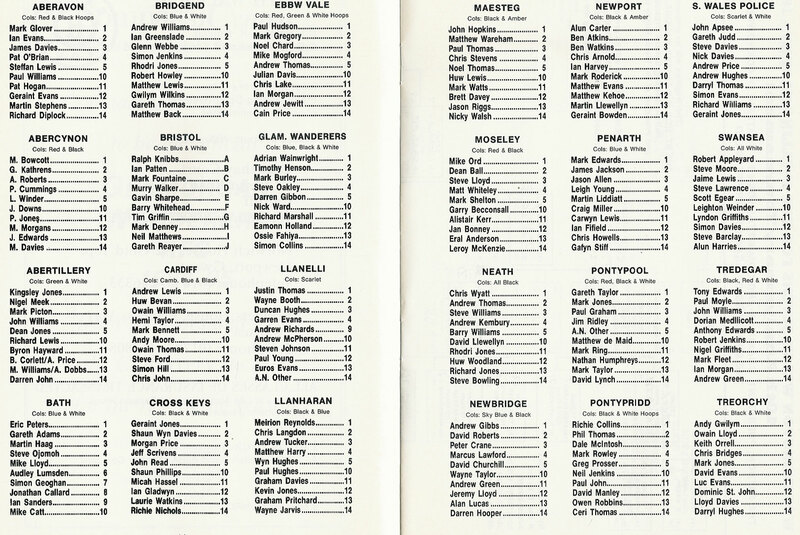 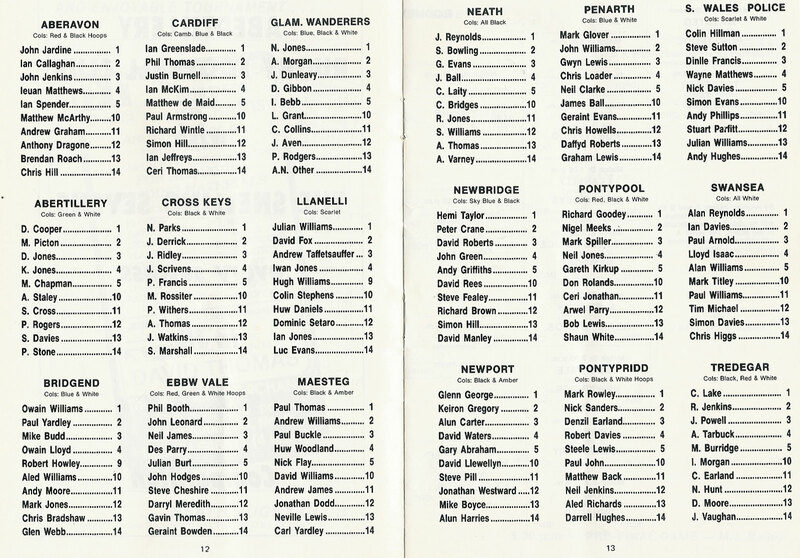 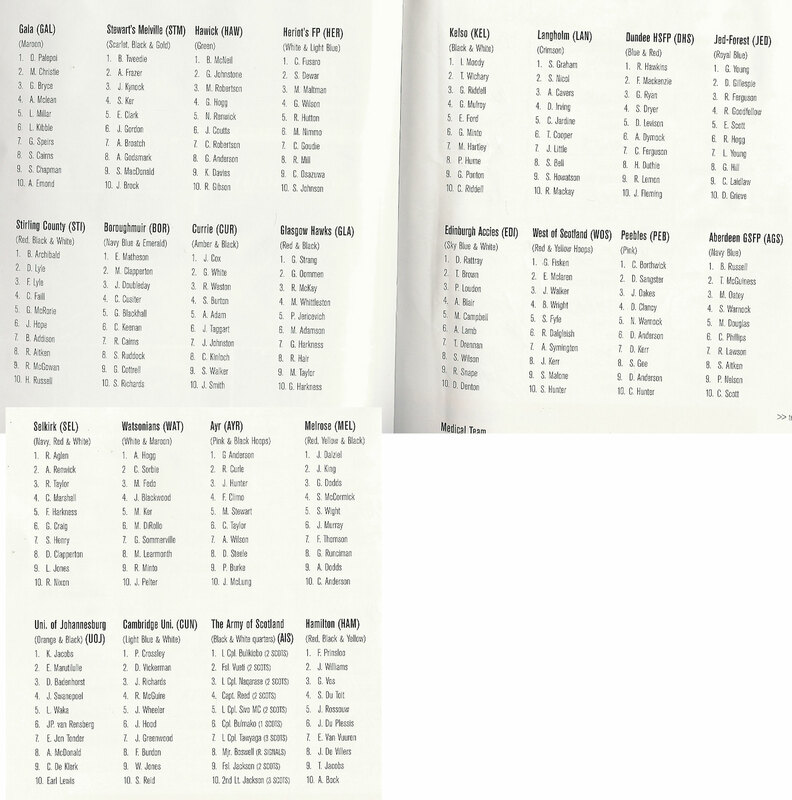 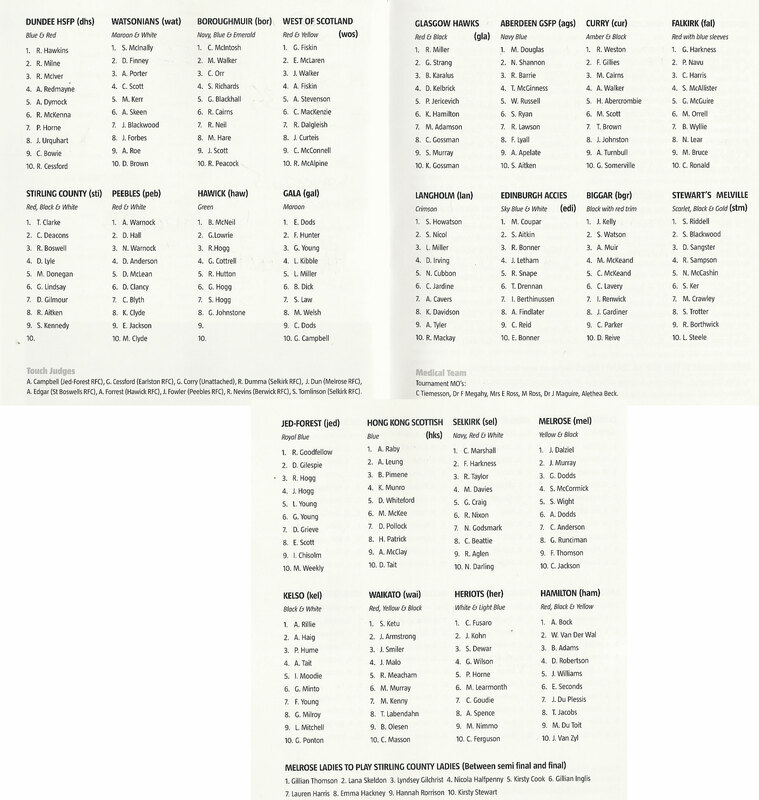 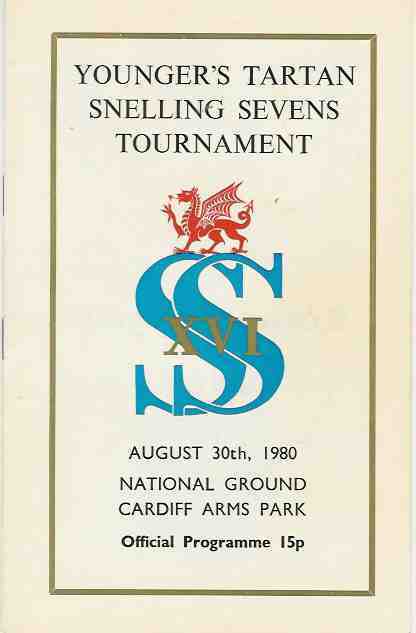 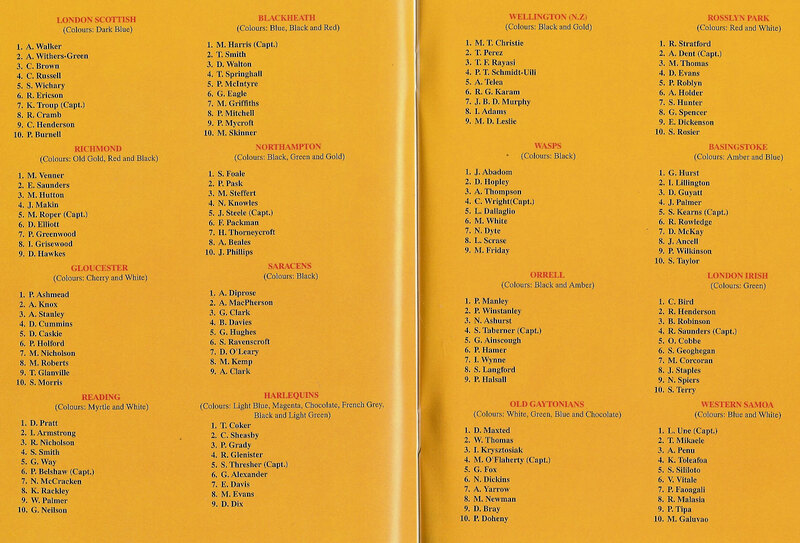 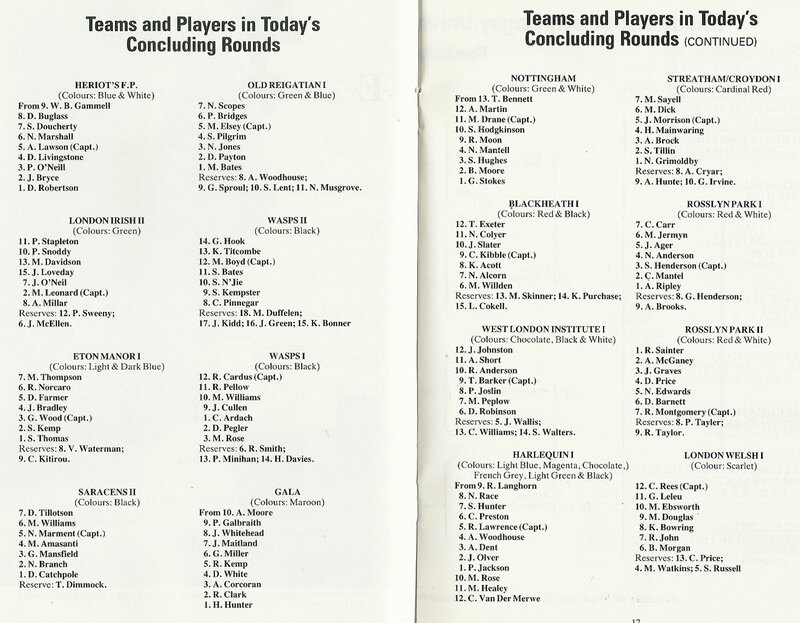 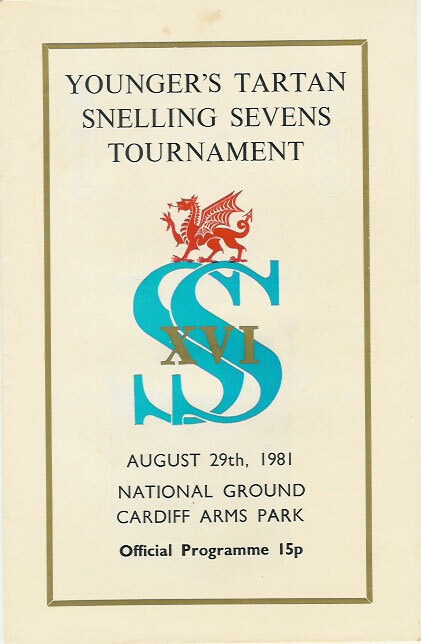 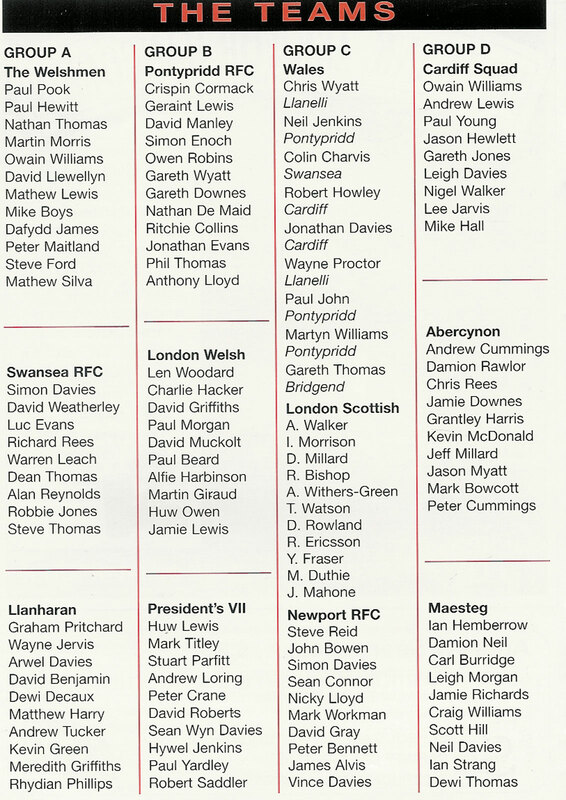 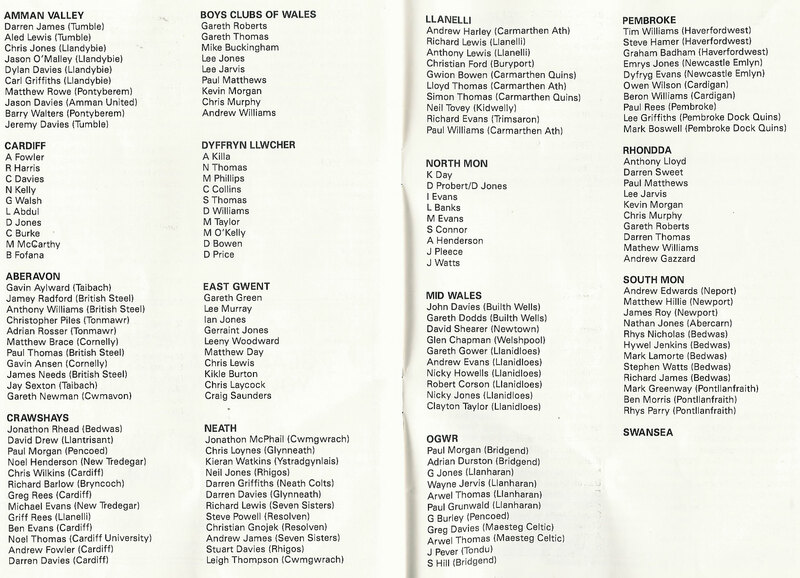 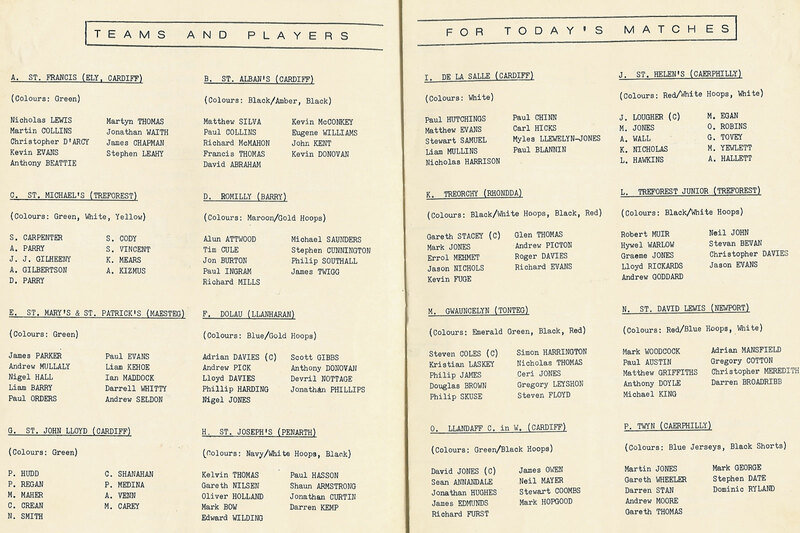 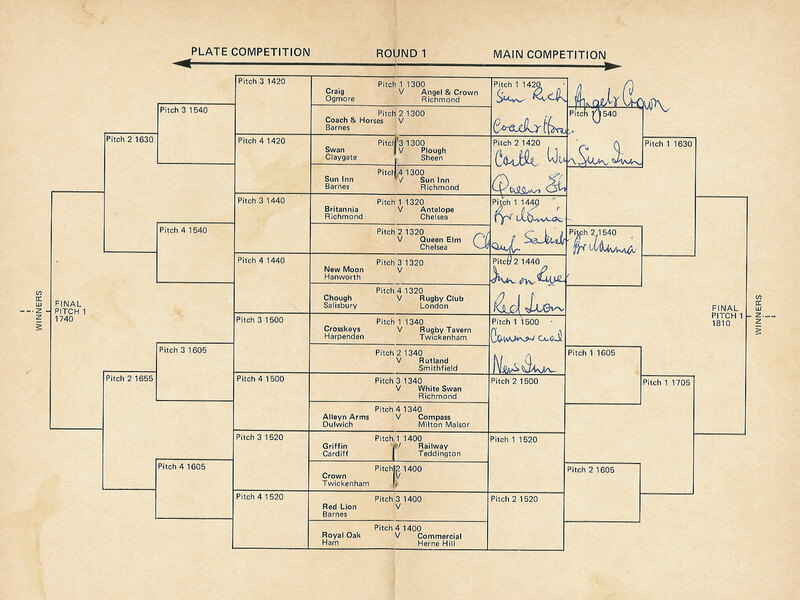 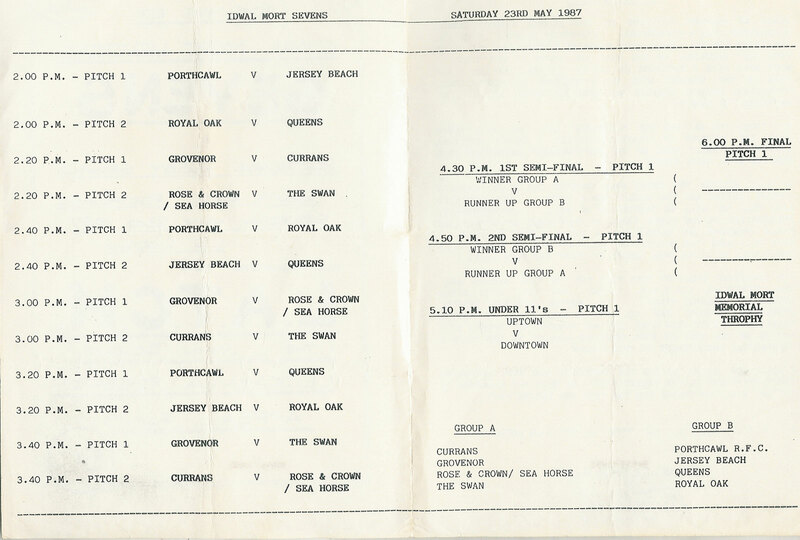 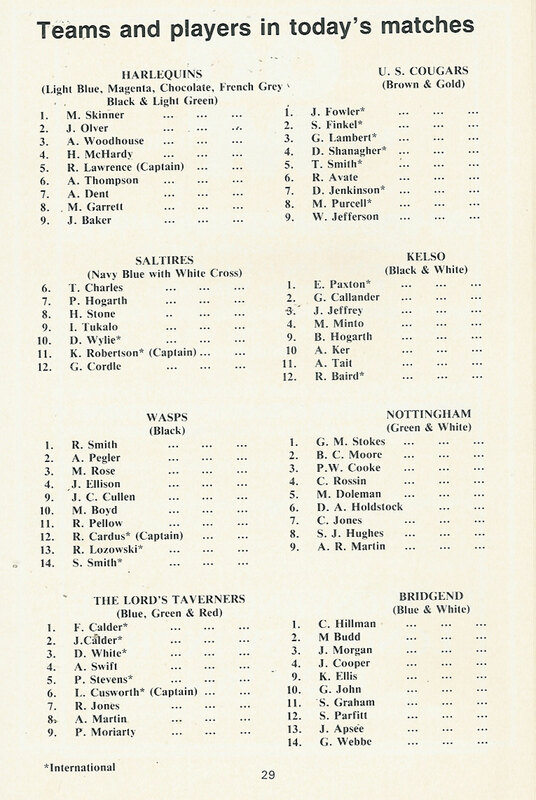 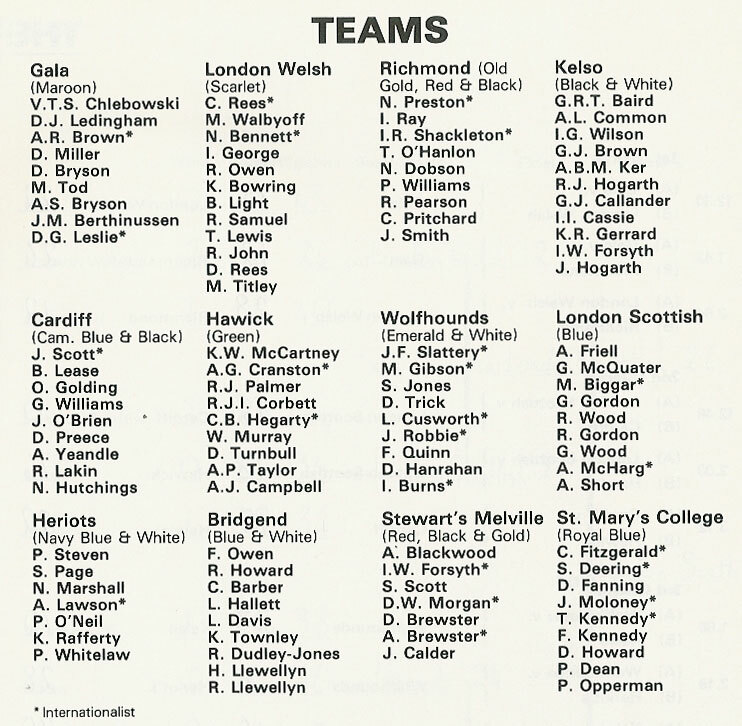 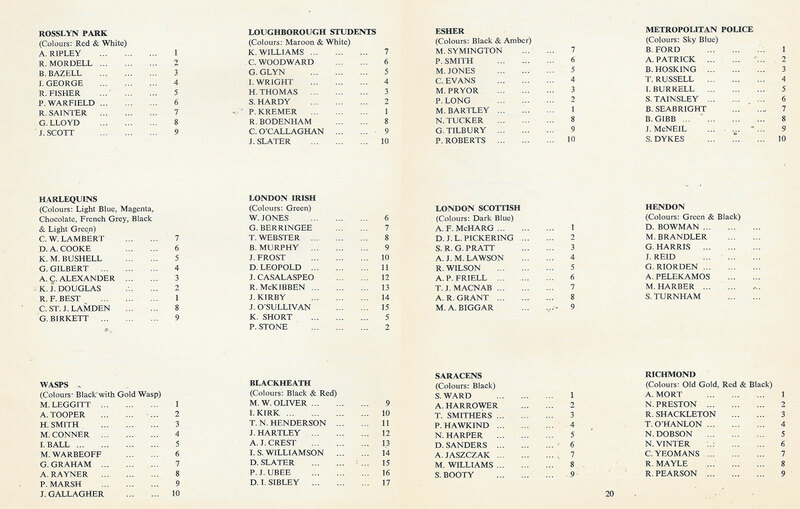 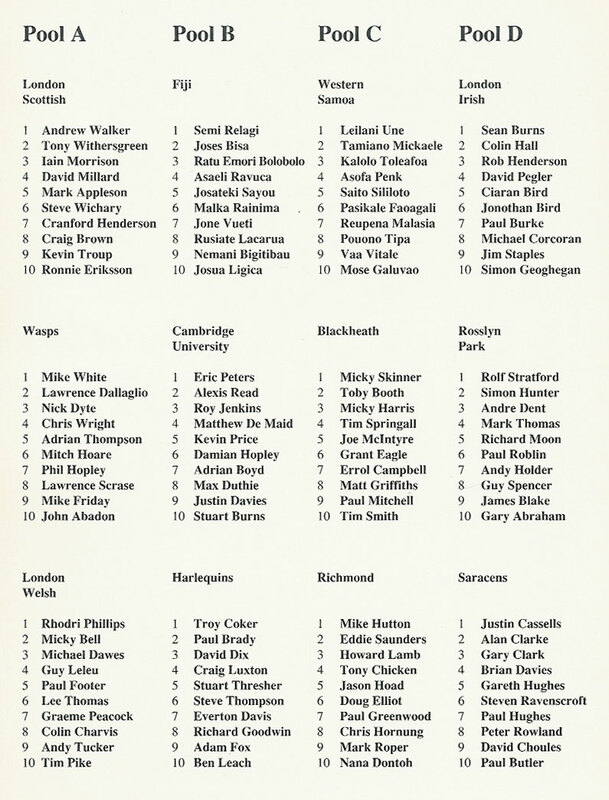 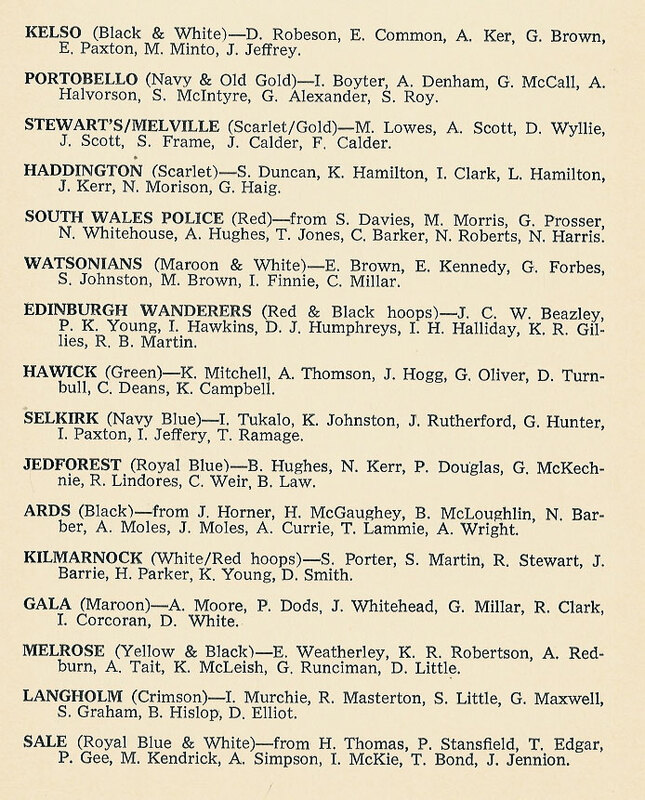 1989 NATIONAL SEVENS - sponsored by Wang played at Richmond. 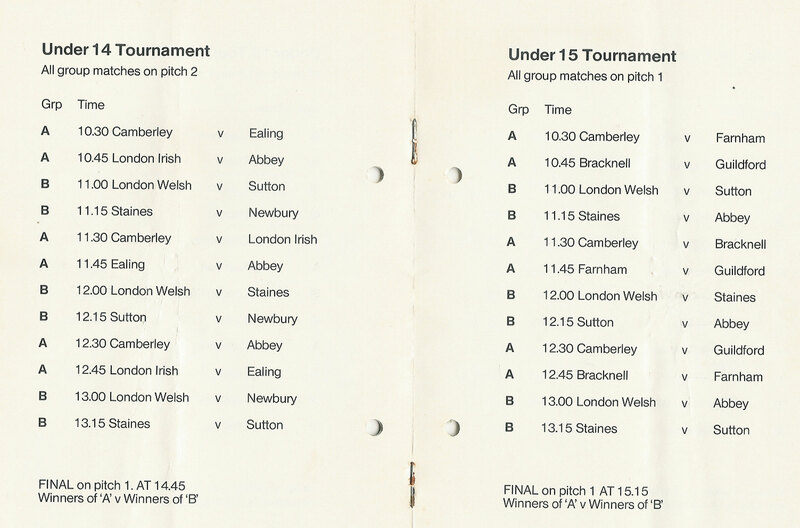 Teams include, Harlequins, Saracens, Bristol, Sale, Leicester, Wasps, Gloucester & Coventry. 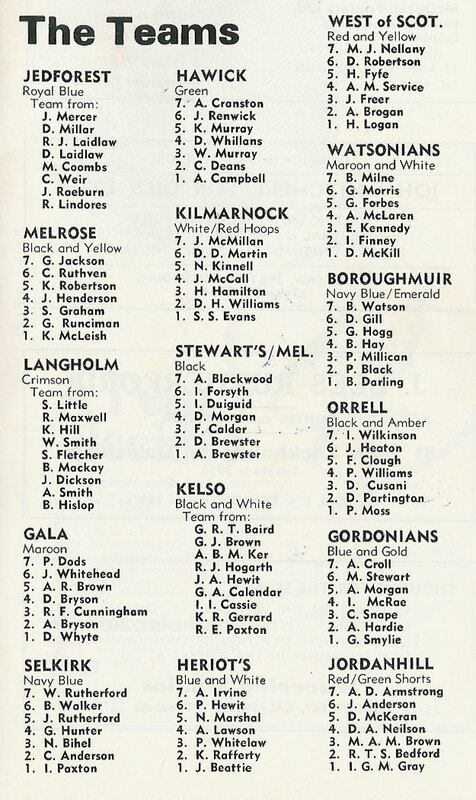 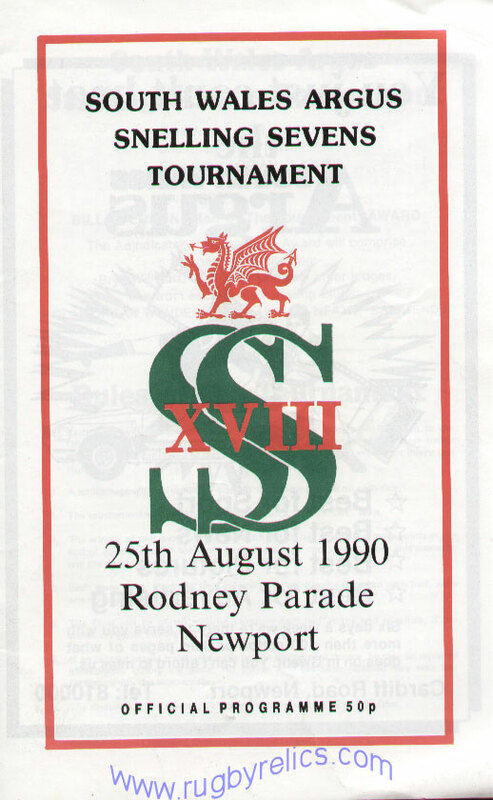 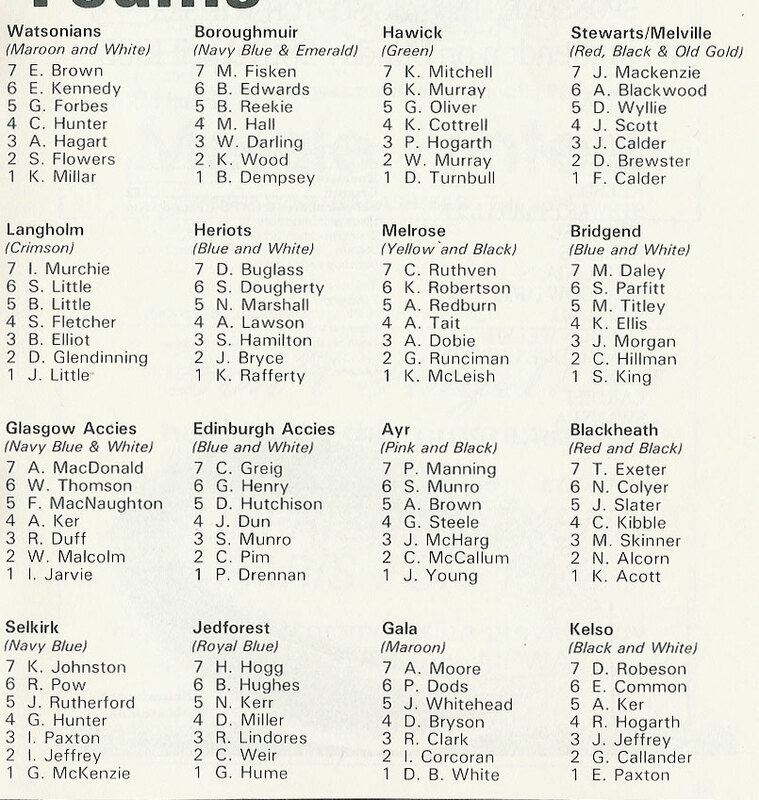 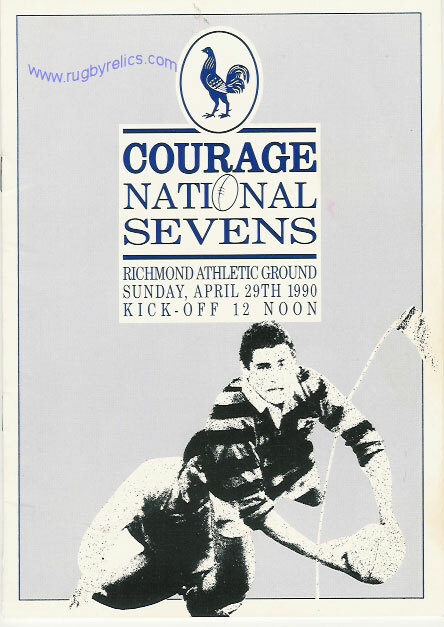 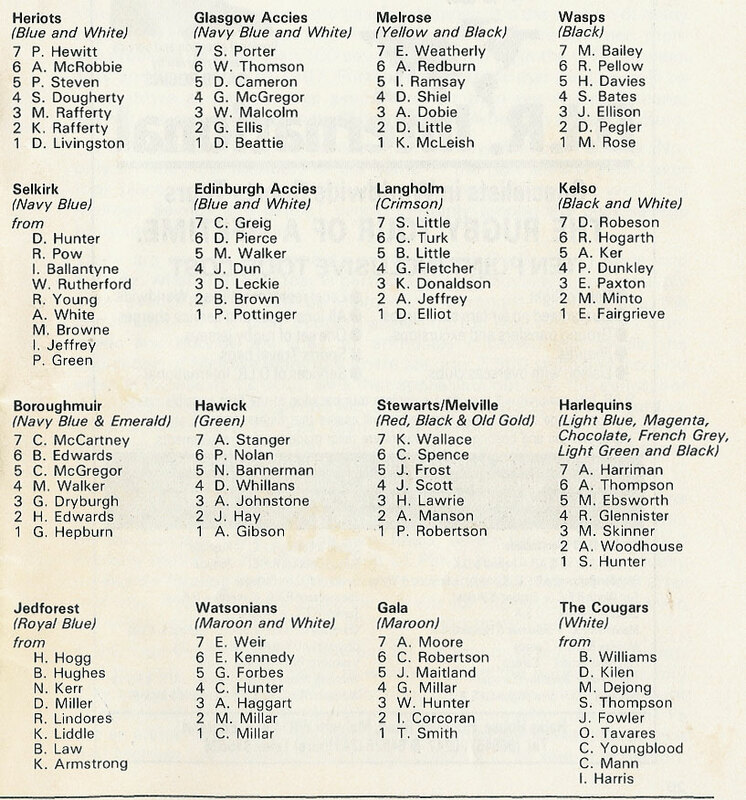 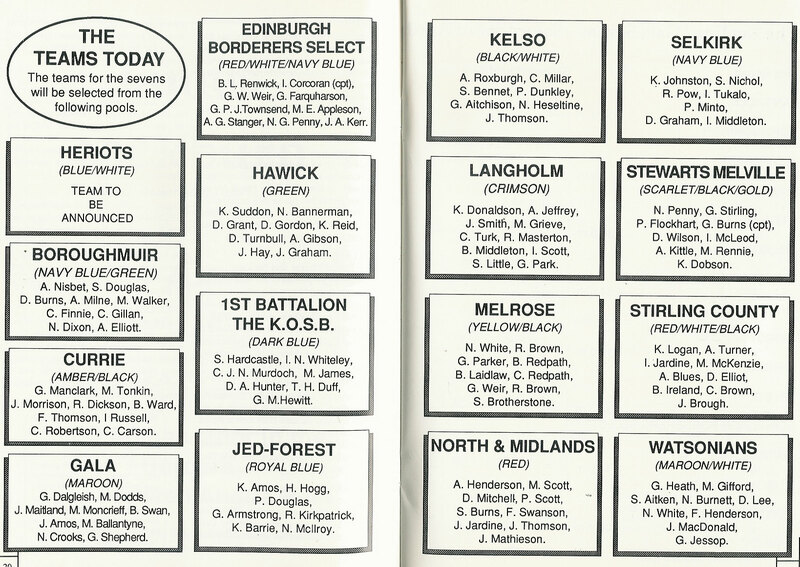 1990 NATIONAL SEVENS - sponsored by Courage played at Richmond. 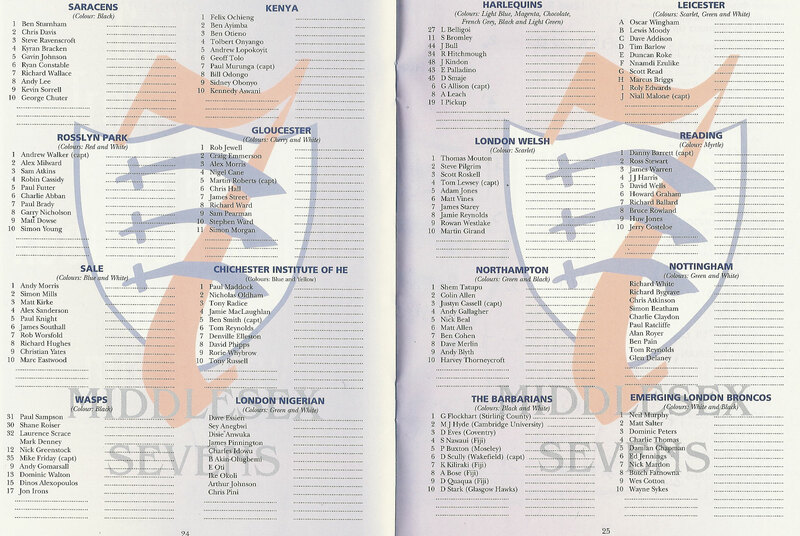 Teams include, Harlequins, Saracens, Bristol, Sale, Leicester, Wasps, Gloucester & Coventry. 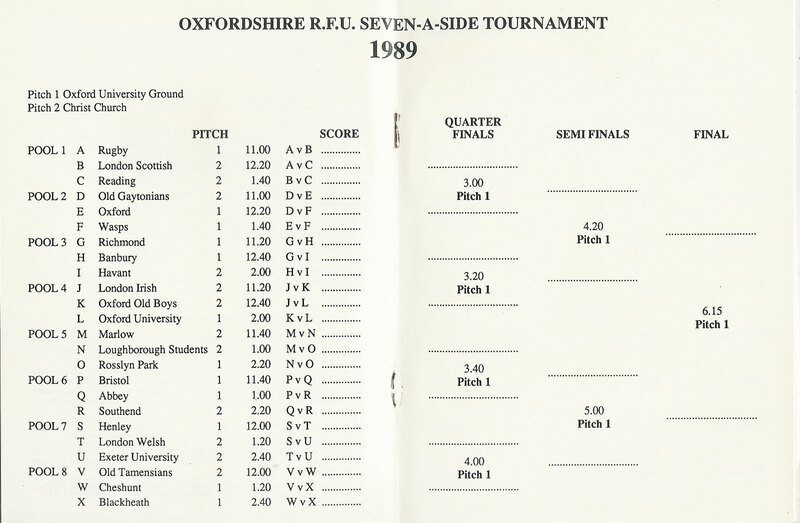 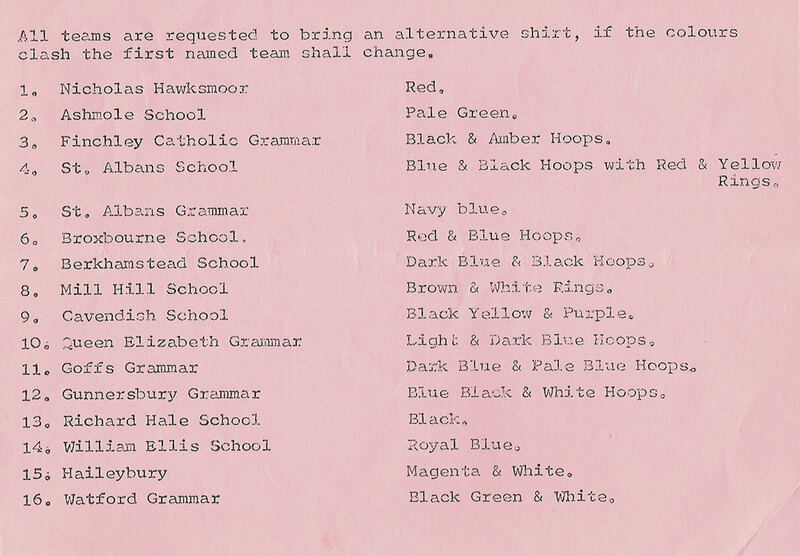 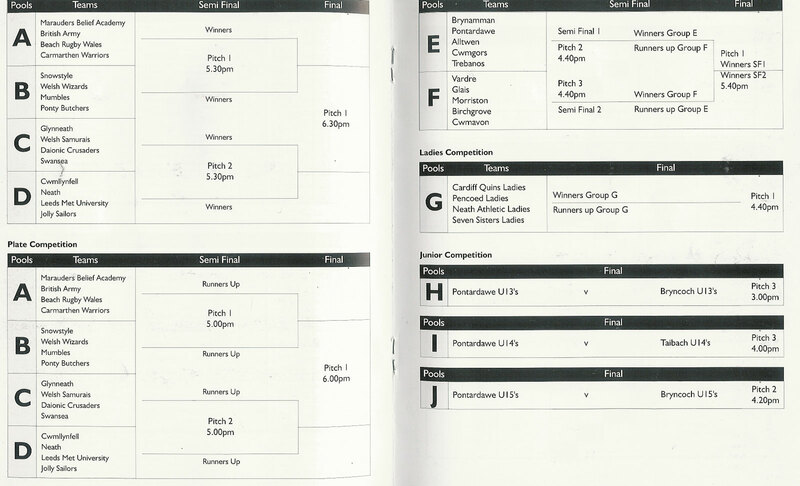 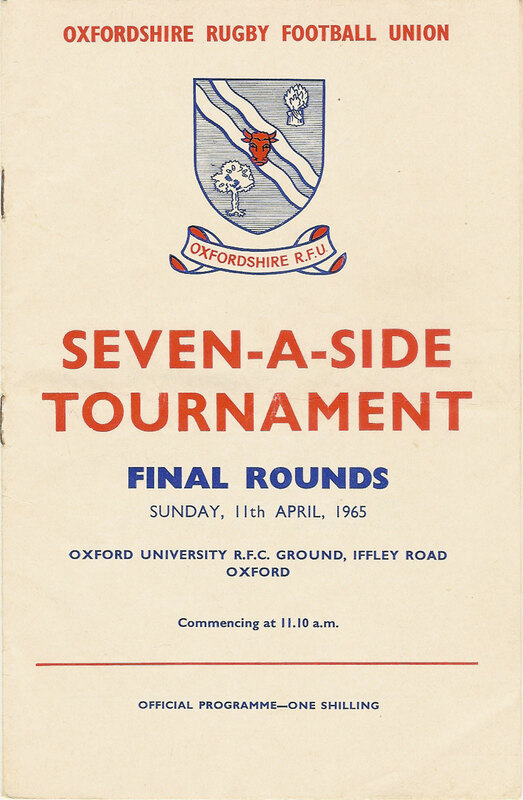 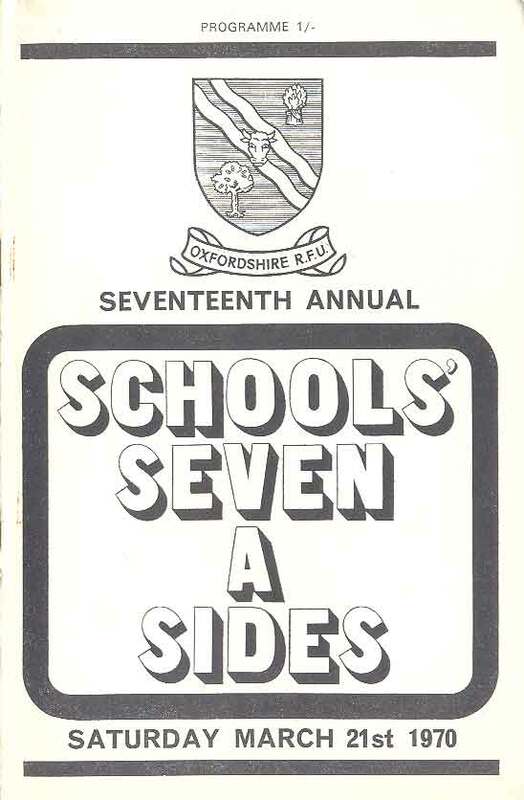 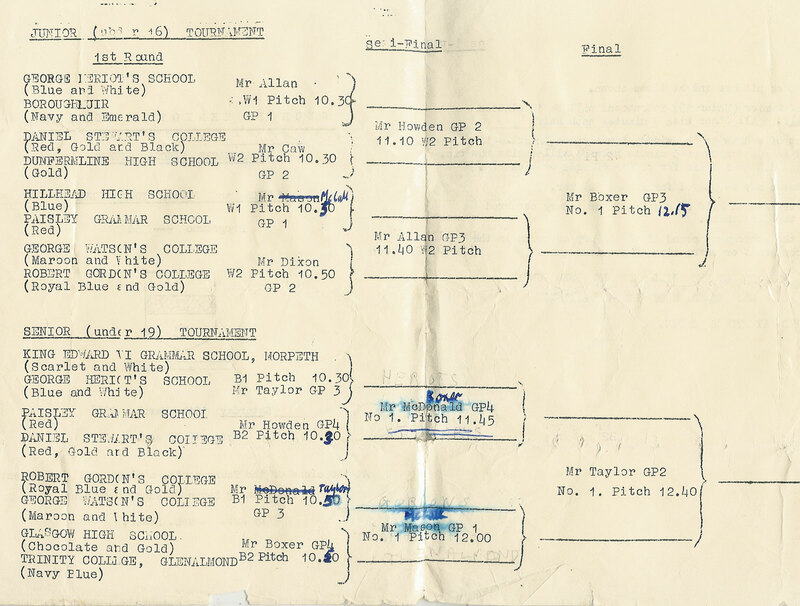 OXFORDSHIRE & OXFORDSHIRE SCHOOLS SEVENS. 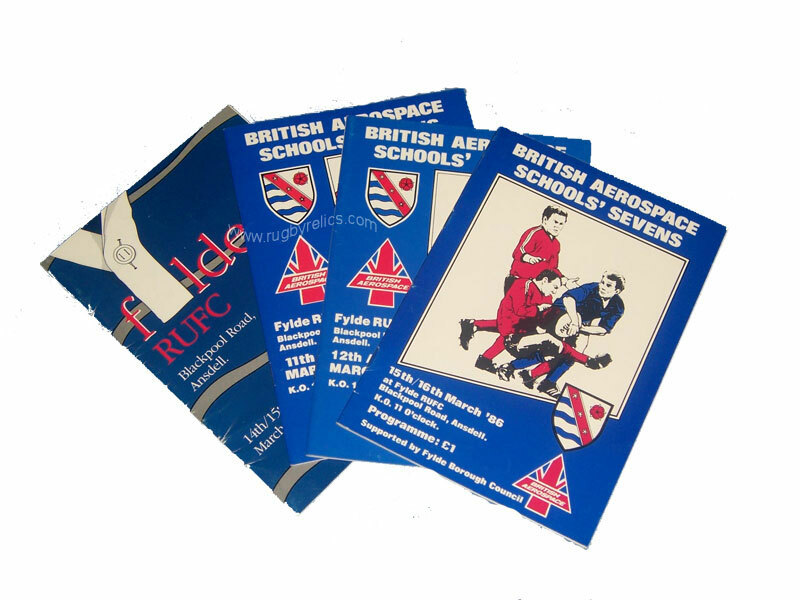 Please note the 1961 Sevens illustrated is NOT included in this bundle. 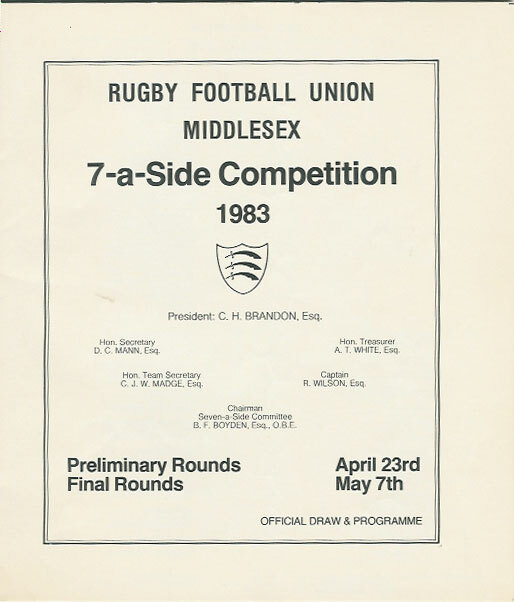 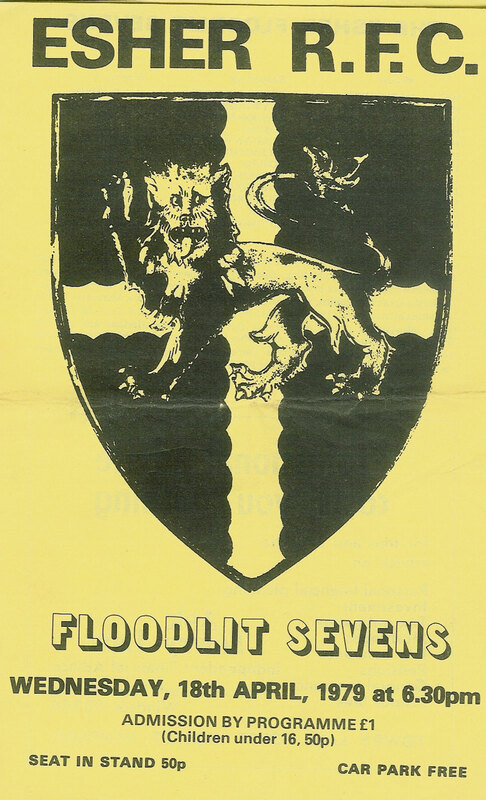 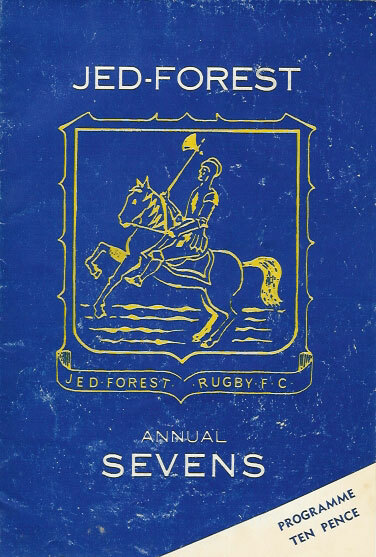 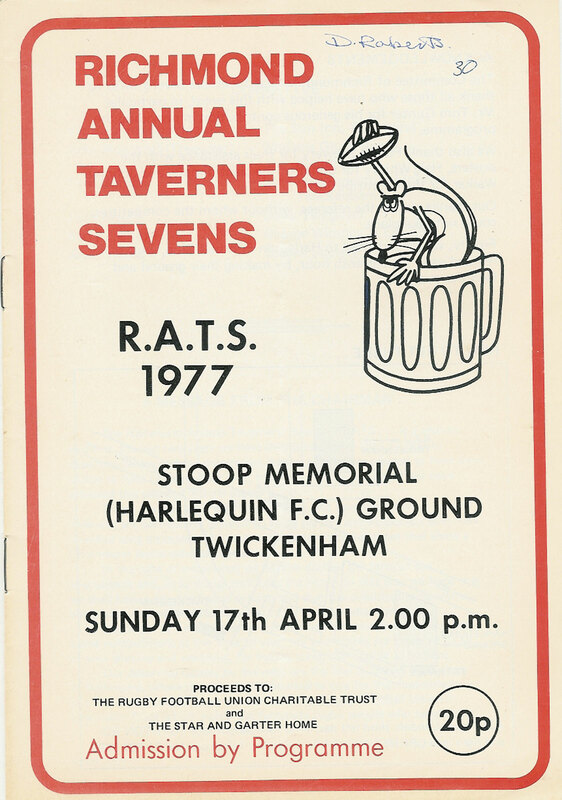 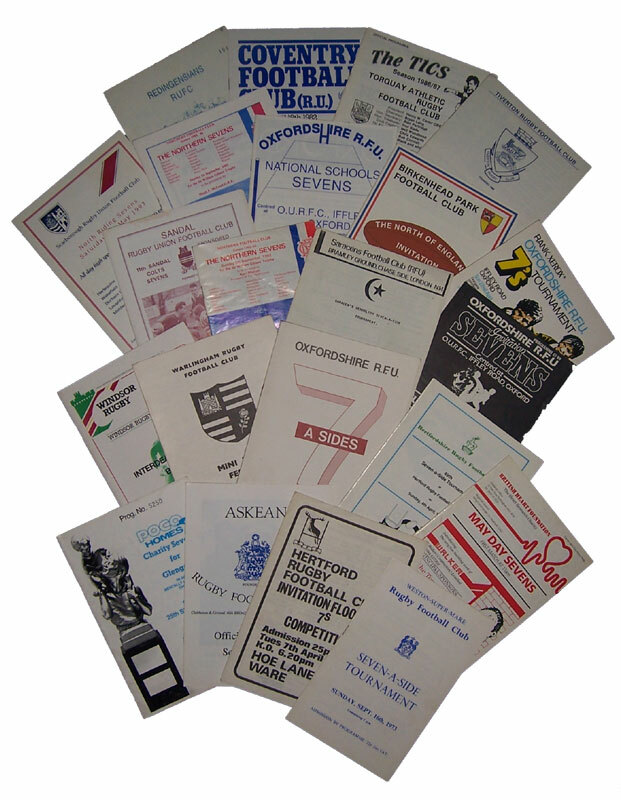 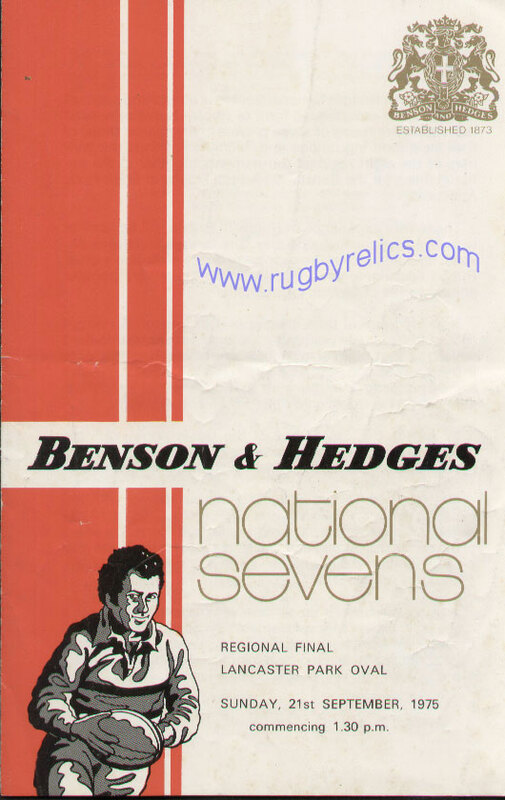 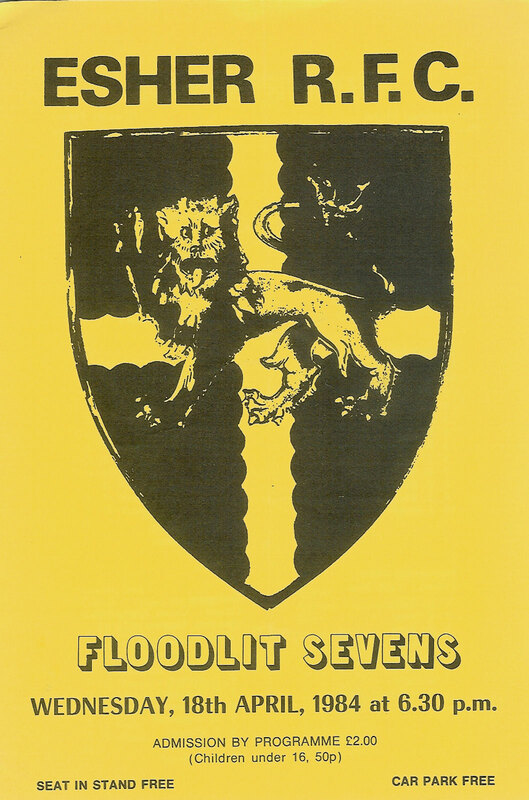 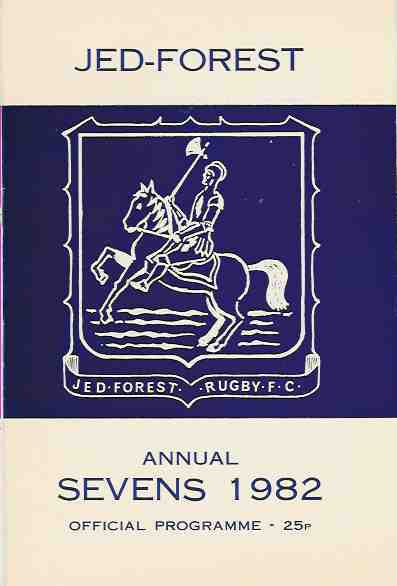 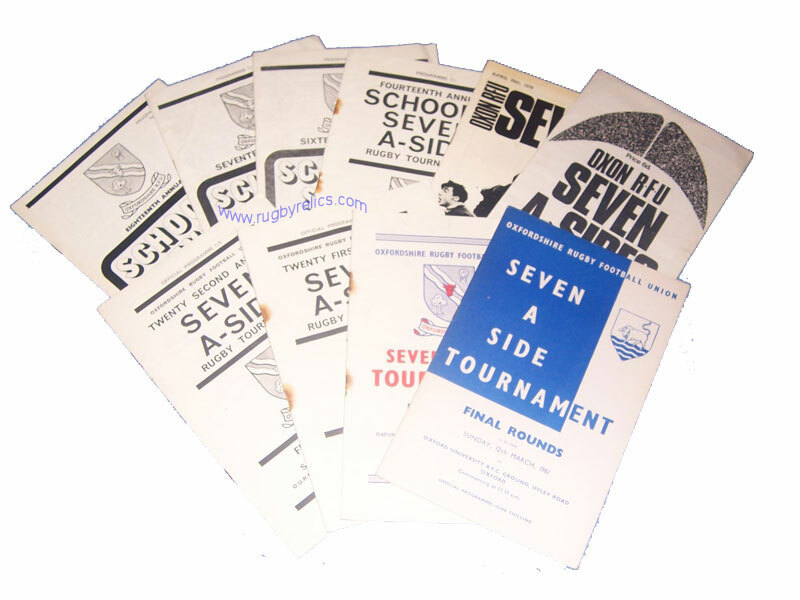 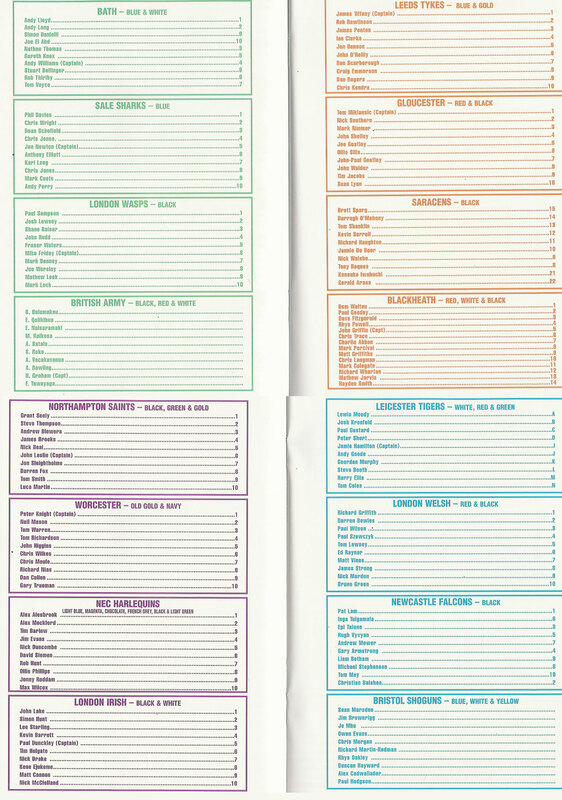 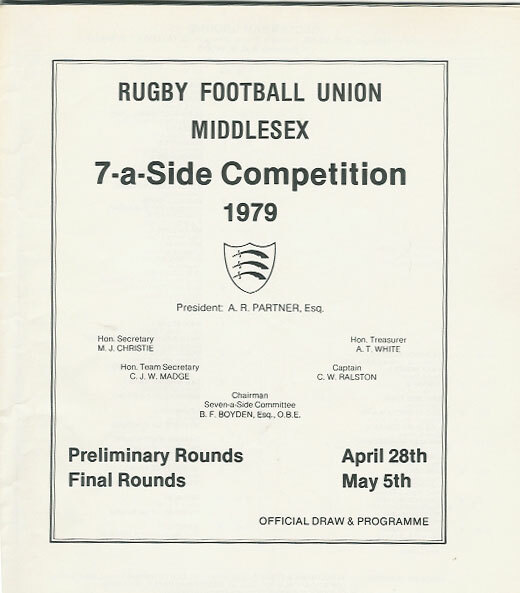 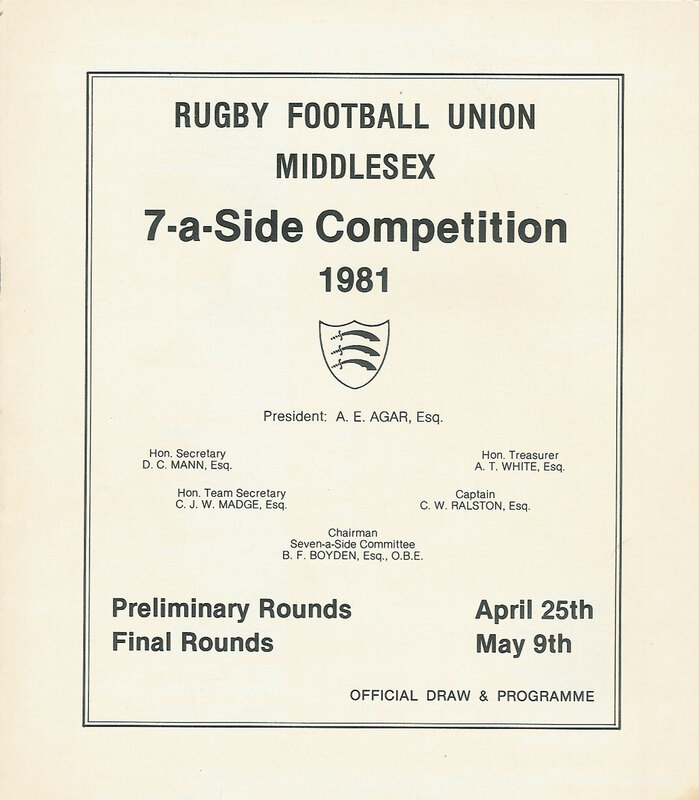 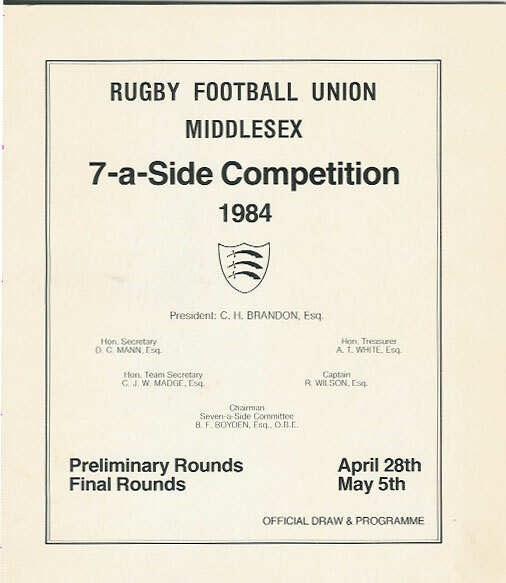 A bundle of 22 programmes for sevens and other tournaments held in England 1973 - 1993, these include Hertford Floodlit 7s, Oxfordshire 7s, Sandal Colts 7s, BHF May Day 7s, Weston Super Mare, Askeans, Glengarth, Berkshire, Saracens Schoolboy 7s, Northern, Scarborough, Birkenhead Park north of England Schools, Torquay, Coventry & Redingensians Colts 7s.